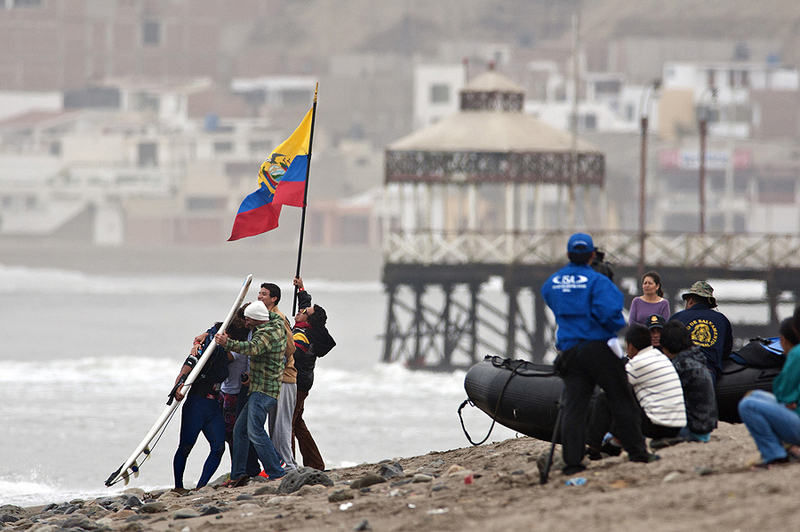 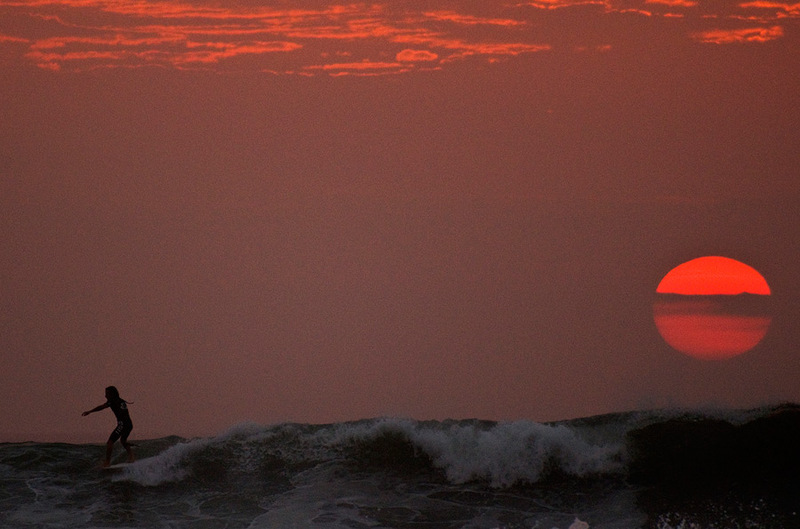 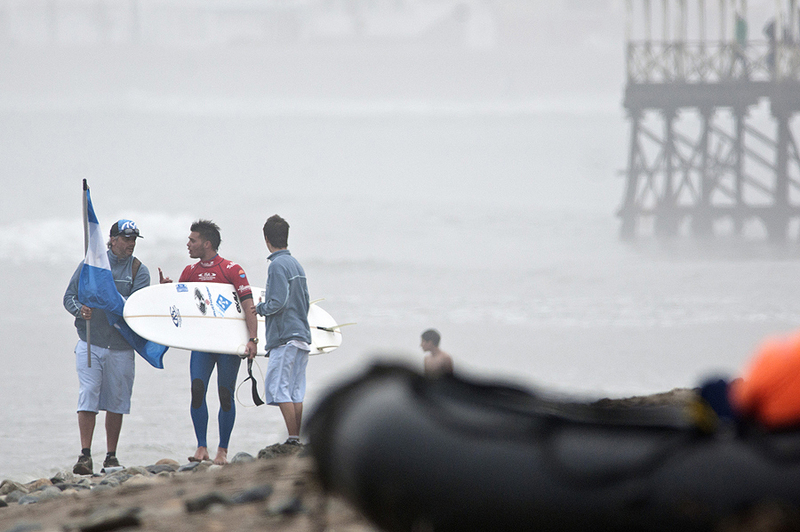 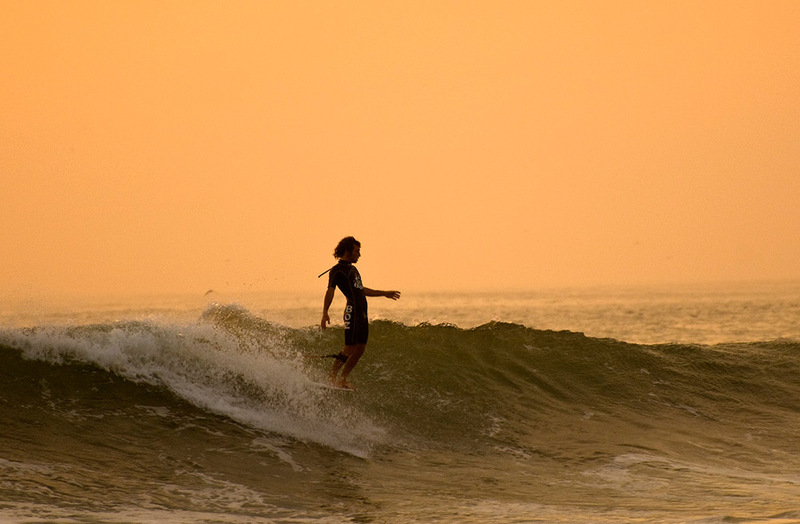 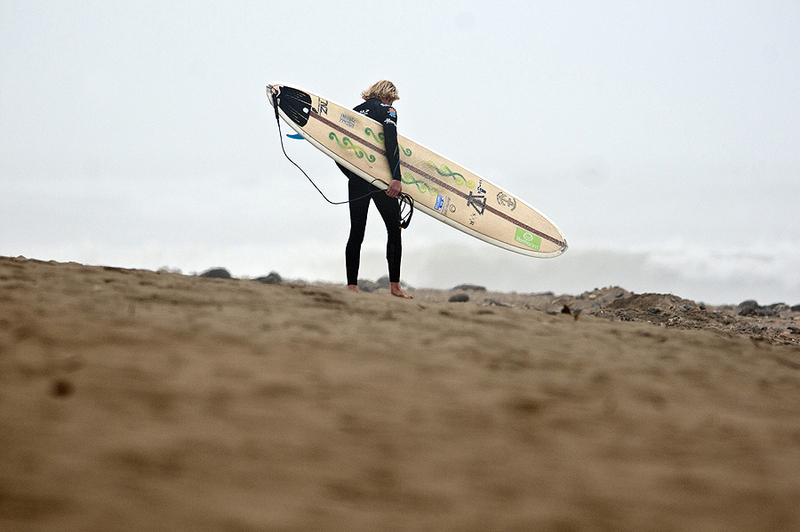 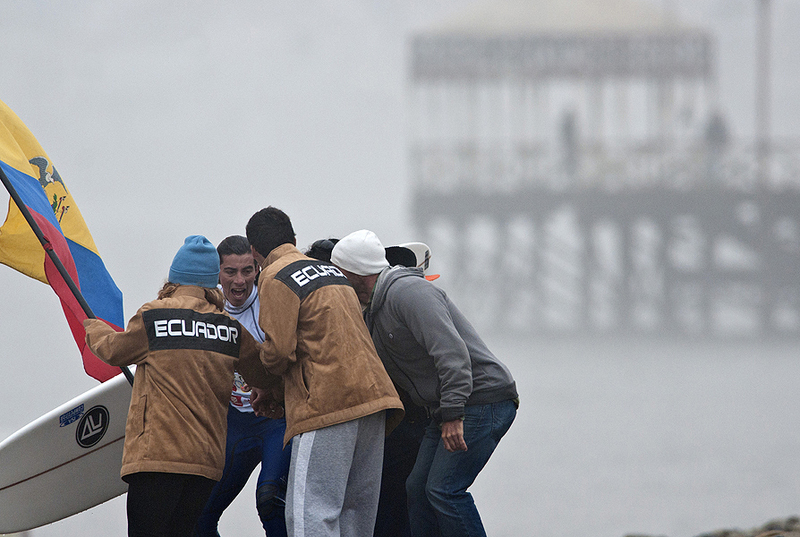 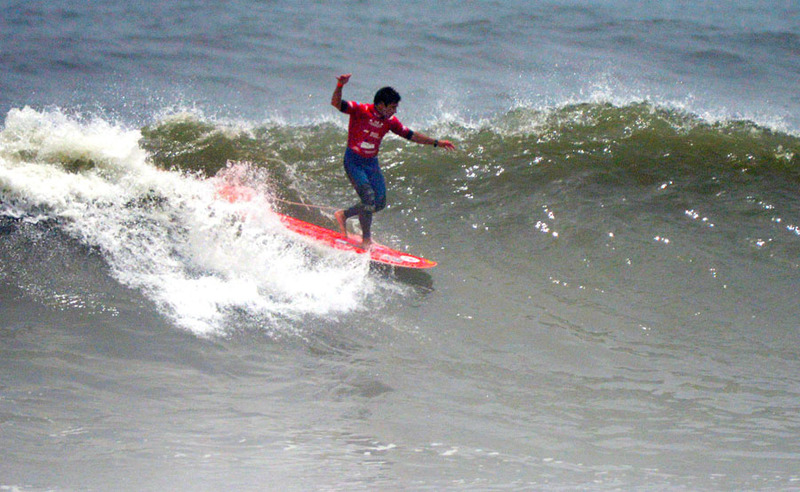 Following an amazing week of great waves and exciting surfing performances, the 2013 ISA World Longboard Championship, in historic Huanchaco, Peru, is officially over. 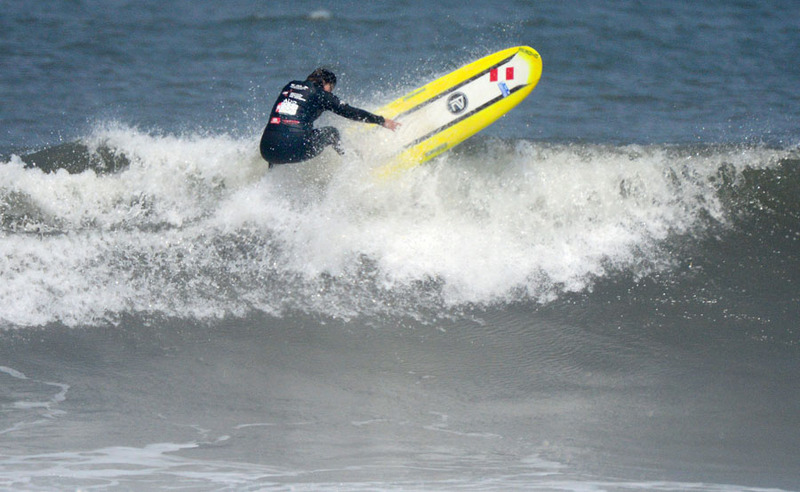 France will go down in the history books as the Gold Medal Team in the first stand-alone ISA World Longboard Championship. 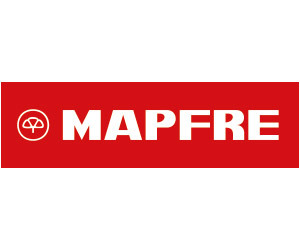 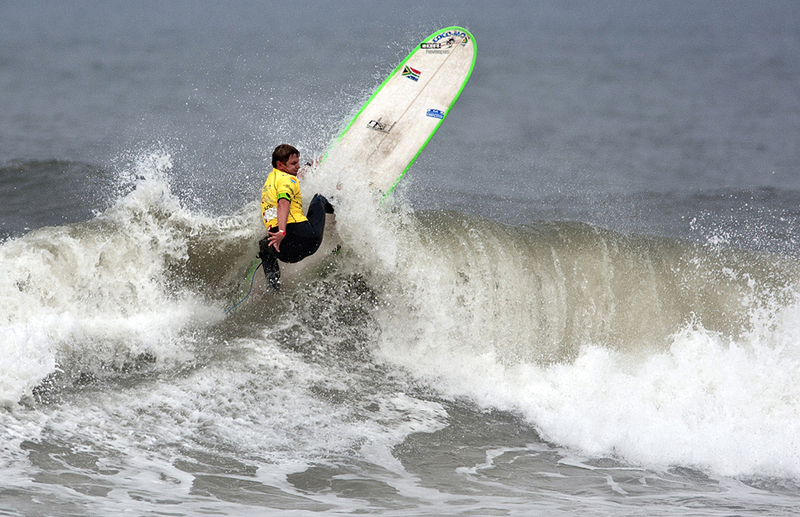 In the individual divisions, France’s Antoine Delpero won the Open Men’s, South Africa’s Simone Robb won the Open Women’s, and Hawaii’s Honolua Blomfield won the Junior’s Under-18. 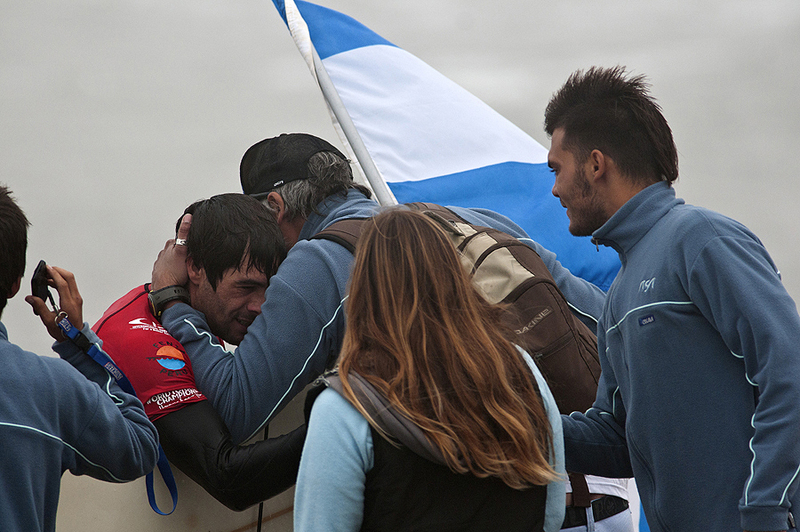 Team France won the ISA Aloha Cup. 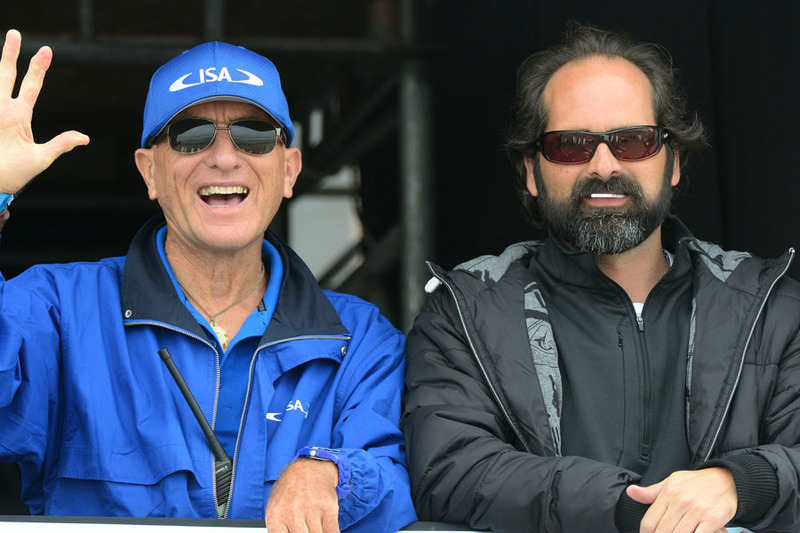 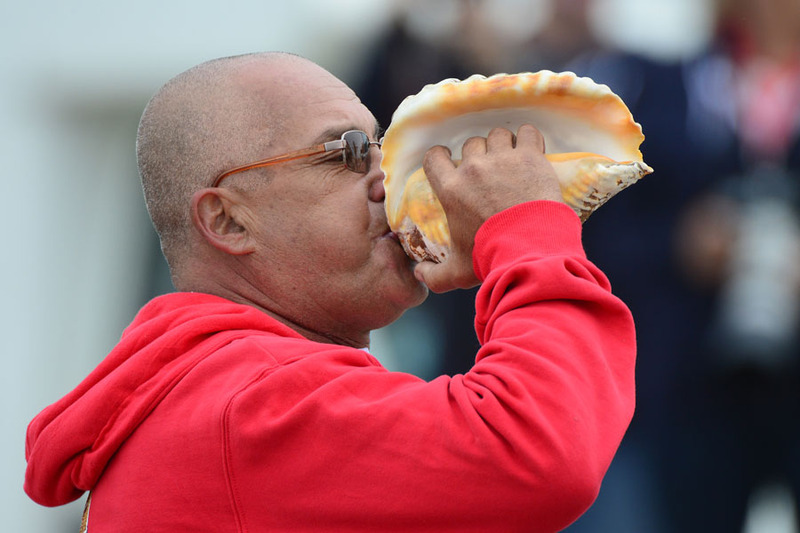 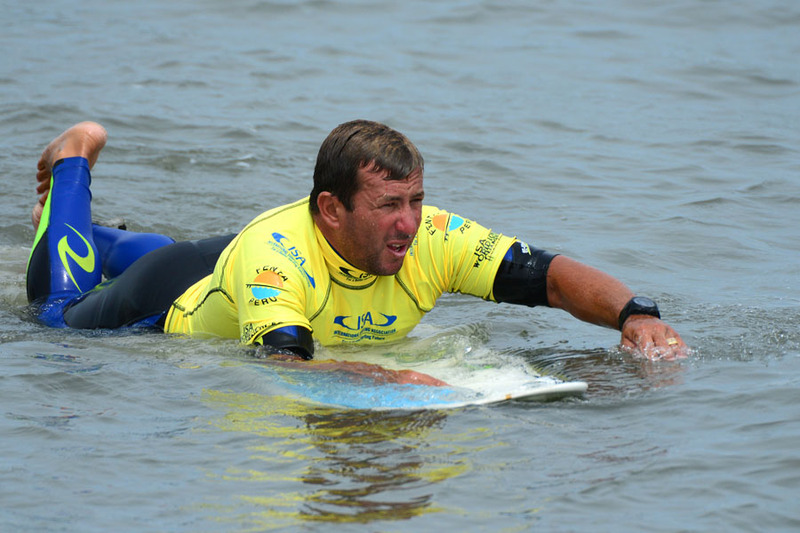 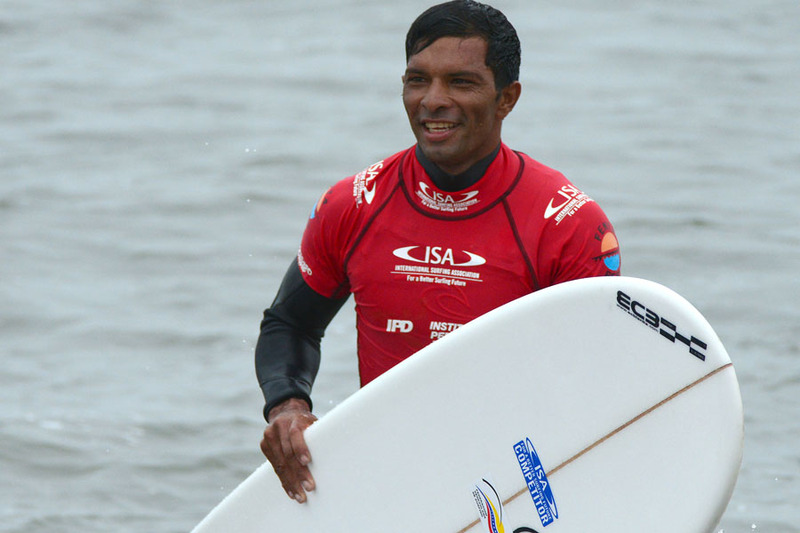 “It’s been an incredible World Championship with excellent waves every day of the event,” remarked ISA President Fernando Aguerre. 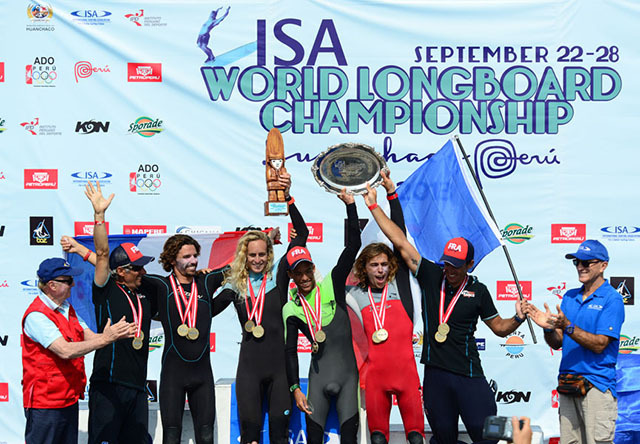 “This has been a historic World Championship as it is the first time an ISA World Longboard Championship takes place separate from the ISA World Surfing Games, and furthermore, the inauguration of the Women and Junior Longboard Divisions for the first time in ISA history. 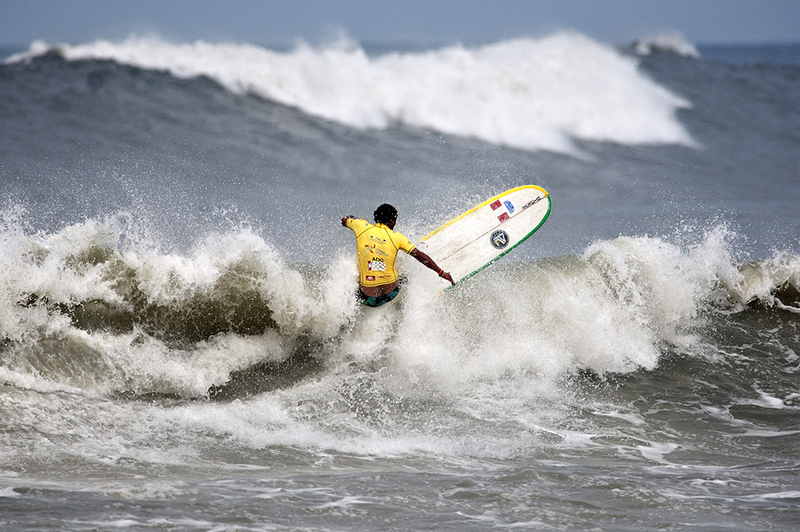 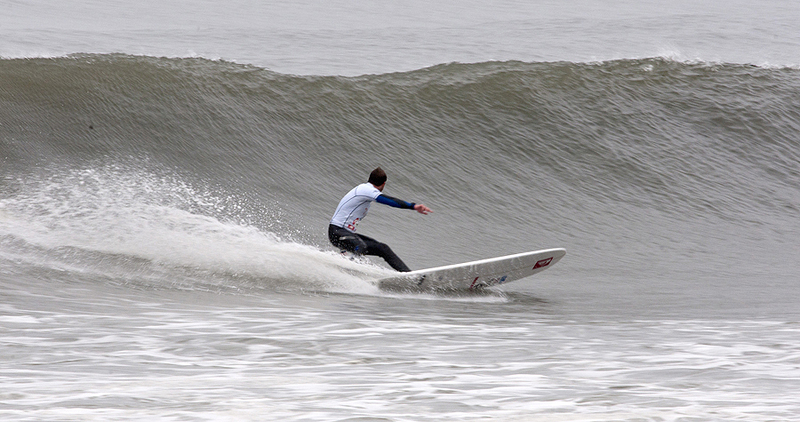 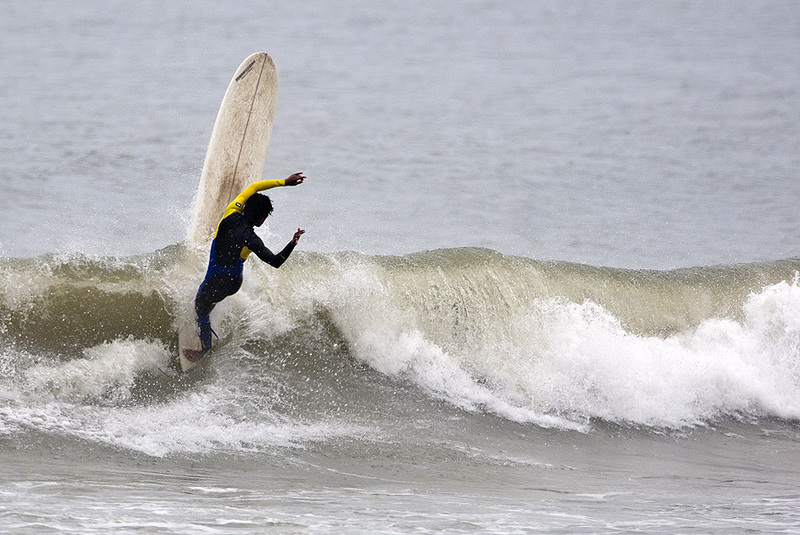 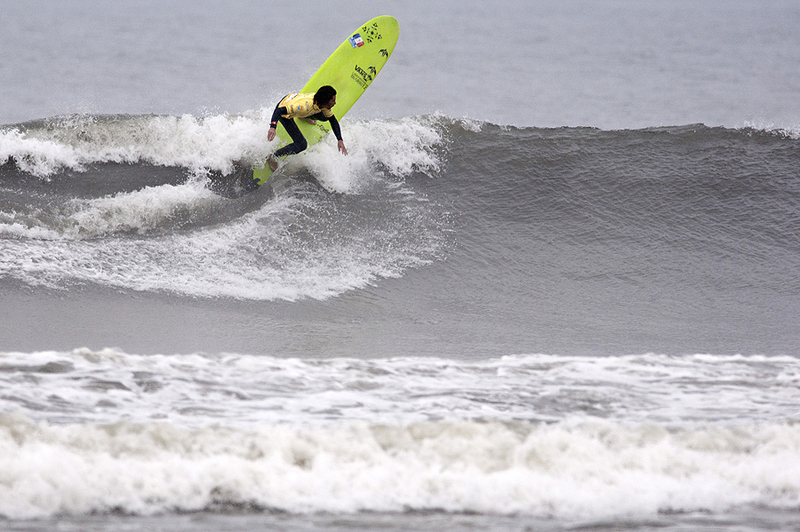 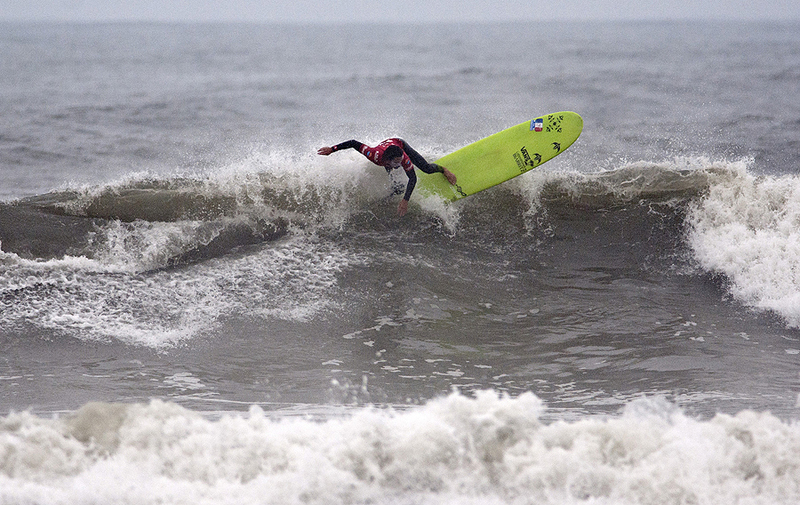 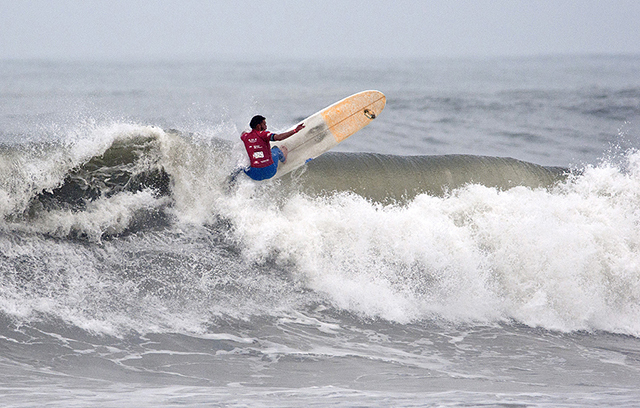 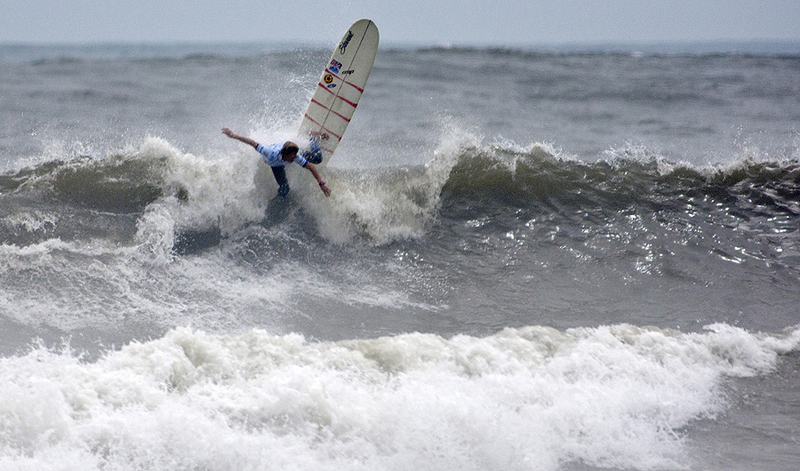 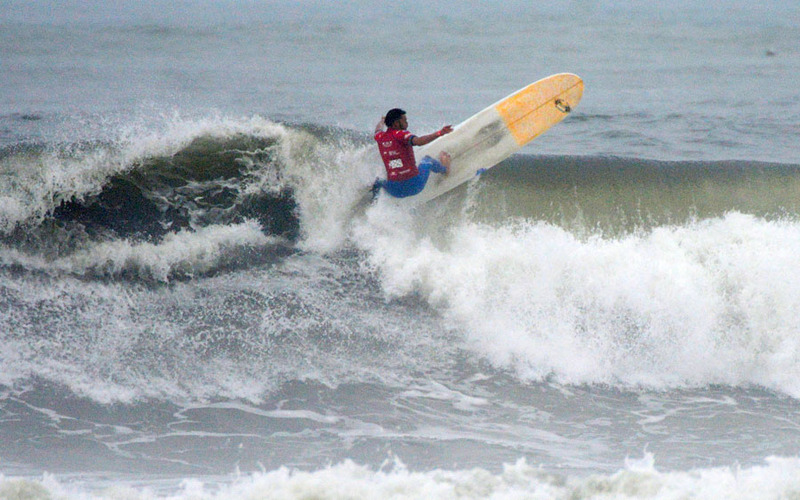 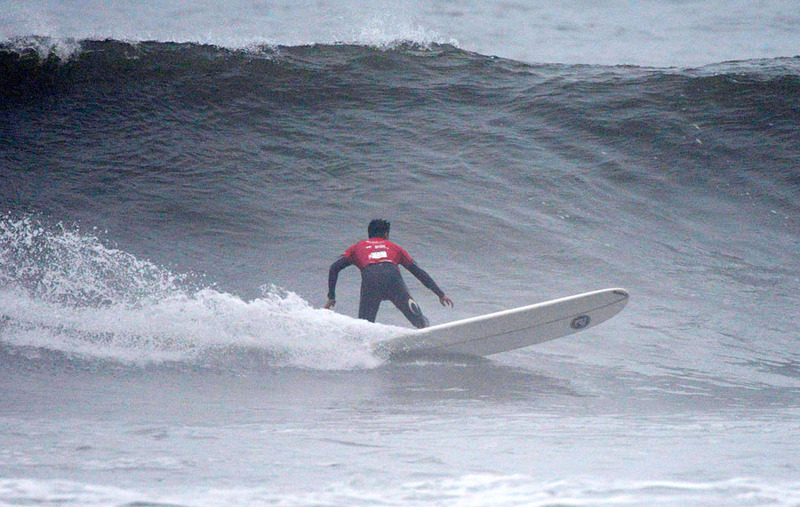 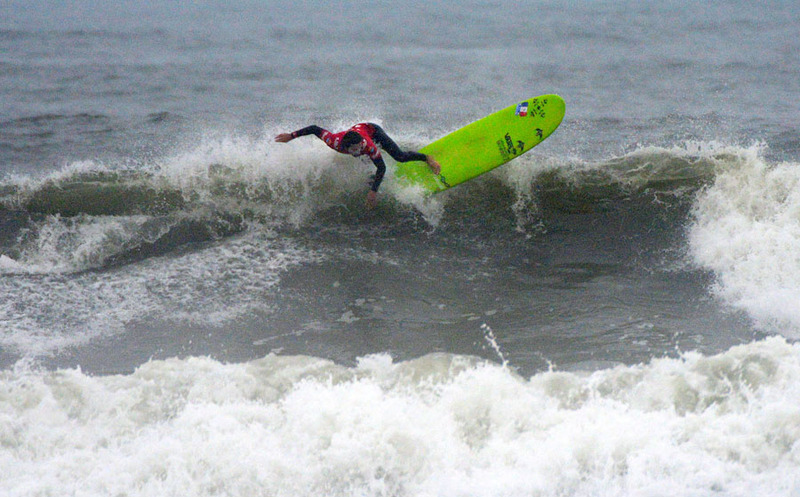 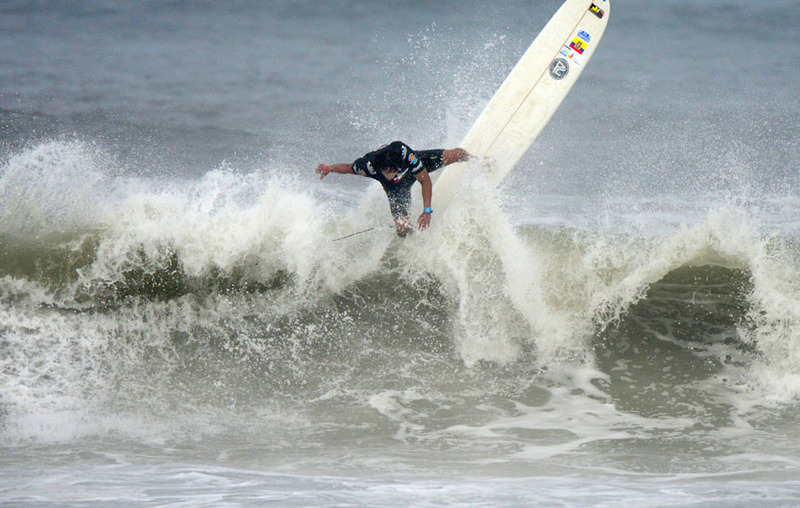 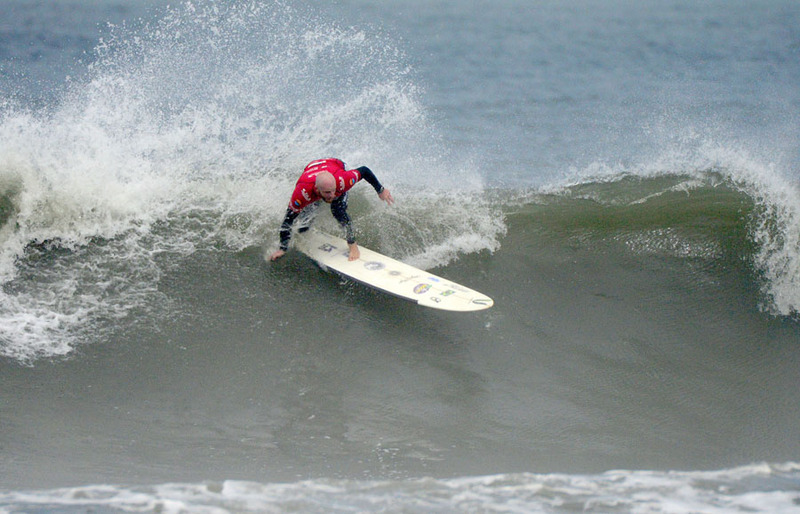 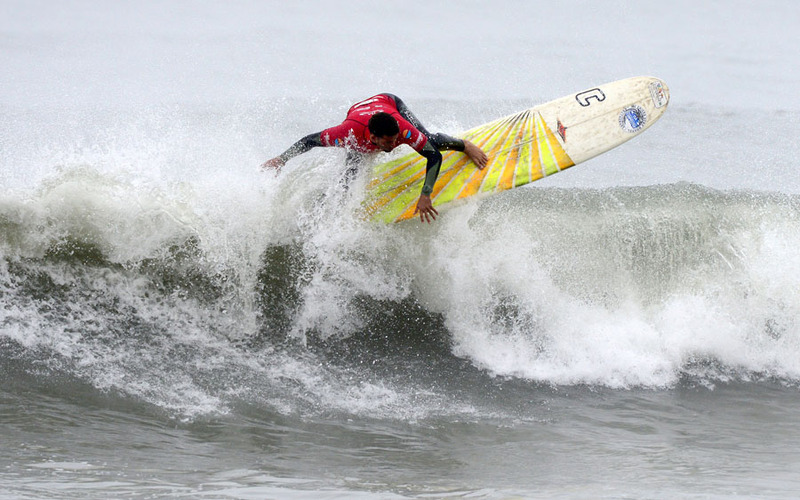 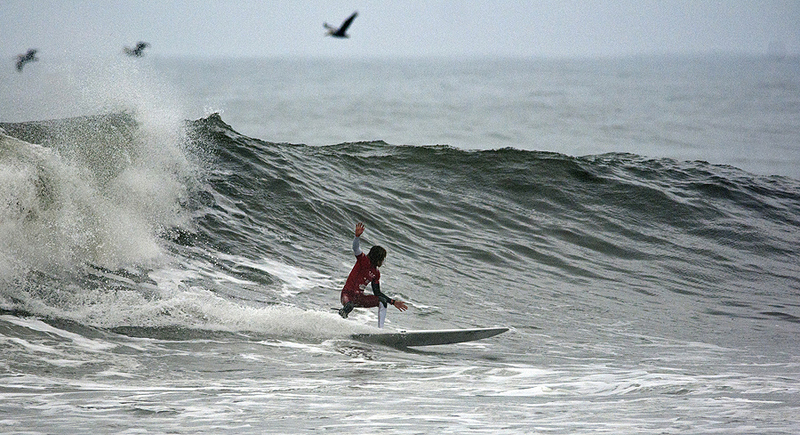 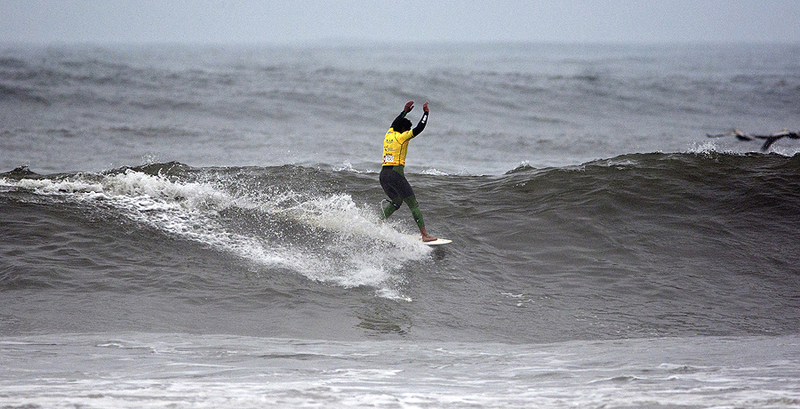 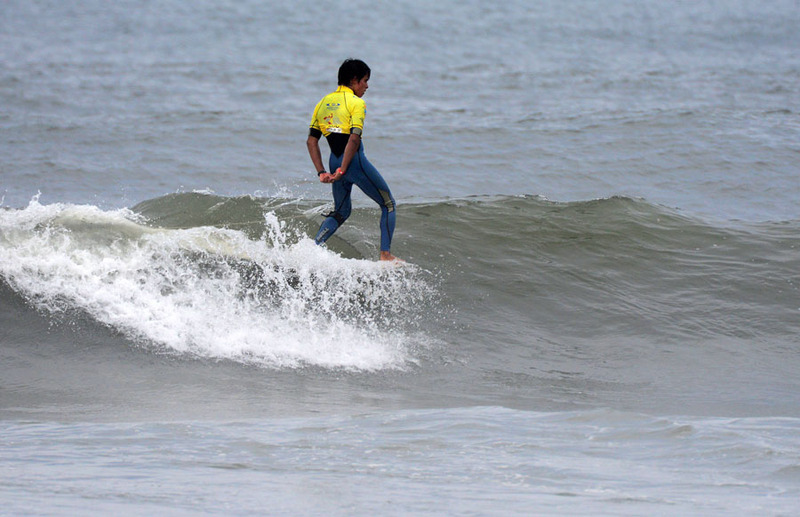 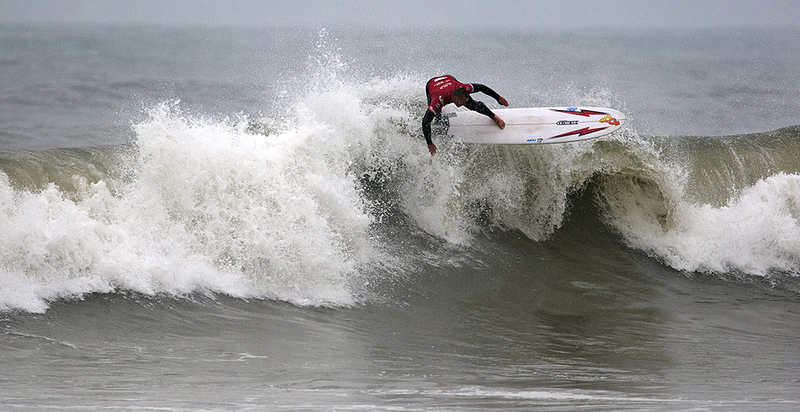 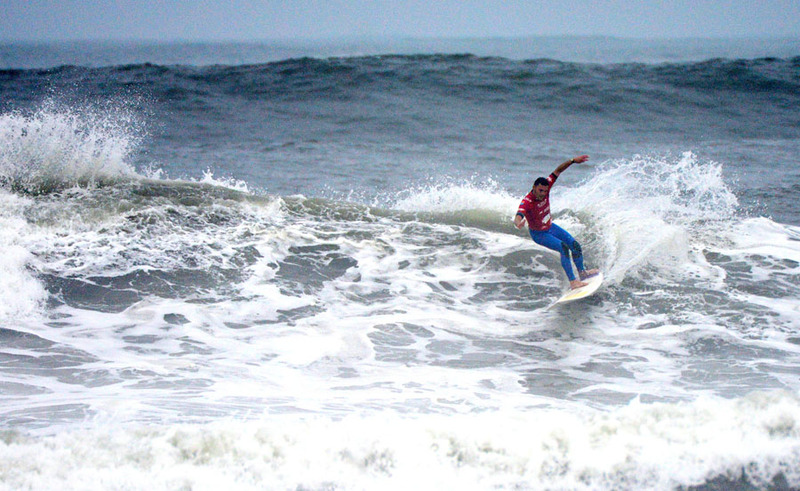 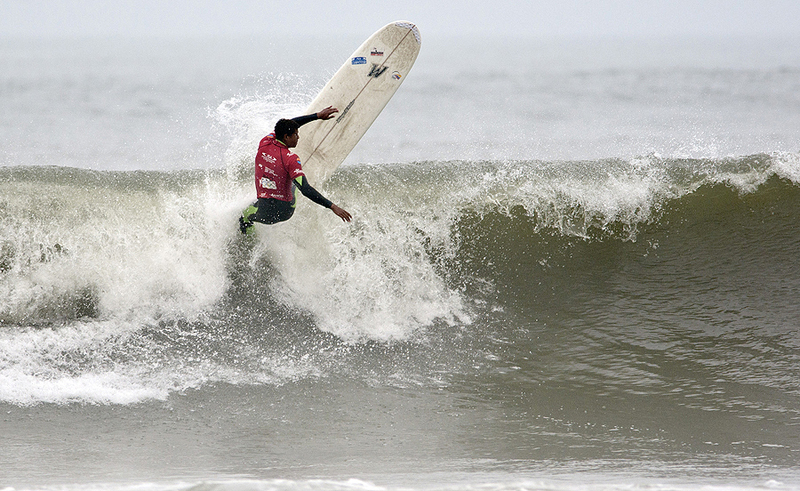 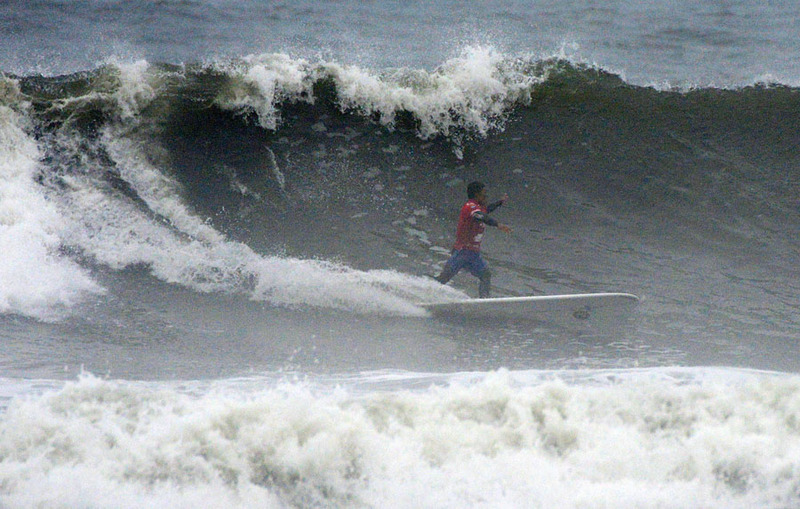 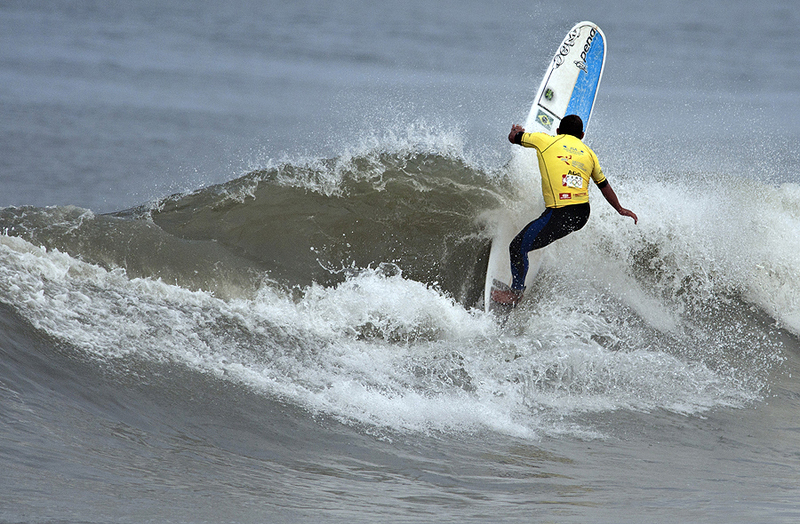 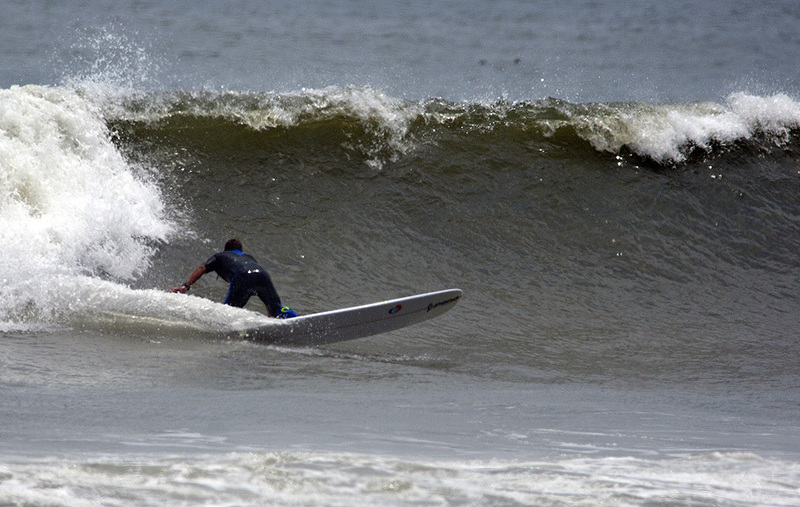 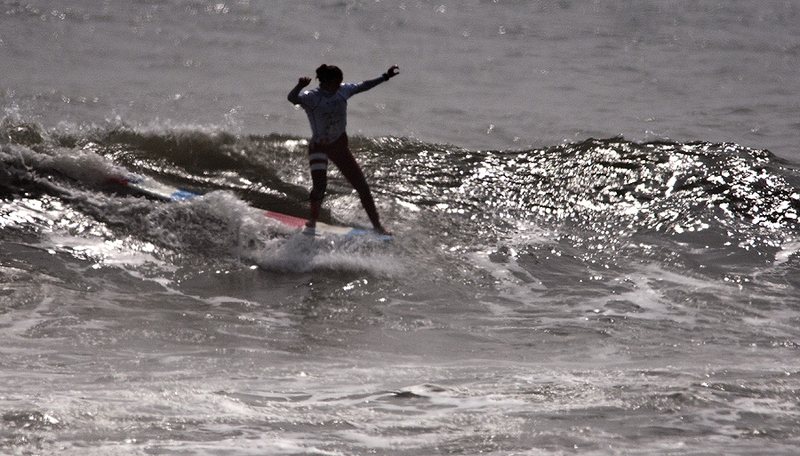 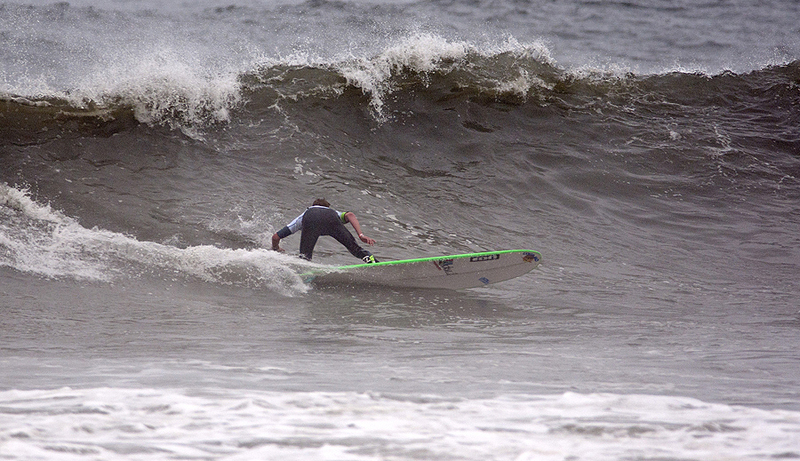 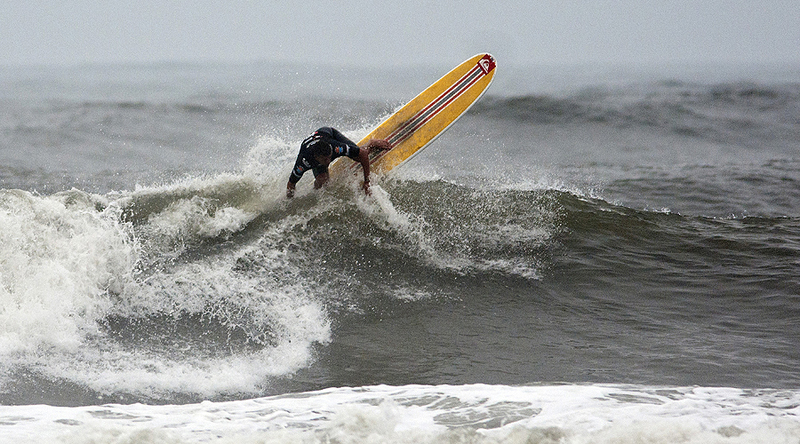 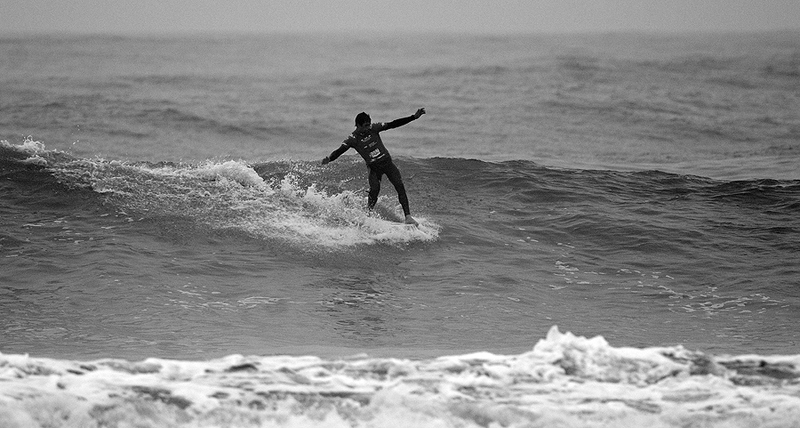 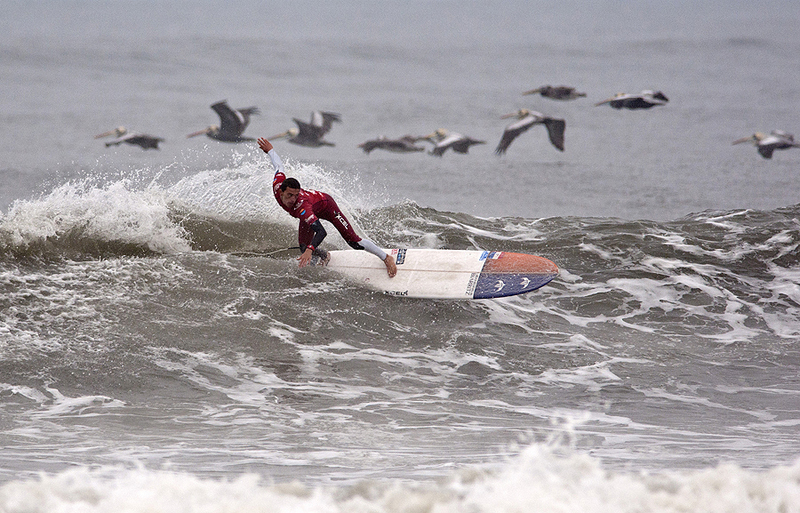 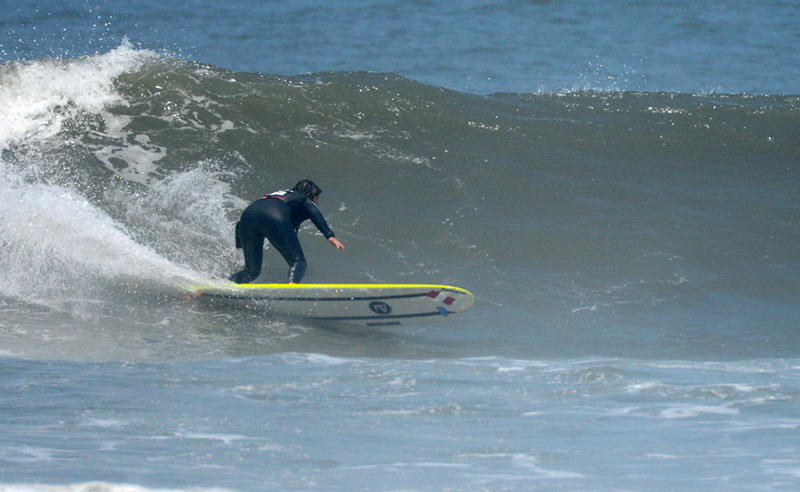 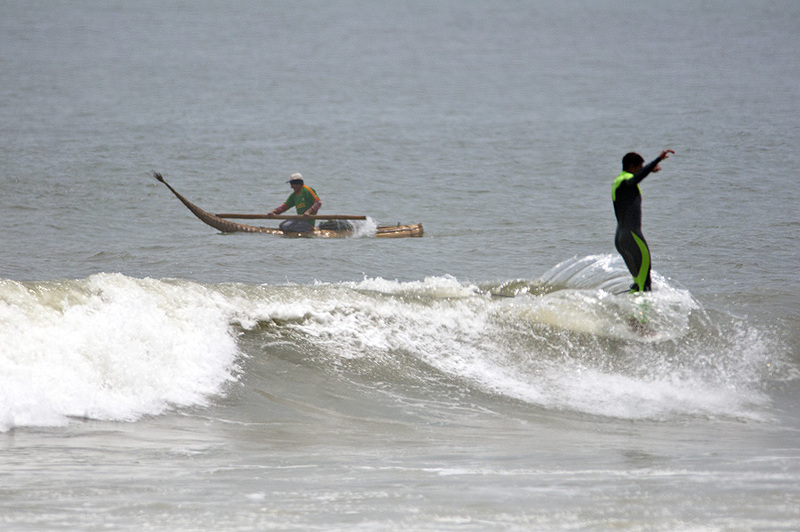 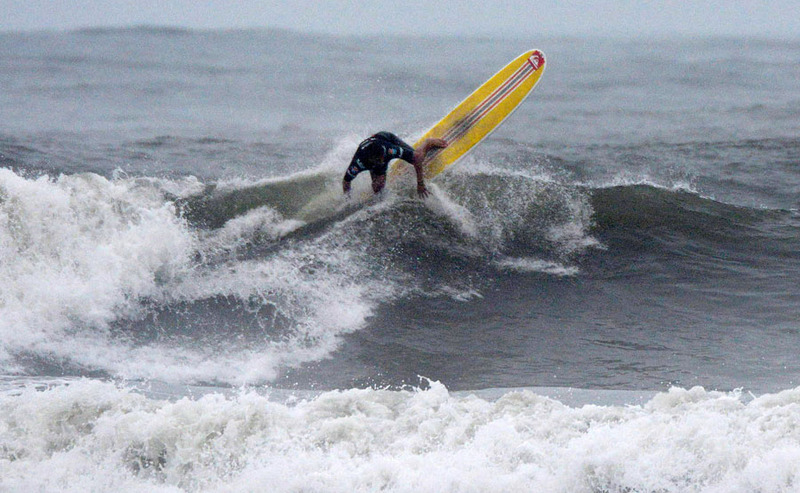 Huanchaco’s great surf during the Final Day of competition continued. 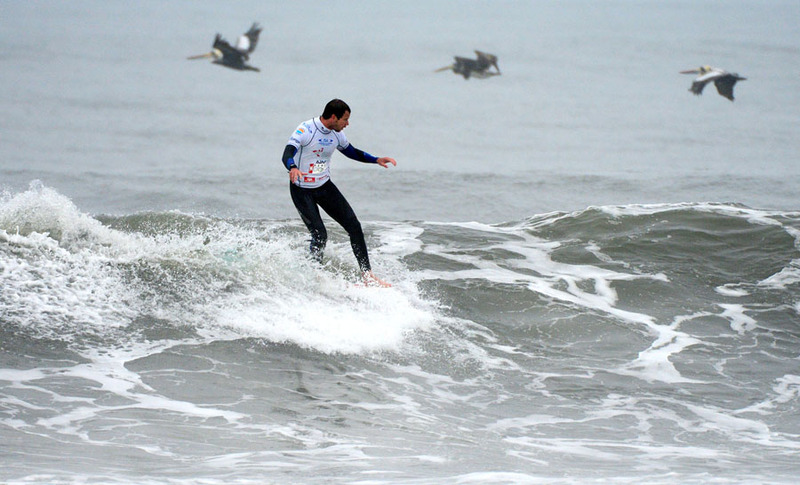 The waves were in the 3-5 feet range, bigger than previous days, with calm winds all day long, providing exceptionally long rides for the surfers to perform at their highest level. 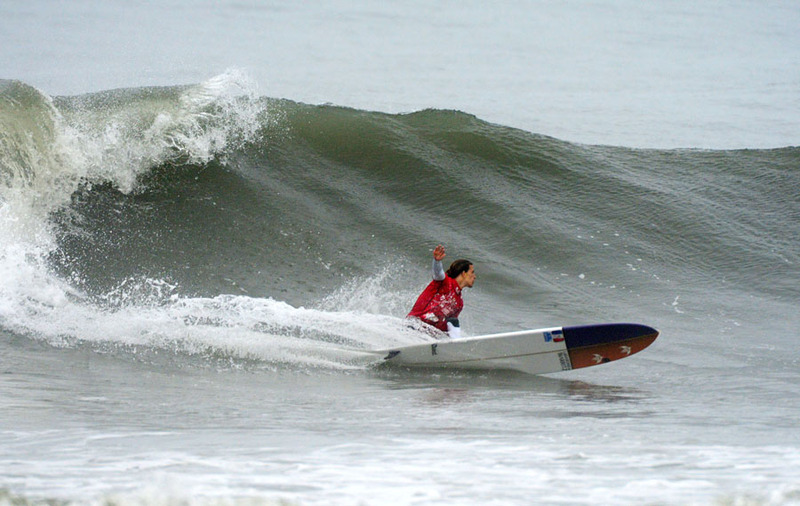 The first final in the water was the Junior’s Under-18, where Hawaii’s Honolua Blomfield won the Gold Medal earning 15.00. 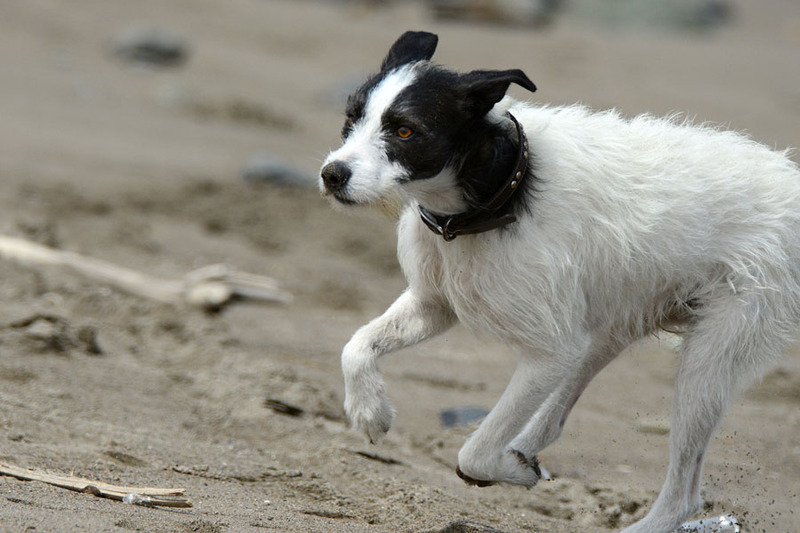 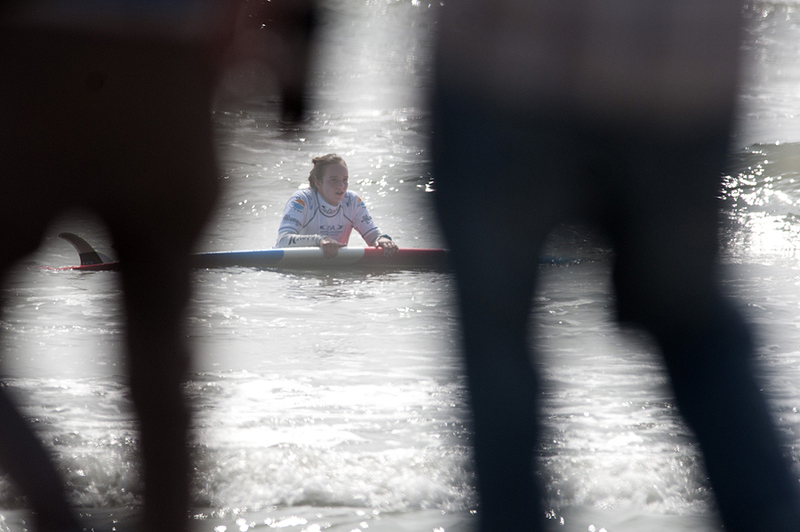 As one of only two girls entered in the Junior competition, Blomfield had a difficult task, but managed to dominate most of her heats throughout the event, including the final. 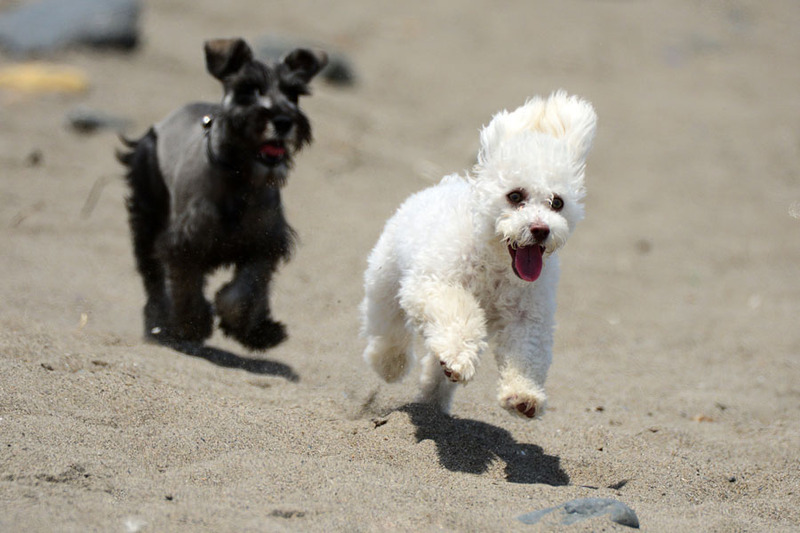 “I just feel on top of the world! 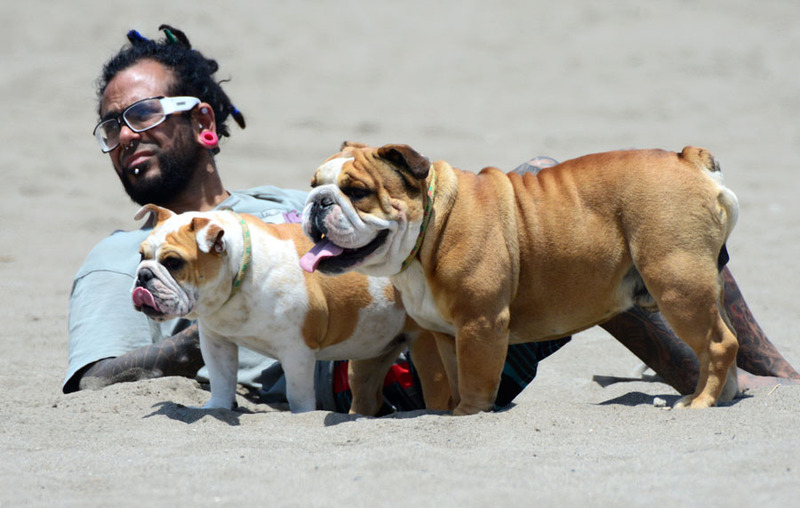 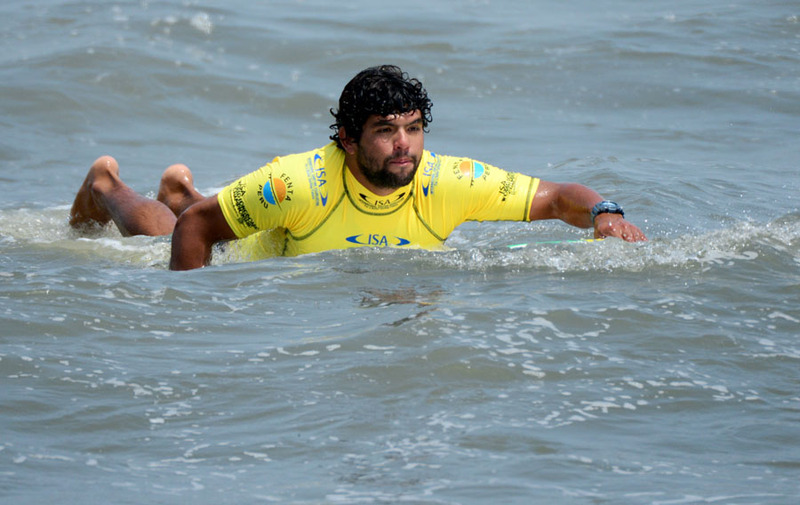 I can’t believe that I was able to make it this far,” said the elated Hawaiian. 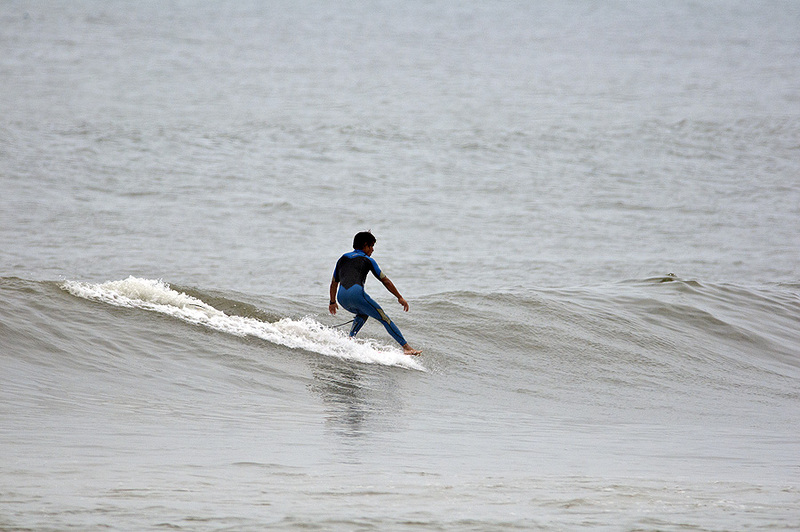 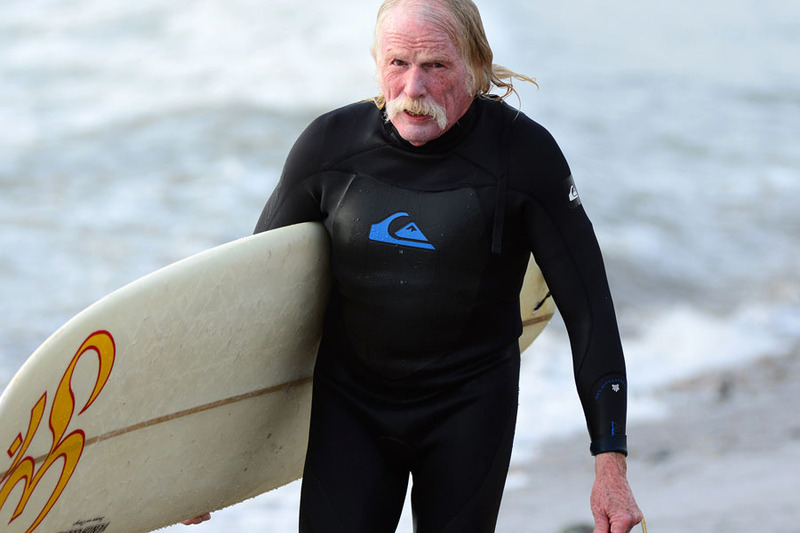 “On my first wave, a set wave, I just played safe and did a couple of turns and some nose riding and ended up getting a seven. 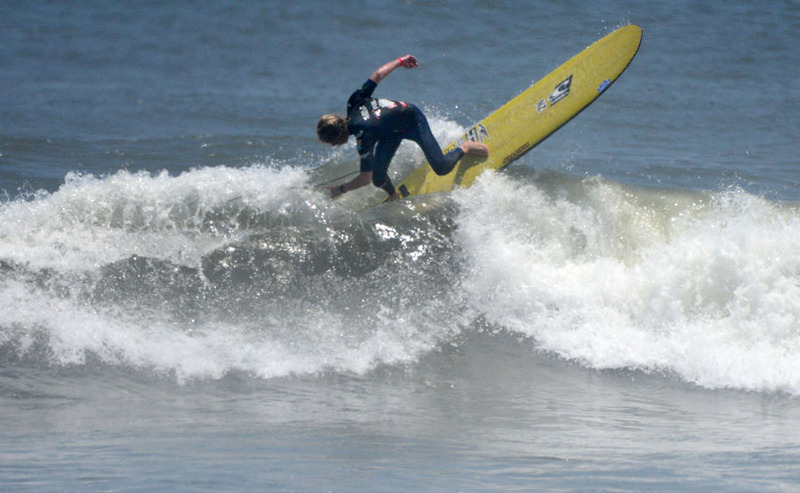 I was just amped throughout the whole heat. 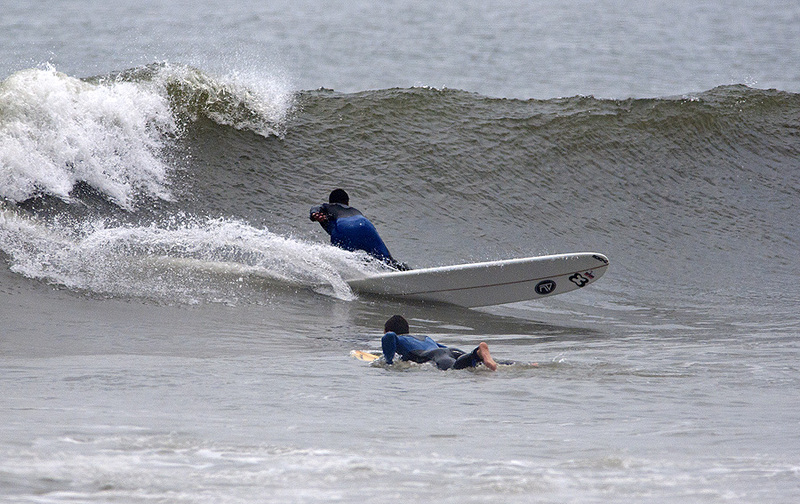 Then another really long wave came through, a little nugget that peeled all the way to the inside and I ended up getting another seven on that one.” These two rides added up to a winning performance. 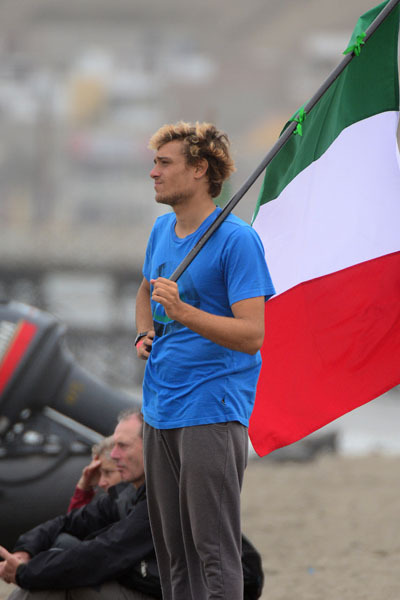 The Silver Medal went to France’s Martin Coret (13.24), the Bronze to Brazil’s Caio Santana (10.56) and the Copper to South Africa’s Ethan Pentz (7.27). 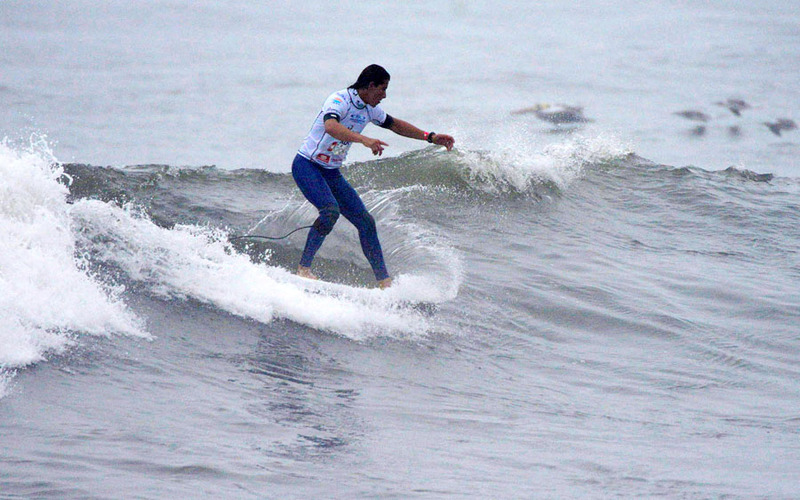 Up next was the Open Women’s Final. 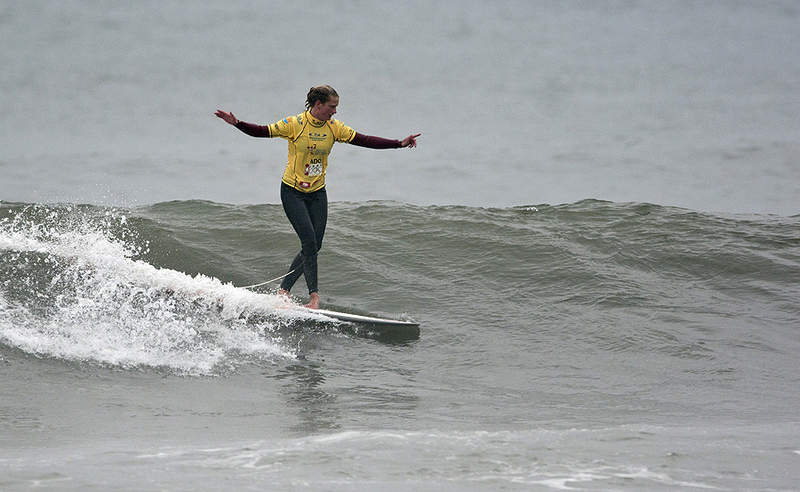 South Africa’s Simone Robb won the Gold Medal, earning 11.50, defeating Silver Medalist Rachael Tilly (10.43) from USA, Bronze Medalist Justine Dupont (9.83) from France, and the Copper Medalist Megan Godinez (7.27) from Hawaii. 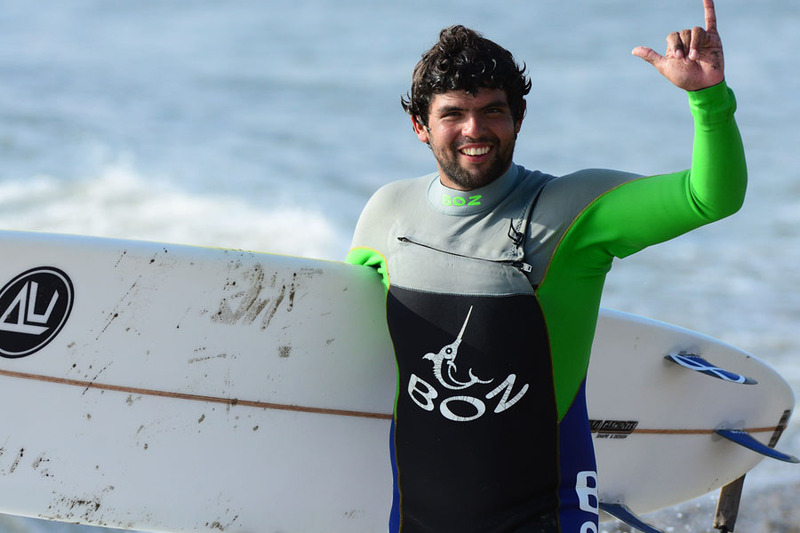 In the Open Men’s Final, France’s Antoine Delpero won the Gold after posting two big scores of 9.00 and 8.20, an impressive total heat score of 17.20. 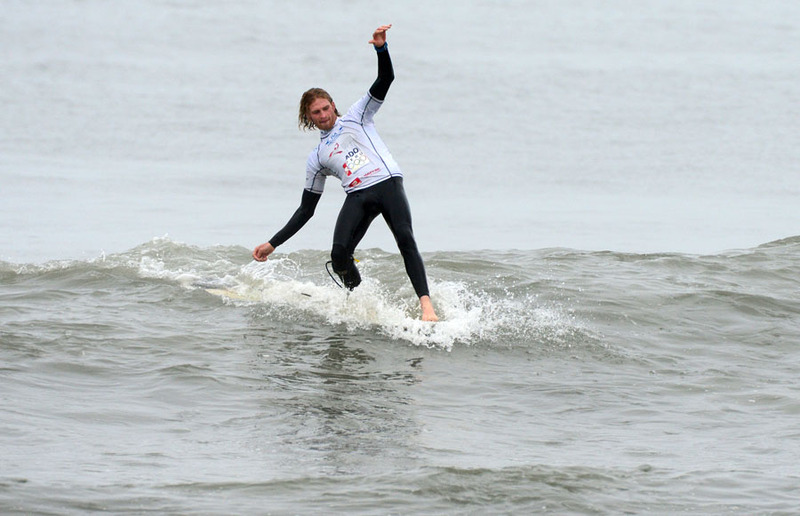 Great Britain’s Ben Skinner had been in form all event, but felt just short in the Final, earning 15.60 and the Silver Medal. 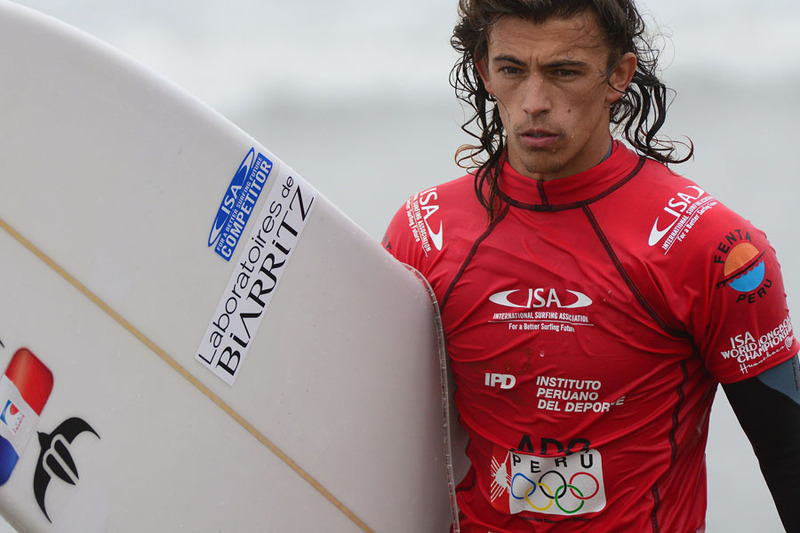 Brazil’s Phil Rajzman won the Bronze Medal, earning 12.03 and South Africa’s Thomas King the Copper Medal (11.97). 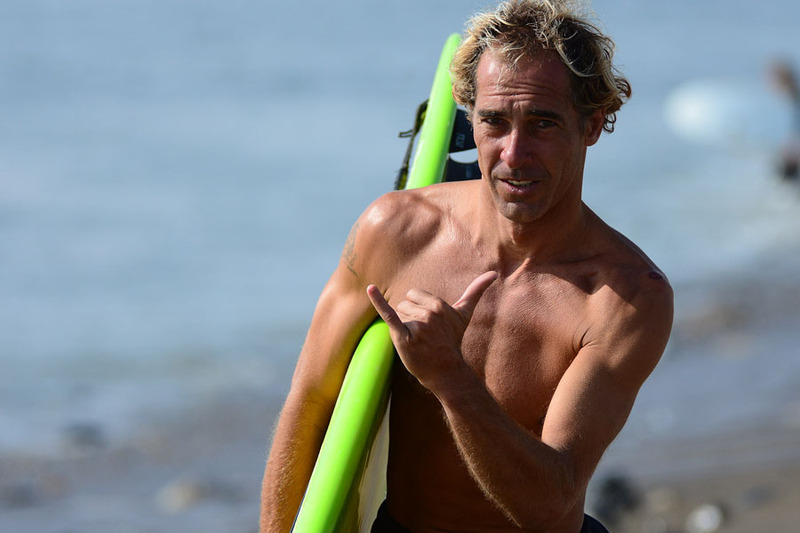 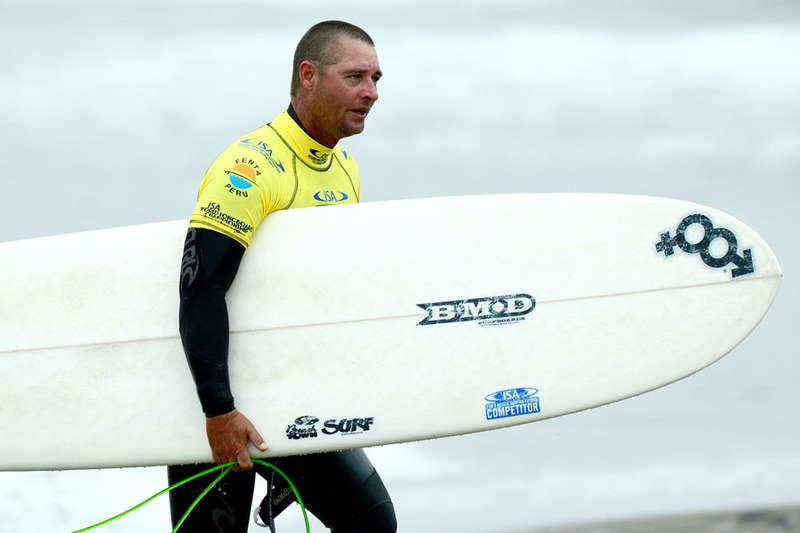 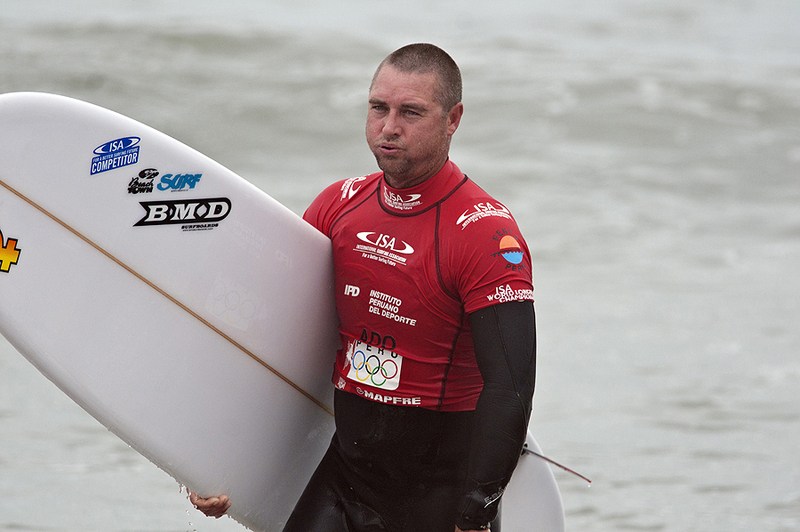 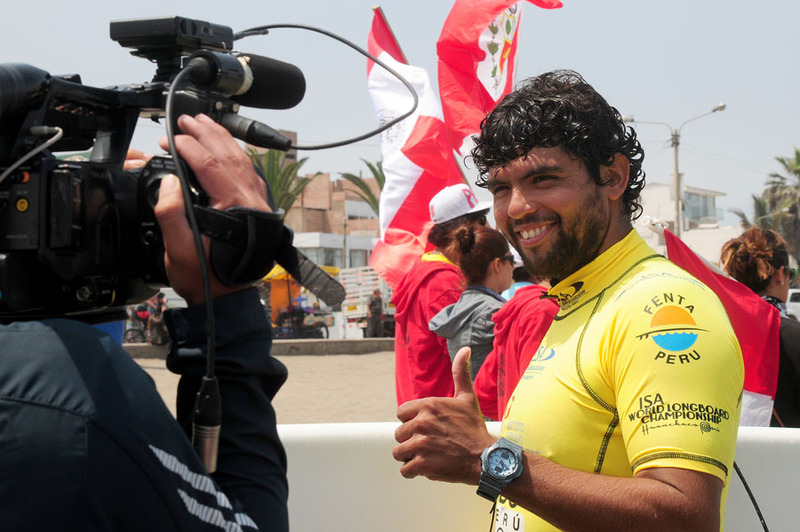 “It was a really hard and close Final, and everyone got good waves,” said Delpero as he waved his third ISA Gold Medal in his career having previously won Gold in the Longboard division of the ISA World Surfing Games in 2009 and SUP Surfing in the 2012 ISA World SUP and Paddleboard Championship. 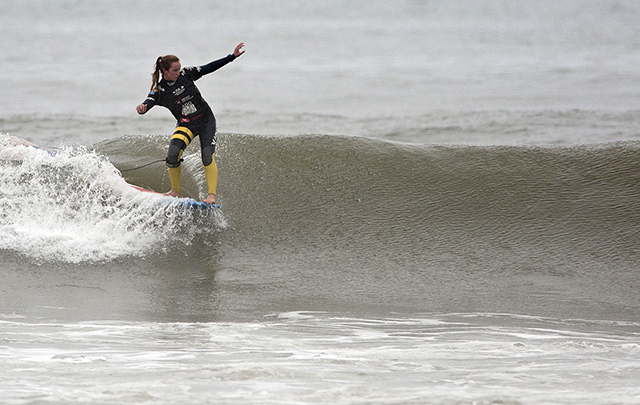 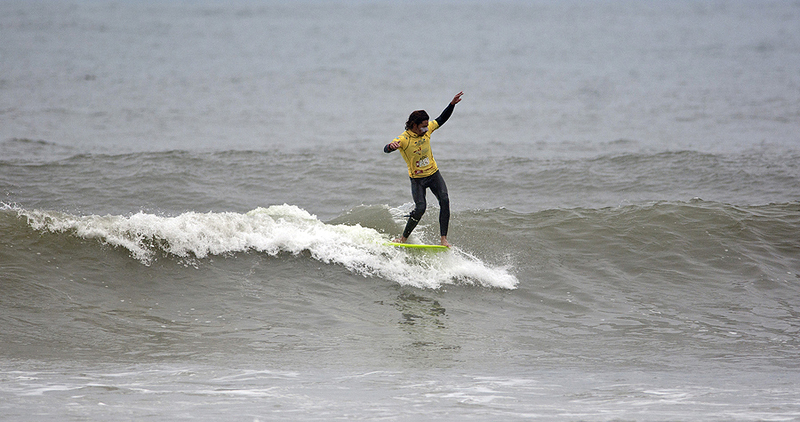 The last event in the 2013 ISA World Longboard Championship was the exciting ISA Aloha Cup, a tag-team competition. 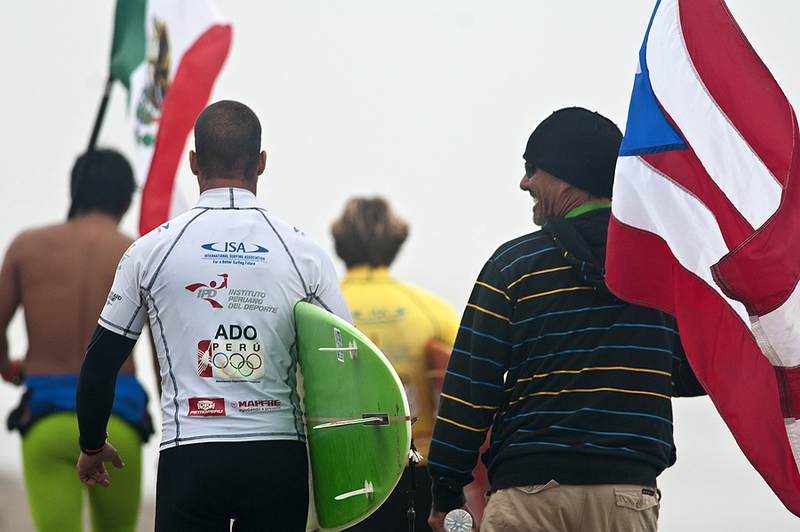 The Aloha Cup Final featured Australia, Brazil, France, and Peru. 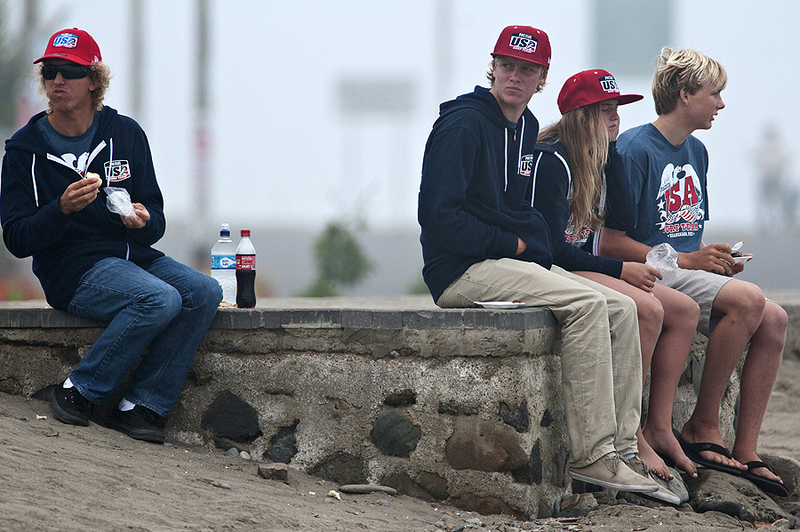 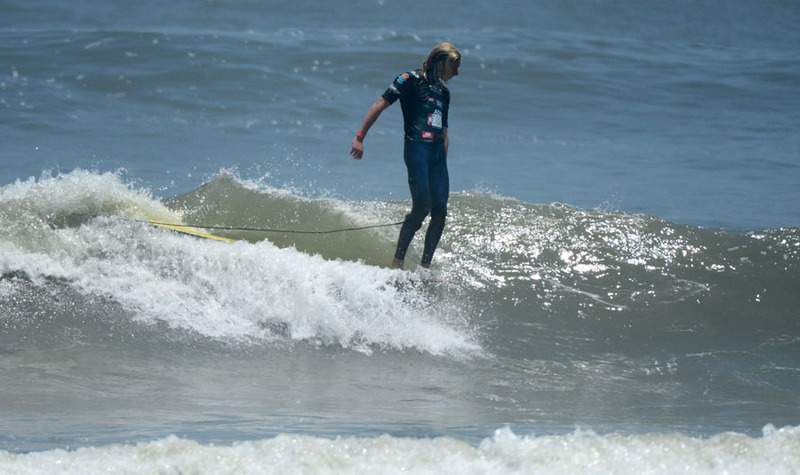 Team France featuring the Gold Medalist Delpero, his younger brother Edouard, Justine Dupont and Martin Coret won the Gold Medal exhibiting a smart strategy and displaying high-level surfing longboarding skills. 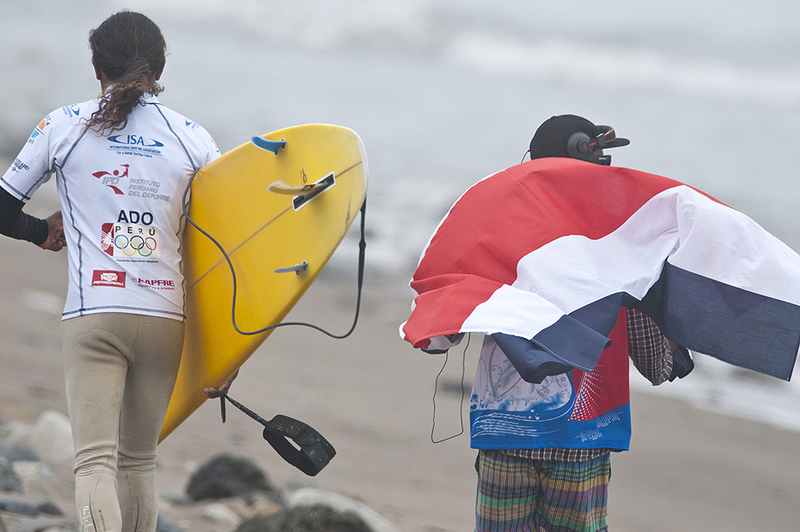 The French defeated Peru (Silver), Australia (Bronze) and Brazil (Copper), as the largest crowd of the event cheered them on. 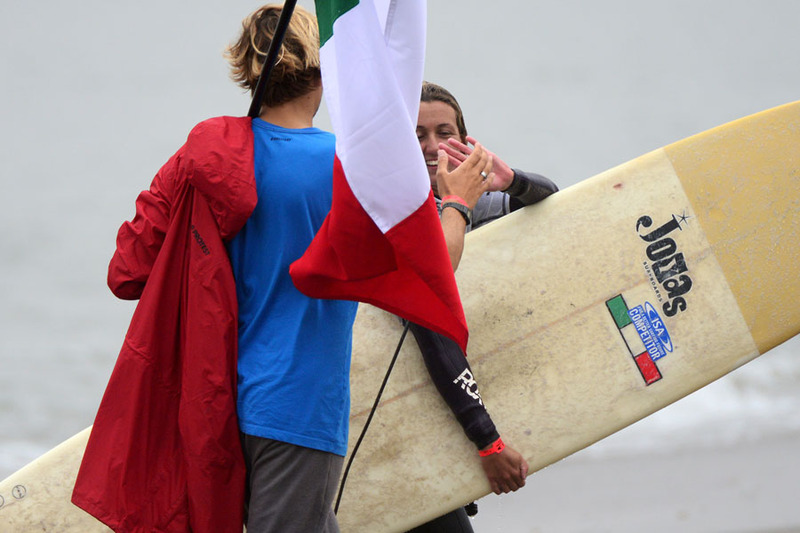 Following the competition, the Closing Ceremony took place to present all of the medals and trophies, and to bring an end to an incredible week in one of the most historic surfing communities in the world. 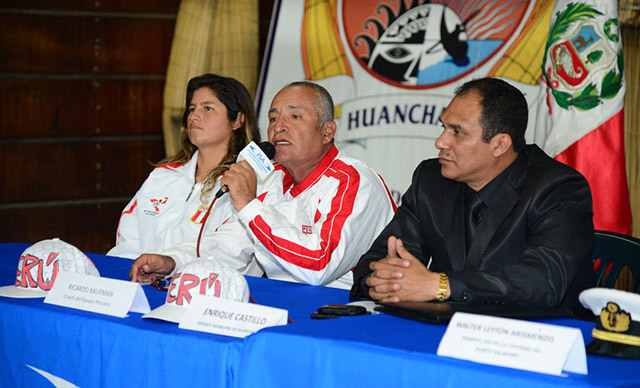 Closing Ceremony dignitaries included Benjamin Gayoso, the Peruvian Institute of Sport (IPD) President of La Libertad, Alfredo Gamero, representing the Huanchaco Kahunas Club, and ISA Vice Presidents Alan Atkins and Karin Sierralta. 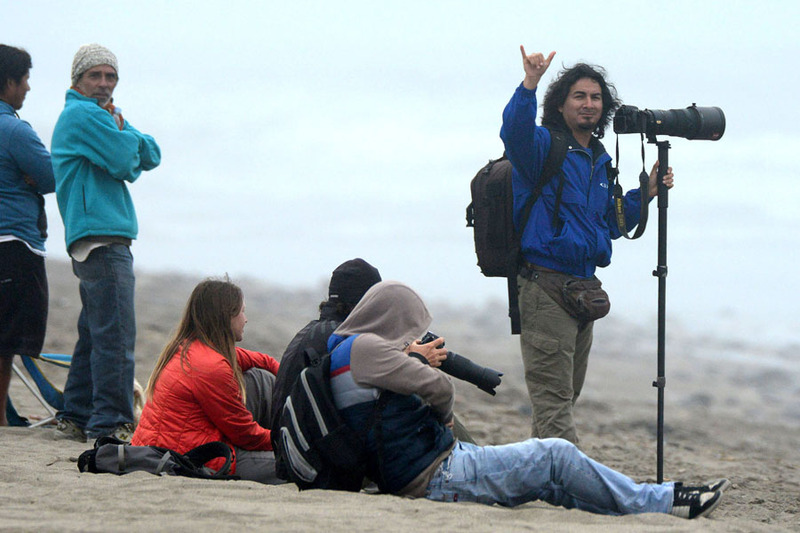 Sierralta was also the event organizer. 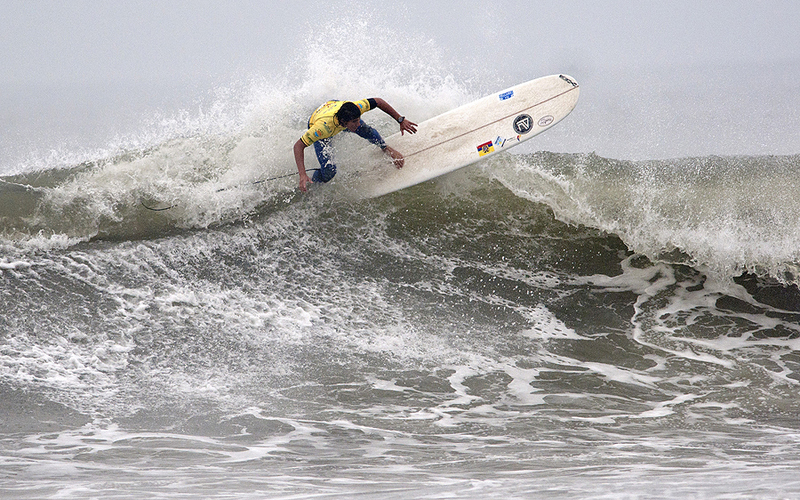 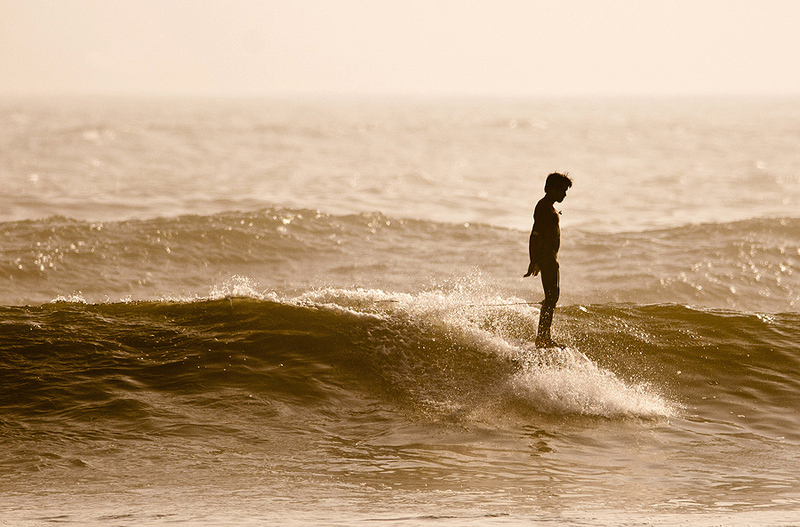 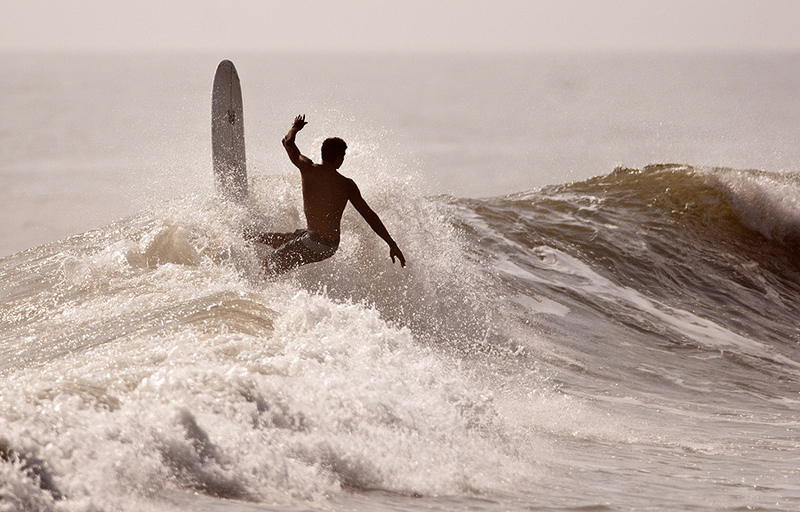 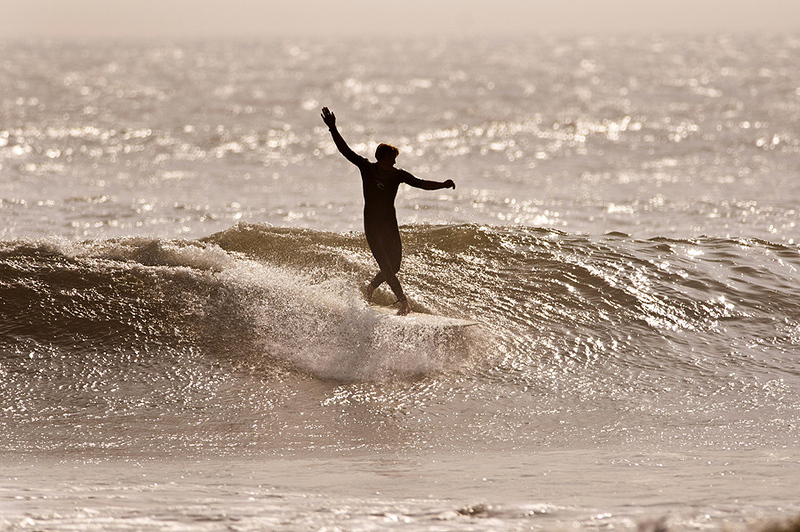 On October 26, 2013 the community of Huanchaco will be enshrined as the world’s fifth World Surfing Reserve, and the first World Surfing Reserve in Latin America. 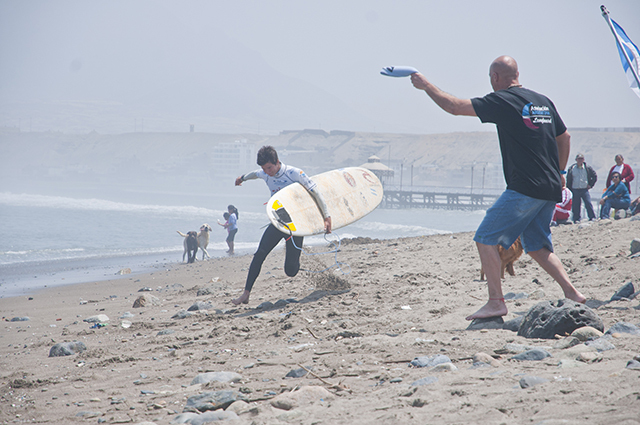 In addition to formally recognizing Huanchaco for it’s outstanding wave quality, unique environmental characteristics, surfing heritage, and community support – the cornerstone of the World Surfing Reserve program is it’s emphasis on locally-led coastal conservation efforts. 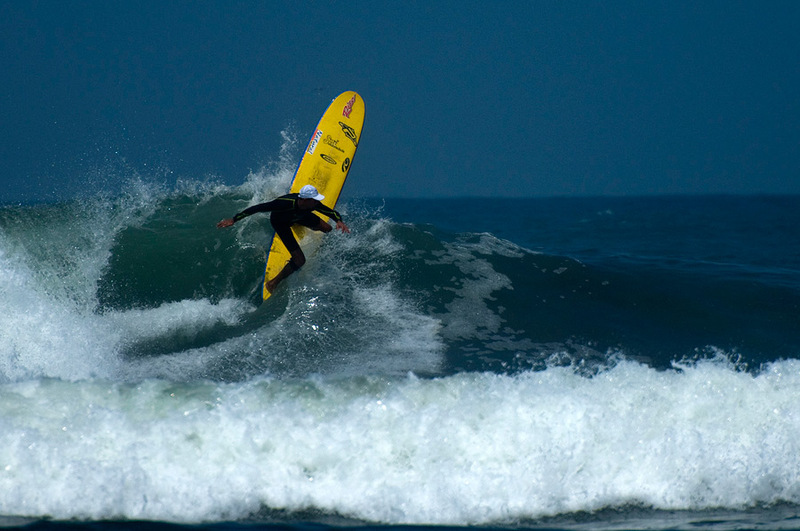 Save The Waves Coalition works alongside each new World Surfing Reserve to develop a Reserve Stewardship Plan; a strategic plan for identifying the local World Surfing Reserve goals, primary threats to those goals, the root causes of those threats, and concrete steps for mitigating those threats. 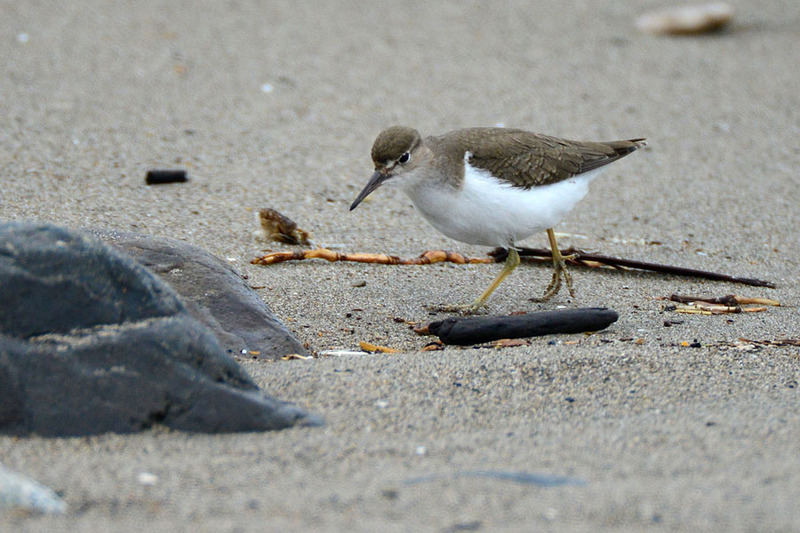 The Reserve Stewardship Plan is co-developed by the Local Stewardship Council, which oversees the Reserve management. 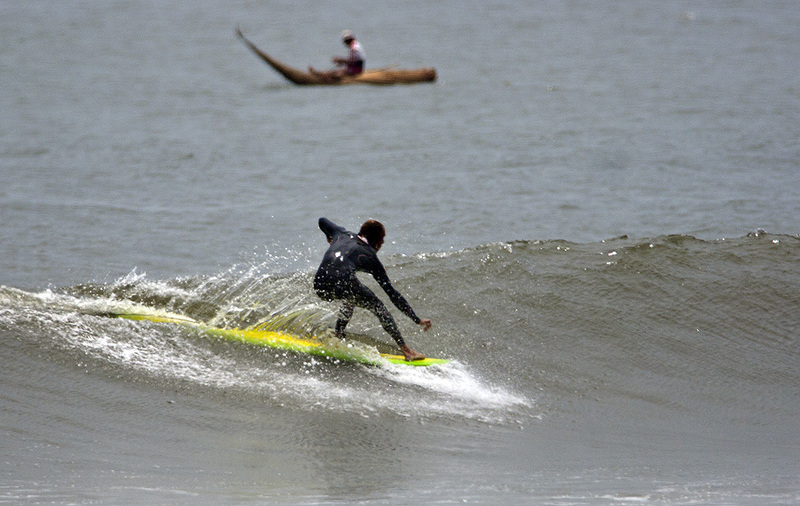 This group is comprised of local surfers, environmentalists, local government officials, and business leaders. 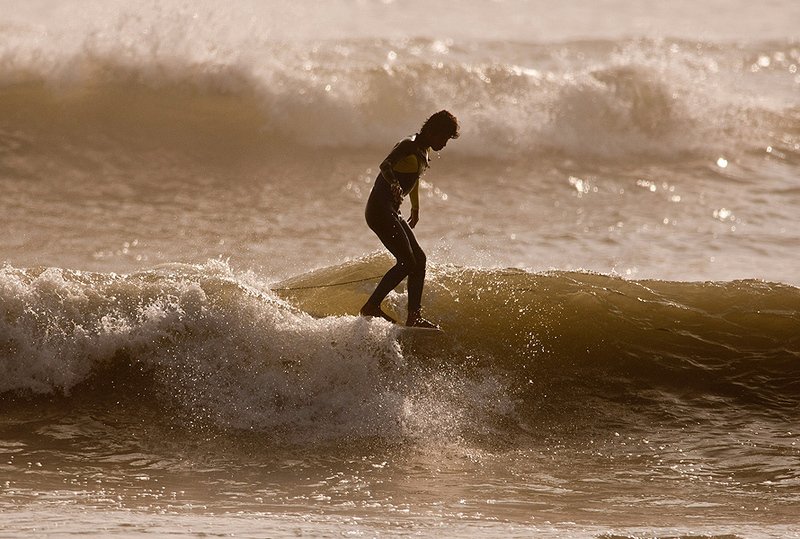 Developing the Reserve Stewardship Plan together builds consensus on future conservation efforts that they can enact to protect their prestigious World Surfing Reserve. 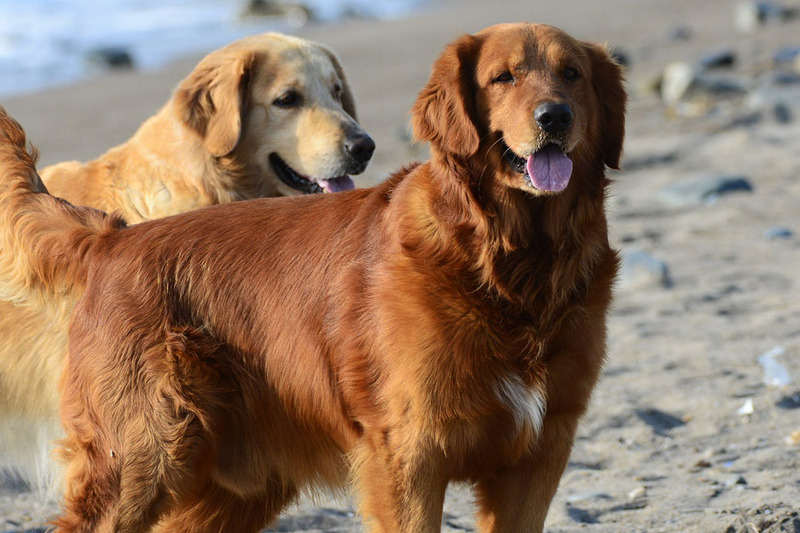 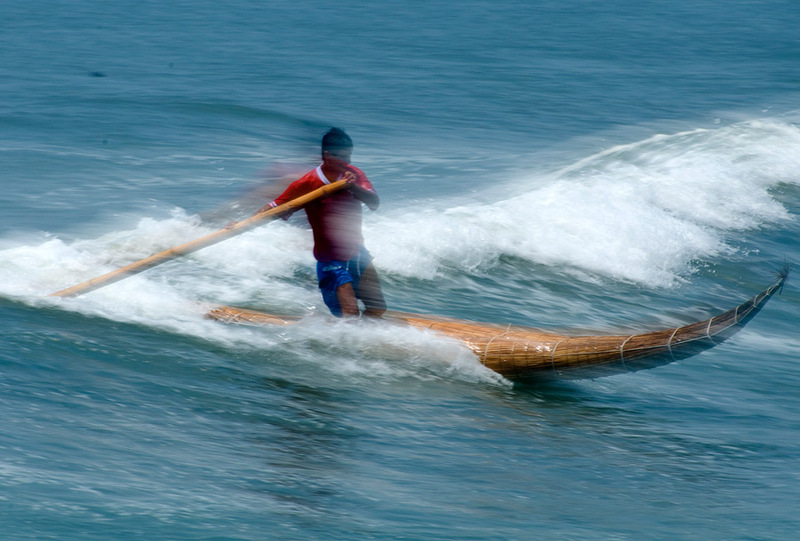 The result is a clear conservation framework developed by the local community in partnership with Save The Waves Coalition to guide their efforts and achieve measurable coastal conservation outcomes. 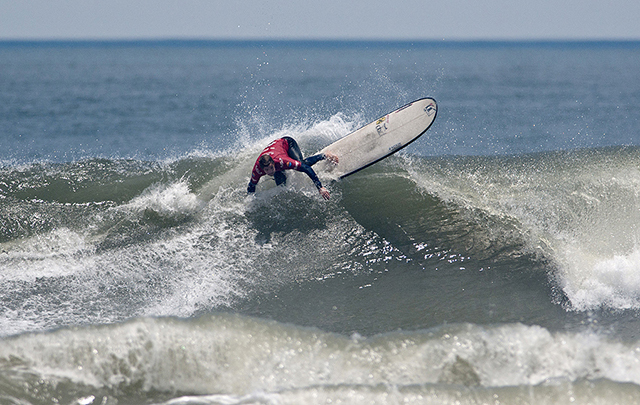 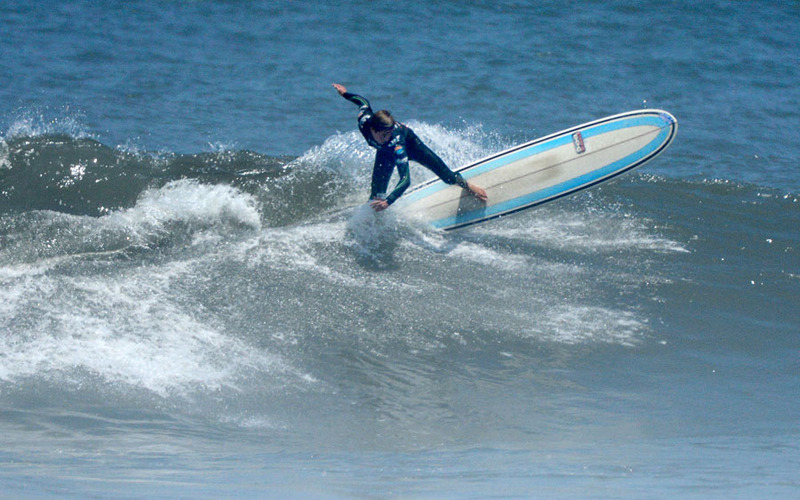 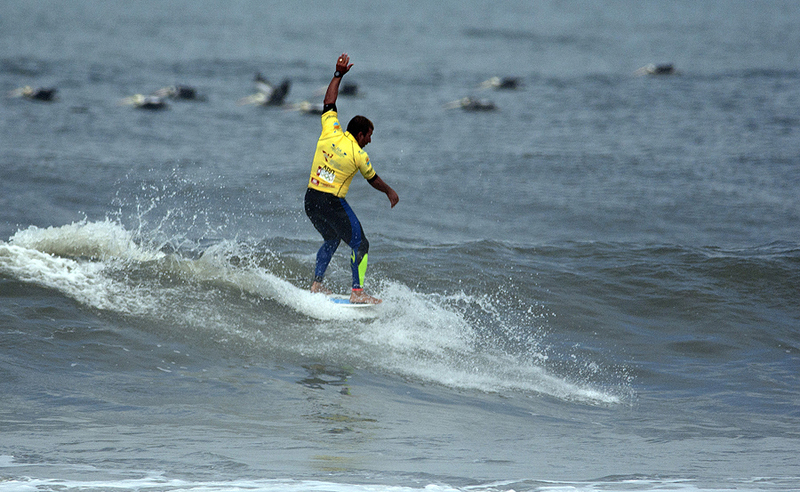 The 2013 ISA World Longboard Champions will be crowned on Saturday. 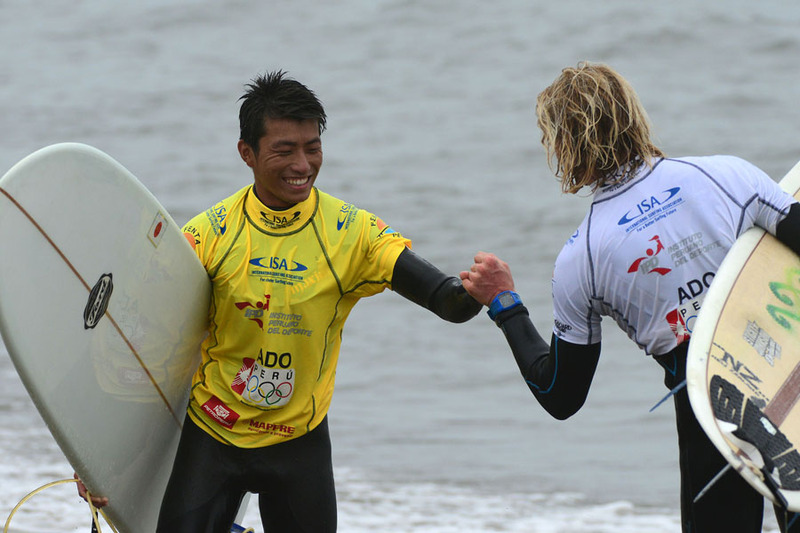 All of the Individual and Team Gold Medals, plus the ISA Aloha Cup will be decided on the Final Day of competition. 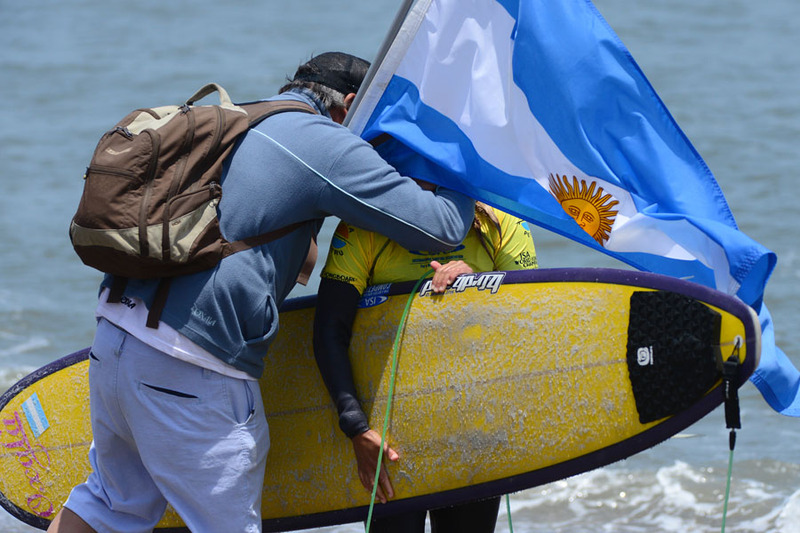 On an electrifying Day 5 of competition, the first Grand Finalists have been confirmed and the Repechage Finals have also been set. 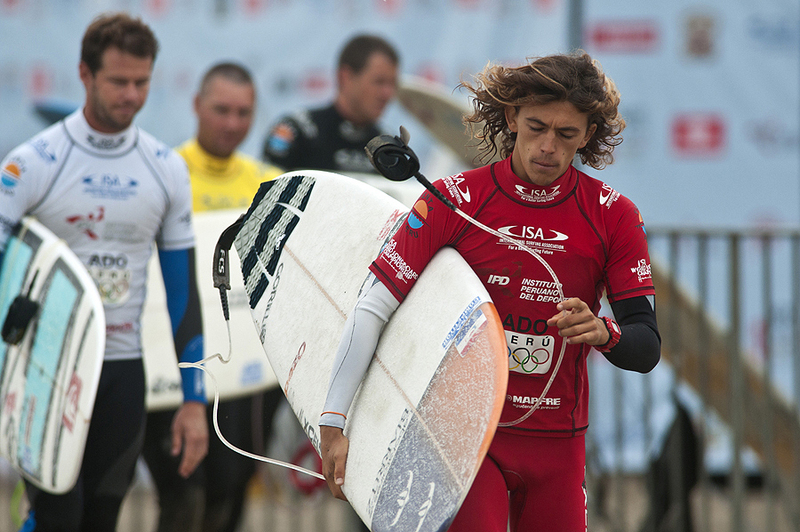 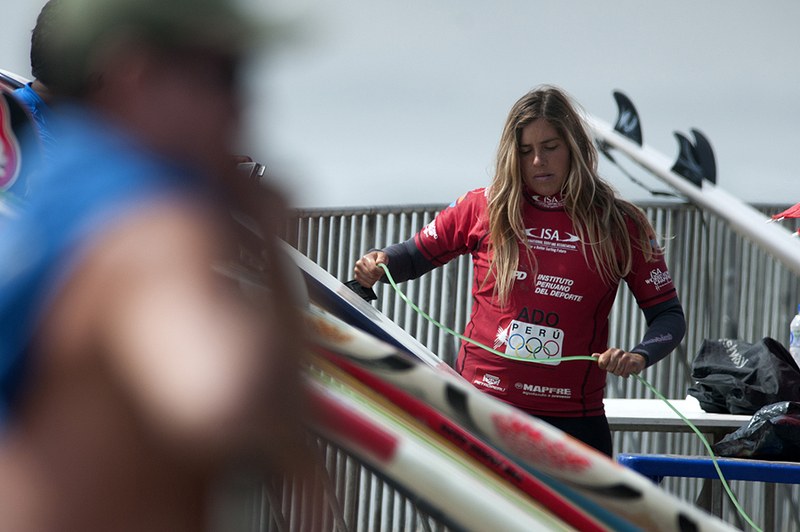 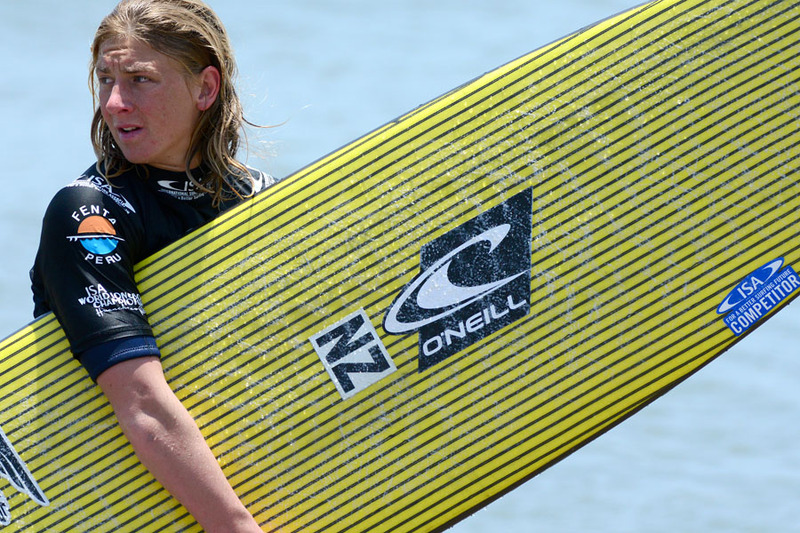 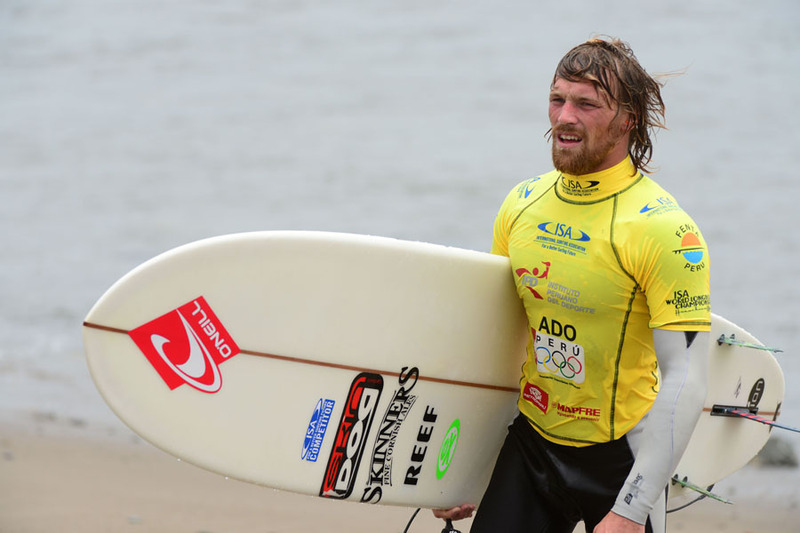 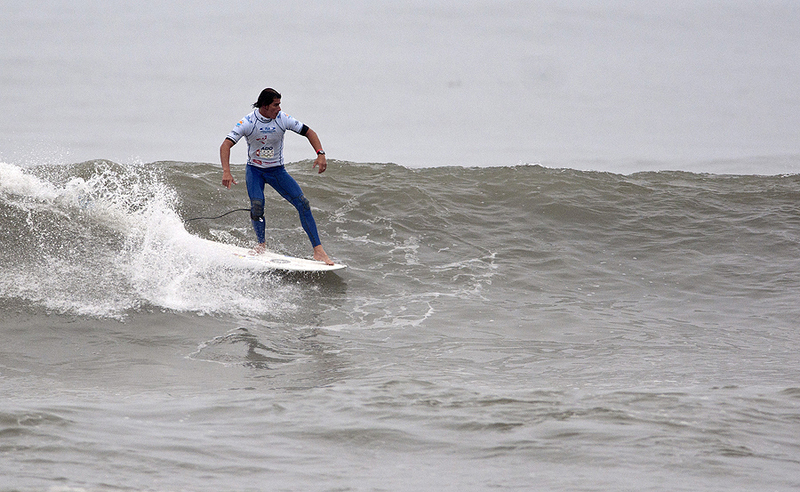 The two surfers that advance from the Repechage Final will move into the Grand Final. 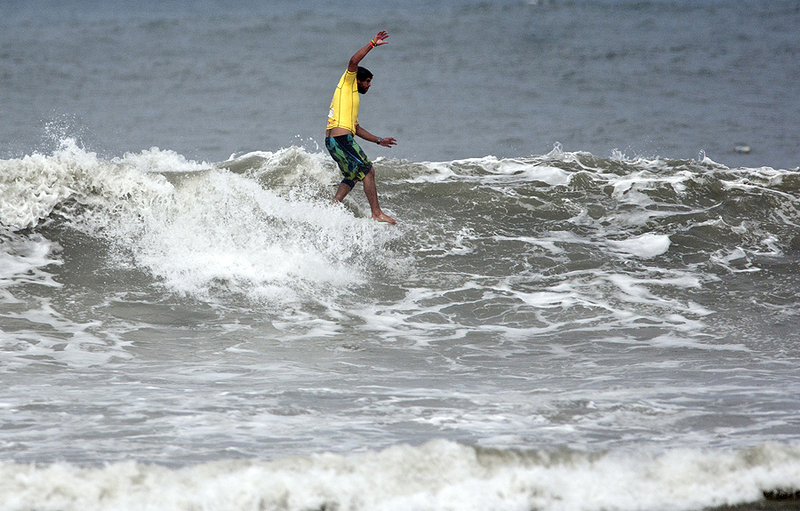 The surf conditions at the historic point break in Huachaco remained in the 3-4 foot range with long walls, allowing the surfers to perform a variety of maneuvers. 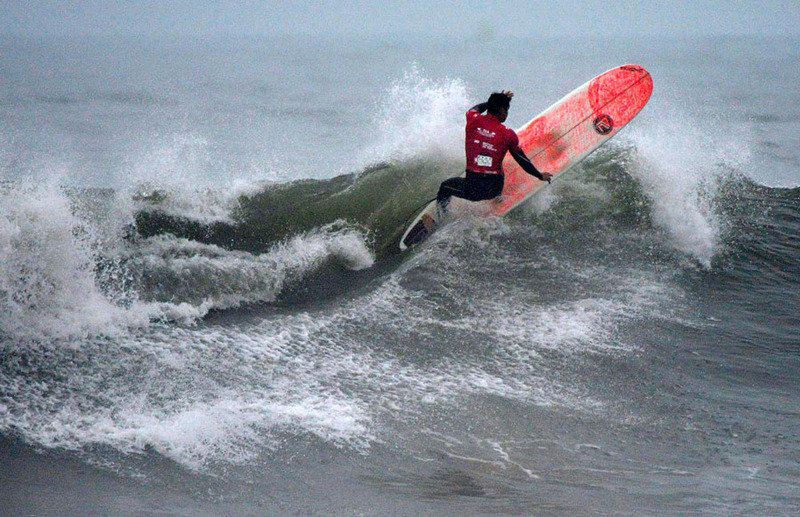 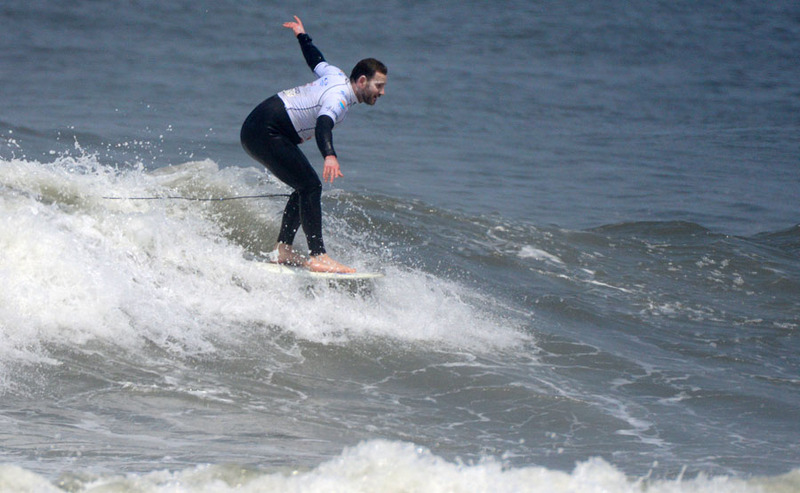 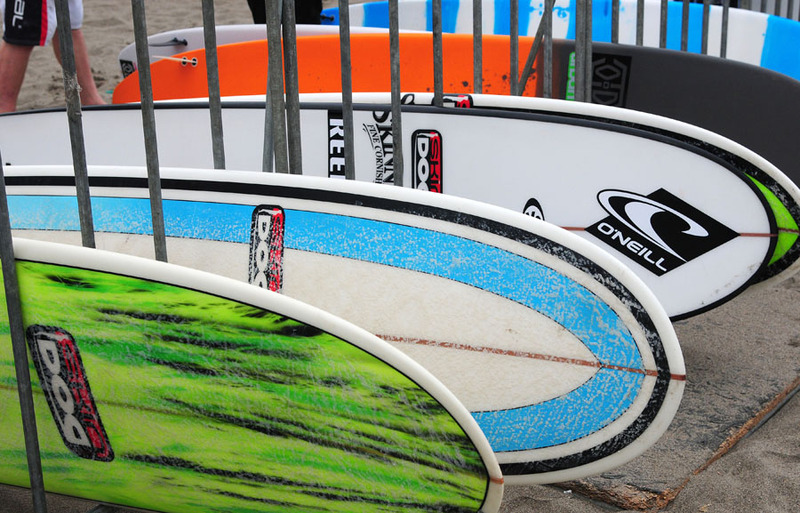 The highest scores of the day came from rides where the surfers displayed power and flow with a mix of traditional and high performance longboard surfing, which is the criteria established by the ISA for judging. 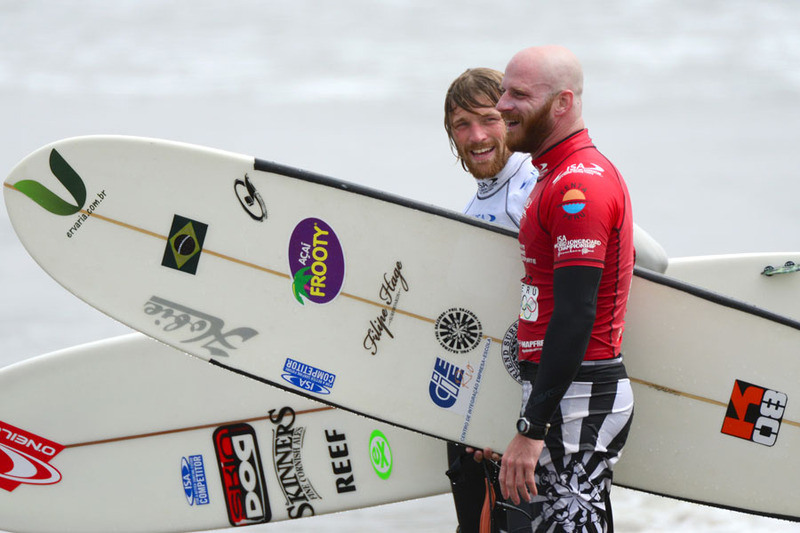 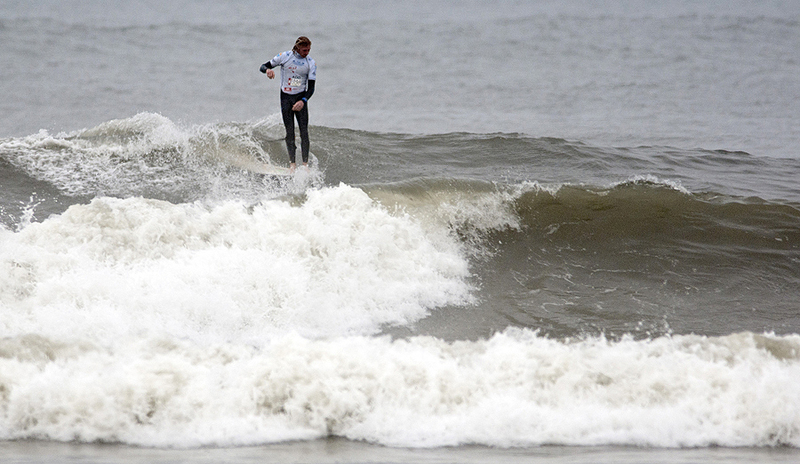 In the Open Men’s, Great Britain’s Ben Skinner and South Africa’s Thomas King advanced directly into the Grand Final. 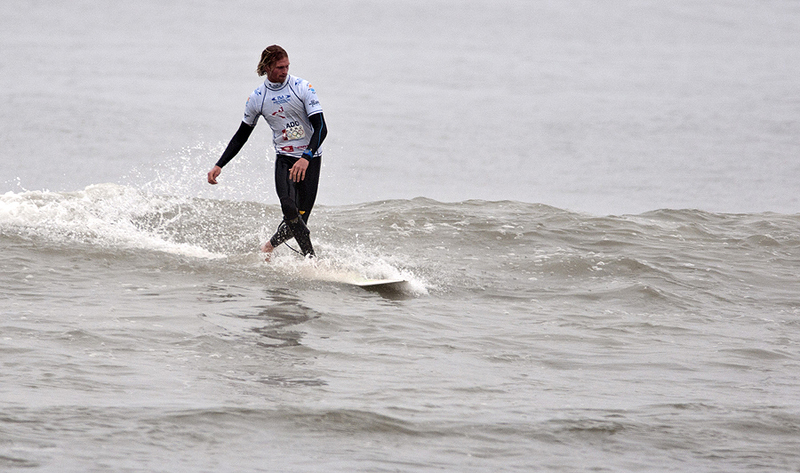 Skinner had the highest total heat score earning 16.27, defeating King (13.76), and sending into the Repechage the French brothers Antoine (11.53) and Edouard Delpero (10.67). 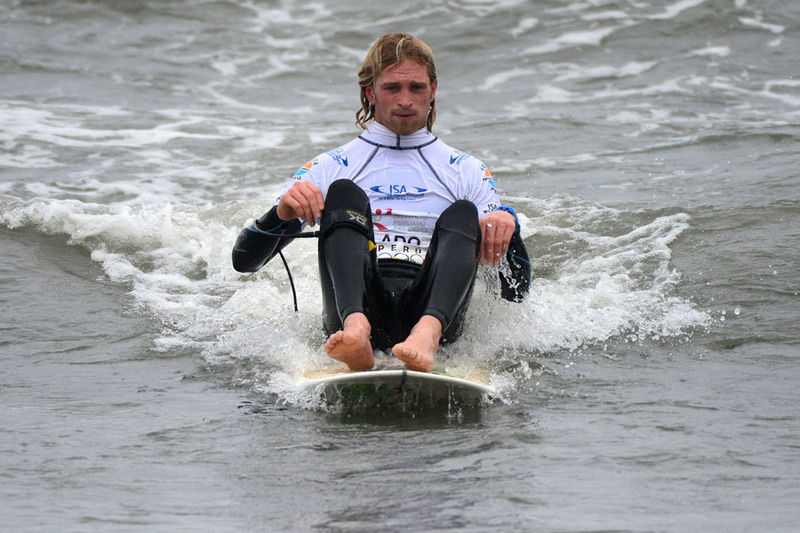 Skinner and King will be joined in the Grand Final by the 1st and 2nd place finishers of the Men’s Repechage Final, featuring Phil Rajzman (BRA), Piccolo Clemente (PER), Antoine Delpero (FRA), and Edouard Delpero (FRA). 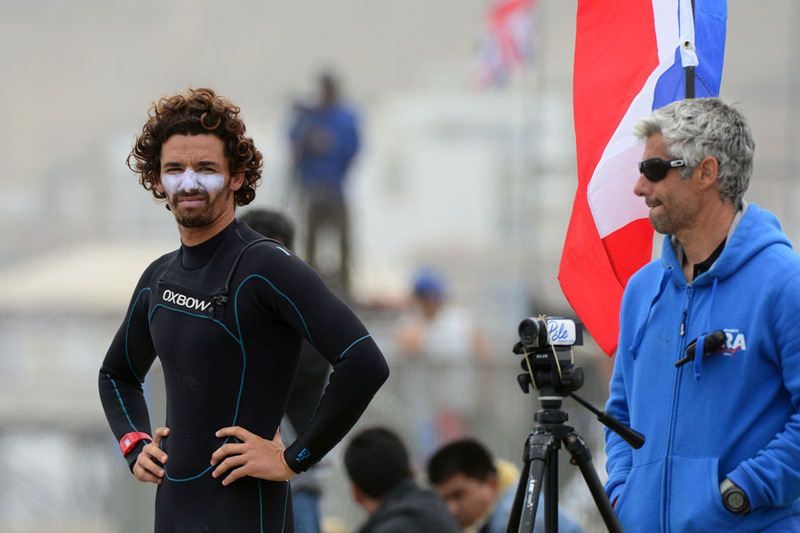 Phil Rajzman put on a great performance today, earning 13.60, to advance to the Repechage Final, narrowly defeating the local Peruvian, Piccolo Clemente (13.57), sending home Juan Jose Corzo (PER, 11.97) and Kai Sallas (HAW, 11.57). 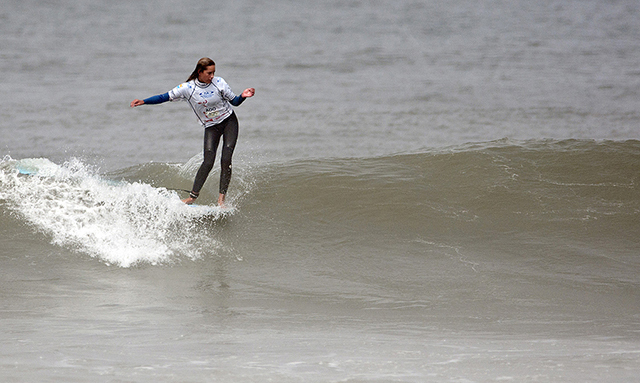 On the Women’s side, France’s Justine Dupont and South Africa’s Simone Robb advanced directly into the Grand Final. 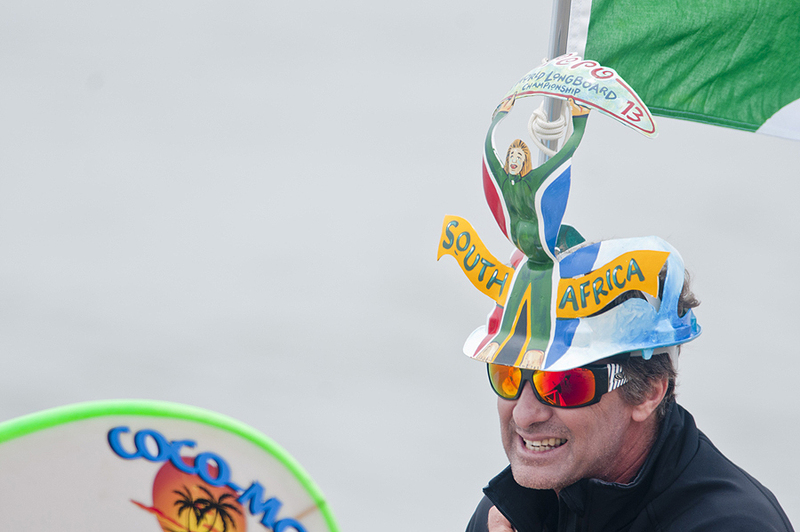 The South African managed to squeeze in second place, earning 9.37, sending to the Repechage Final Megan Godinez (HAW, 9.27) and Mary Gil (ARG, 5.66). 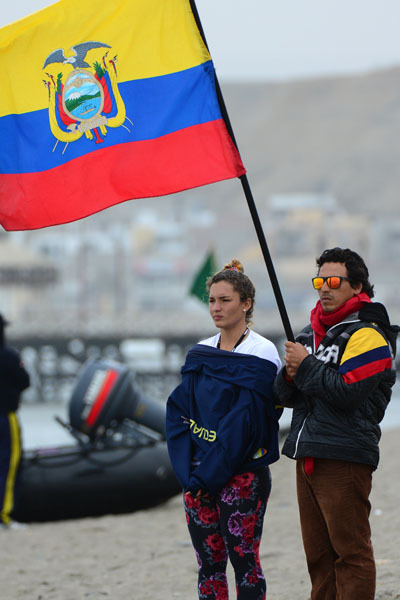 Dupont and Robb will be joined in the Grand Final by the 1st and 2nd place finishers of the Women’s Repechage Final, featuring Rachael Tilly (USA), Karen Mendiguetti (PER), Megan Godinez (HAW), and Mary Gil (ARG). 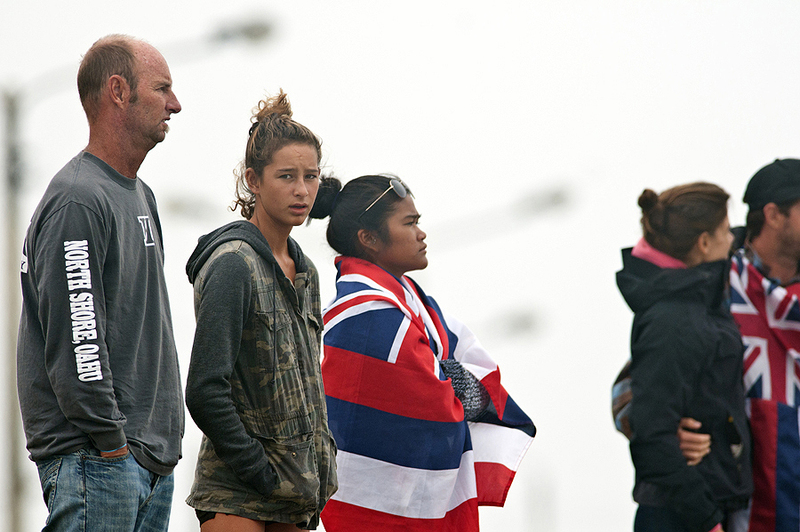 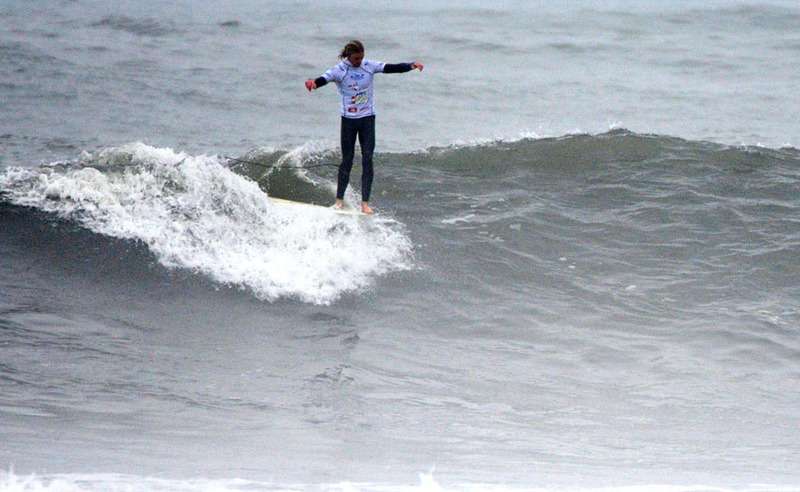 In the Junior’s, Hawaii’s Honolua Blomfield and France’s Martin Coret advanced directly into the Grand Final. 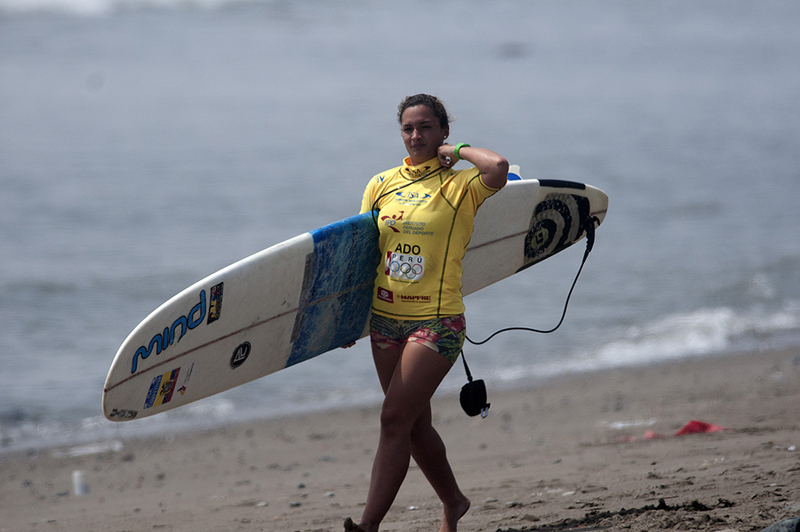 The Hawaiian is the last female remaining in the division and won her heat earning 11.94, defeating Marting Coret (FRA, 9.6) and sending to the Repechage Final Ethan Pentz (RSA, 8.97) and Caio Santana (BRA, 8.90). 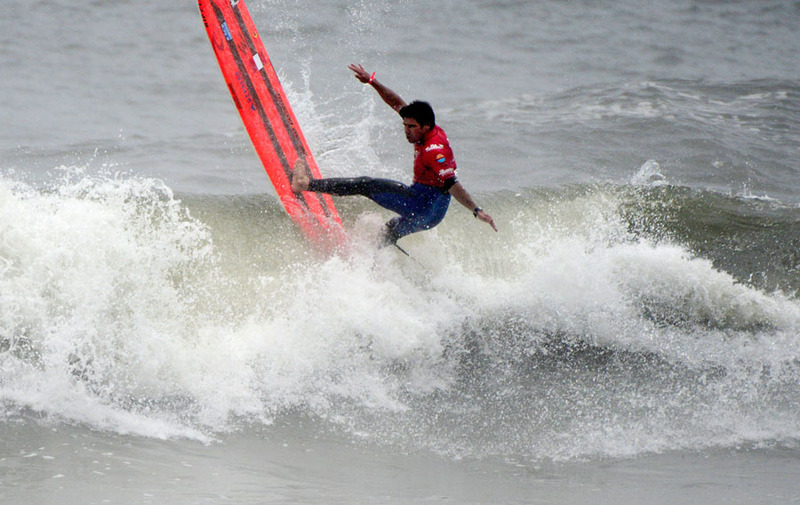 Blomfield and Coret will be joined in the Grand Final by the 1st and 2nd place finishers of the Junior’s Repechage Final, featuring Yoissis Delgado (VEN), Surfiel Gil (ARG), Ethan Pentz (RSA), and Caio Santana (BRA). 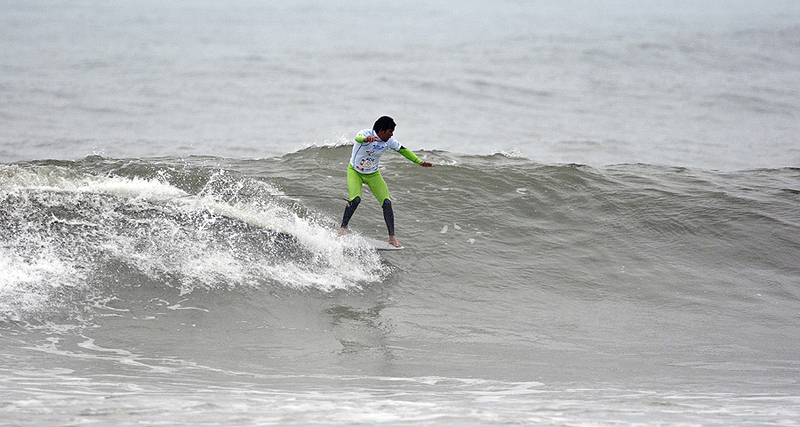 The exciting ISA Aloha Cup semifinals, a tag-team format competition, took place today. 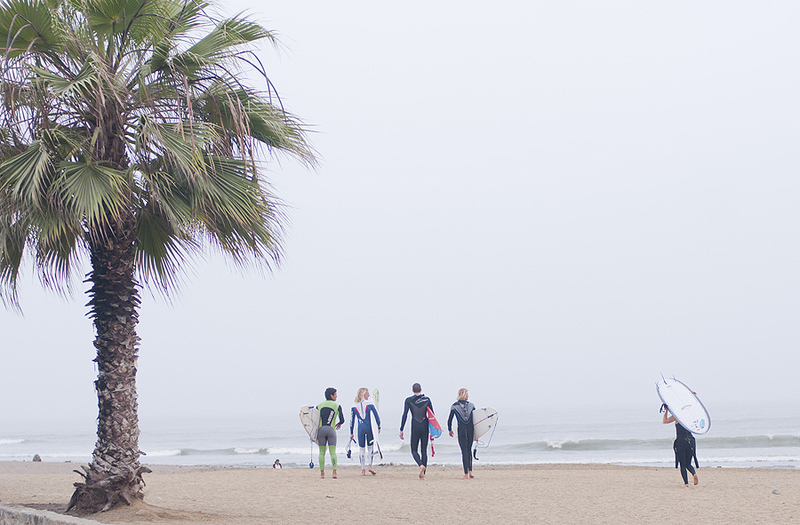 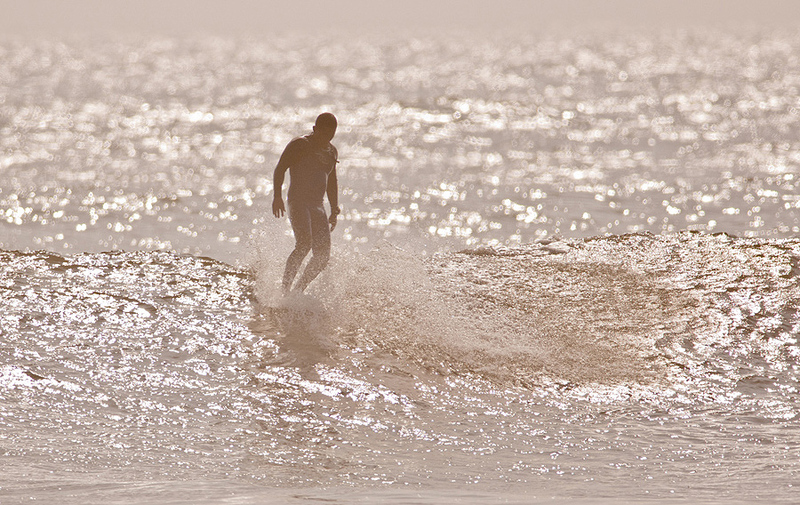 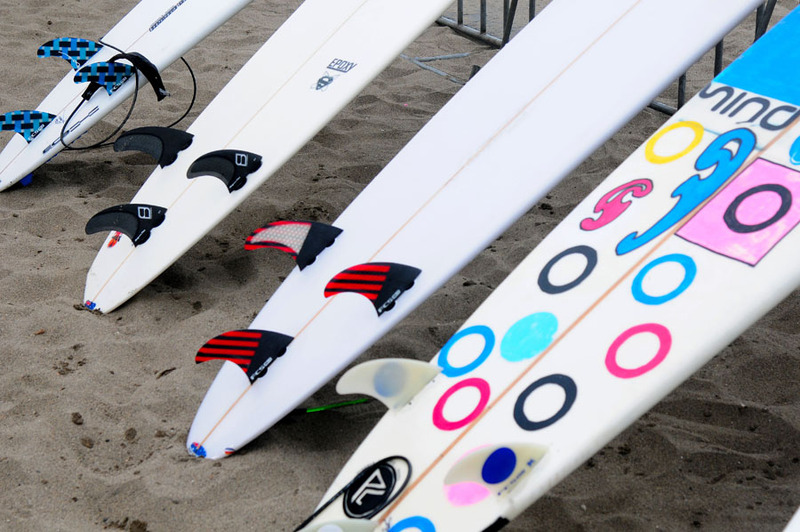 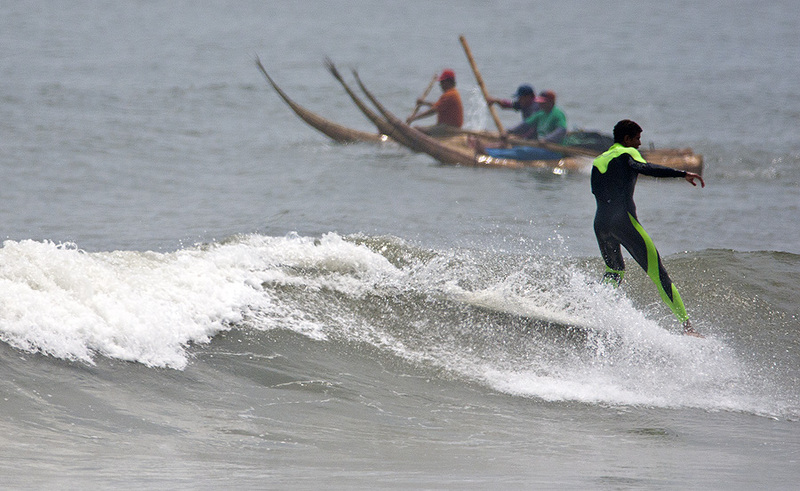 Every team is made up of 4 surfers, and each surfer must catch 3 waves in a one-hour heat. 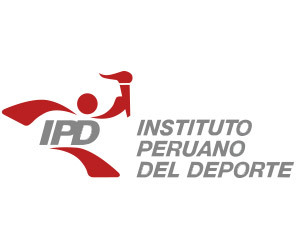 In the first semifinal, Australia, with 59.75, defeated Peru (54.00) and eliminated Argentina (40.90) and New Zealand (37.20). 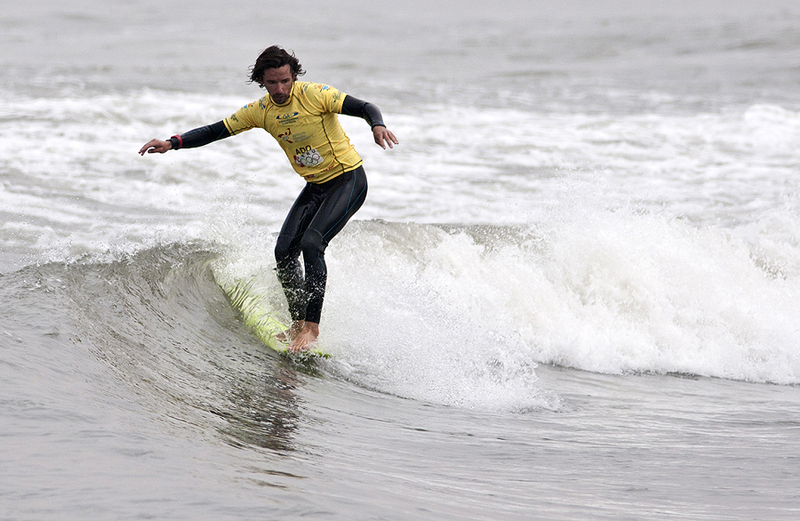 In the second semifinal, France dominated with a total score of 71.05, defeating Brazil (49.20) and eliminated South Africa (37.80) and Venezuela 37.30. 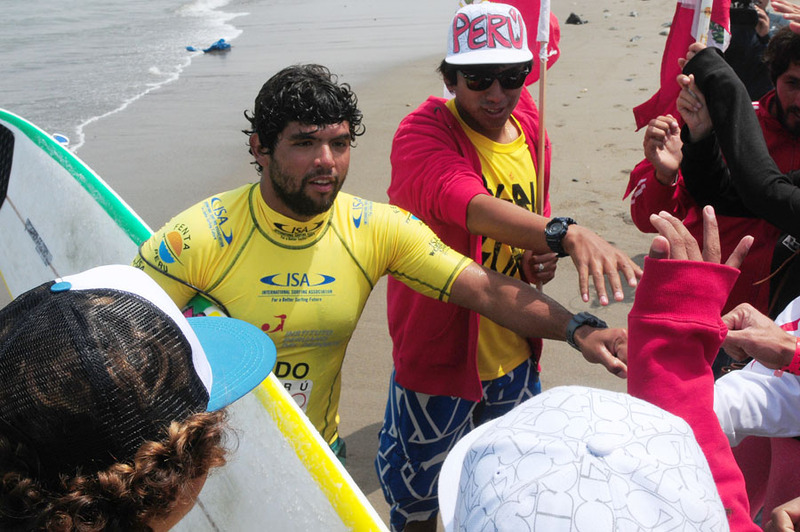 Australia, Peru, France, and Brazil will face each other in the ISA Aloha Cup Final on Saturday. 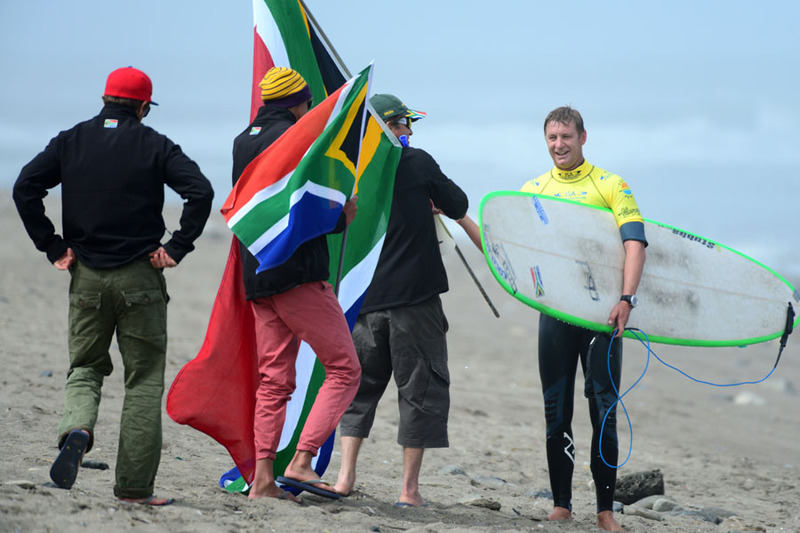 With all members of their National Team still in the competition, Team France and South Africa are in the lead and will fight for the coveted Team Gold Medal on Saturday. 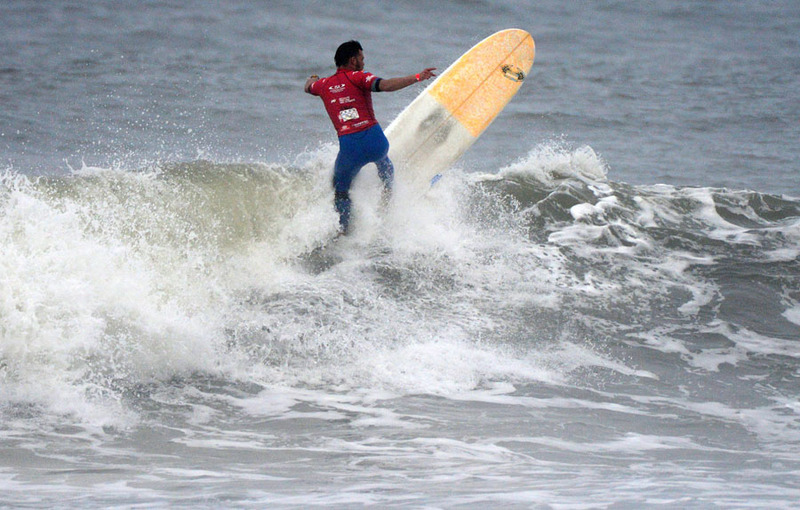 Peru and Brazil, in 3rd and 4th respectively, are not far behind and will be looking to cause major upsets on the Final Day. 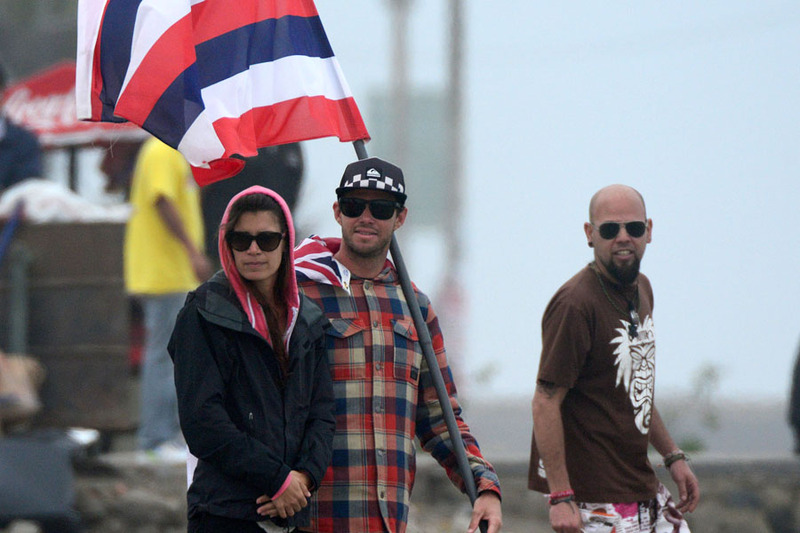 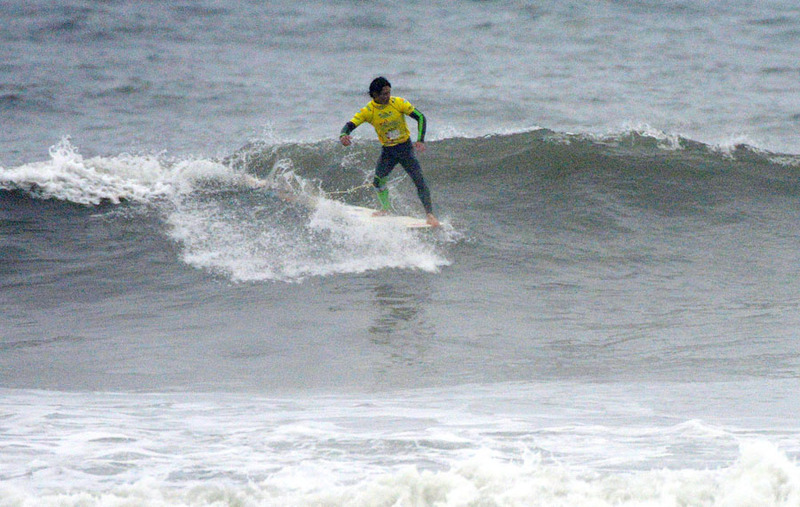 The 2013 ISA World Longboard Championship will resume Saturday, at 9:40am with The Morning Show featuring members from Team Hawaii. 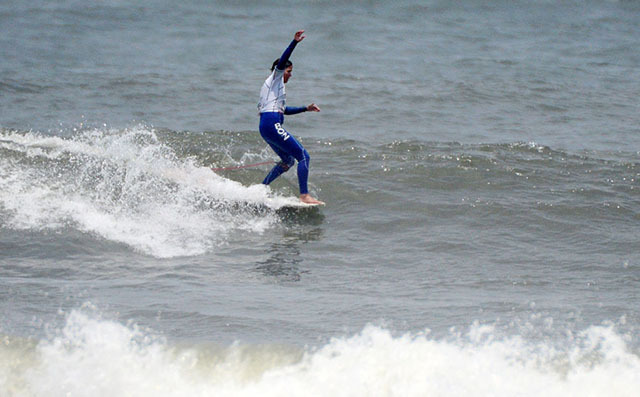 The competition intensified at the idyllic pointbreak of Huanchaco for Day 3 of the ISA World Longboard Championship. 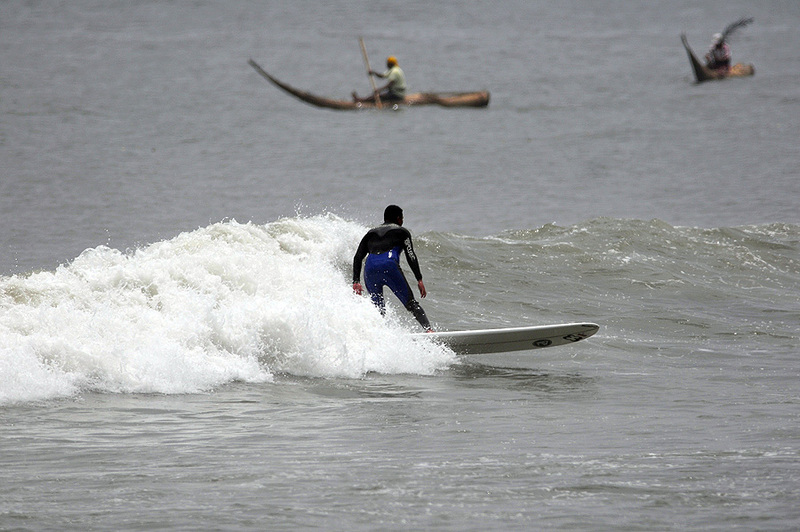 Great waves continued although the swell dropped slightly into the 3-4 foot range with calm winds and glassy conditions. 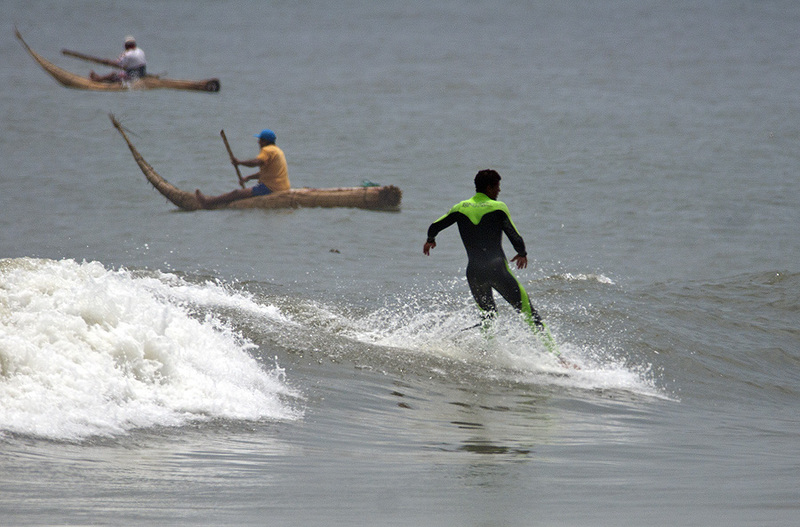 With the right wave selection, the surfers connected through the different sections, resulting in over 200 yard long rides. 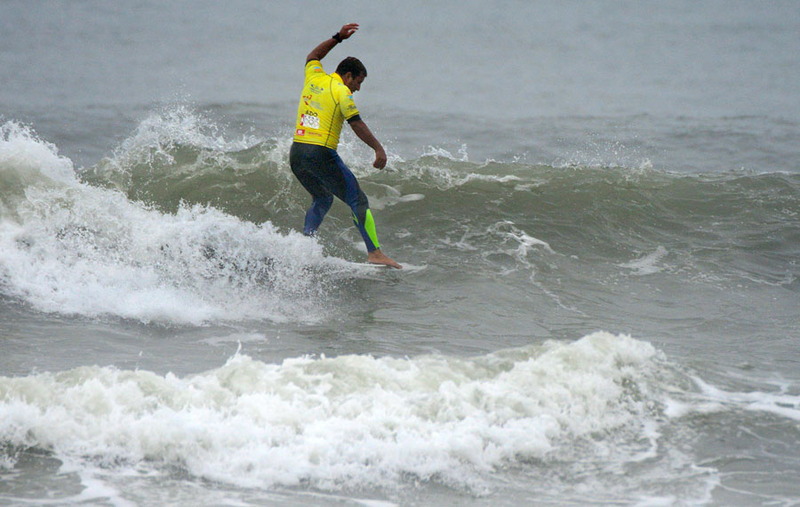 The third day of the six day event featured the Repechage rounds for the Open Men, Open Women, and Junior, followed by Qualify 3 of Open Men, for a full day of intense, often do-or-die surfing. 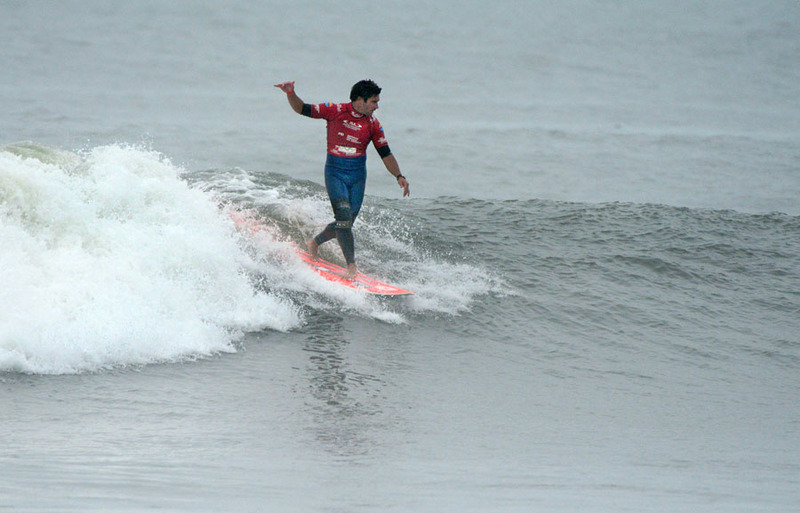 To kick-off the day, the Open Men’s Repechage 2 took place, where Peru’s Piccolo Clemente was the standout, earning the highest heat score of the round. 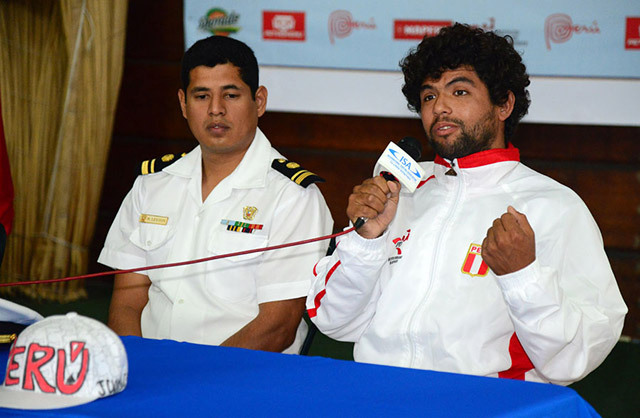 The Peruvian defended his home court earning a 15.50 total heat score, narrowly defeating USA’s Tony Silvagni (14.66) and sending home Uruguay’s Gonzalo Eris (6.84) and Antonio Pita (6.53). 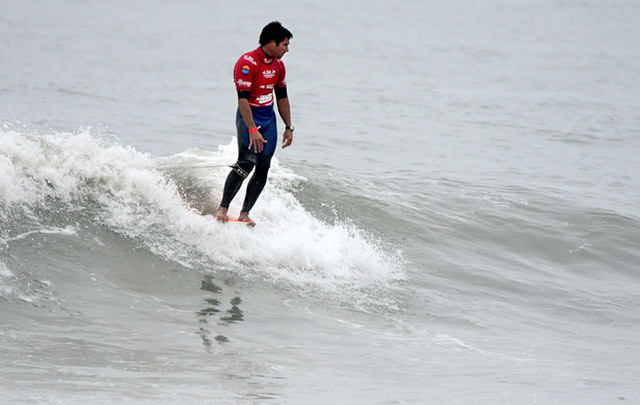 The Peruvian surfed again in the afternoon, where he earned the day’s highest total heat score of 17.10 thus keeping his hopes alive. 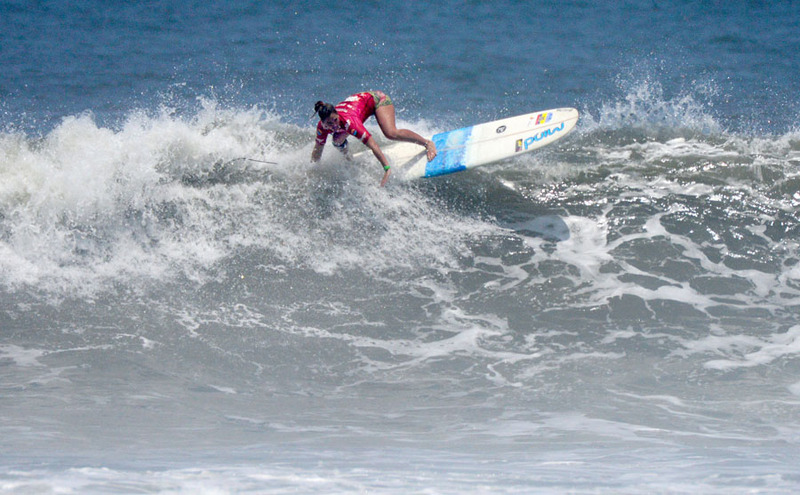 In the Open Women’s Repechage, Brazil’s Atalanta Nascimento kept her hopes alive, dominating her heat defeating Japan’s Shiho Okazawa (7.24) and sending home Great Britain’s Claire Smail (4.94) and Dominican Republic’s Caroline De Cat (1.47). 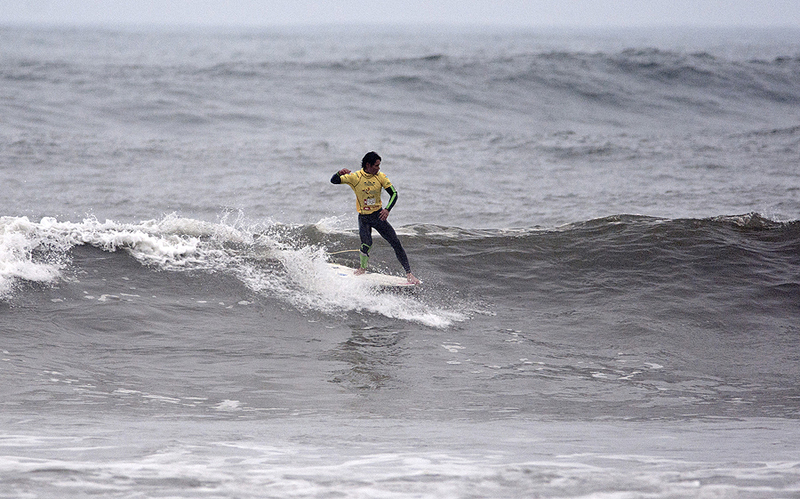 In the Junior’s, Venezuela’s Yoissis Delgado led the charge with the highest heat score of the division, earning 13.34, defeating USA’s Nick Anderberg (7.8) and sending home one of the only 2 girls in the Junior Division, Canada’s Lola Mignot (6.23). 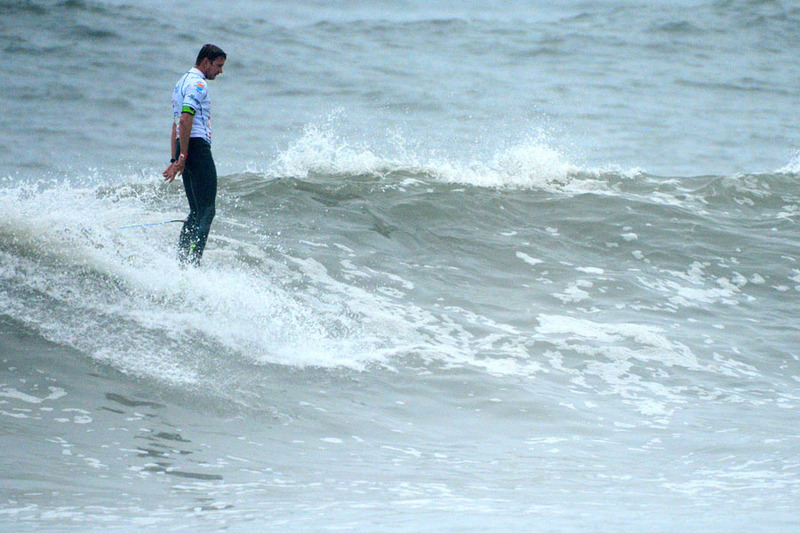 Following the Repechage rounds, the Men’s Qualifying 3 hit the water, with performances at a very high level. 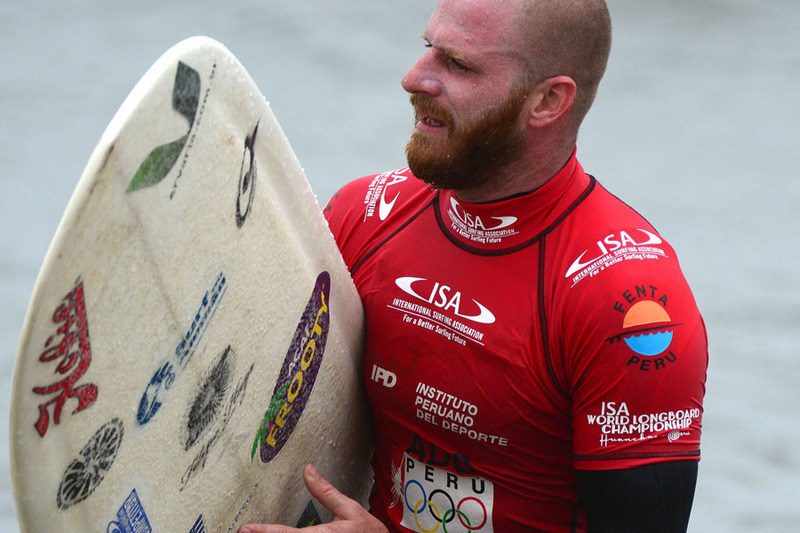 The standout was Great Britain’s Ben Skinner, who earned an impressive 17.00 total heat score, defeating South Africa’s Thomas King (12.66) and sending into the Repechage Australia’s Jared Neal (11.57) and USA’s Taylor Jensen (11.4). 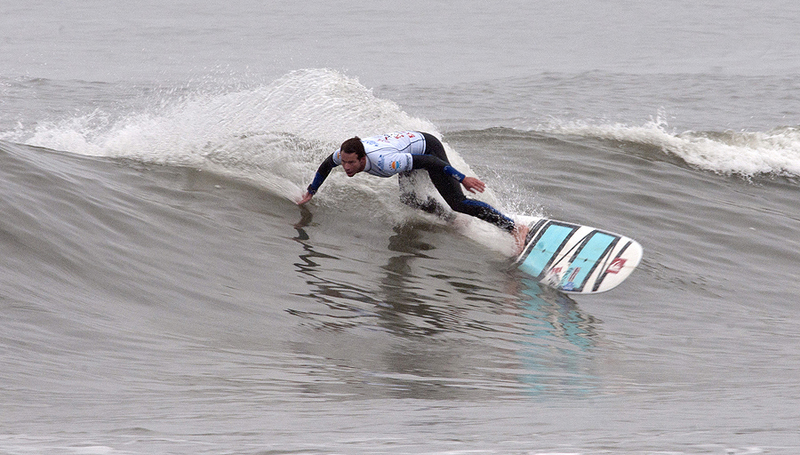 The 2013 ISA World Longboard Championship resumes Thursday at 7:40am with The Morning Show featuring members of Team New Zealand and Hawaii. 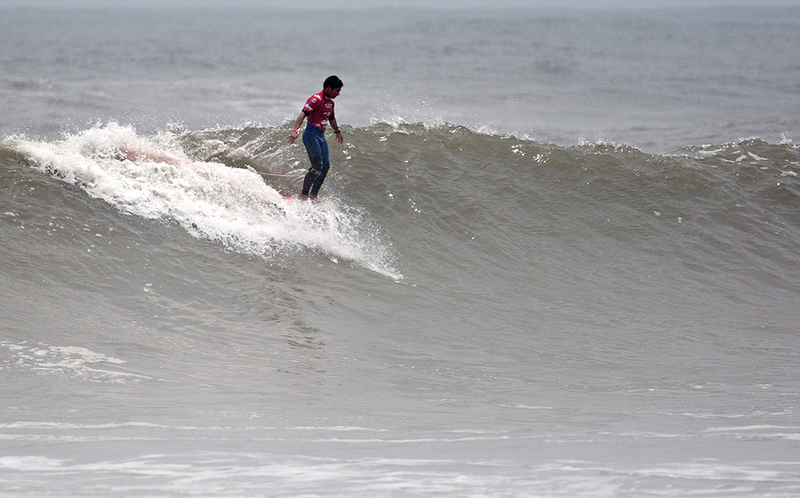 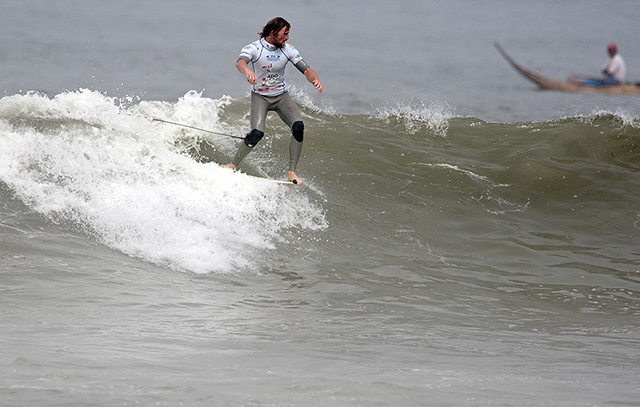 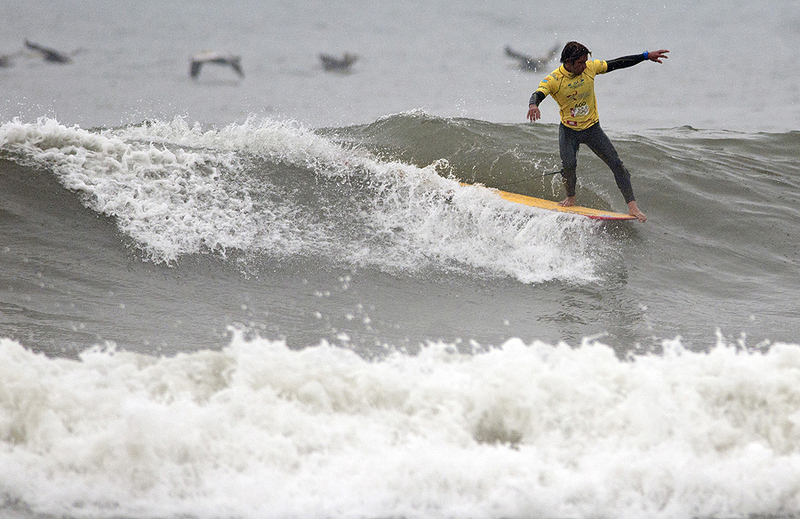 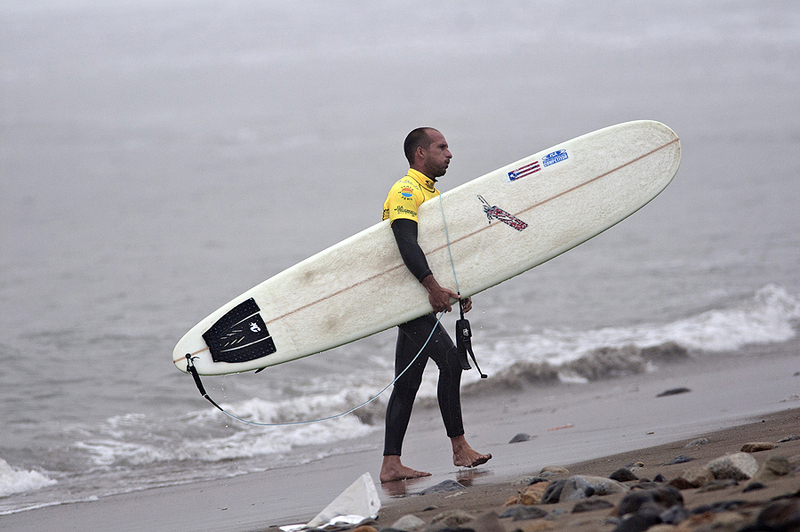 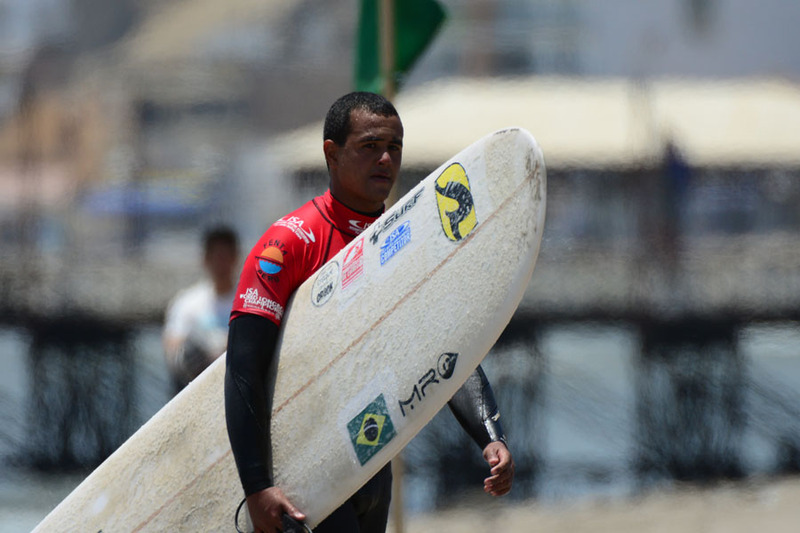 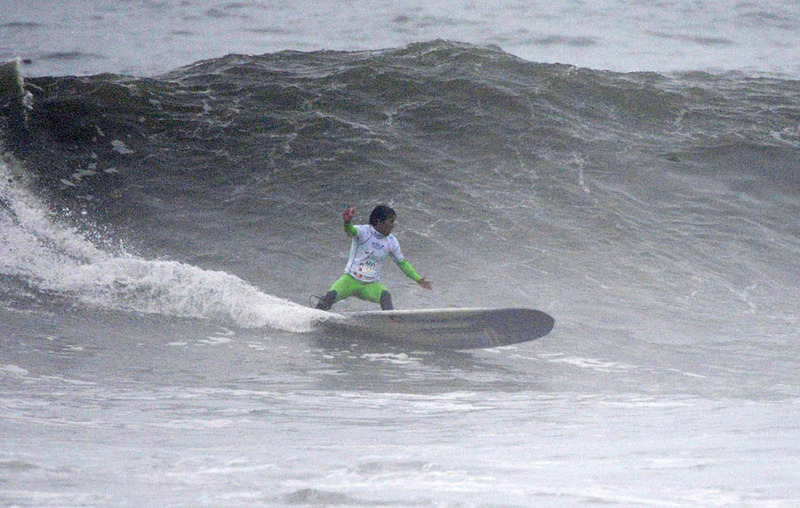 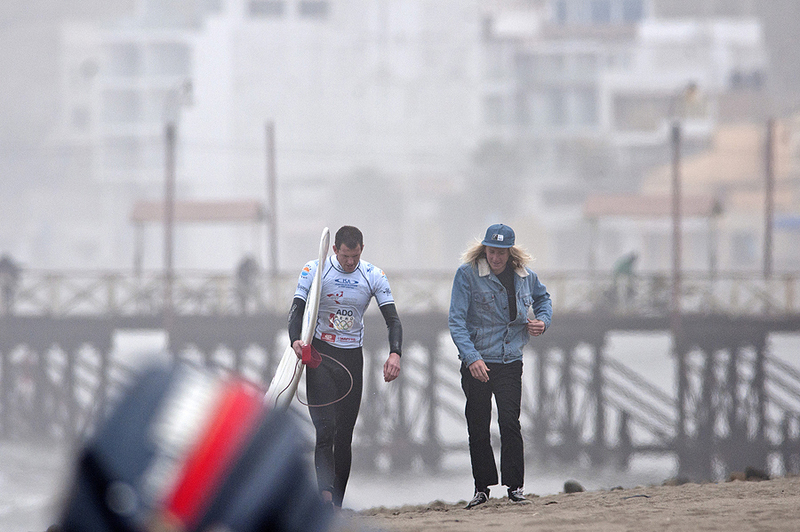 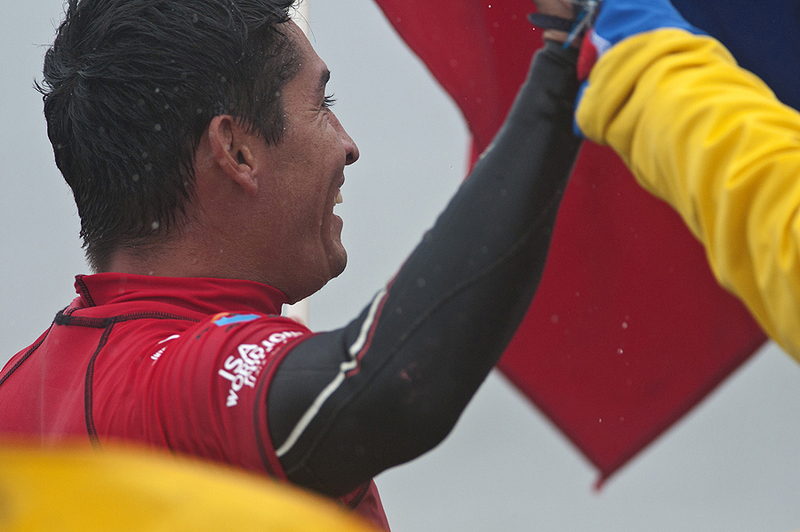 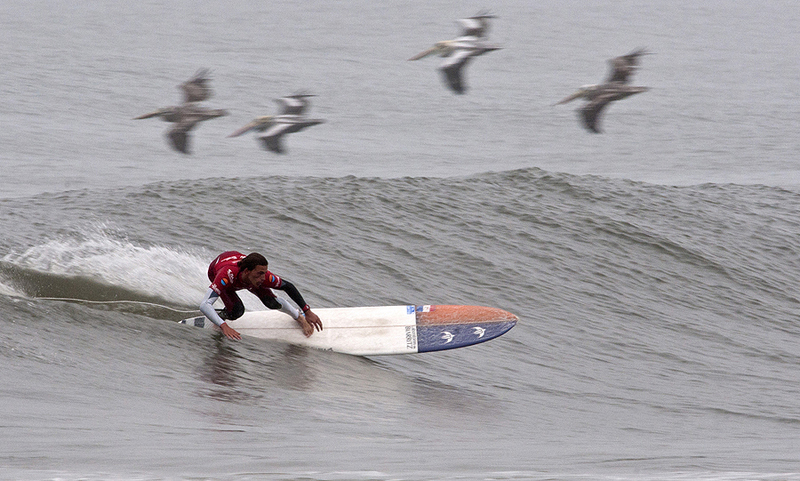 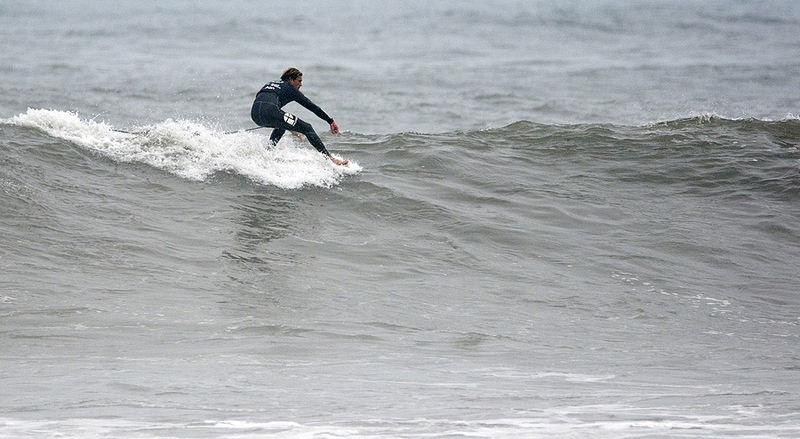 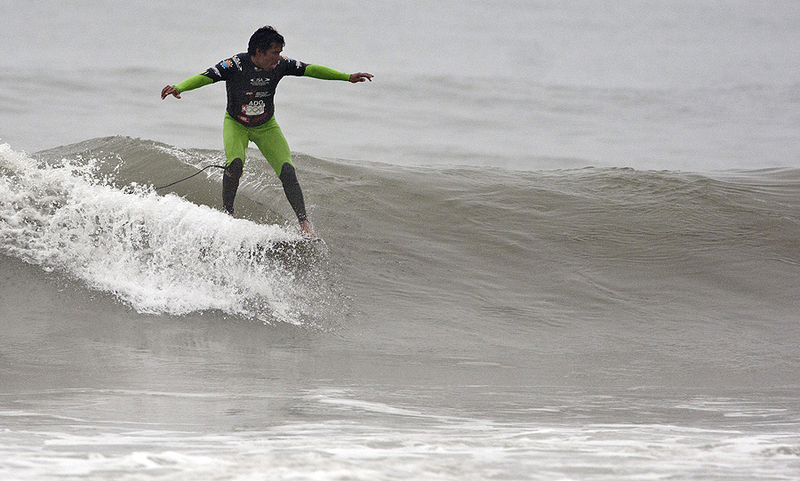 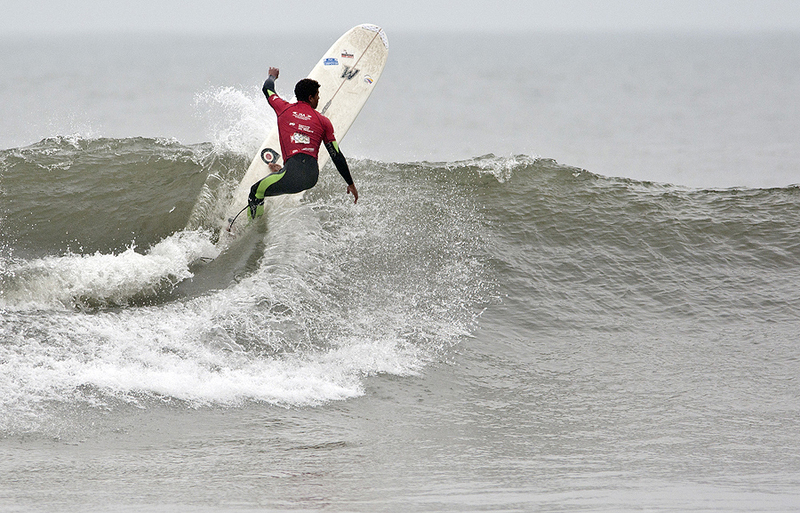 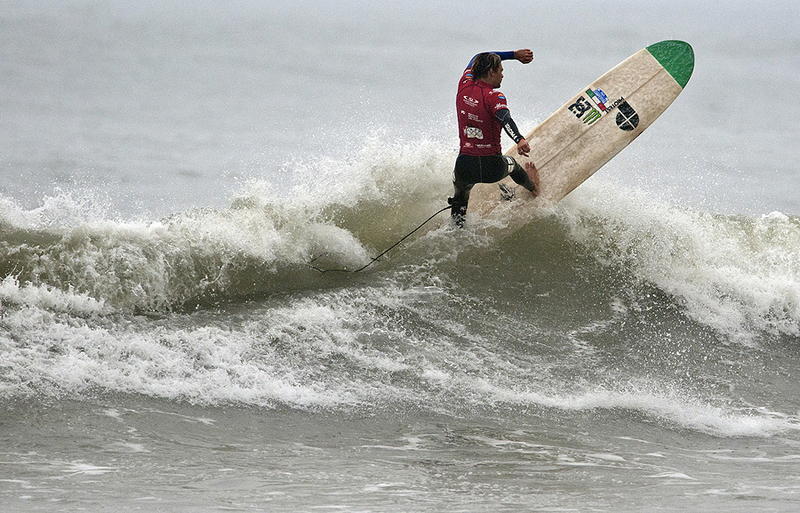 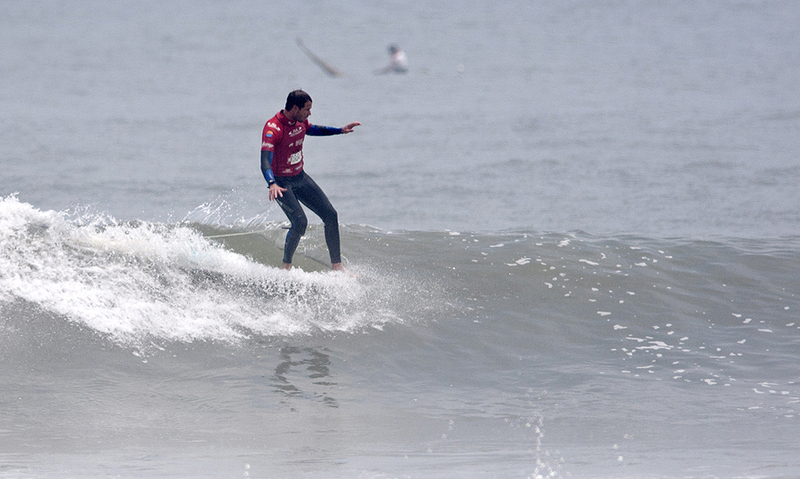 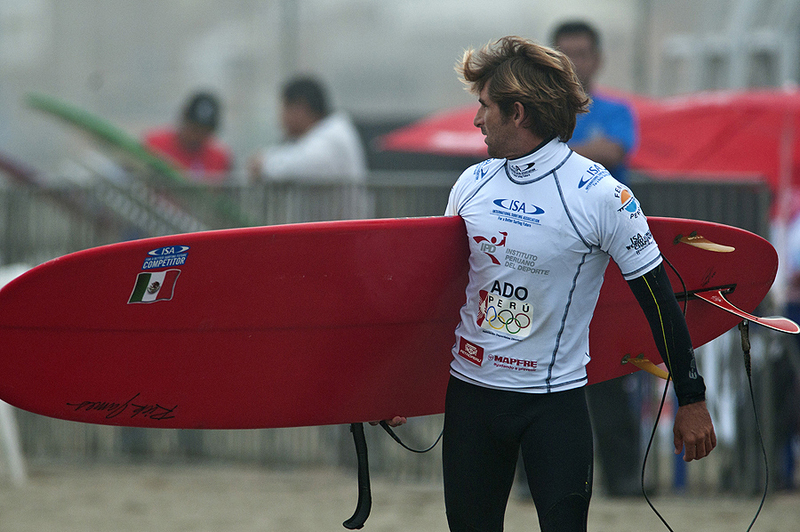 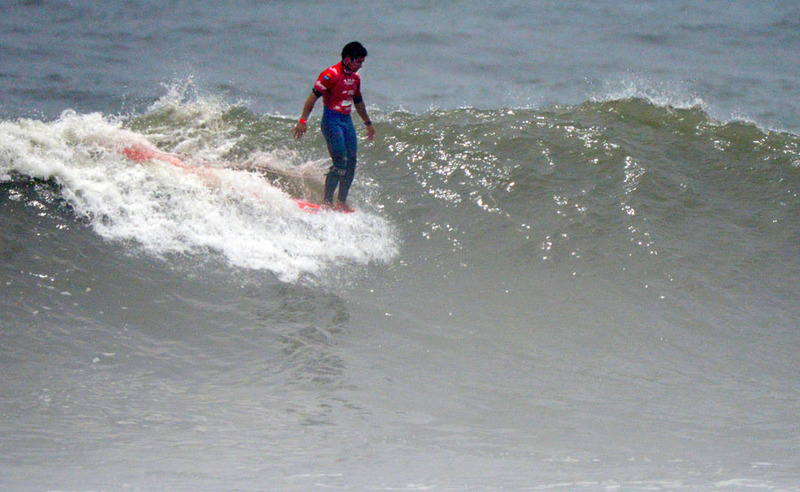 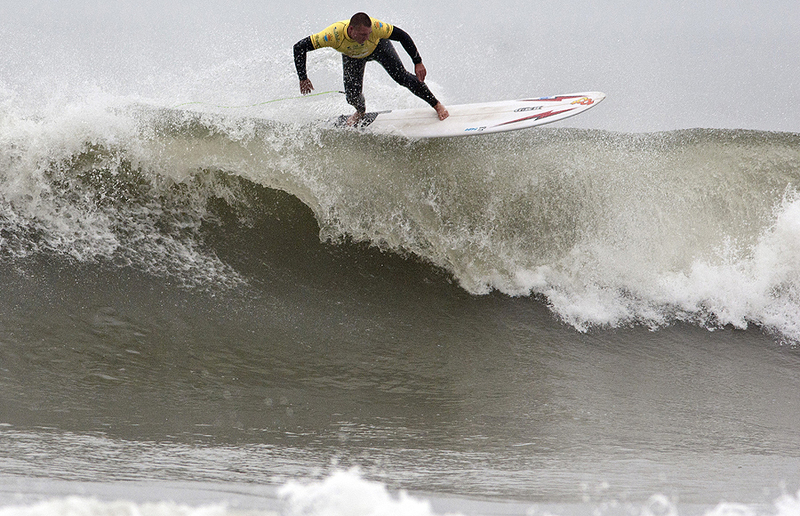 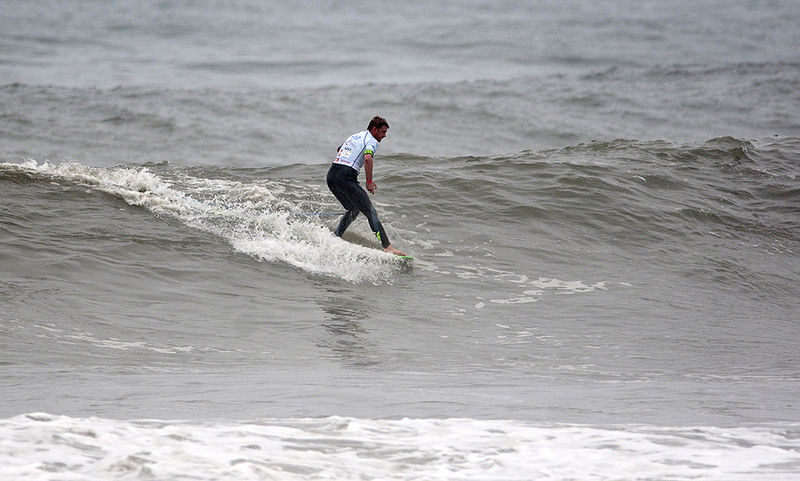 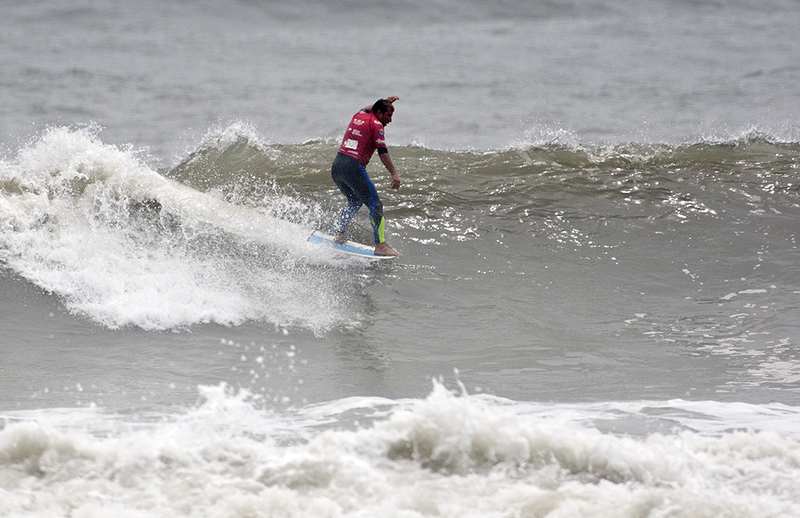 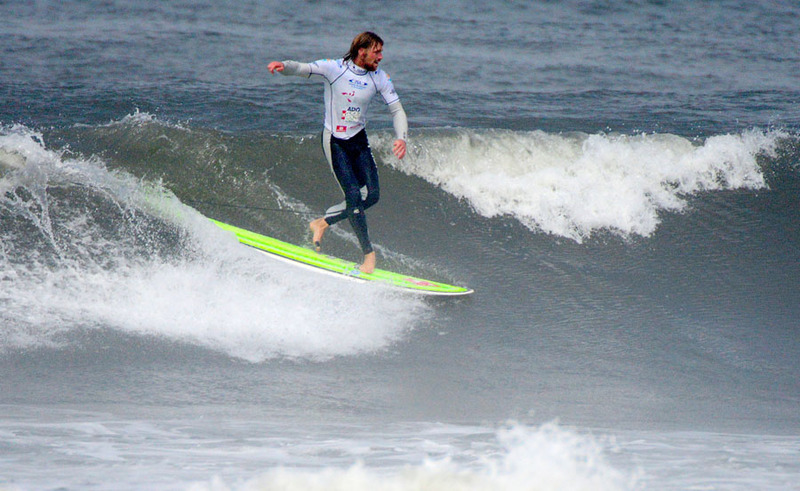 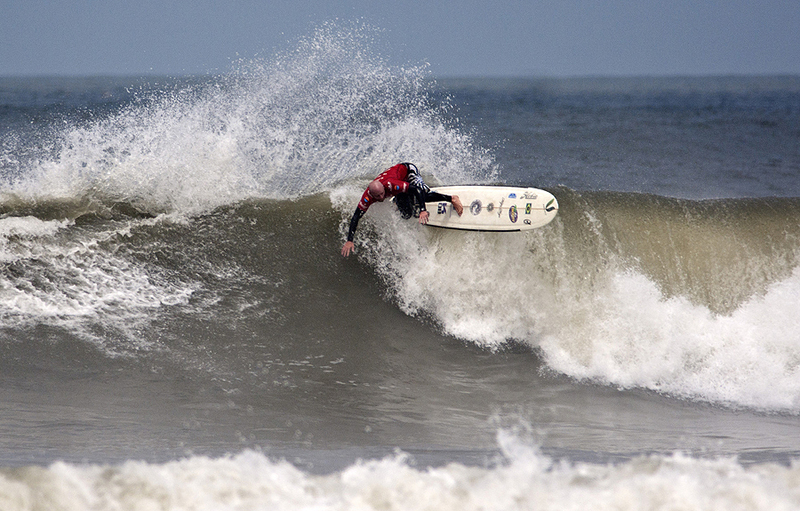 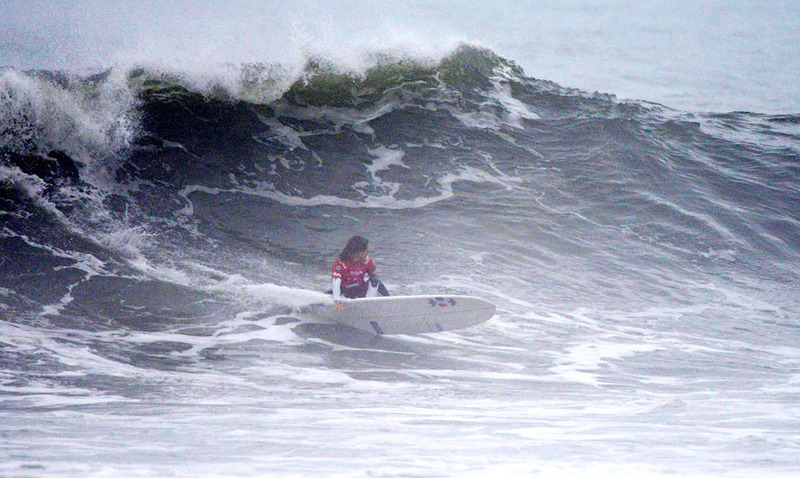 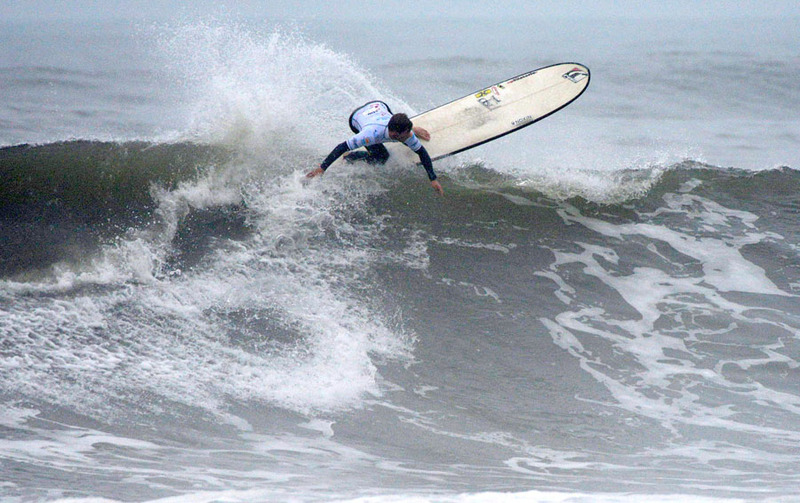 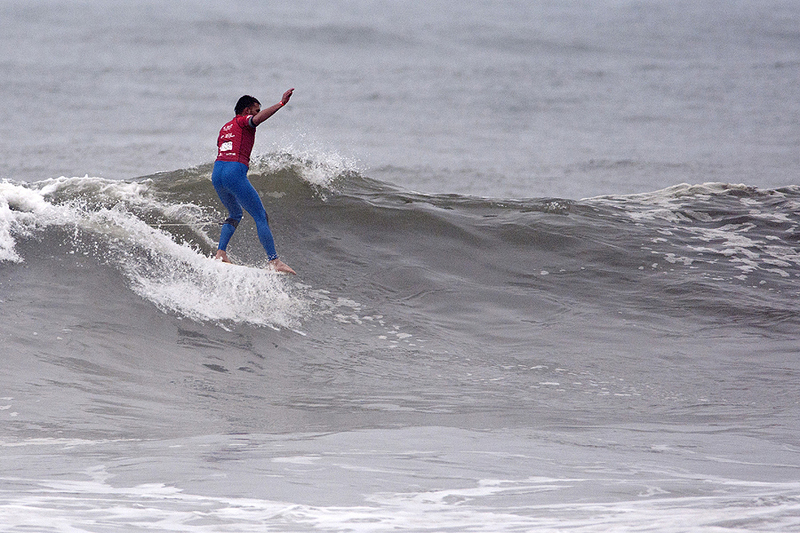 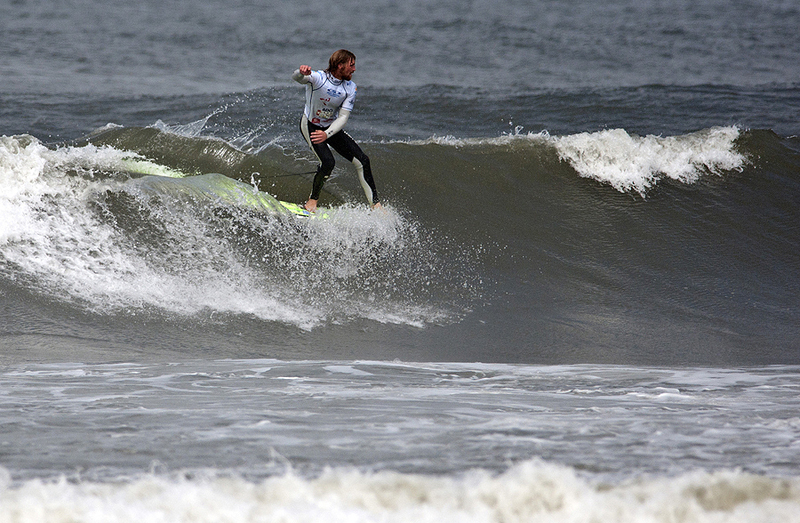 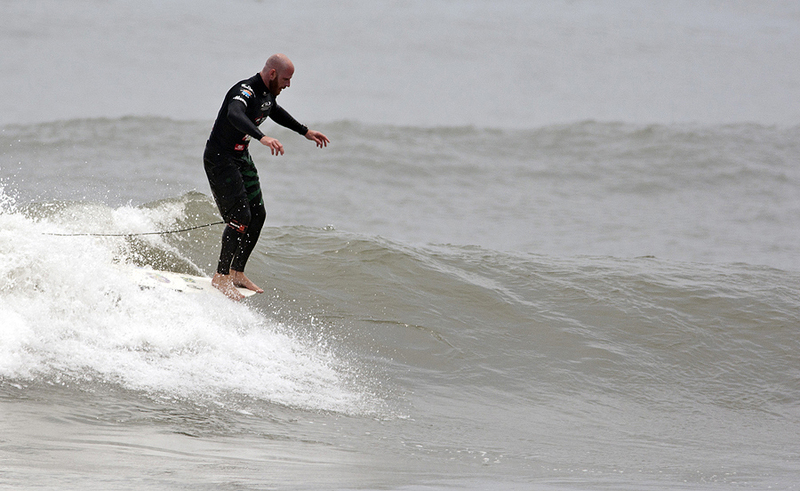 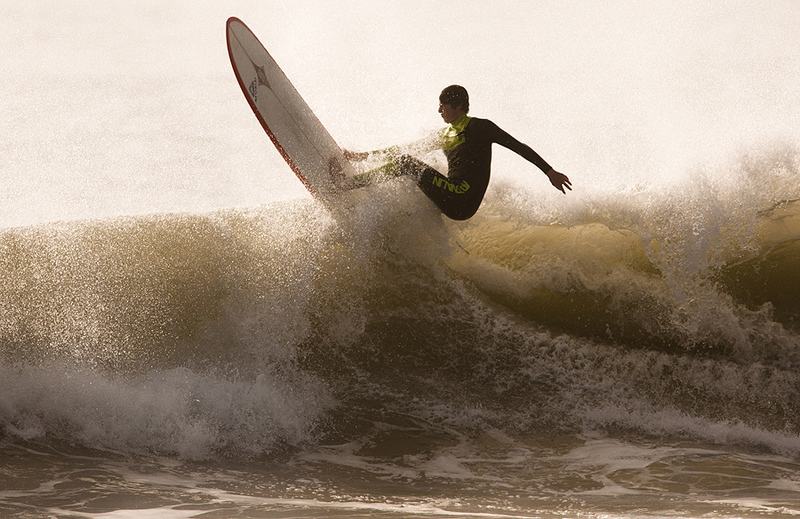 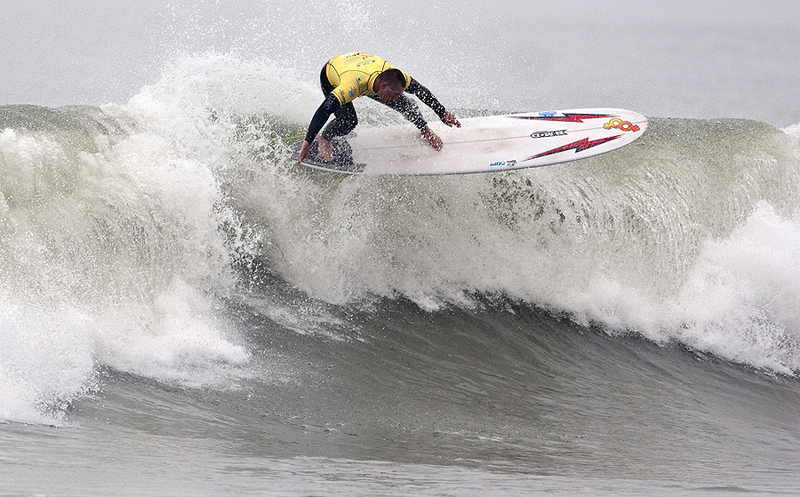 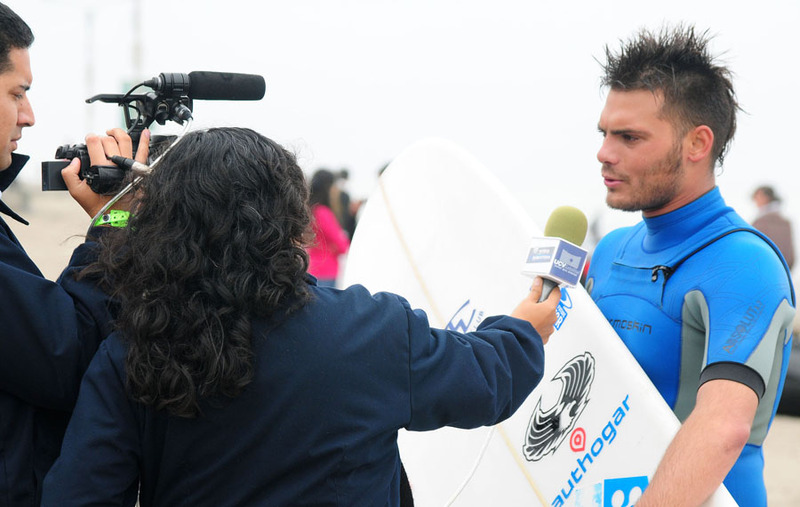 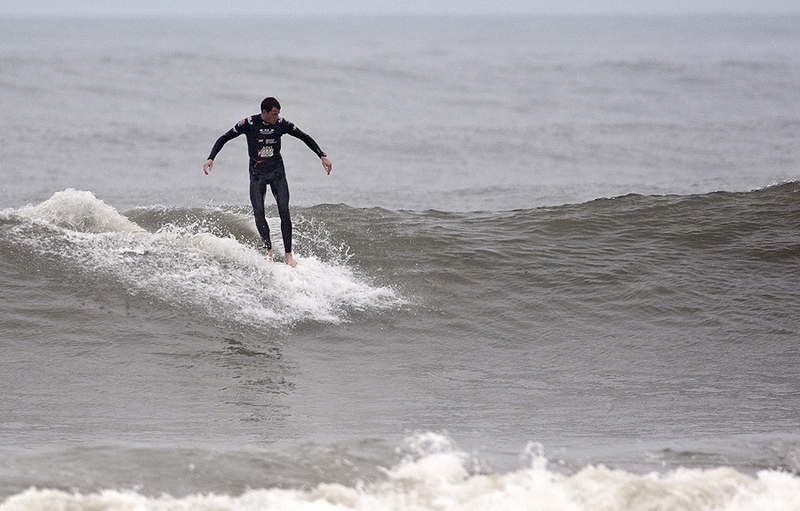 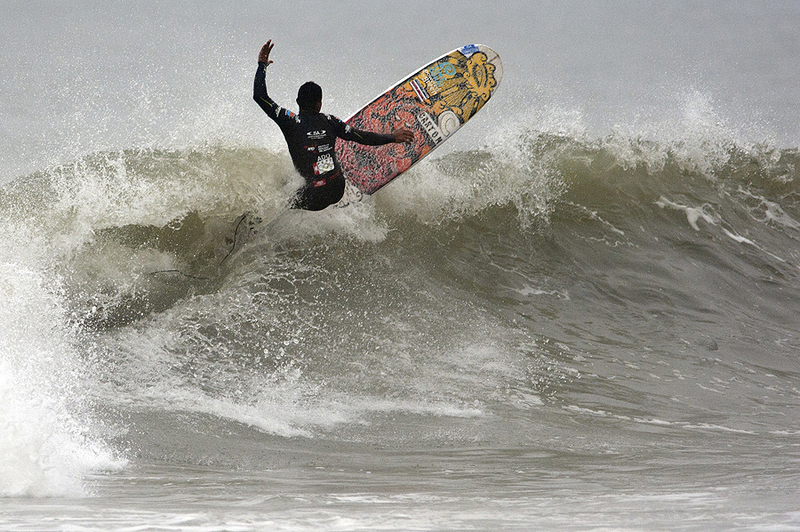 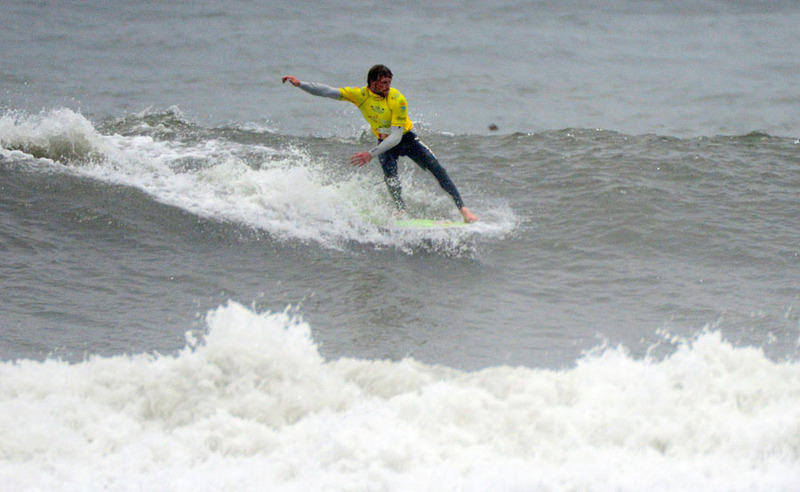 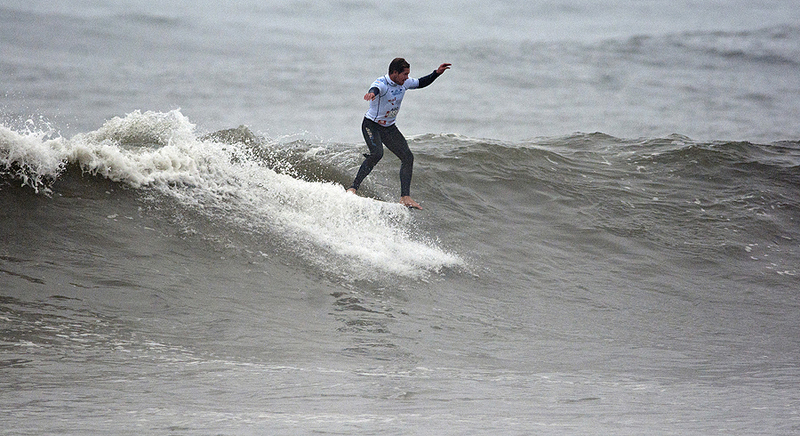 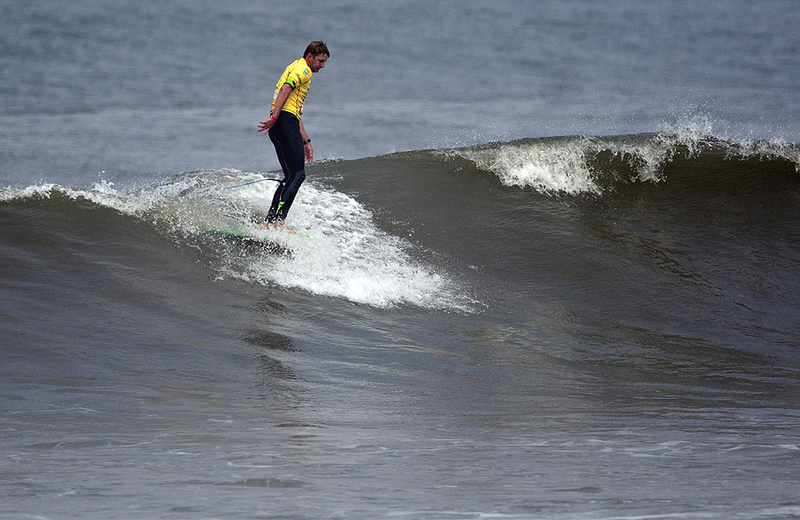 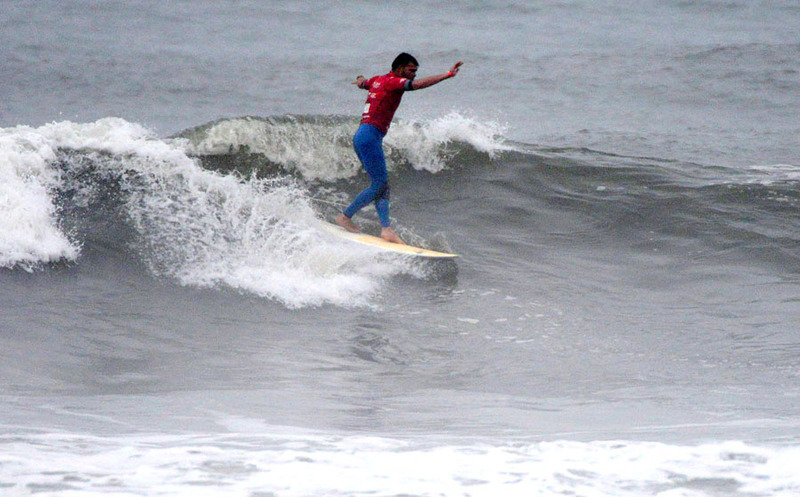 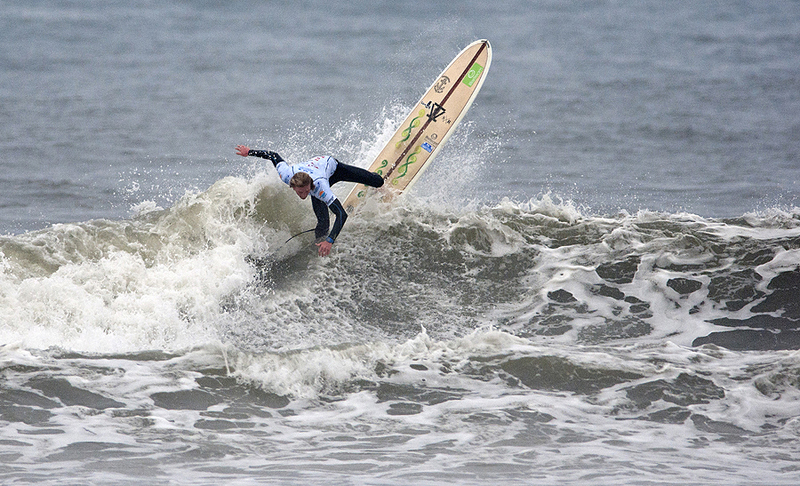 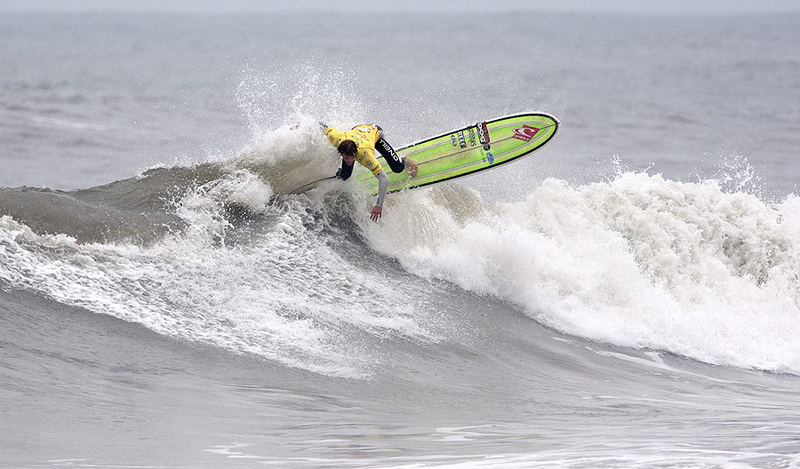 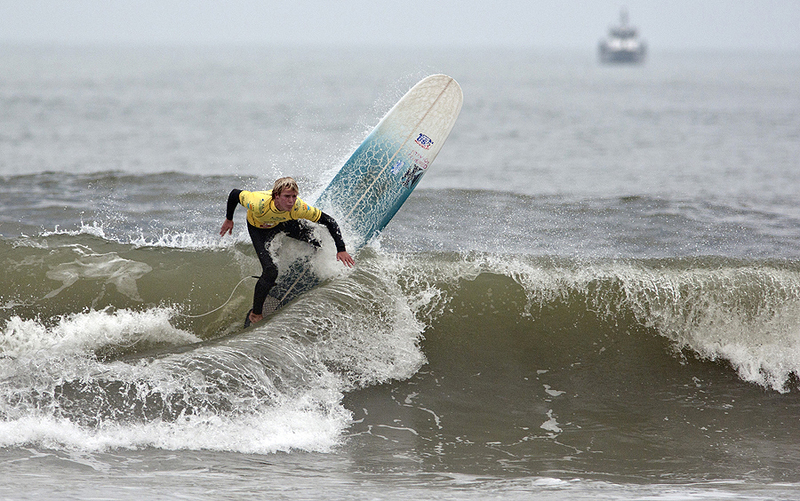 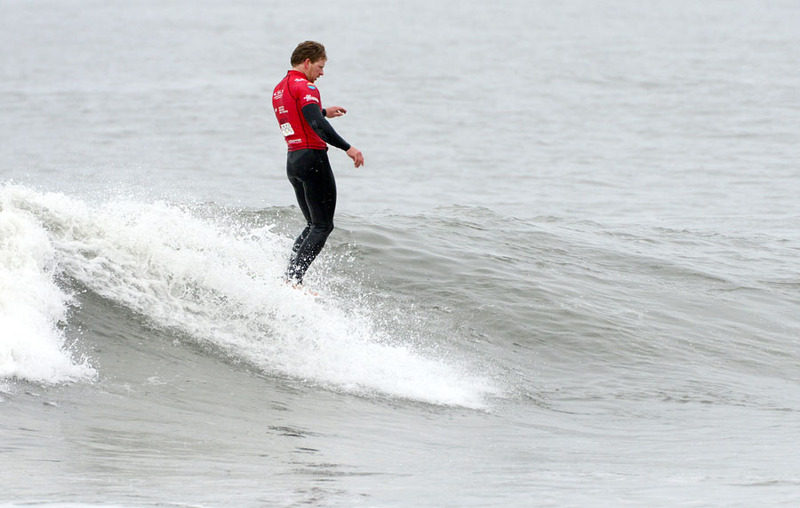 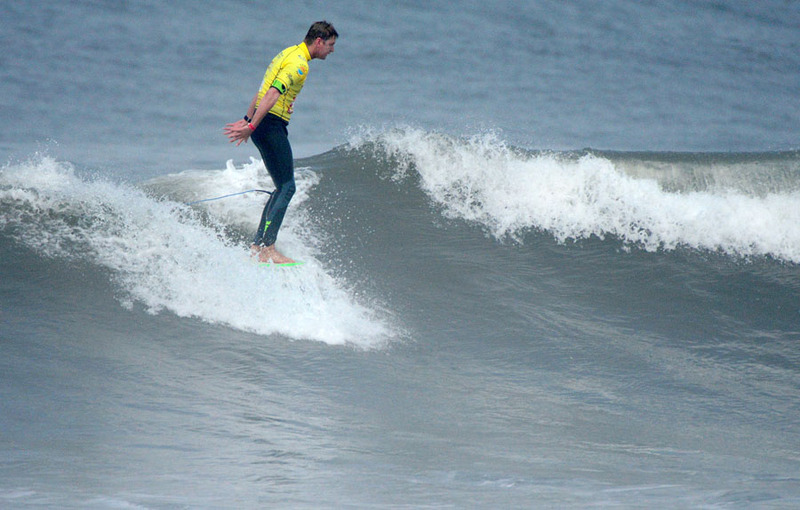 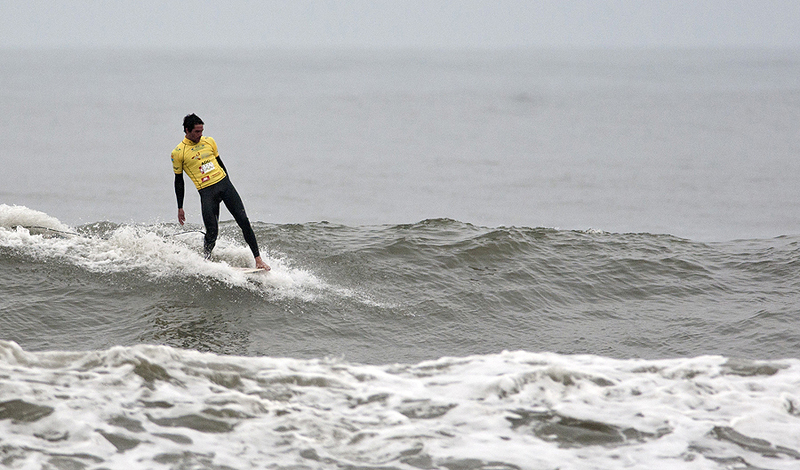 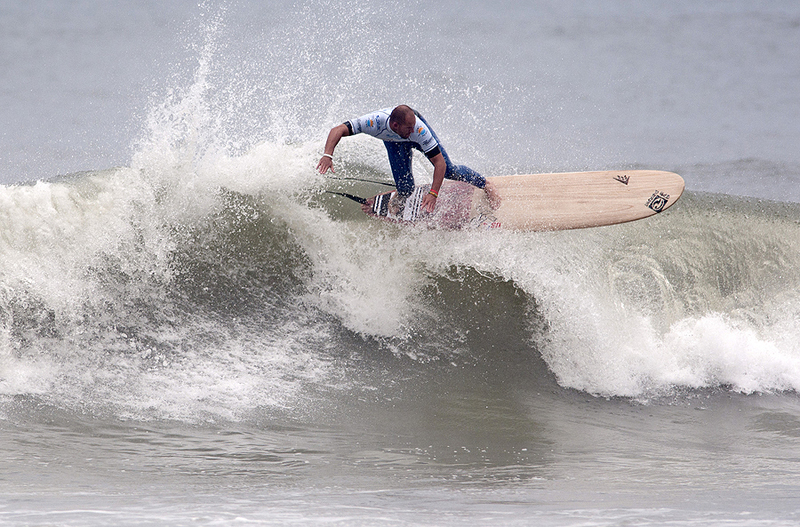 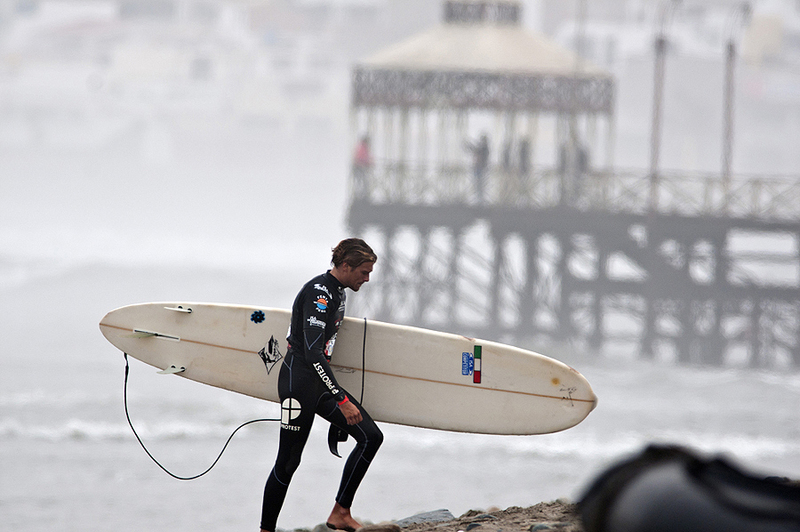 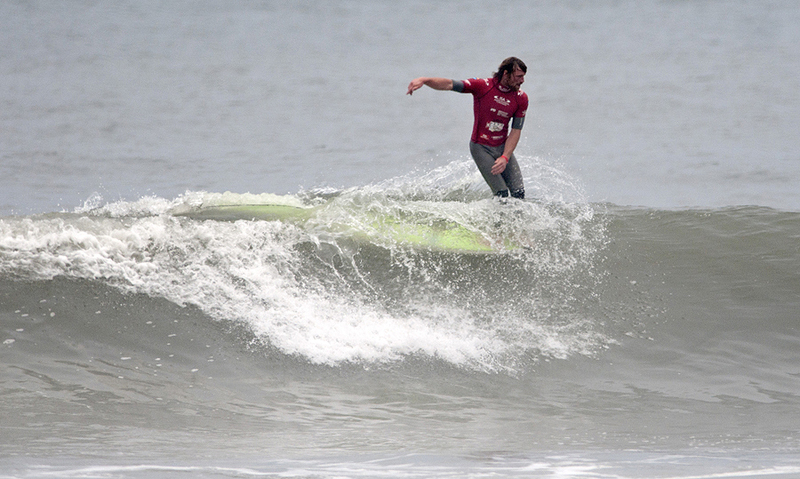 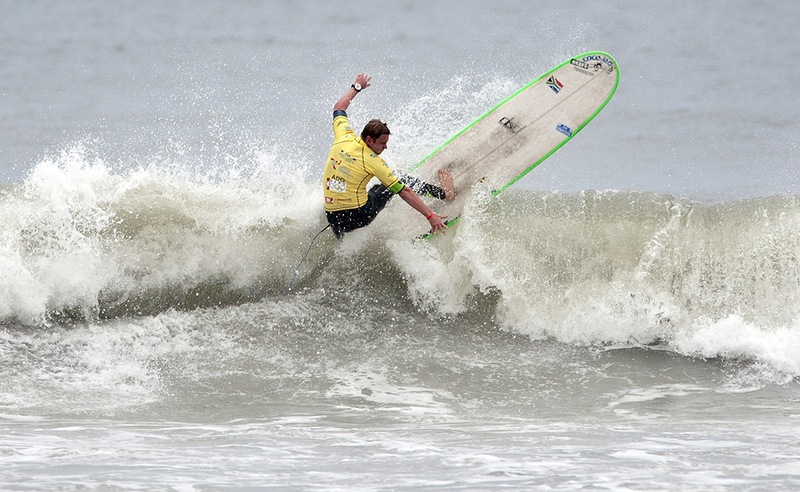 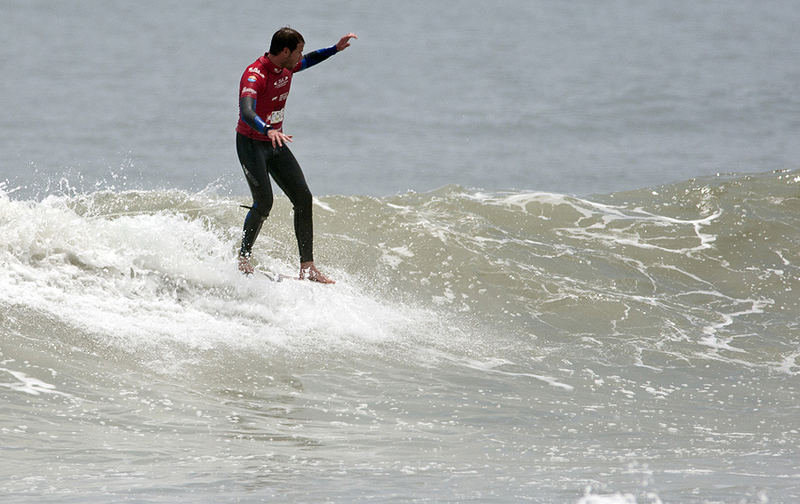 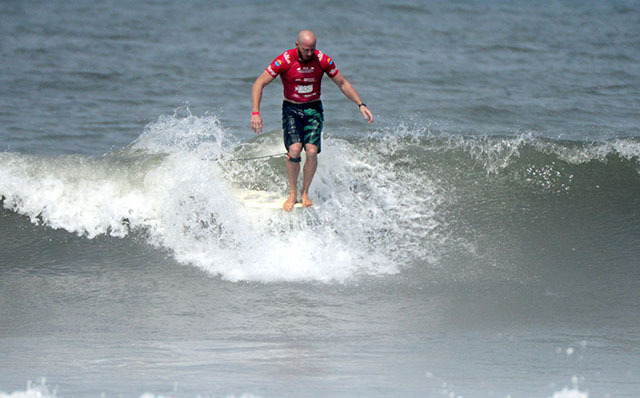 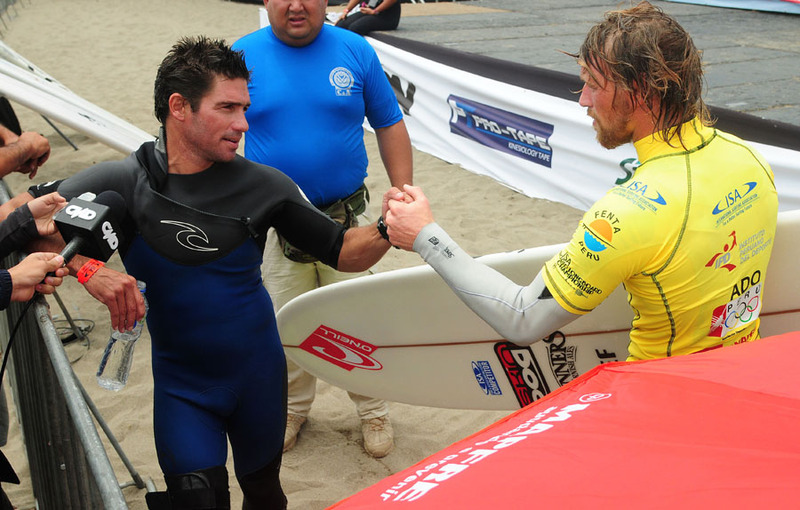 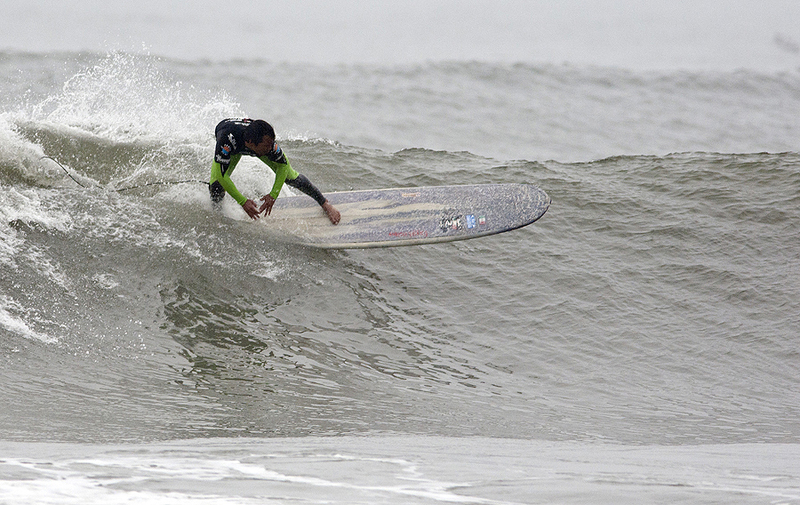 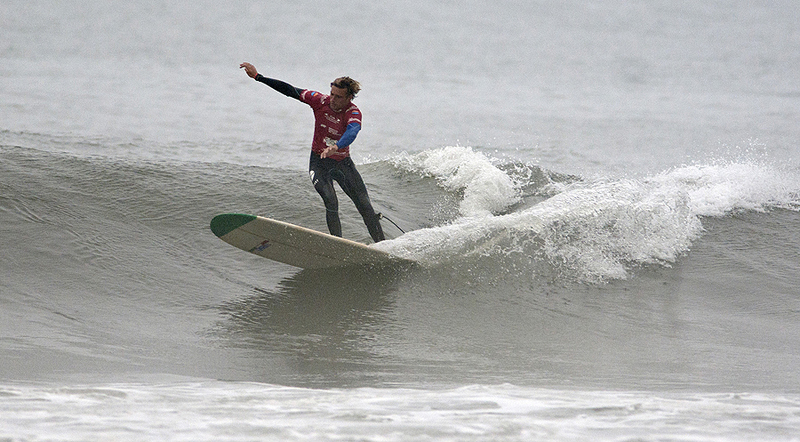 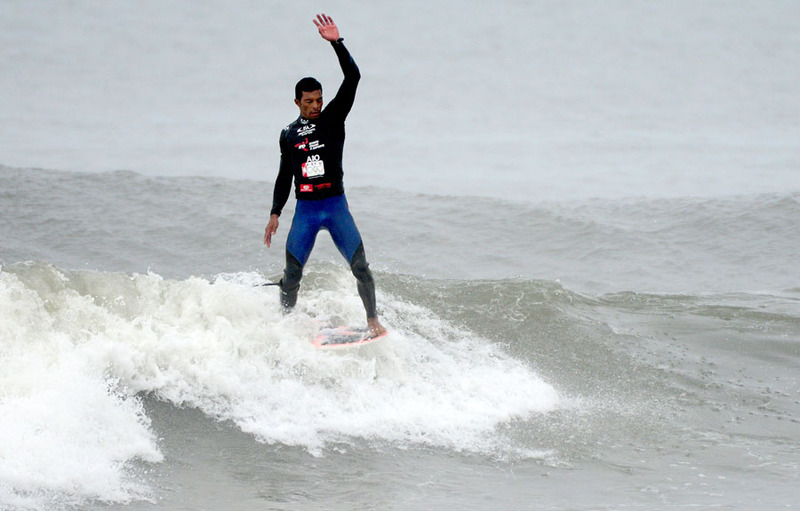 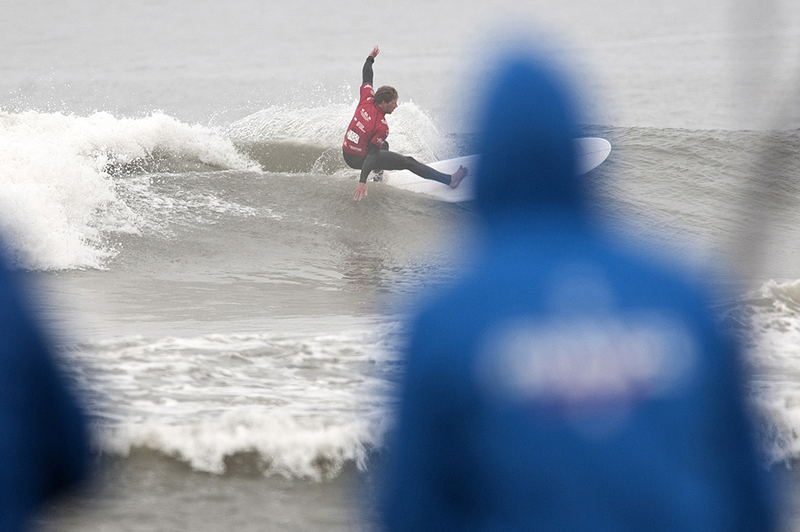 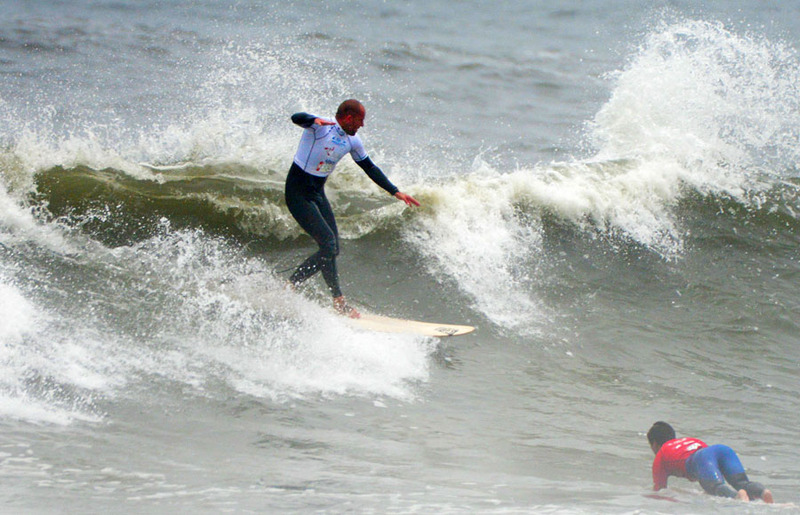 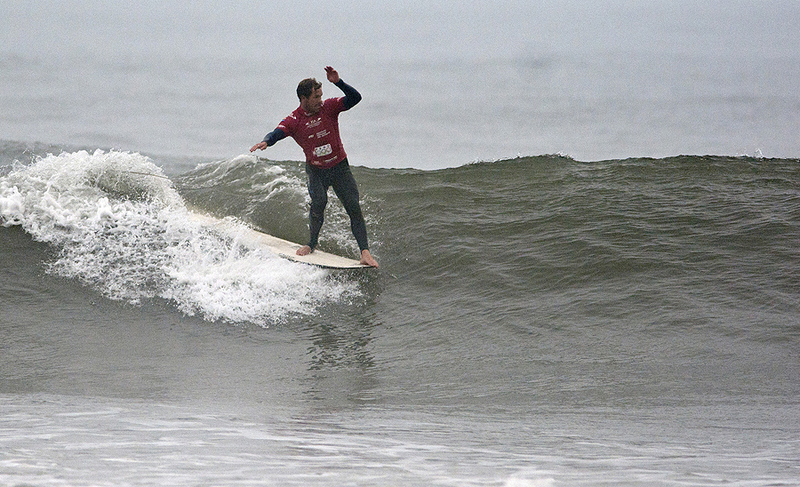 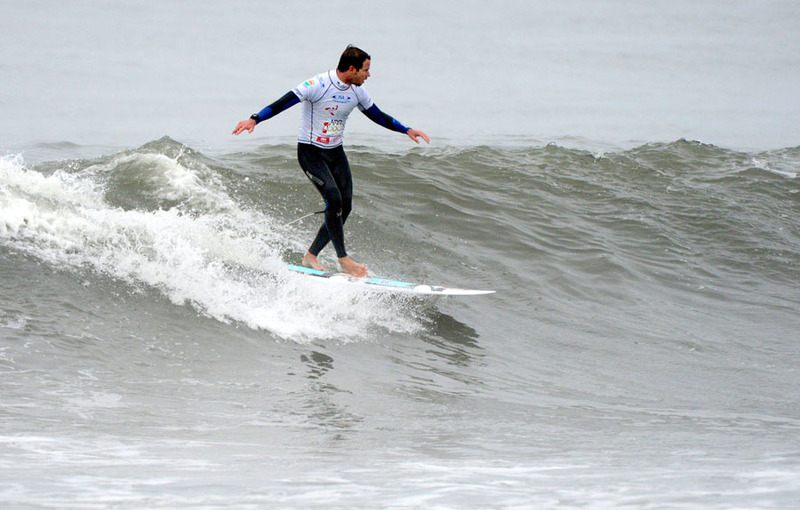 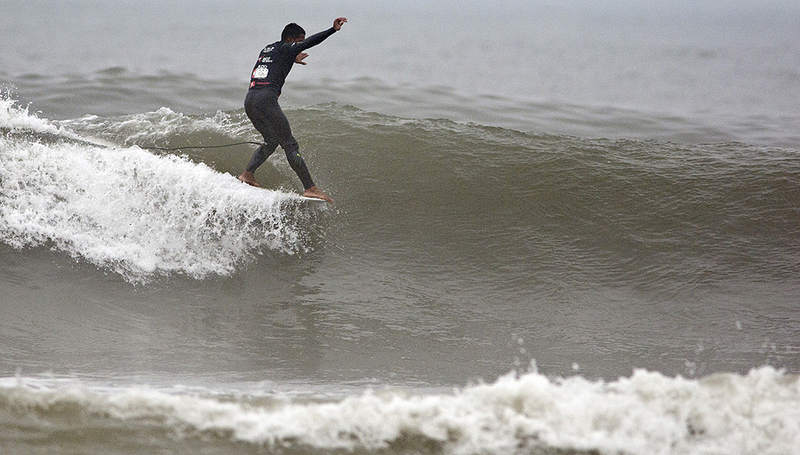 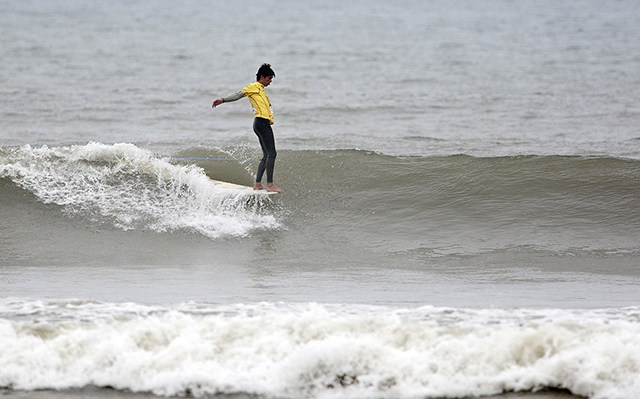 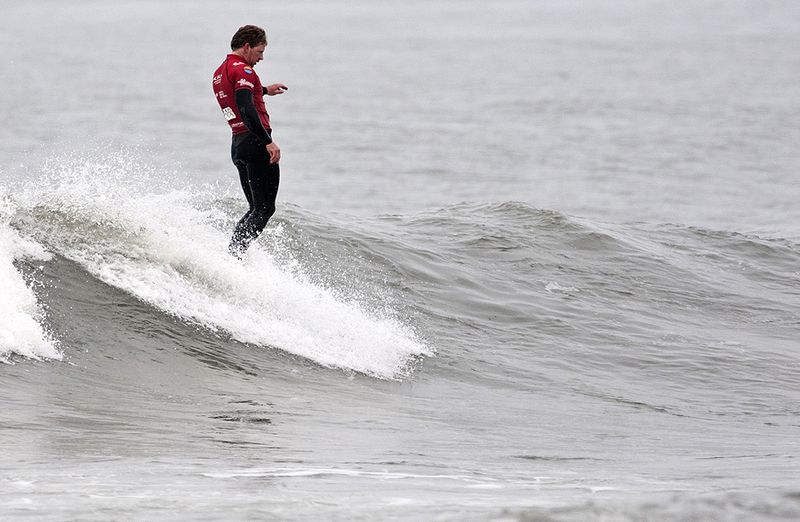 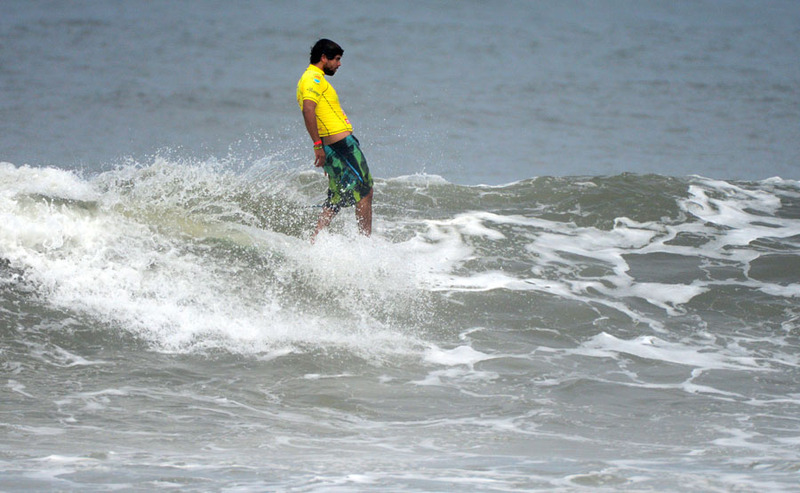 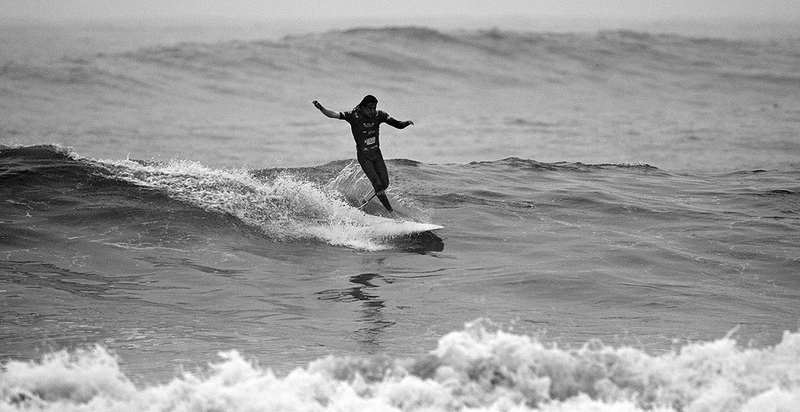 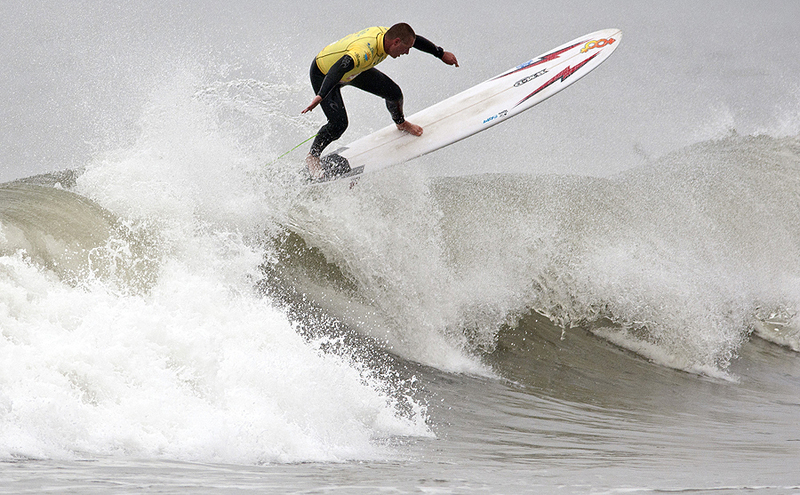 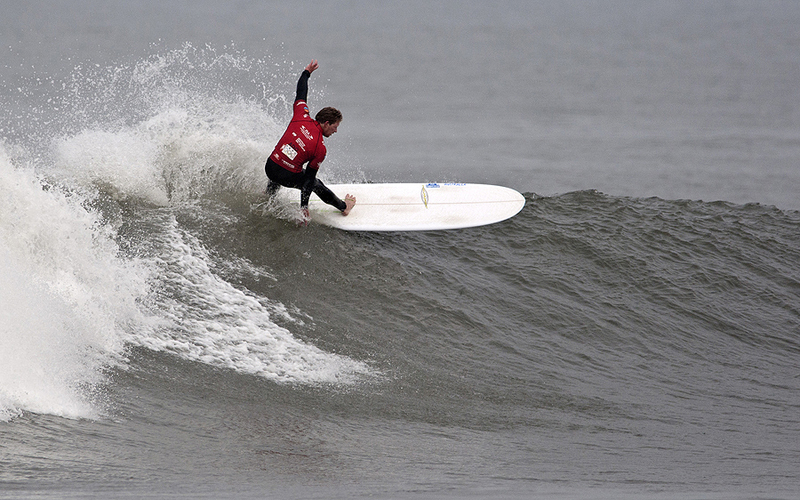 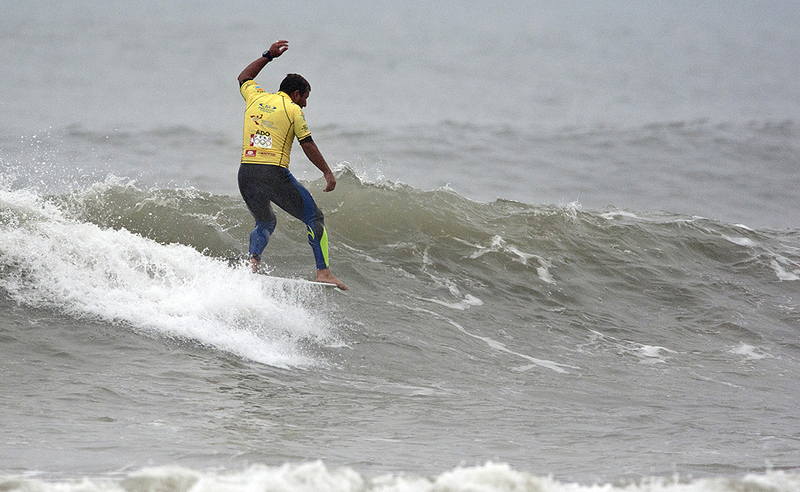 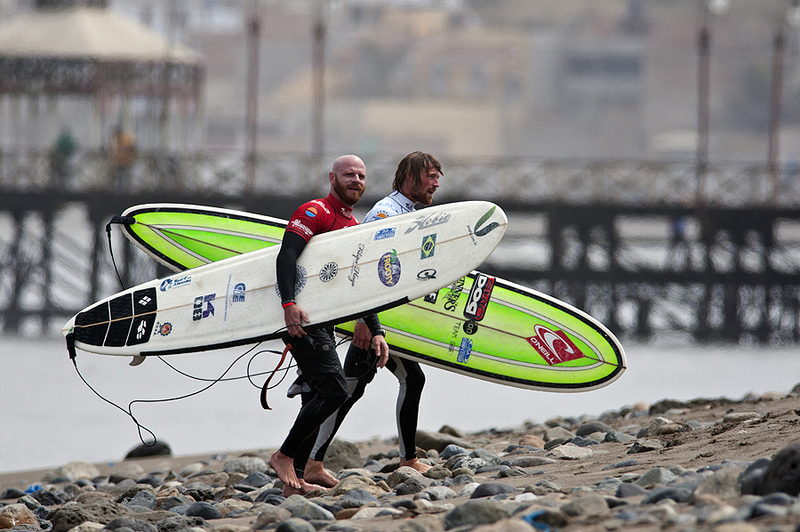 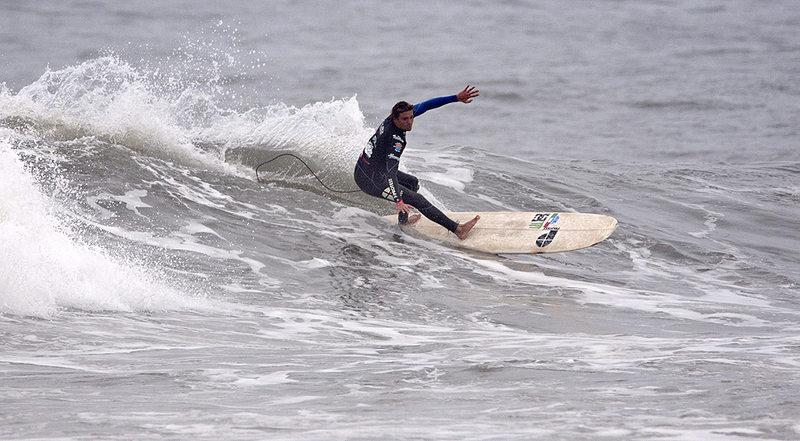 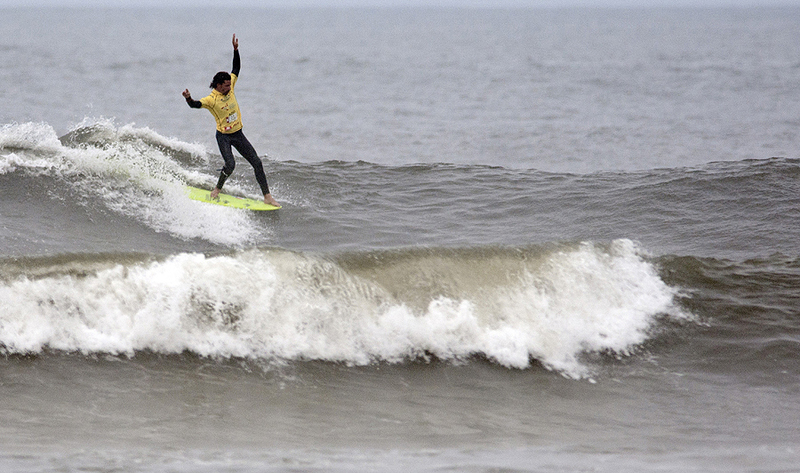 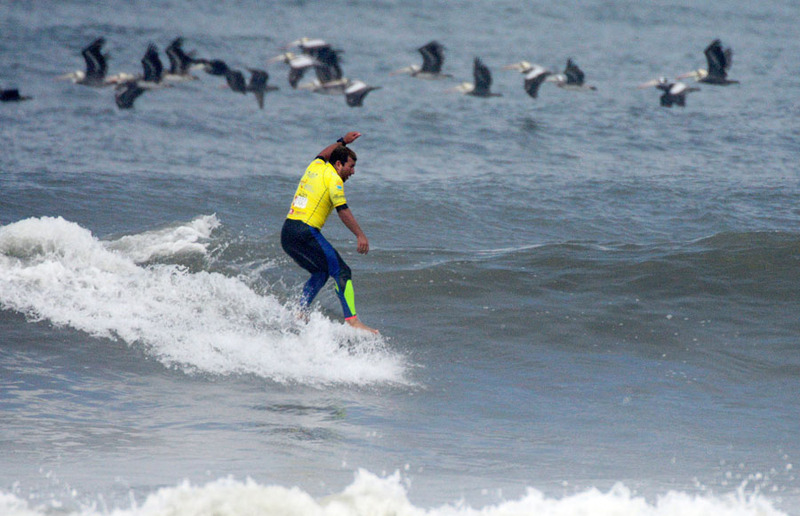 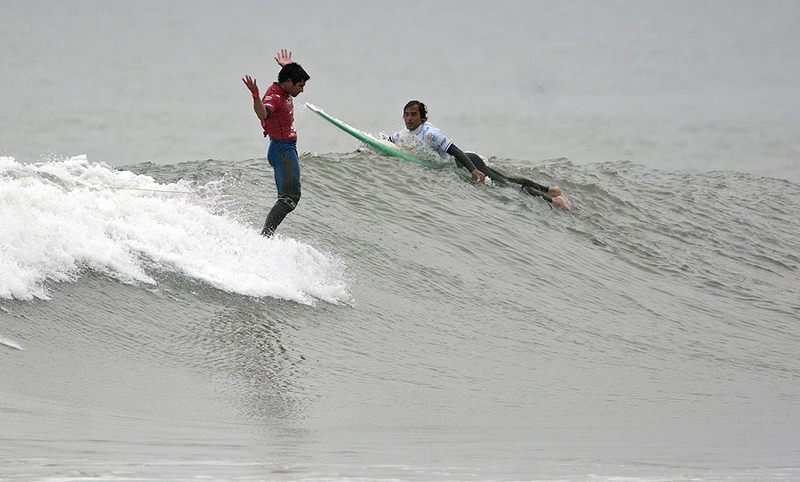 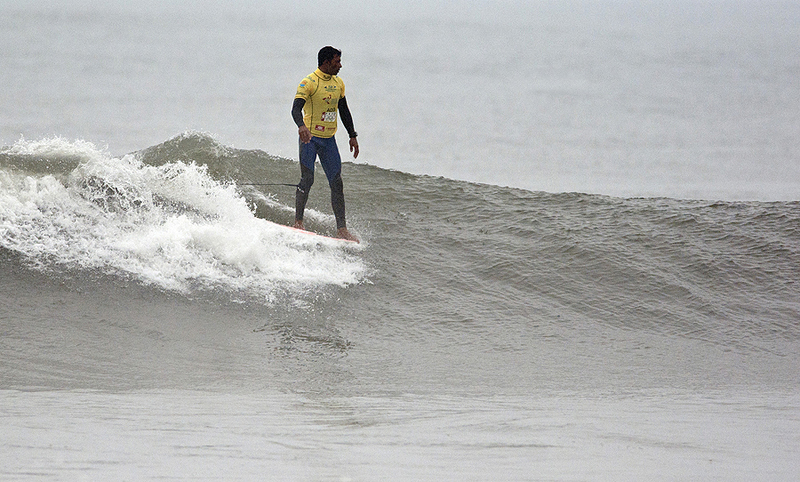 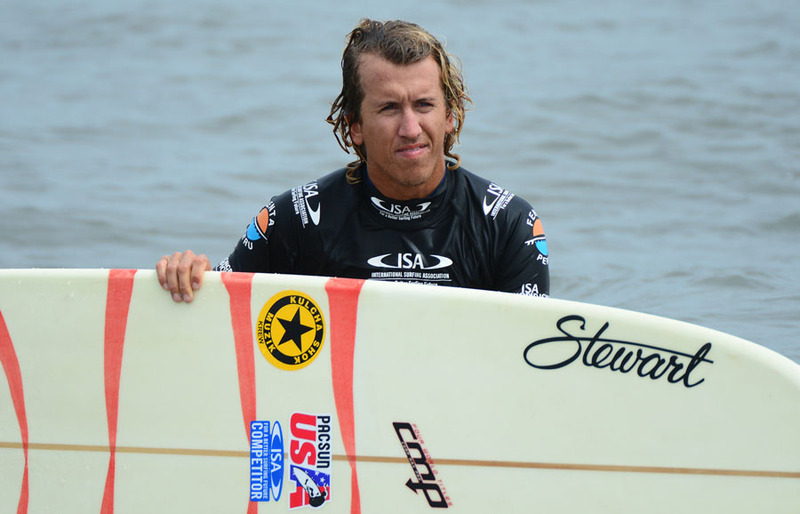 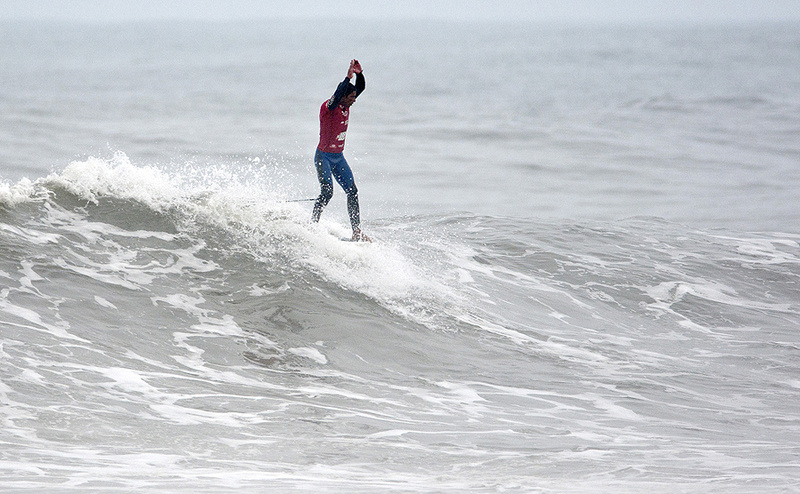 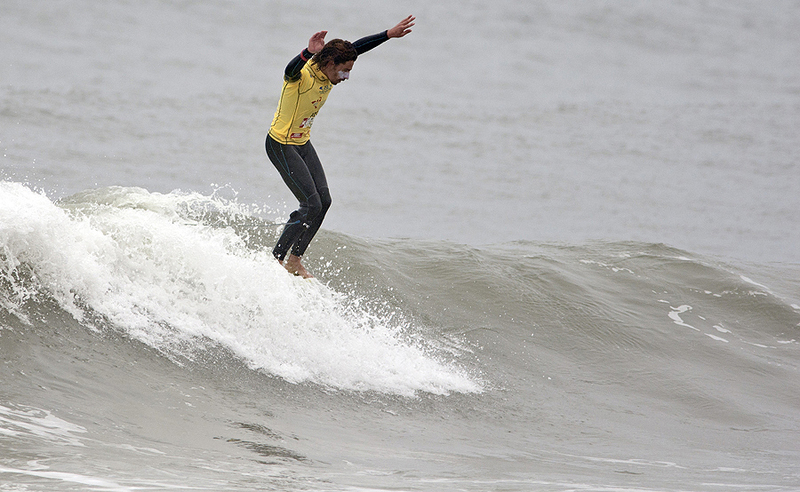 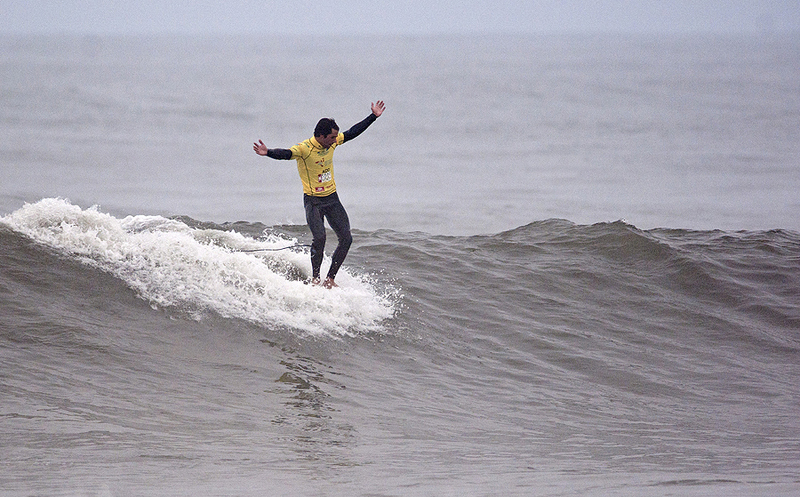 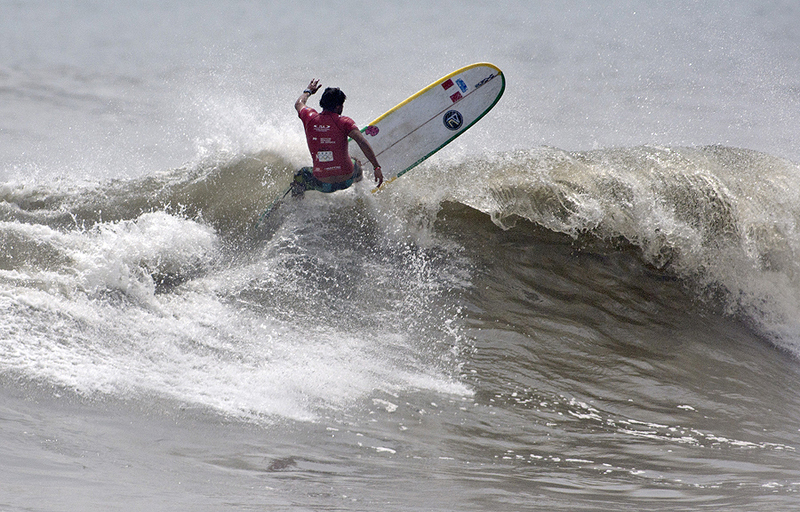 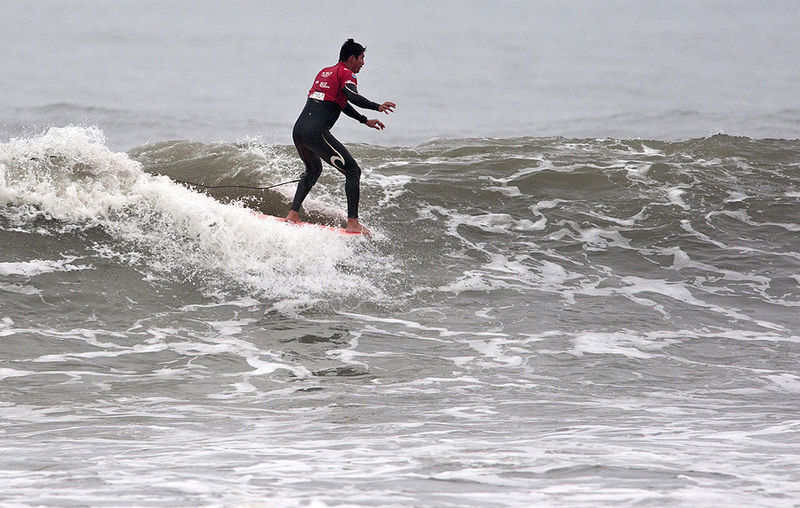 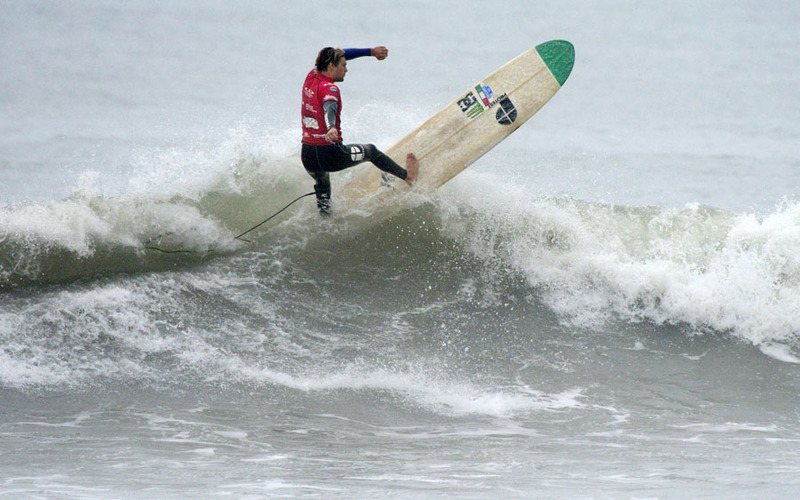 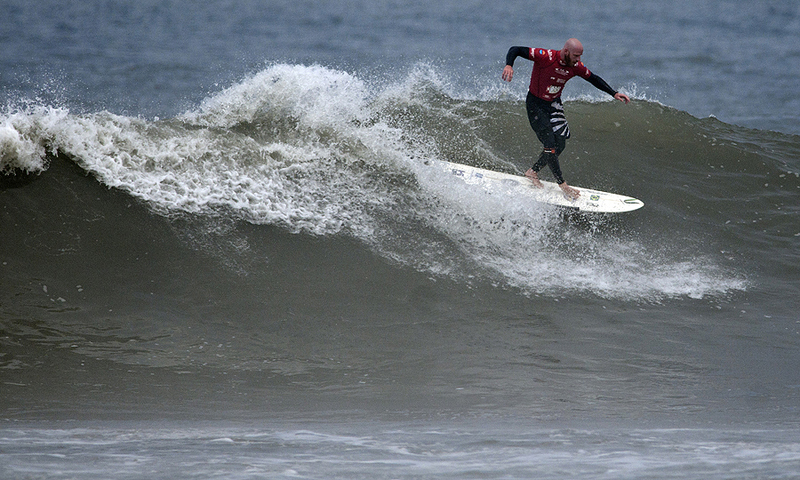 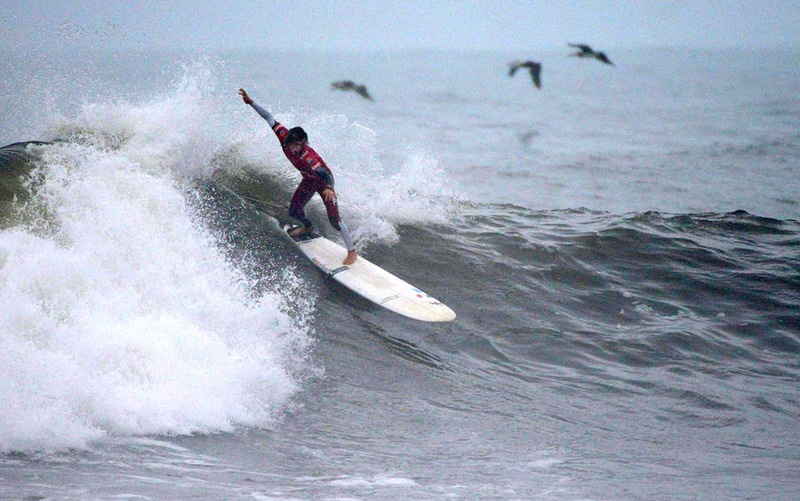 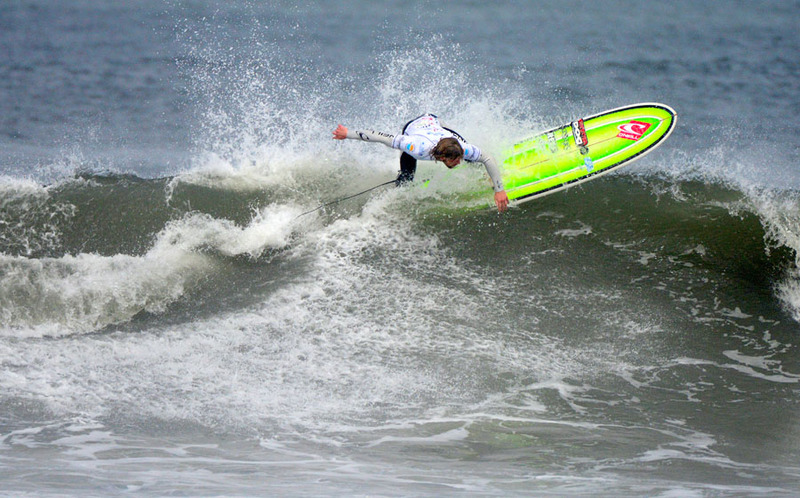 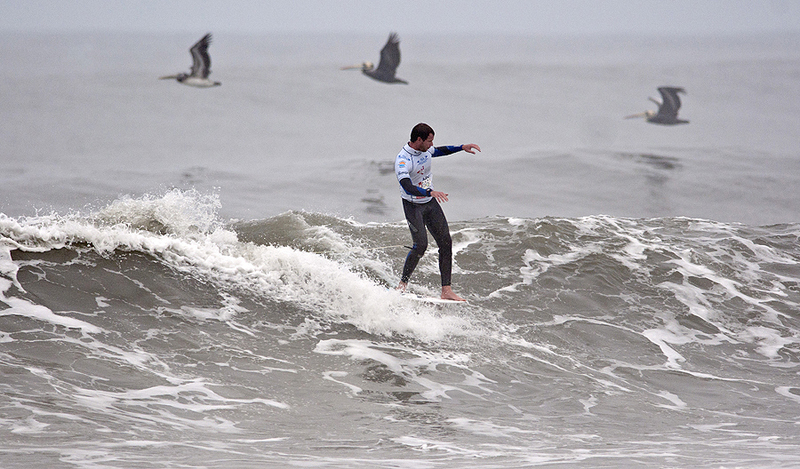 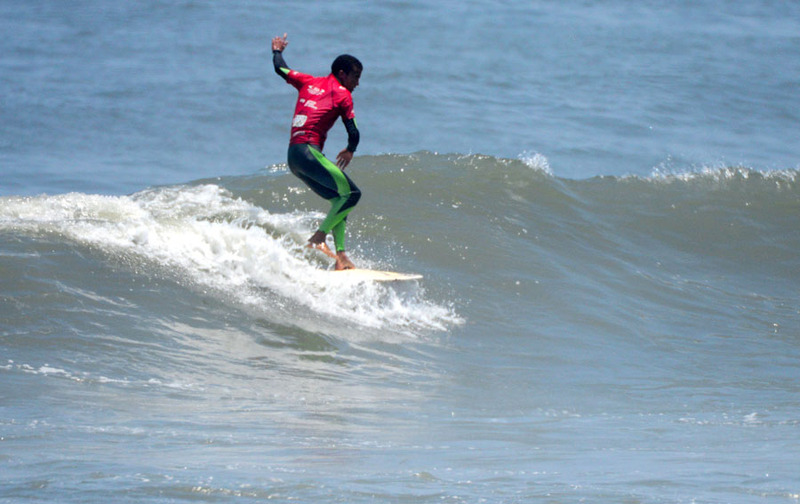 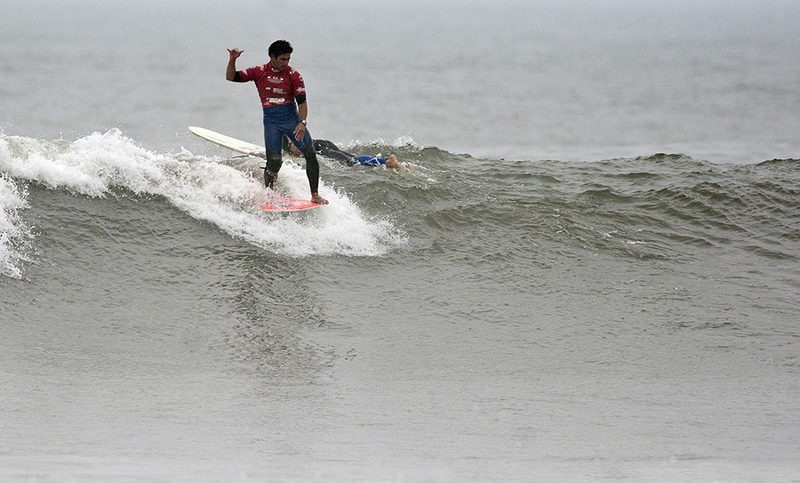 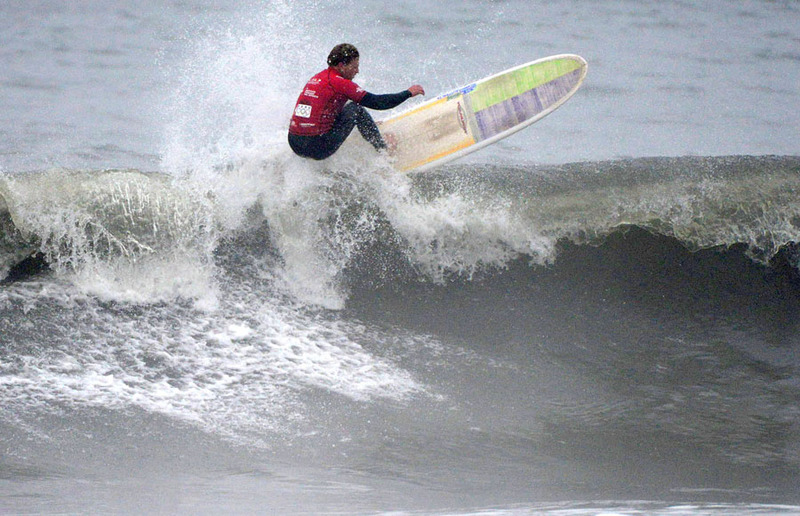 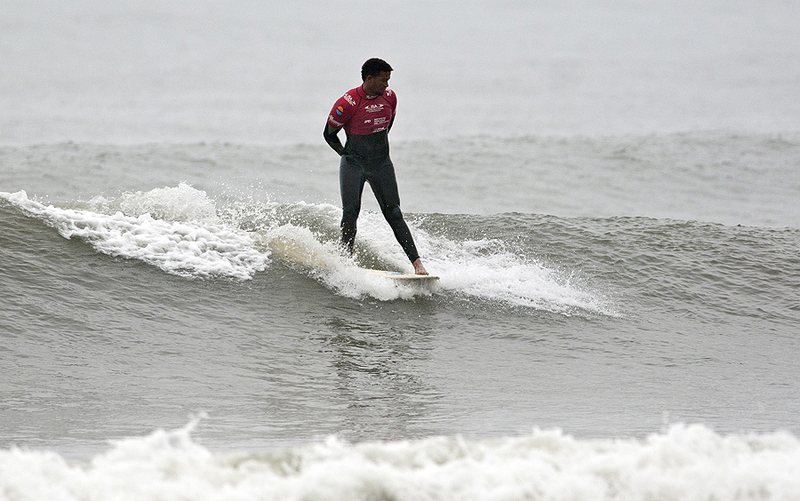 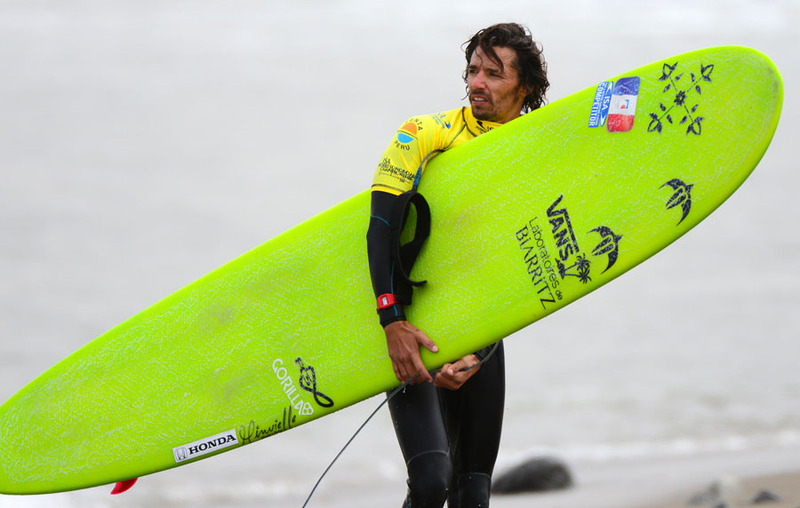 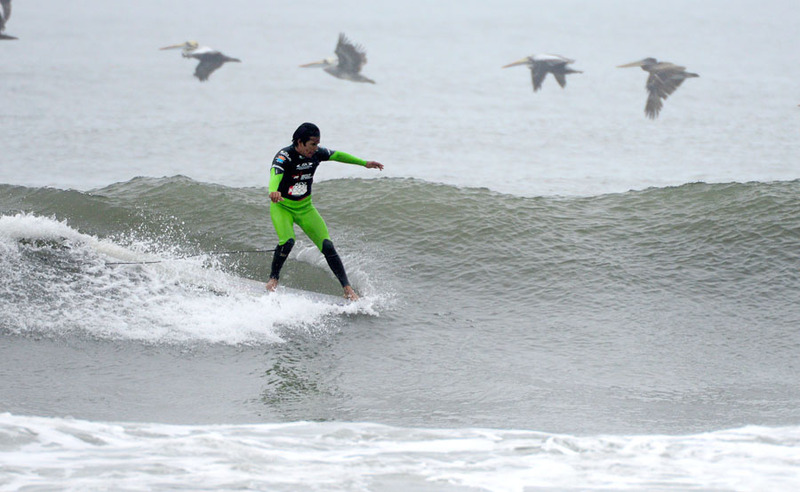 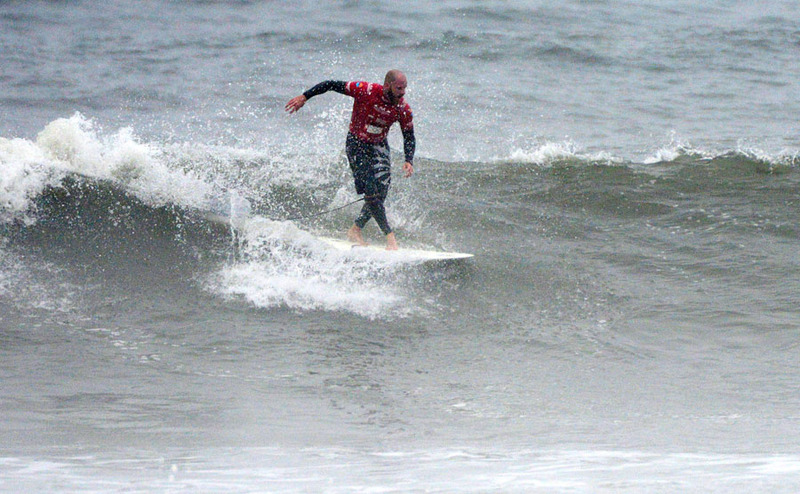 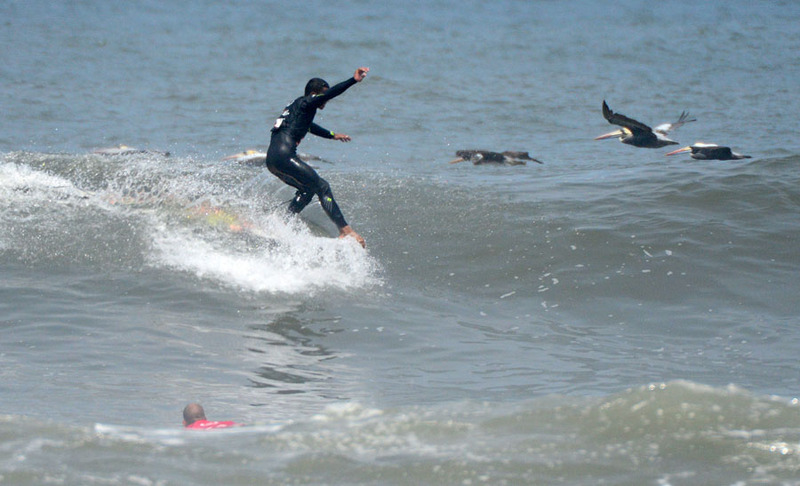 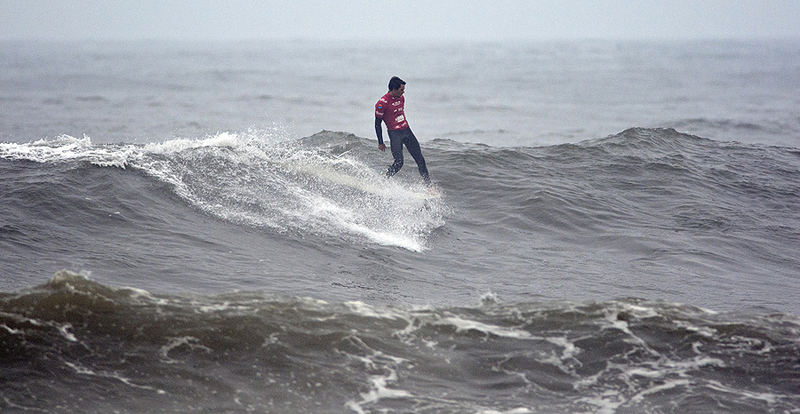 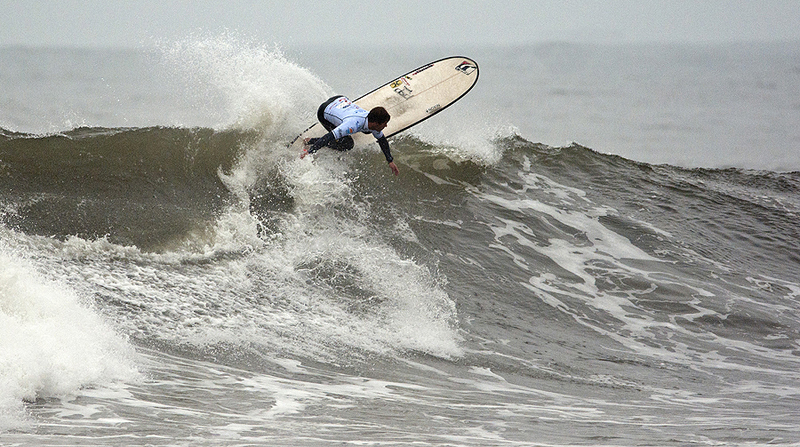 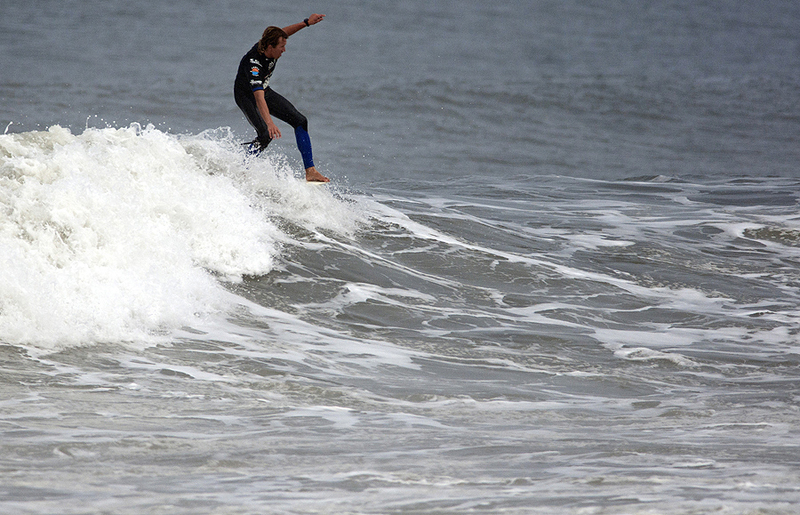 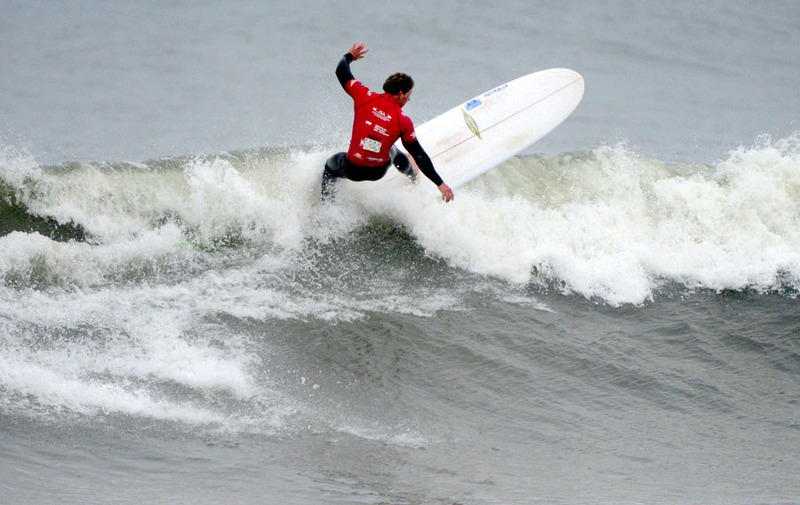 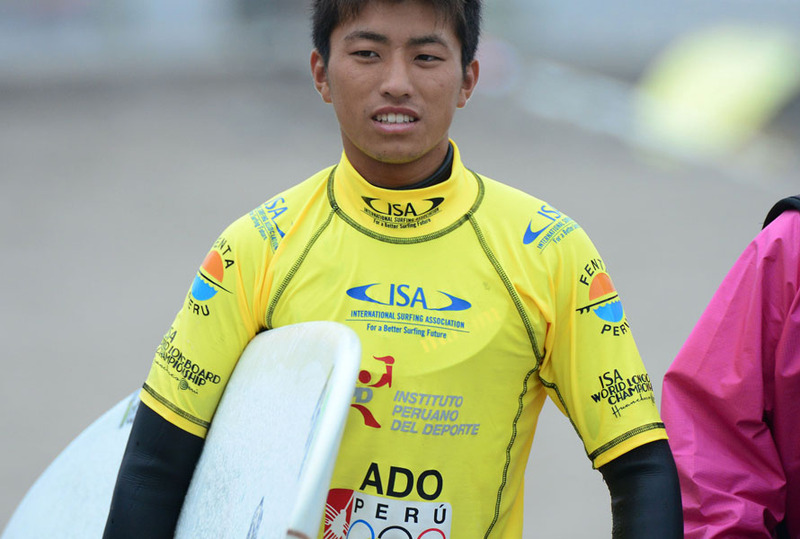 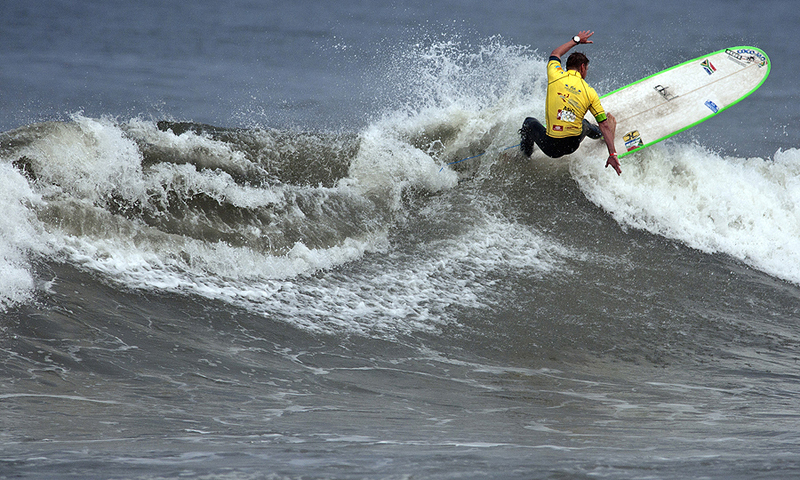 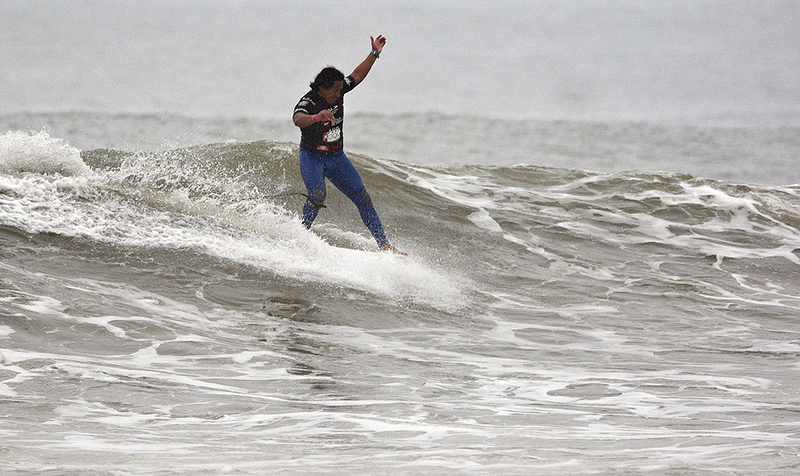 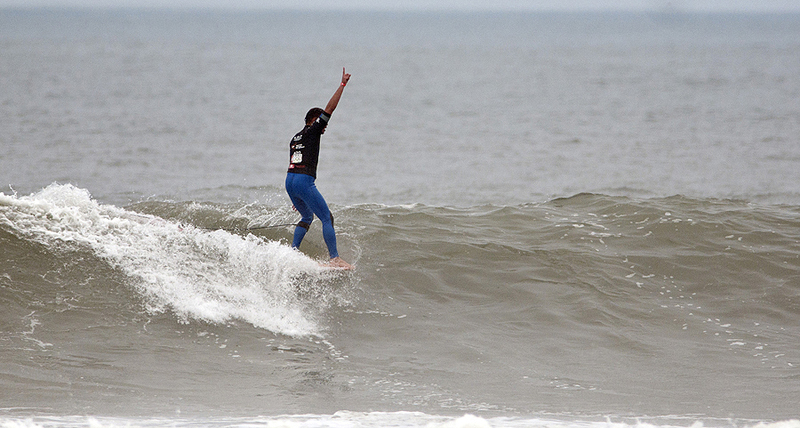 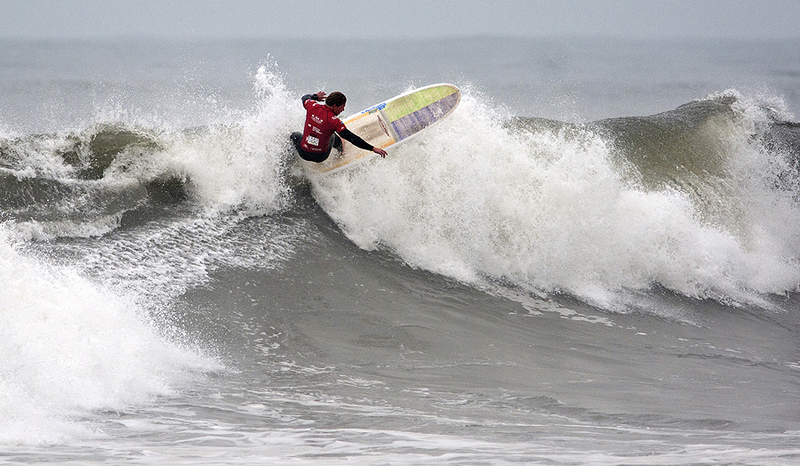 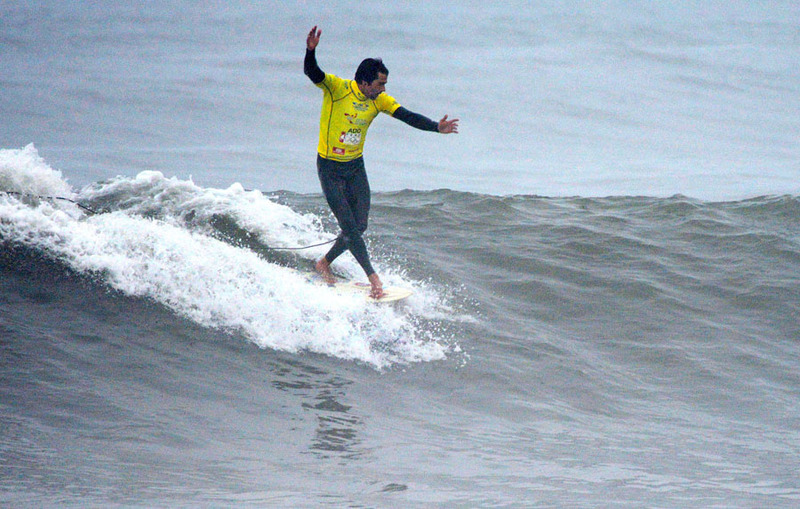 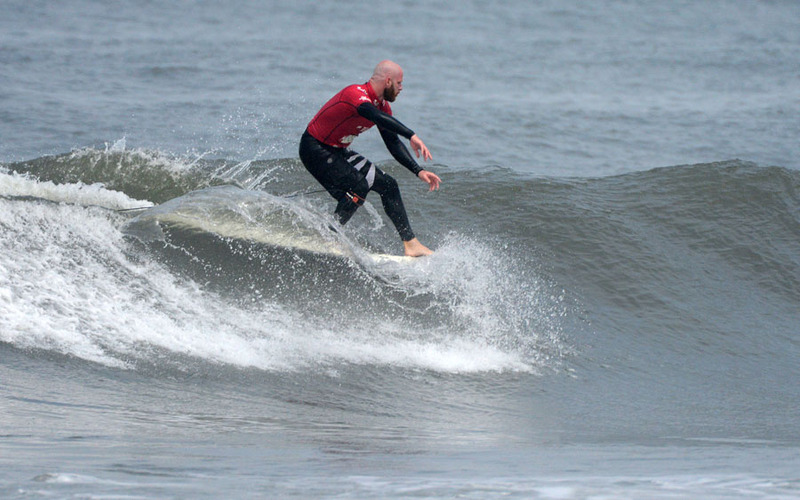 Amazing surfing continued during Day 2 of the ISA World Longboard Championship in Peru. 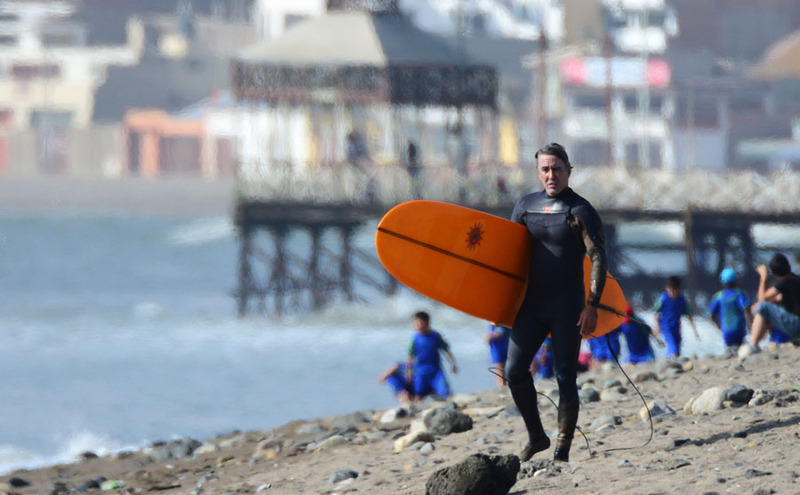 Surf conditions improved at the historic Huanchacho pointbreak, as the swell became more manageable and organized in the 3-5 foot range. 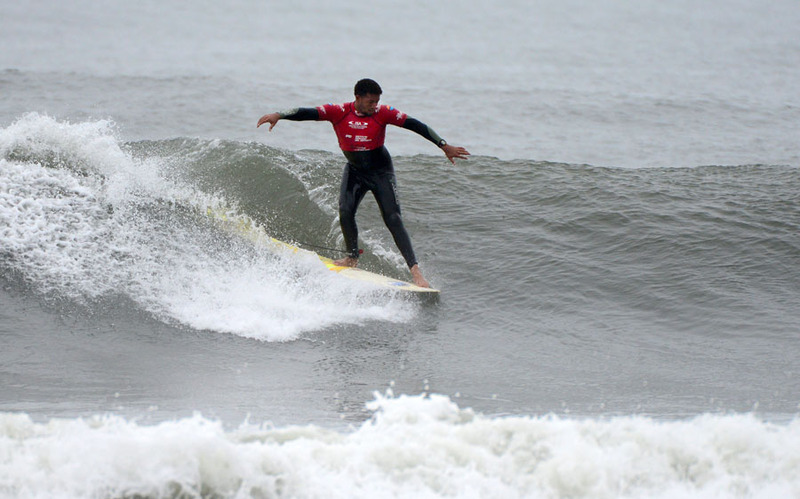 The world’s best longboarders took advantage of the improved conditions and put on an amazing display of traditional and high-performance longboarding. 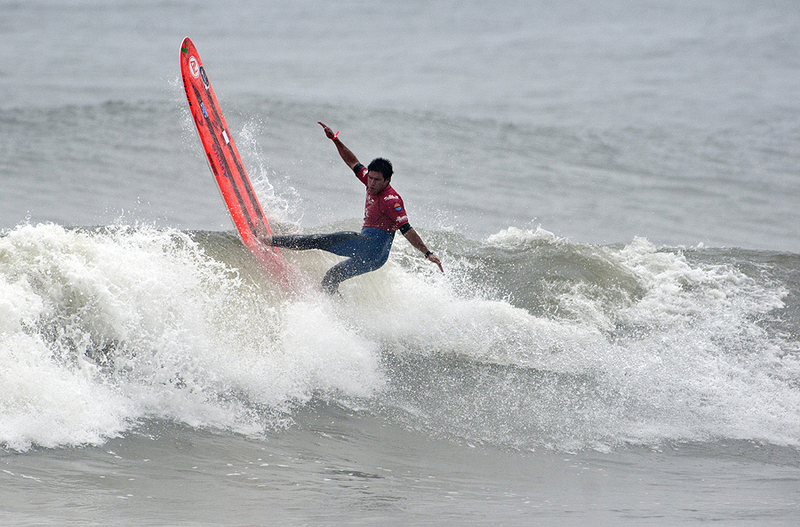 Day 2 featured Qualifying Round 2 for Open Men, Open Women, Junior Under-18, and Round 1 of the Open Men’s Repechage. 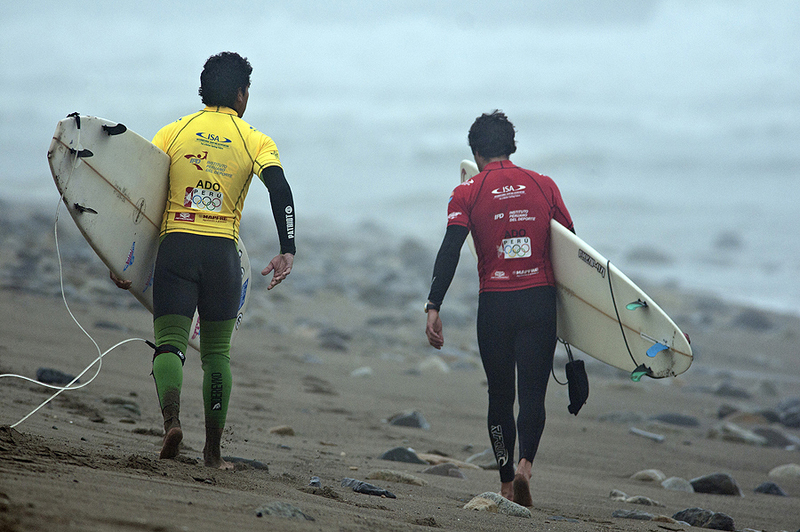 This is a do-or-die round; if a surfer gets 3rd or 4th place, he or she is out of the contest. 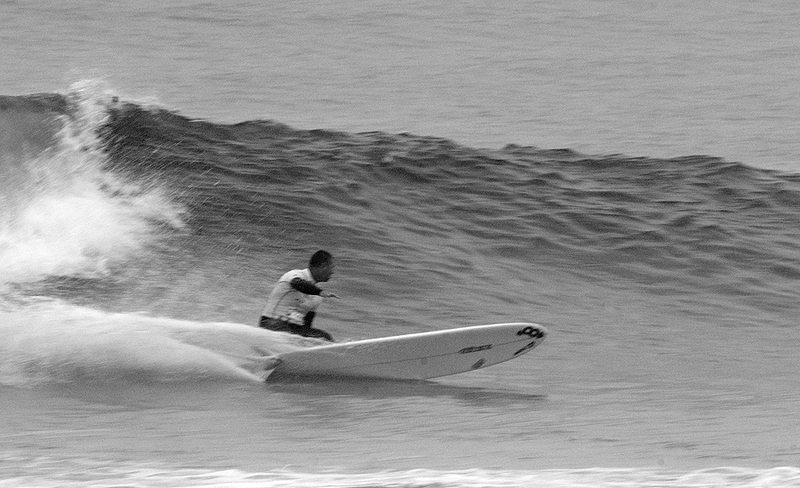 In the second Qualifying heat of the morning, when conditions were glassy and near perfect, Hawaii’s Ned Snow, put on a display of power and flow, delivering the competition’s highest total heat score of 17.27. 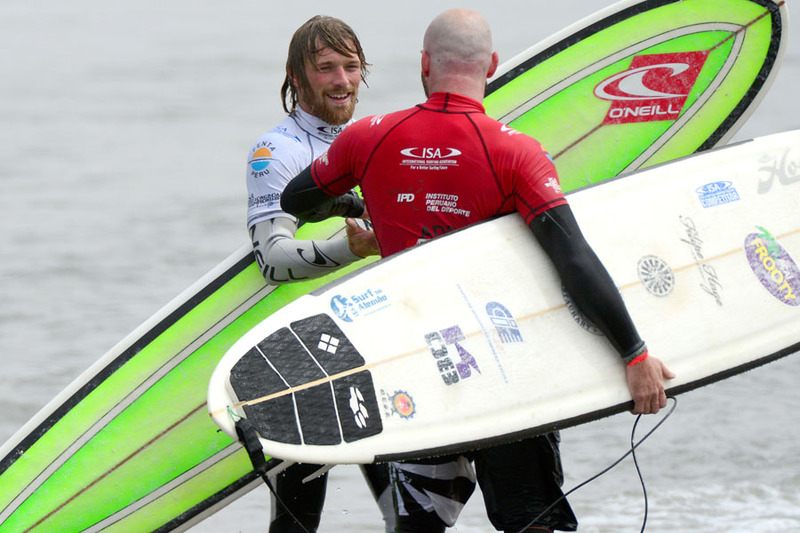 Snow defeated Edouard Delpero (FRA, 13.27), Ian Bell (AUS, 9.13), and Anthony McColl (NZL, 8.67), sending Bell and McColll to the Repechage round. 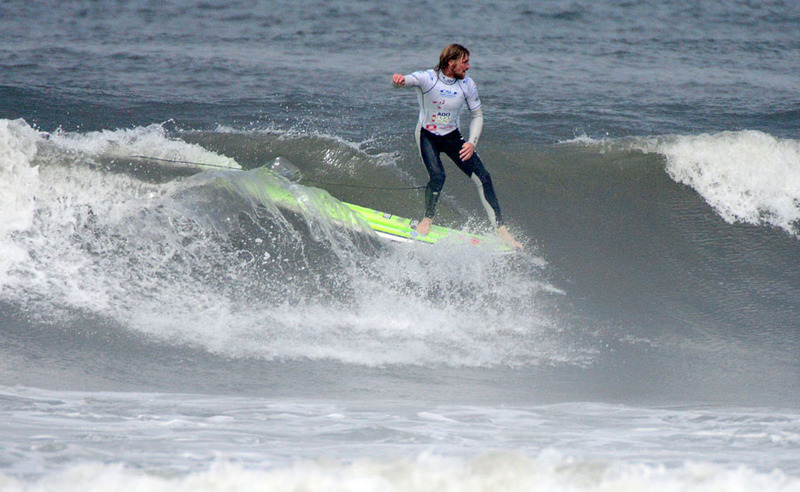 Other standouts in the Open Men’s were Great Britain’s Ben Skinner, France’s Antoine Delpero, and South Africa’s Thomas King, all advancing in 1st place in their respective heats into Qualifying Round 3. 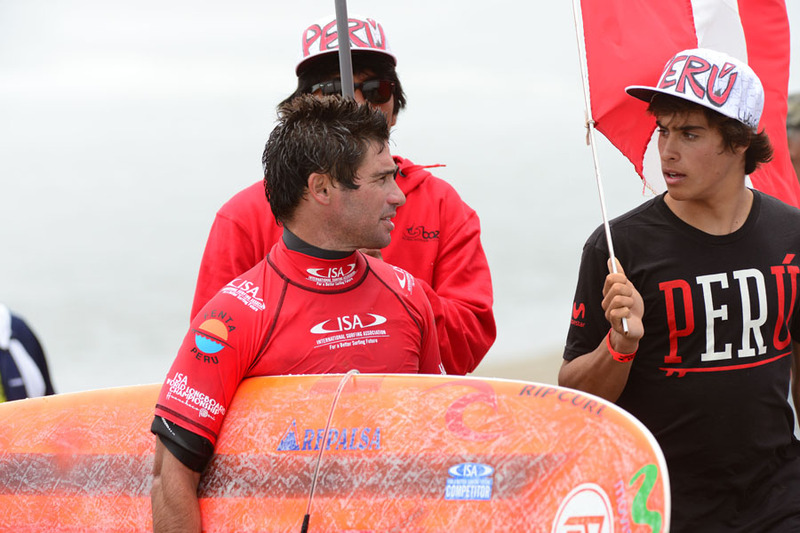 A big upset of the day was the defending champion, Toni Silvagni (USA), who placed 4th, forcing him into the do-or-die Repechage round. 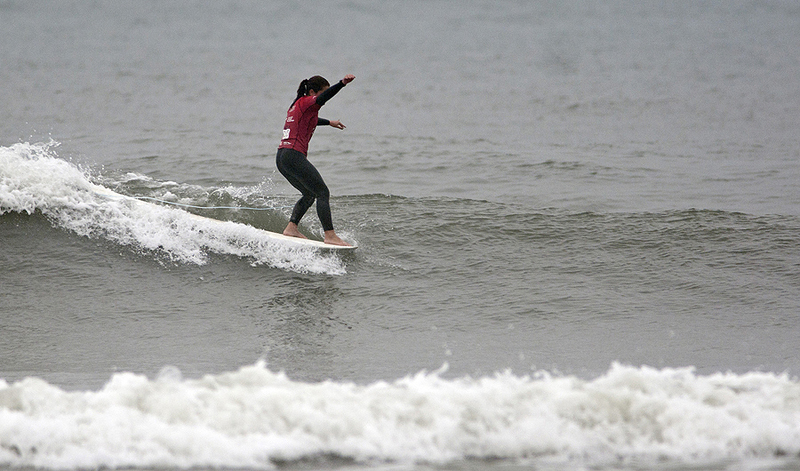 Up next were the Open Women’s Qualifying. 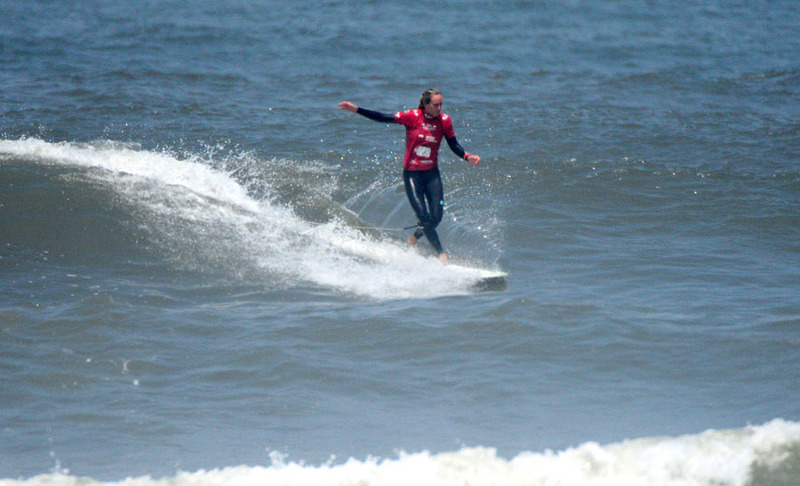 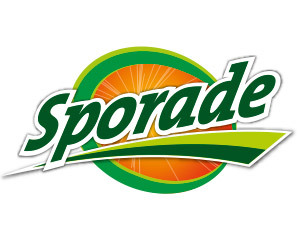 The standout of the division was South Africa’s Simone Robb, who gracefully rode the long waves of Huanchaco earning the highest Women’s heat score of the day 13.33, defeating Justine Dupont (FRA, 12.07), Karen Mendiguetti (PER, 10.84) and Rachael Tilly (USA, 8.50). 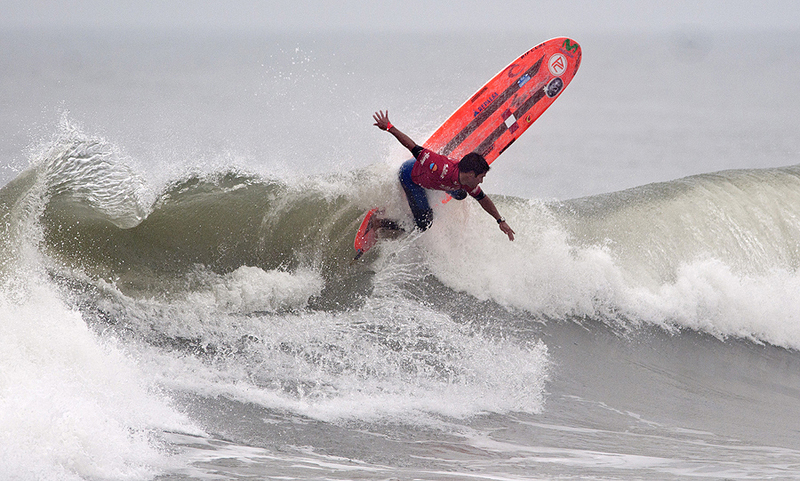 In the Junior’s Qualifying, Brazil’s Caio Santana dominated his heat, earning a 14.50, defeating Honolua Blomfield (HAW, 9.67), Surfier Gil (ARG, 8.03) and Jordan Griffin (NZL, 7.67). 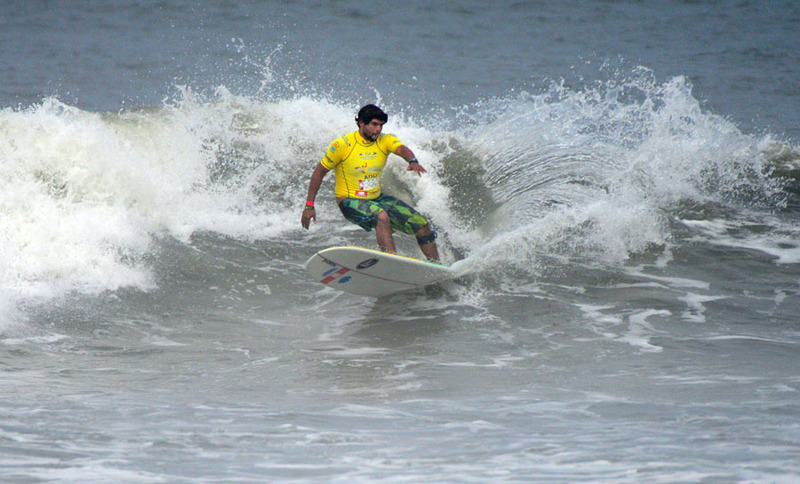 To finish the competition for the day, the first heats of Open Men’s Repechage hit the water, where the first surfers of the competition were eliminated. 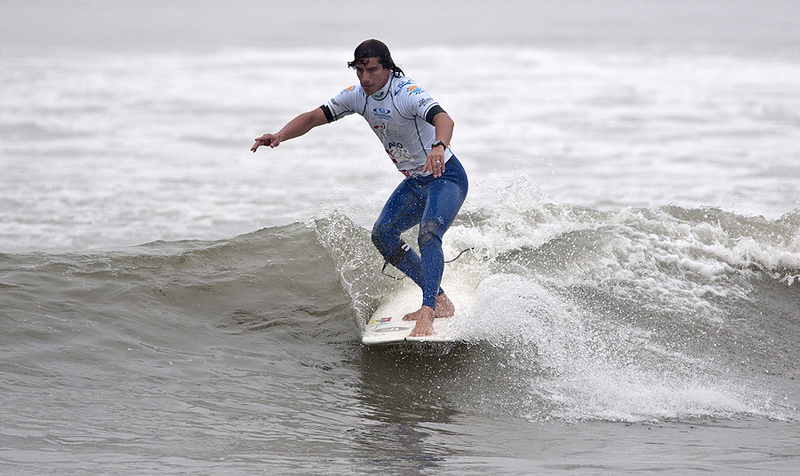 Surviving through this round in dominant form was the Italian surfer Alessandro De Martini who earned 11.2, defeating Guaili Ramirez (PUR, 8.9) and sending home Yuki Nakaya (JPN,7.16). 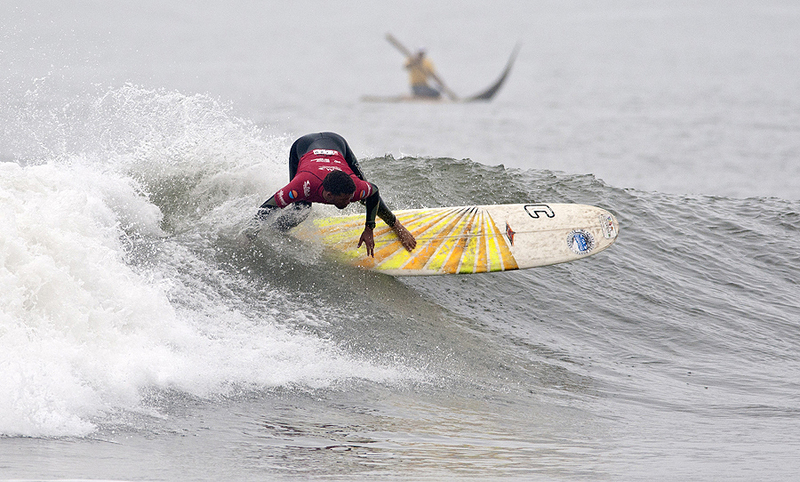 The 2013 ISA World Longboard Championship resumes Wednesday at 7:40am with The Morning Show. 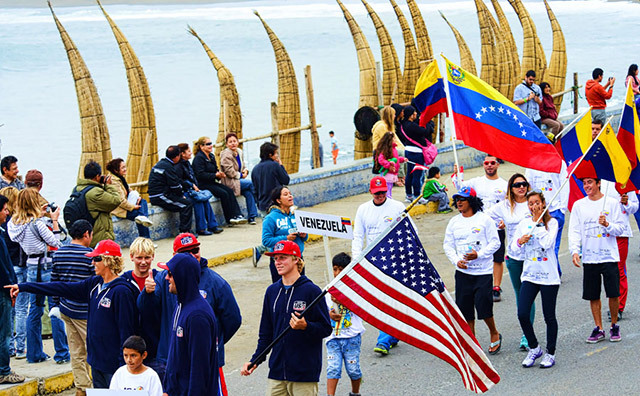 The Streets Of Huanchaco Lined With Local Citizens Welcomed The 23 National Delegations That Participated In The Opening Ceremony. 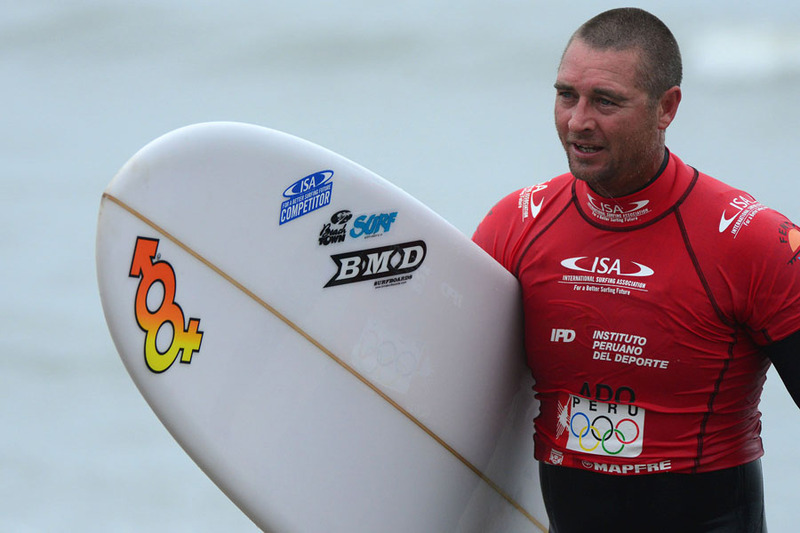 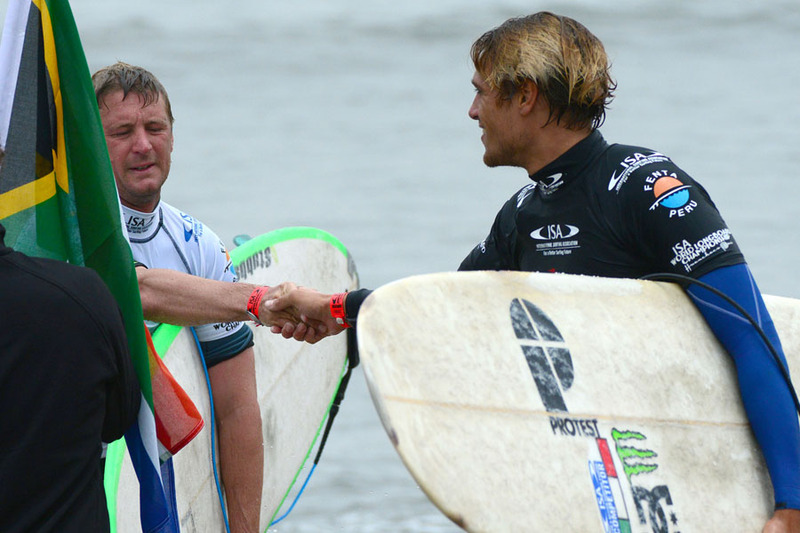 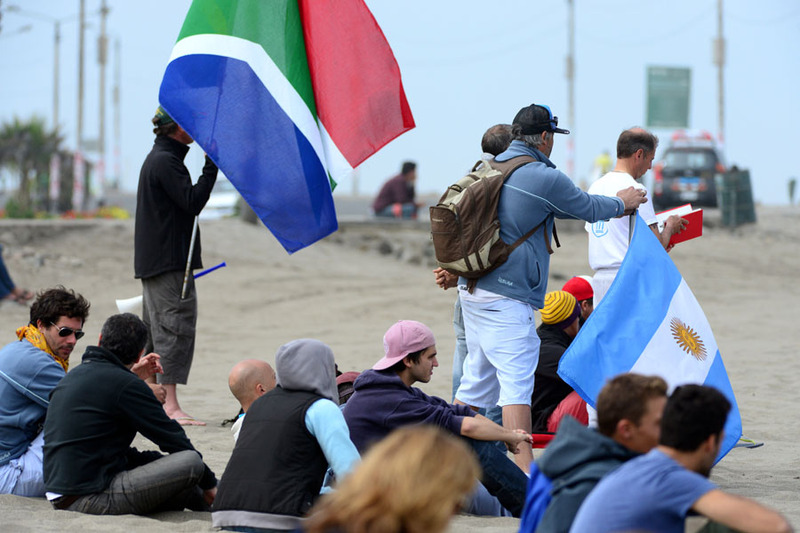 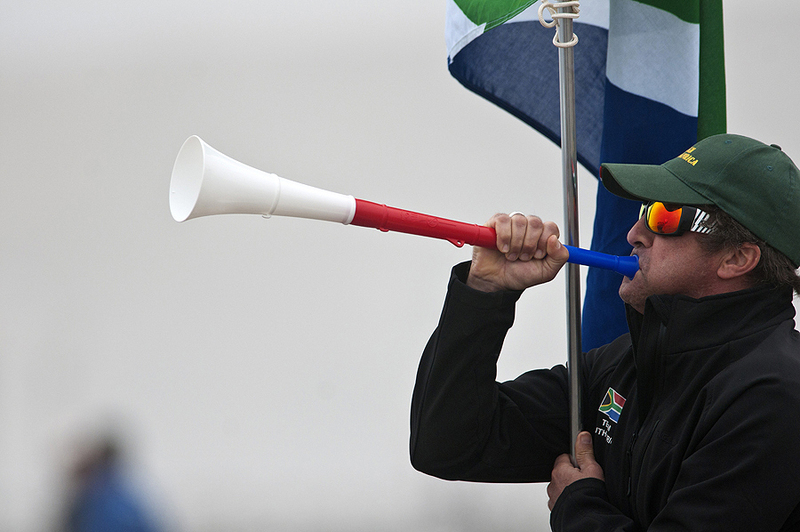 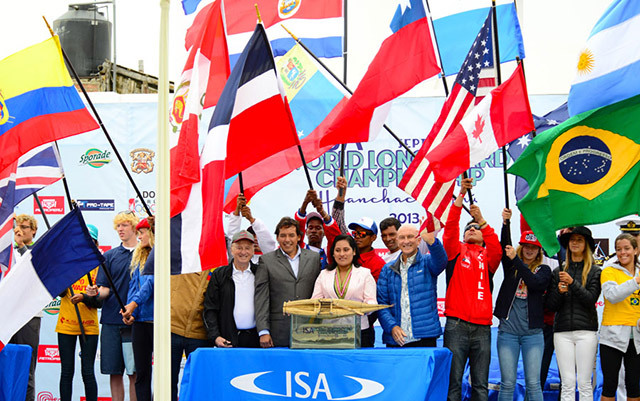 The ISA World Longboard Championship officially opened on Sunday. 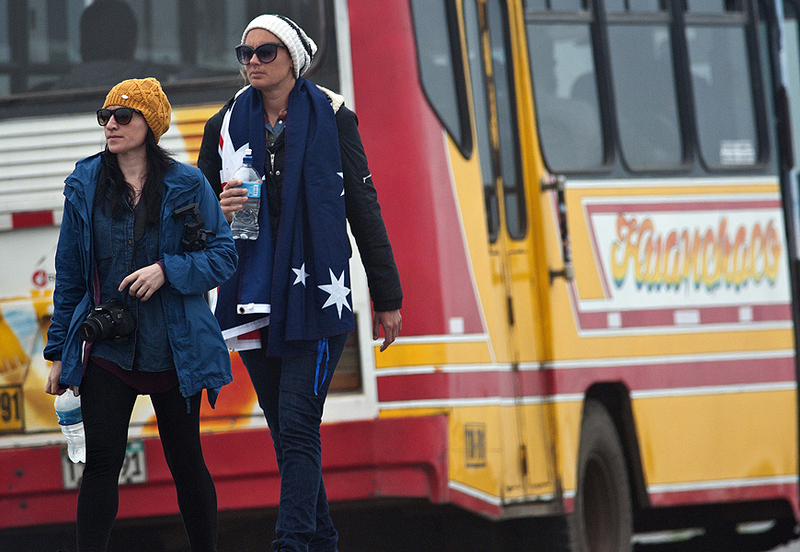 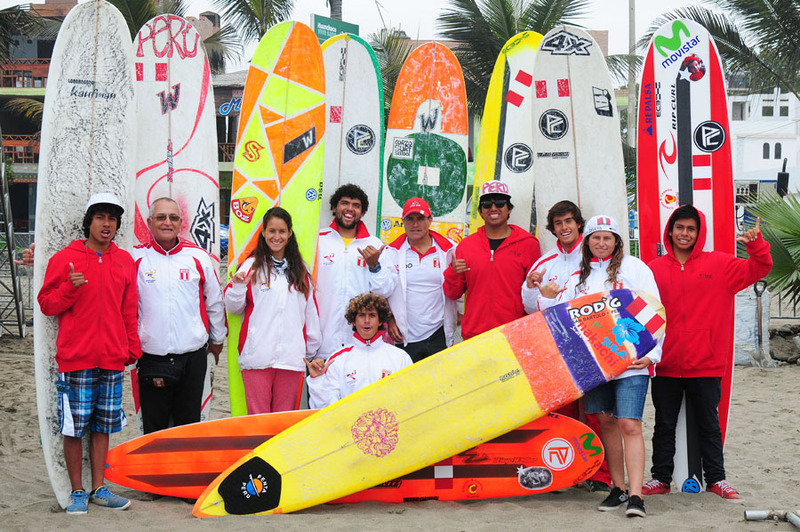 In attendance were the 23 National Delegations featuring 70 of the world’s best longboard surfers, who traveled to Peru from every corner of the globe. 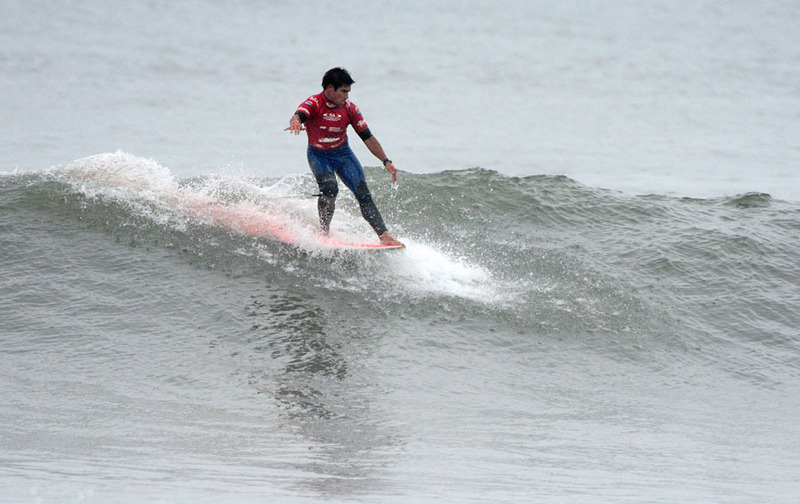 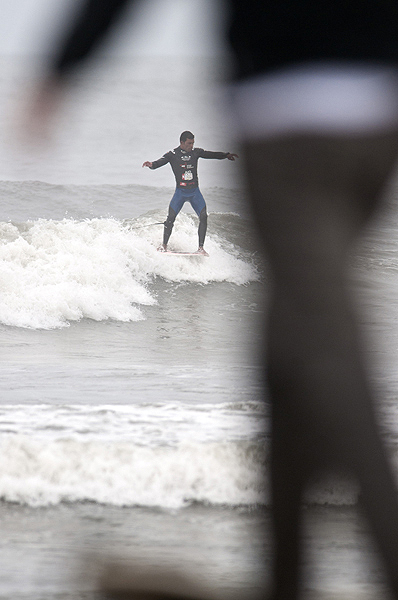 Local authorities, government officials and the people of Huanchaco witnessed the start of the first stand-alone ISA World Longboard Championship. 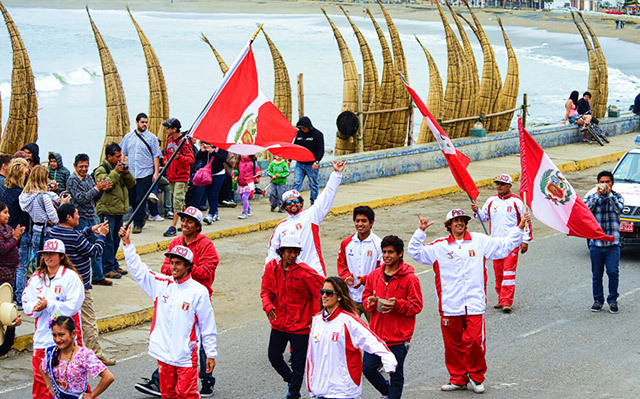 The National Teams paraded along the town’s main street adjacent to the surf break and the contest site. 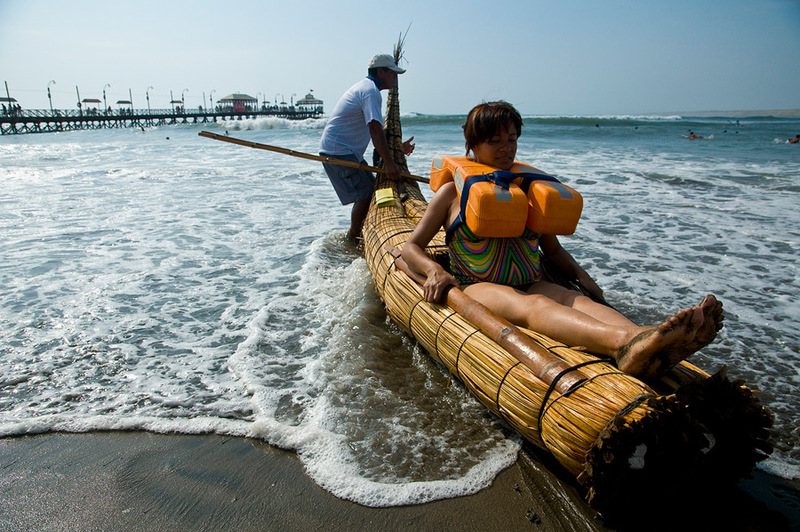 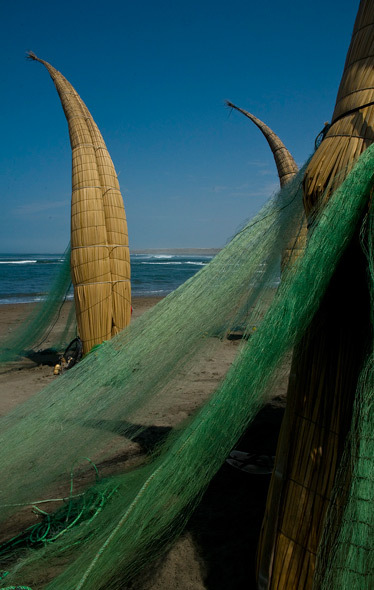 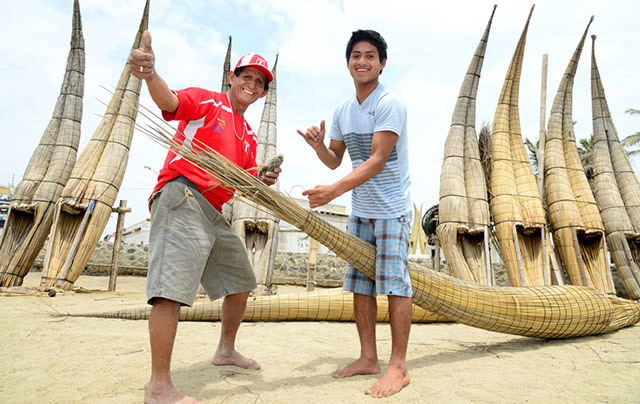 Dozens of Huanchaco’s historic “Caballitos de Totora” (reed fishing boats) lined the beachfront, while the surf was pumping with 6-8 feet sets in the background. 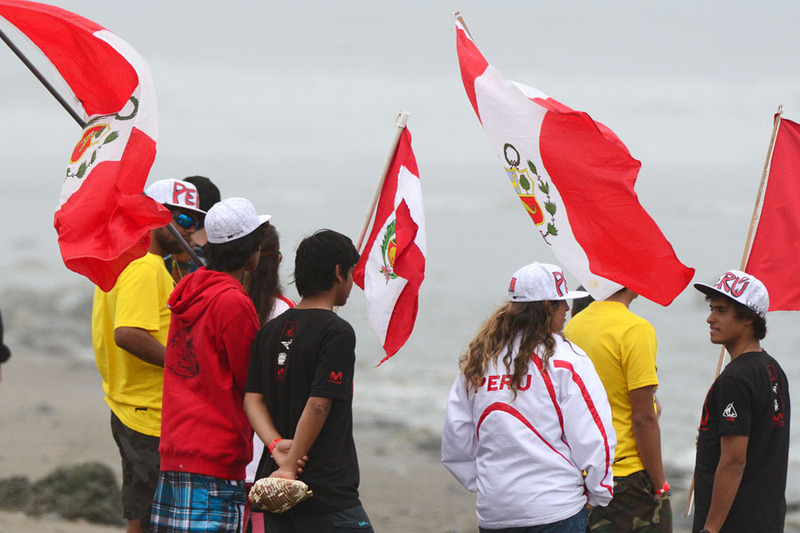 It was a perfect setting for the visiting athletes to witness Peru’s incredible natural resource and 4,000 year-old culture at the same time. 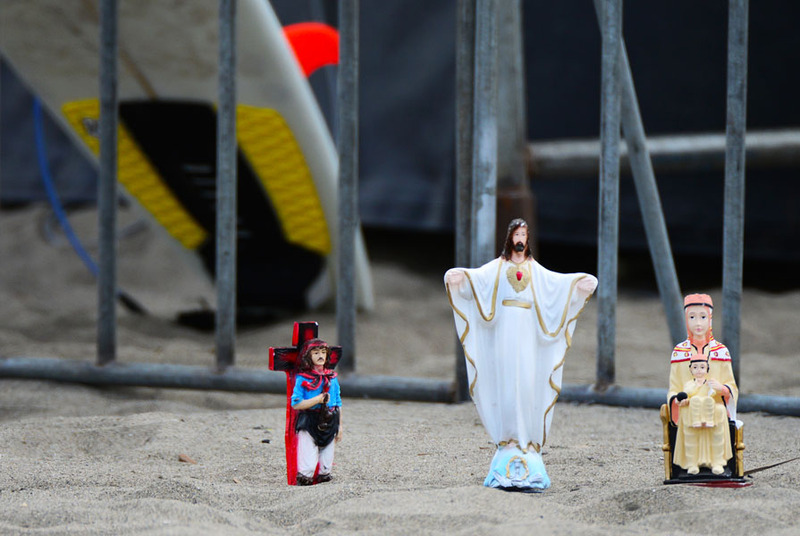 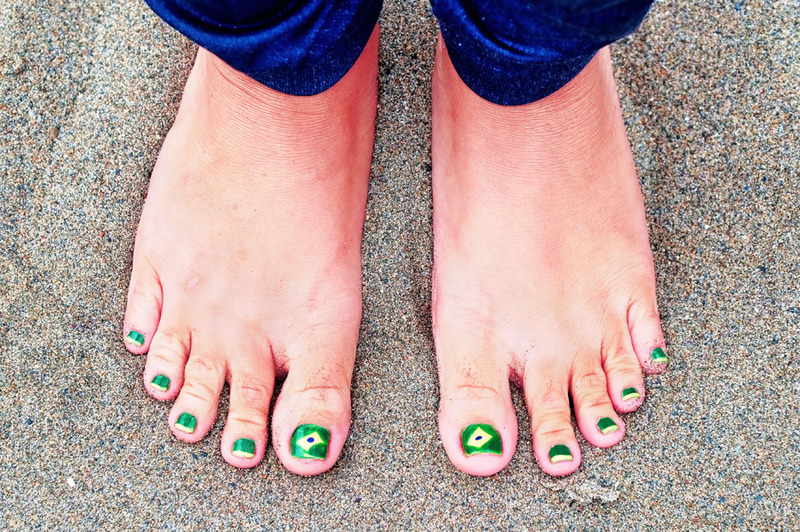 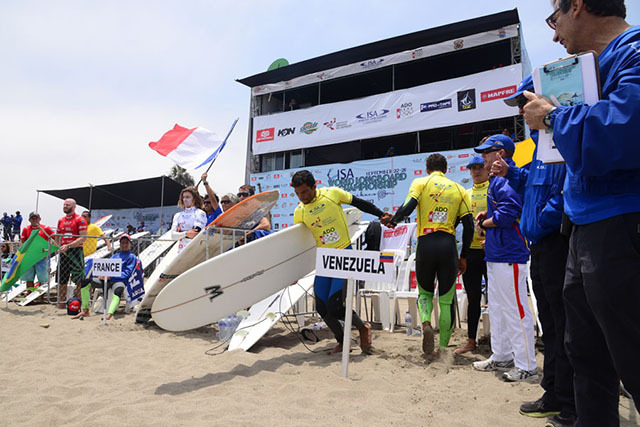 Two representatives from each delegation walked on stage, one proudly waving their national flag while the other poured sand from one of their local beaches into a custom glass container, symbolizing the peaceful gathering of nations through the love of surfing. 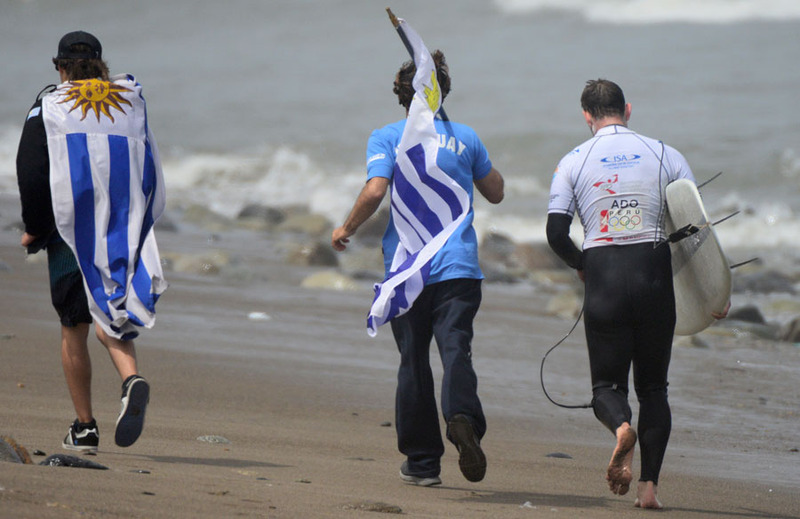 The Sands of the World Ceremony is unique to ISA World Championships and it leaves the local people and the athletes with a wonderful lasting impression. 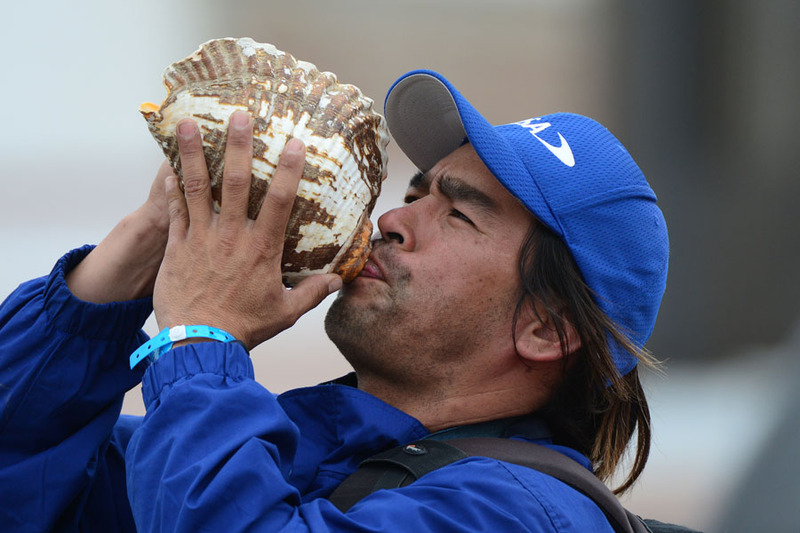 “Finally, I would like to thank all of the humble people of this city, who joined us to support this World Championship. 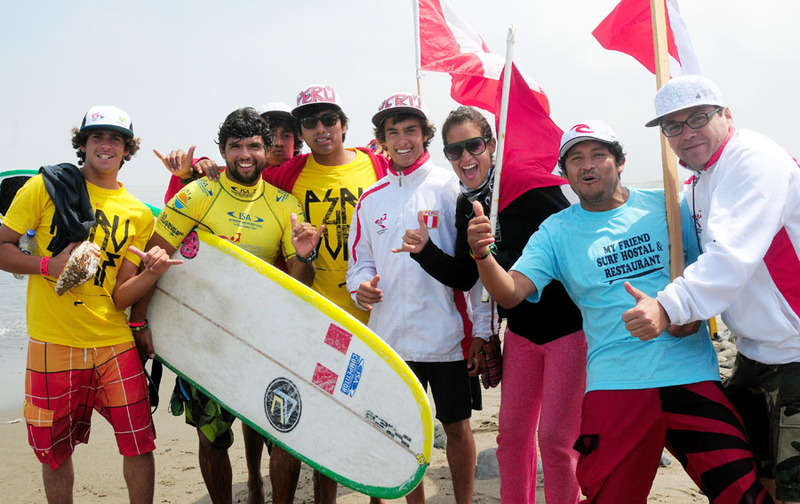 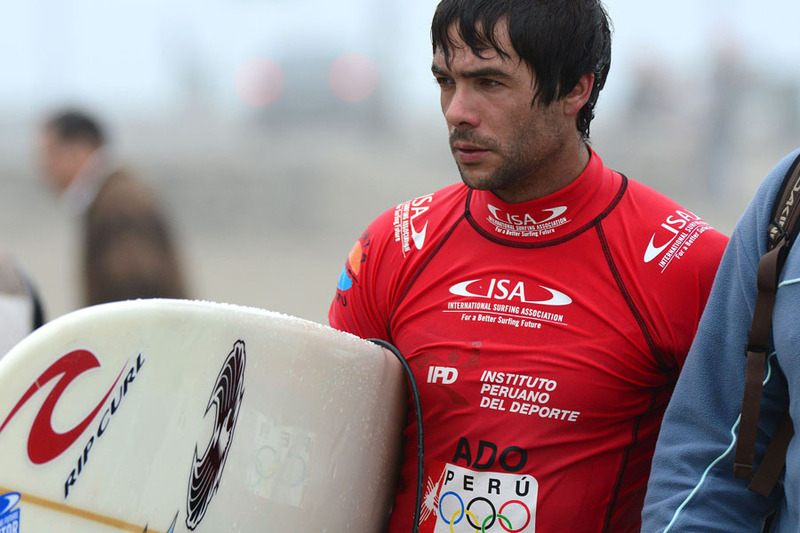 Thanks to the Peruvian Institute of Sport’s, Francisco “Pancho” Boza, and especially Jose Quiñones, Peru’s National Olympic Committee President, who has become the biggest supporter of Surfing in Peru,” concluded Sierralta. 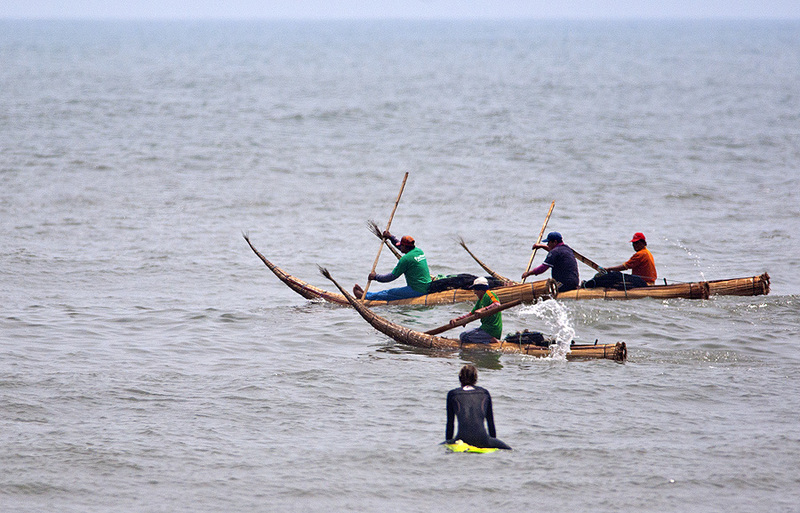 Athletes and spectators were treated to local traditional dances that kept everyone entertained. 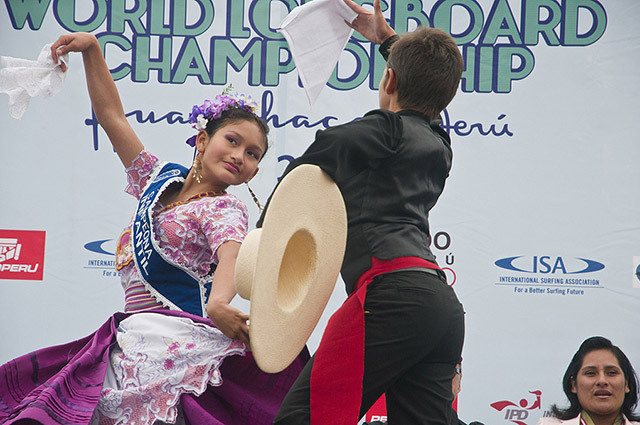 “La Marinera Norteña” was performed beautifully by 12-year olds Sugey Urcia and her partner, Carlos Correa. 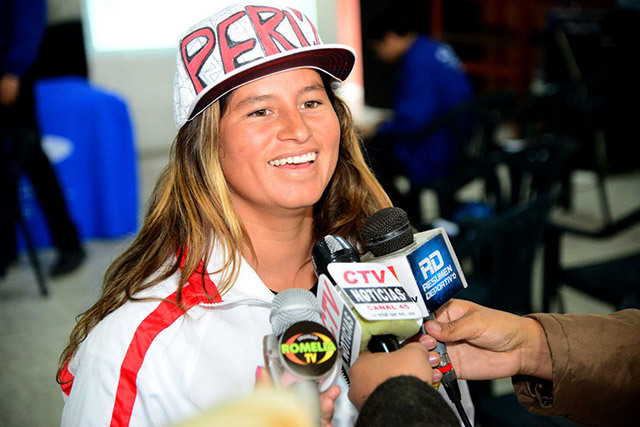 Sugey is Peru’s National Dance Champion in her age group and is the younger sister of Huanchaco’s Juninho Urcia, the ISA Gold Medalist and 5-time ISA Scholarship recipient. 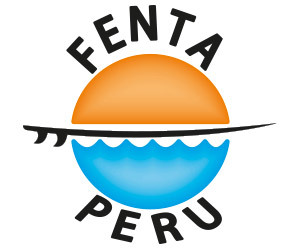 A second performance from an Afro Peruvian dance group, kept the crowd jumping, with its up-beat music and dancing. 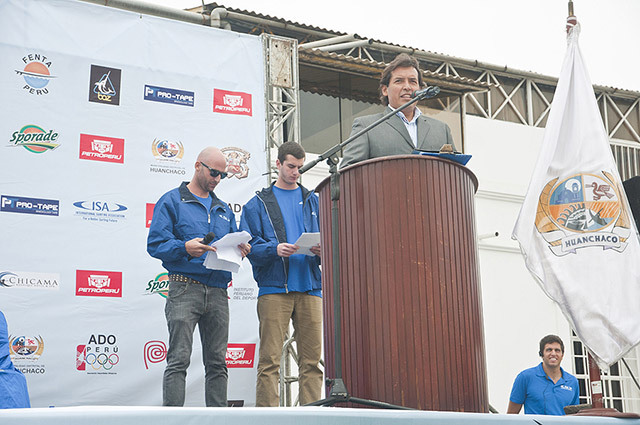 ISA Vice President Alan Atkins and Huanchaco Mayor Delia Mestanza declared the 2013 ISA Longboard Championship officially open, concluding the ceremonies for the day. 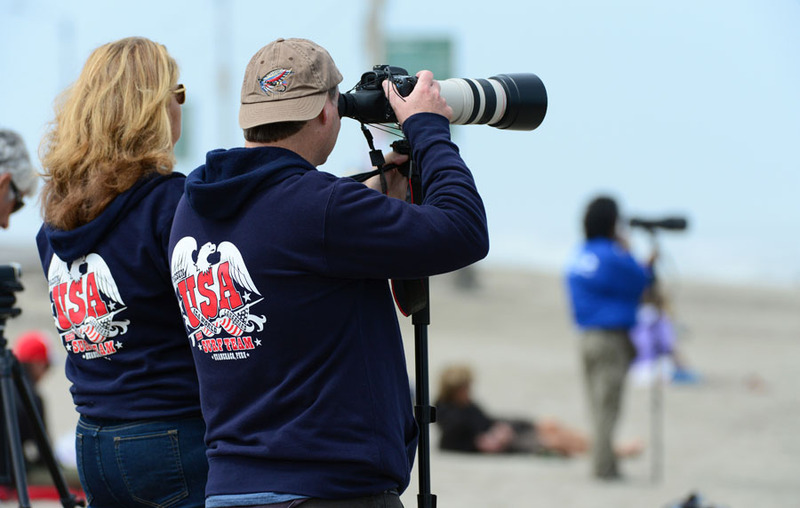 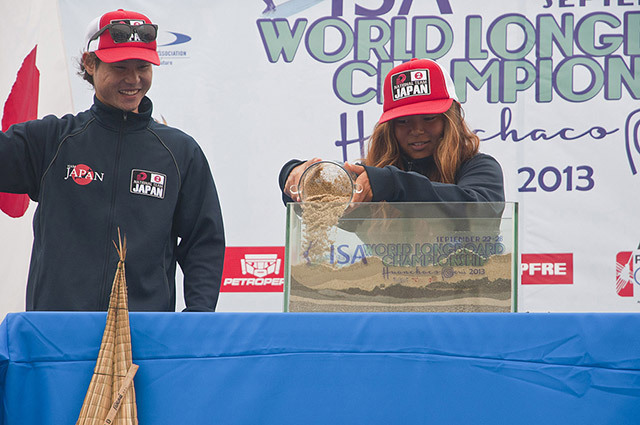 The ISA World Lonboard Championship begins Monday with The Morning Show at 7:40am (local time) followed by the competition at 8am featuring Round 1 of Qualifying Open Men, Qualifying Open Women, and Qualifying 1 Junior Under-18. 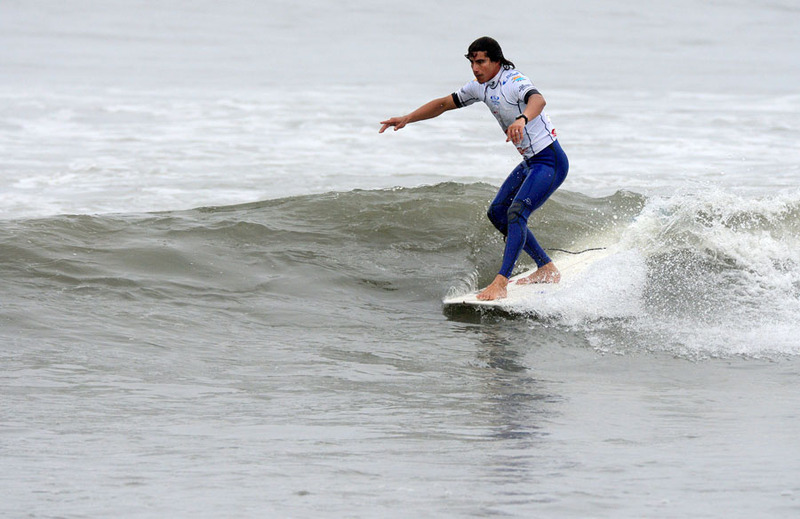 From September 22-28, Peru will become the gathering place of the world’s best longboarders, who will compete in the ISA World Longboard Championship (WLC) at the world-class pointbreak of Huanchacho. 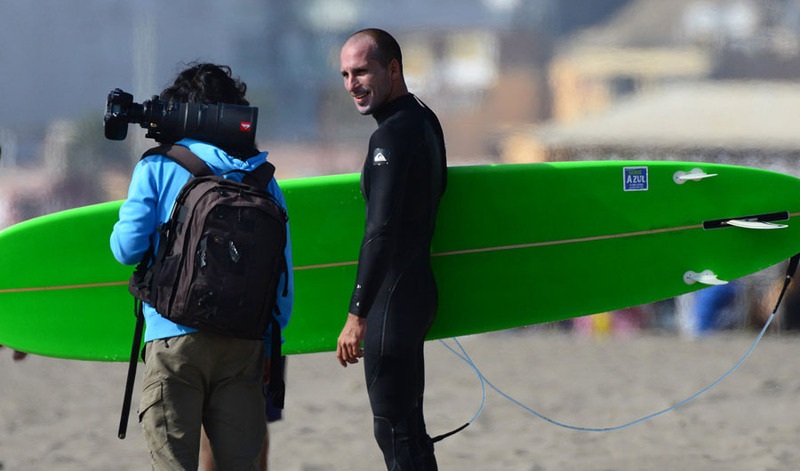 Over 20 countries from all corners of the planet will soon arrive to the beautiful country of Peru, its welcoming people, great food, and incredible waves. 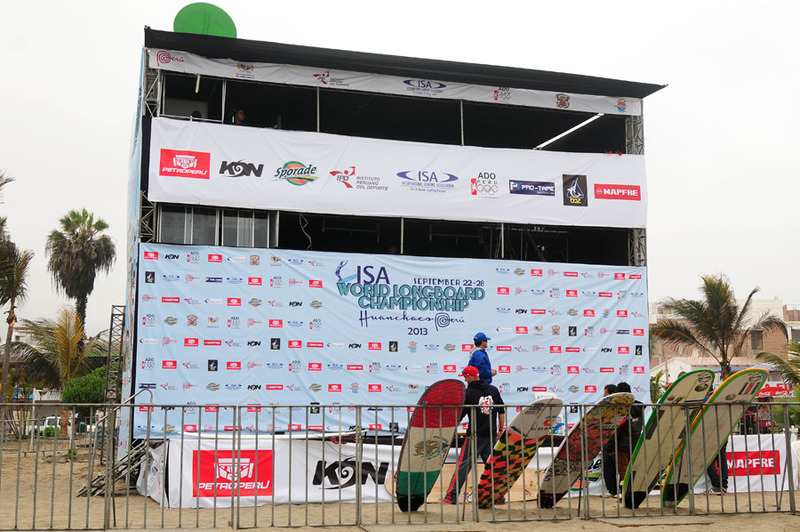 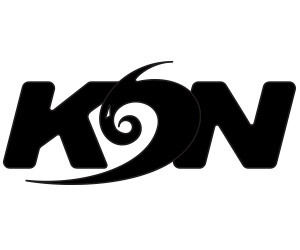 The 2013 ISA World Longboard Championship (WLC) is the first ISA stand-alone competition exclusively for the world’s best Longboarders. 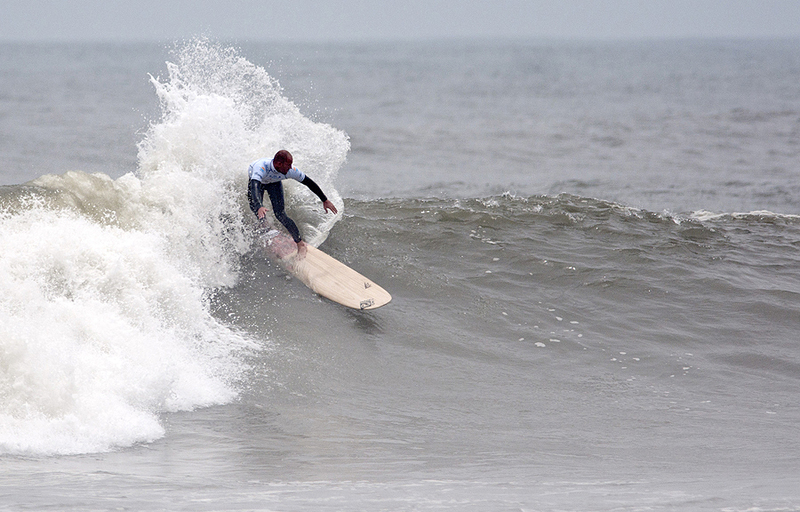 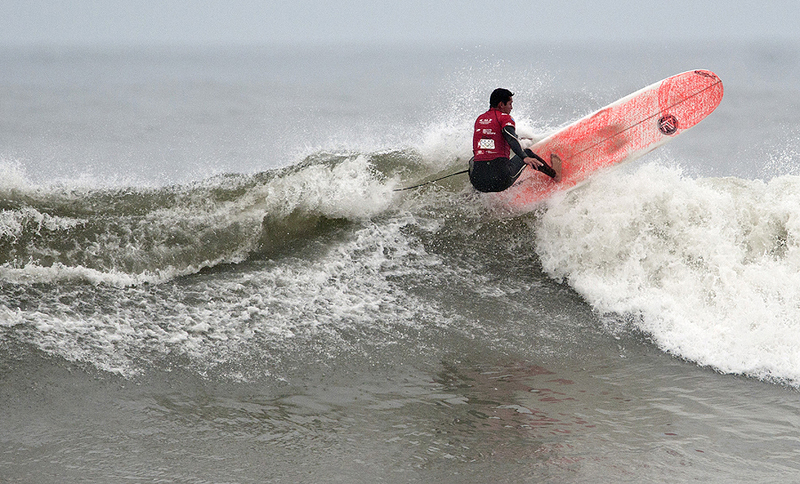 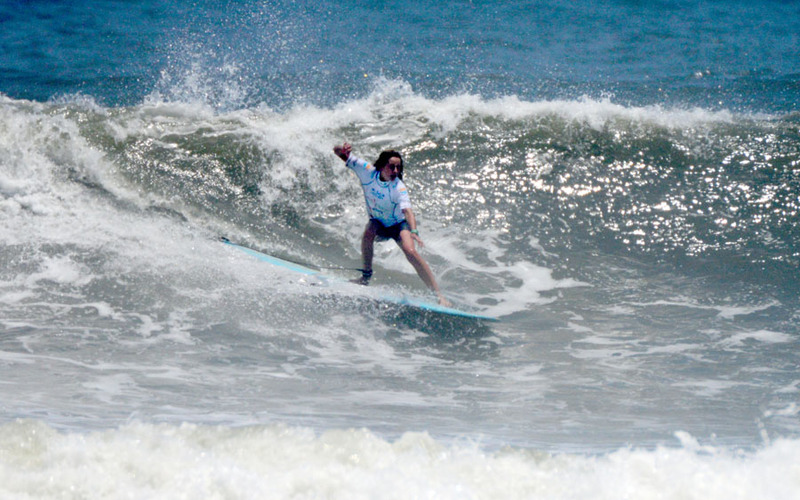 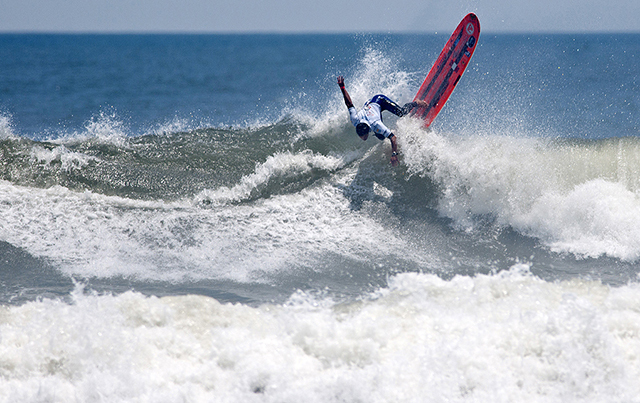 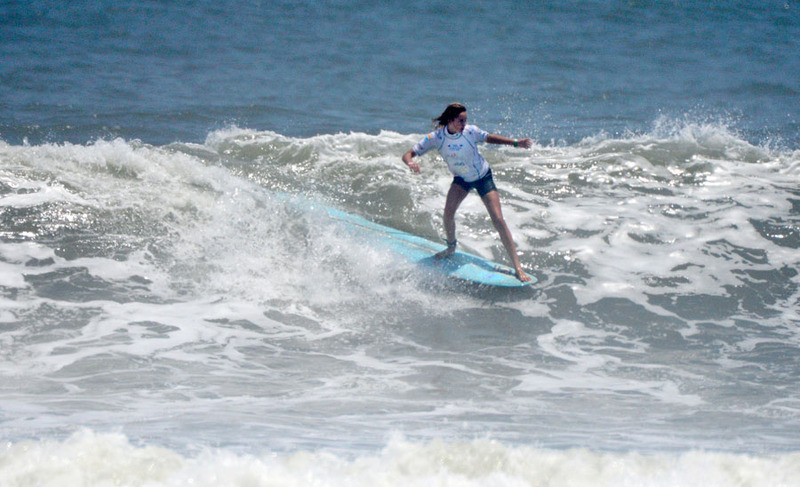 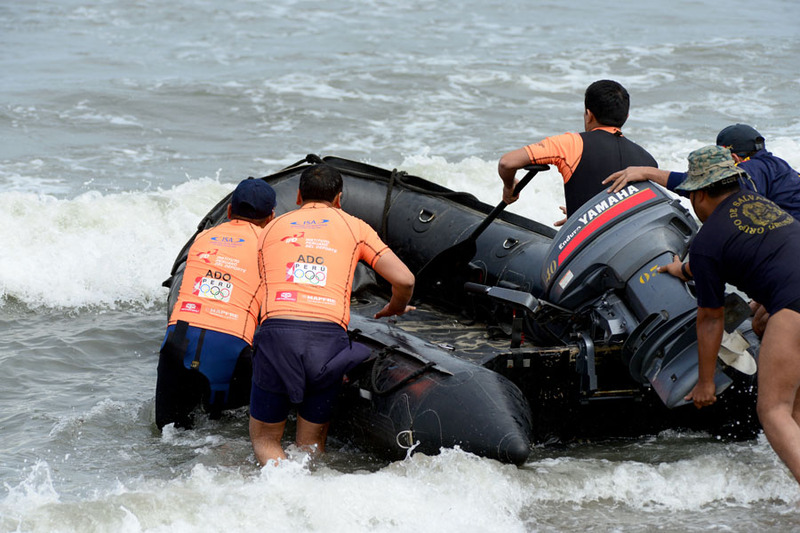 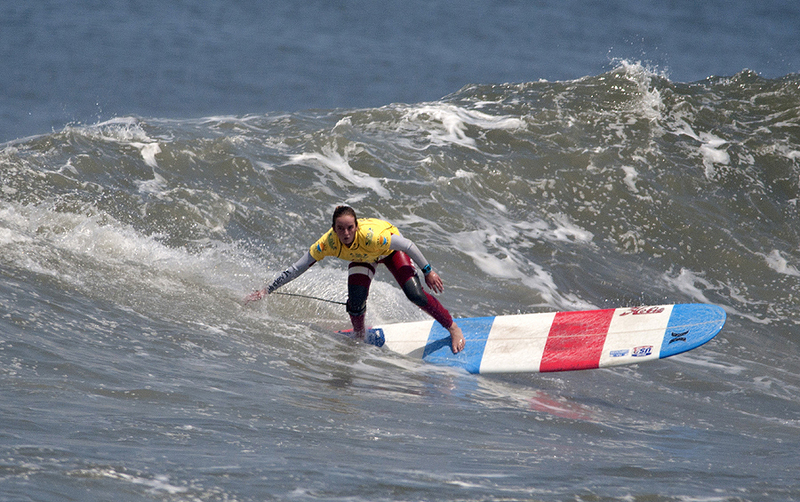 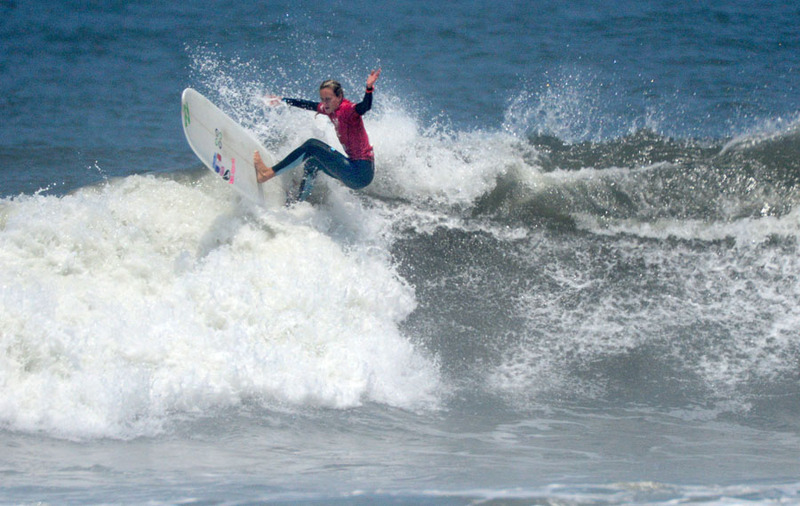 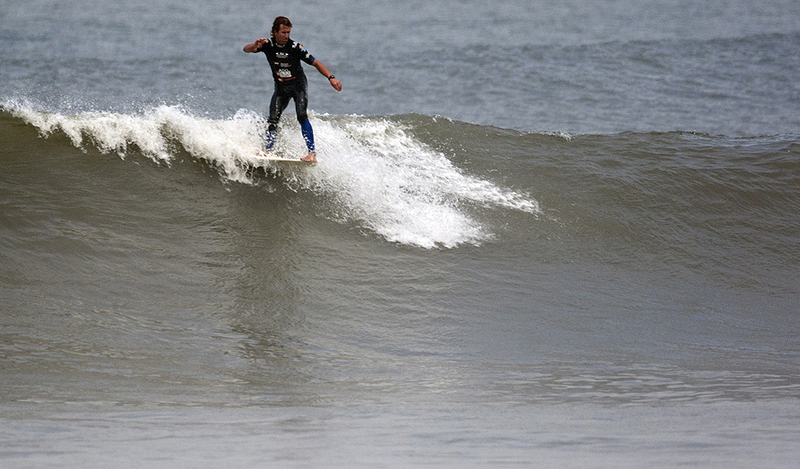 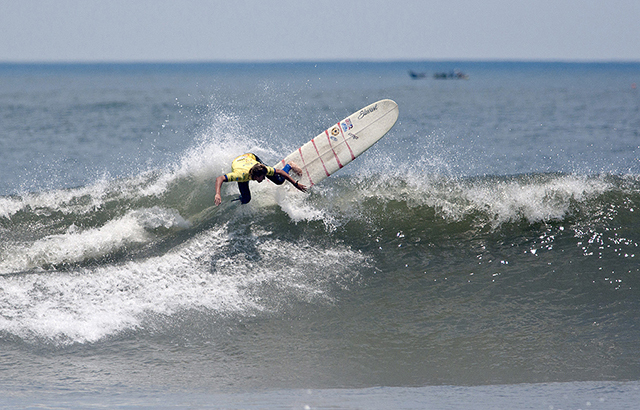 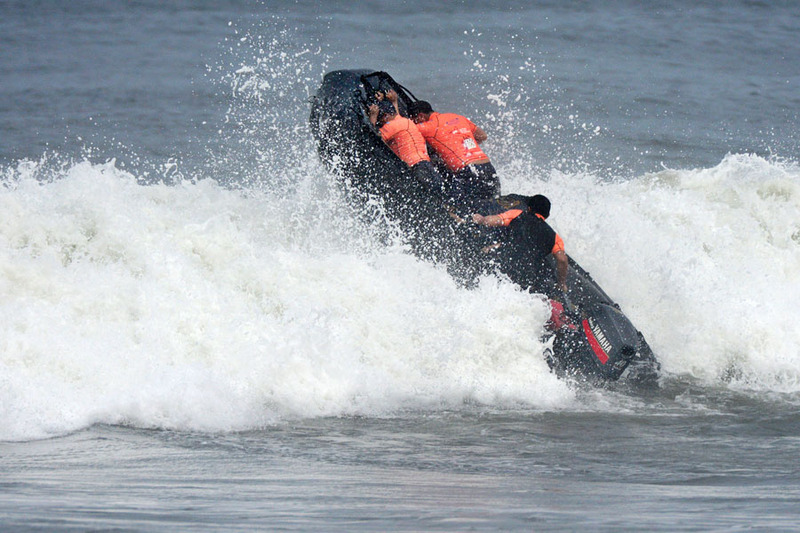 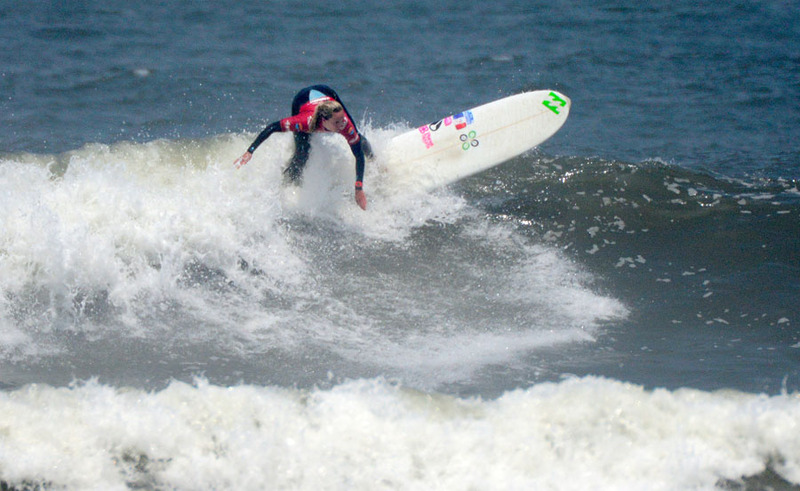 The ISA WLC will gather the best competitors in Huanchaco, Peru from September 22 to the 28. 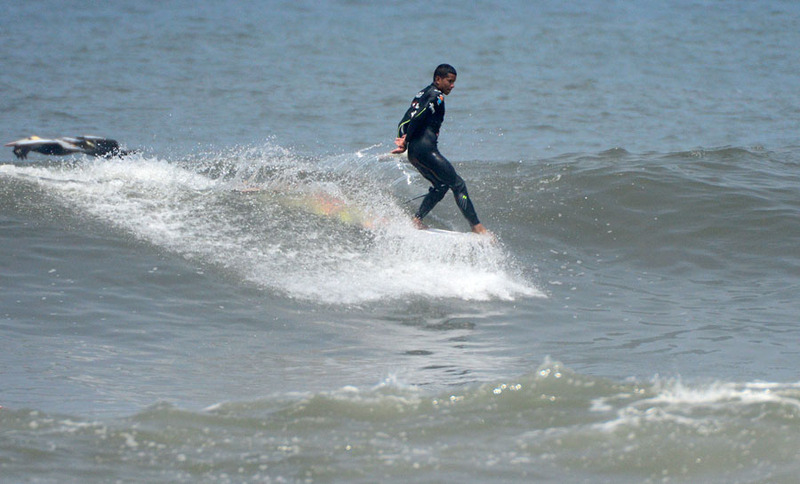 Longboarding has traditionally been a division of the ISA World Surfing Games, which has crowned Open Men’s World Longboard Champions since 1988. 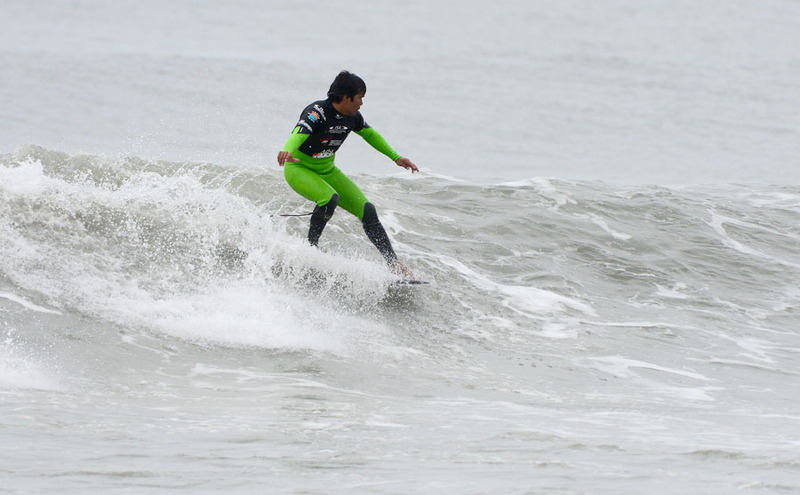 Due to the growing popularity of the Longboard division and the increase in participating athletes, the ISA has decided to organize its own World Championship with specialized longboarding judges at one of the best surfing destinations in the world. 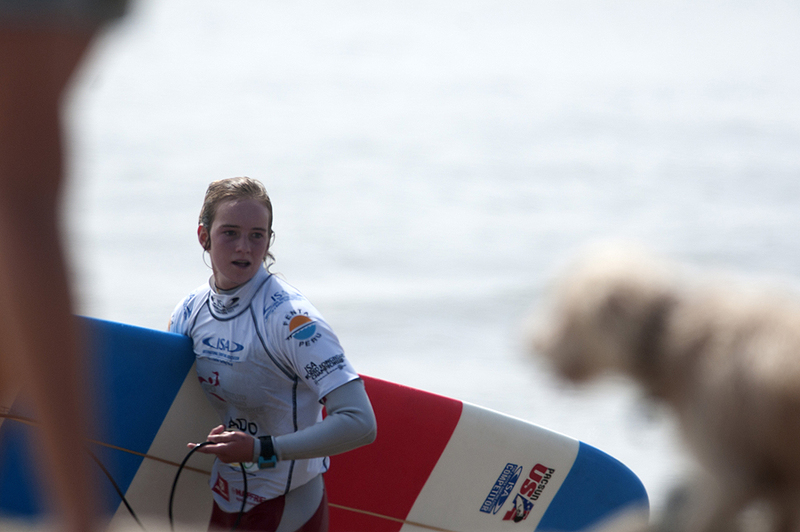 Additionally, for the first time ever, the ISA will crown an Open Women and a Junior World Longboard Champion! 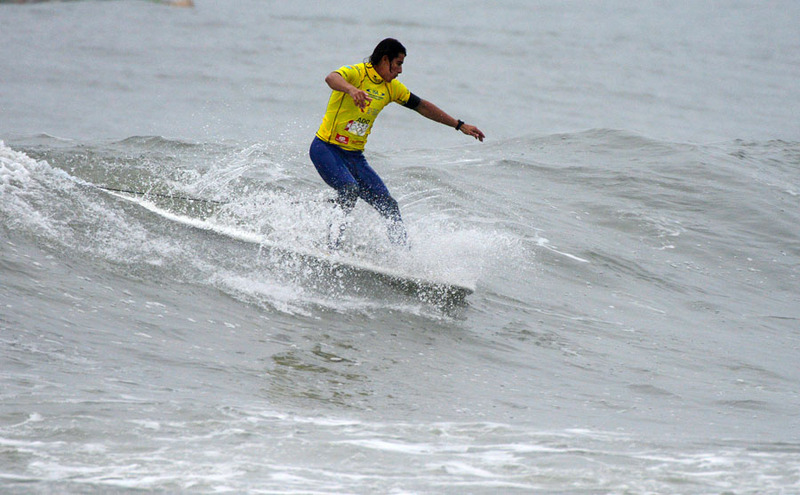 The World Championship is a team competition with individual Open Men, Open Women, and Junior Under-18 divisions. 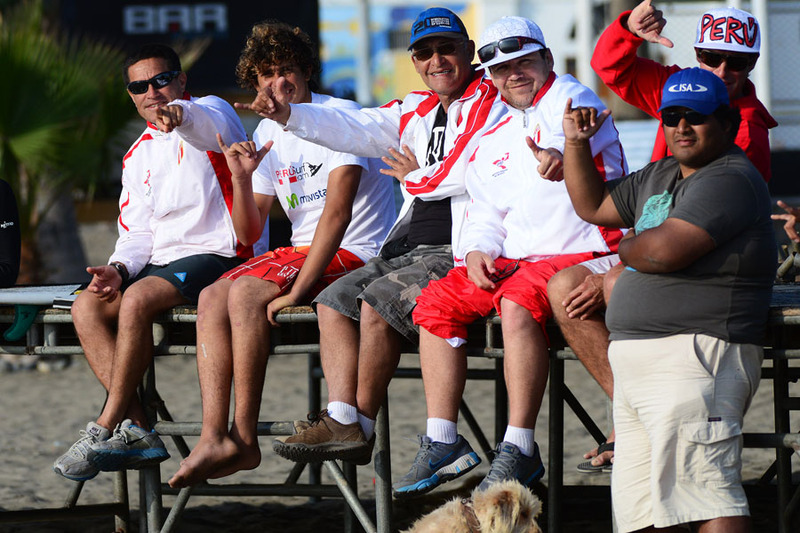 Each National Team consists of up to 2 Open Men, 1 Open Woman, and 1 Junior (Under-18 Boy or Girl), for a total of 4 athletes plus Team Officials. 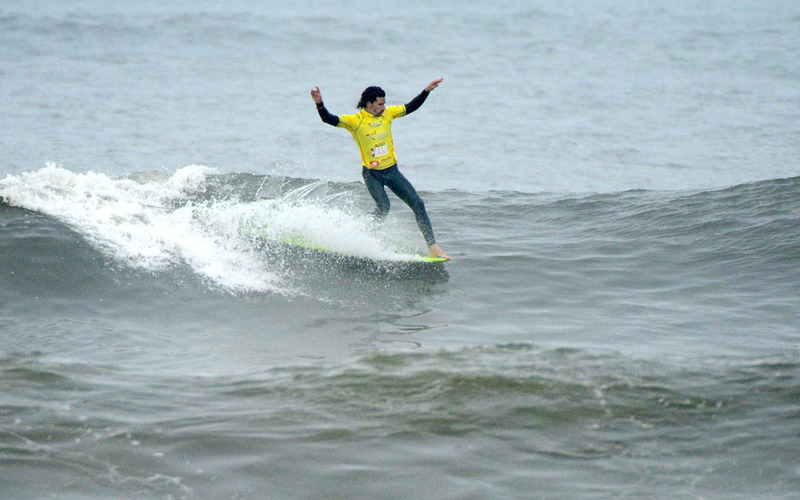 The ISA WLC gathers the best Longboarders from every continent to compete for their National Teams in an “Olympic-style” event. 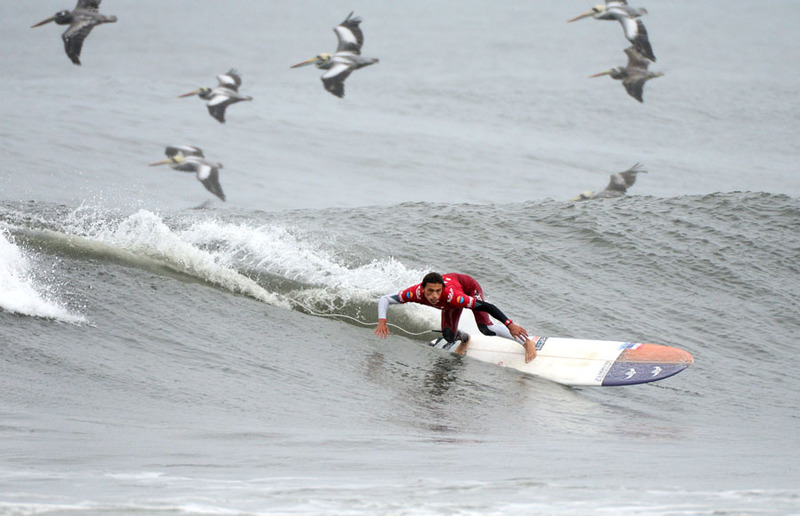 Of special note will be USA’s Tony Silvagni, 2011 ISA World Longboard Champion France’s Antoine Delpero, 2009 ISA World Longboard Champion, Brazil’s Phil Rajzman 2007 ASP World Longboard Tour Champion, and USA’s Taylor Jensen, 2012 ASP World Longboard Tour Champion. 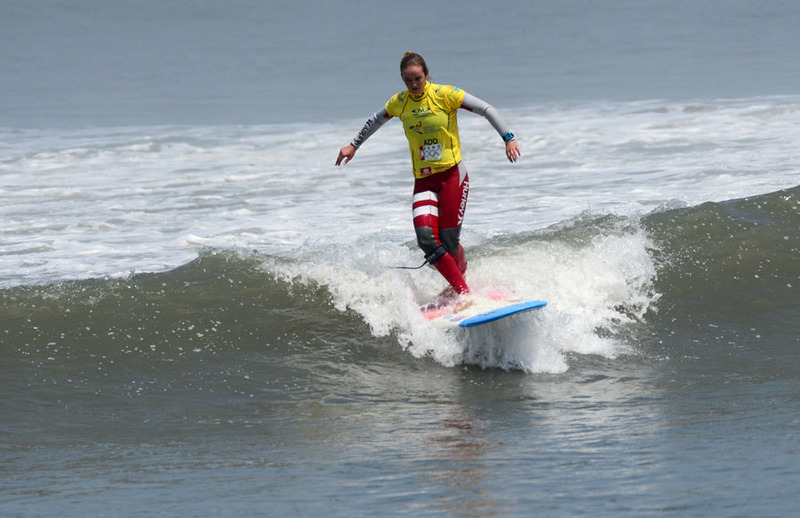 On the Women’s side, France’s Justine Dupont, a top competitor on the ASP Women’s World Longboard Tour will be one of the favorites. 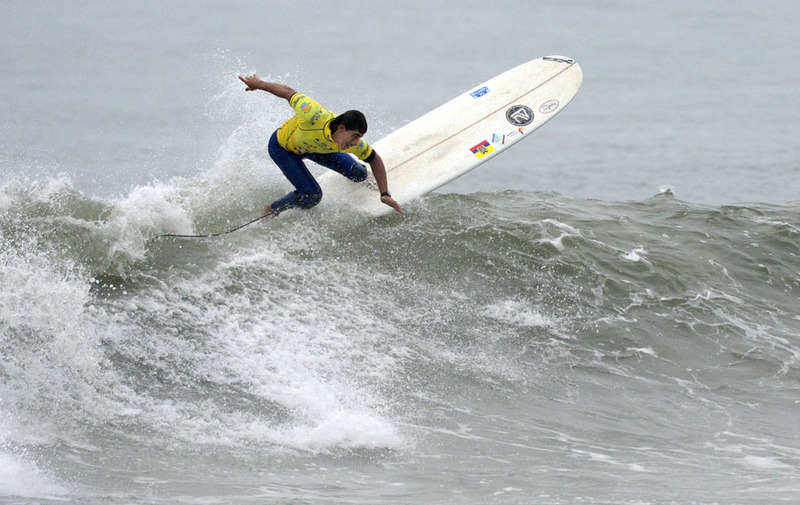 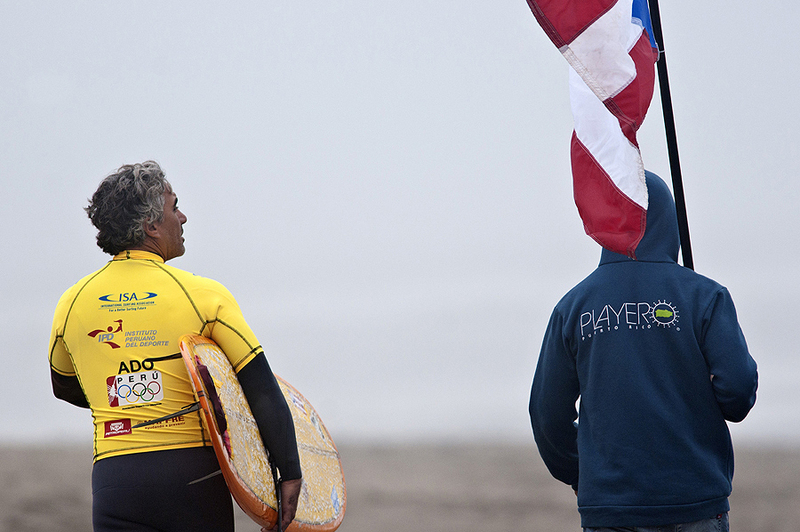 The surfers compete for Gold, Silver, Bronze, and Copper Medals, the World Team Championship, and the honor of representing their respective countries. 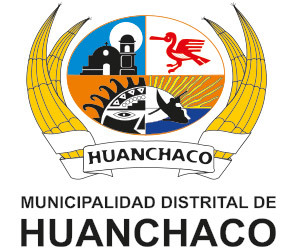 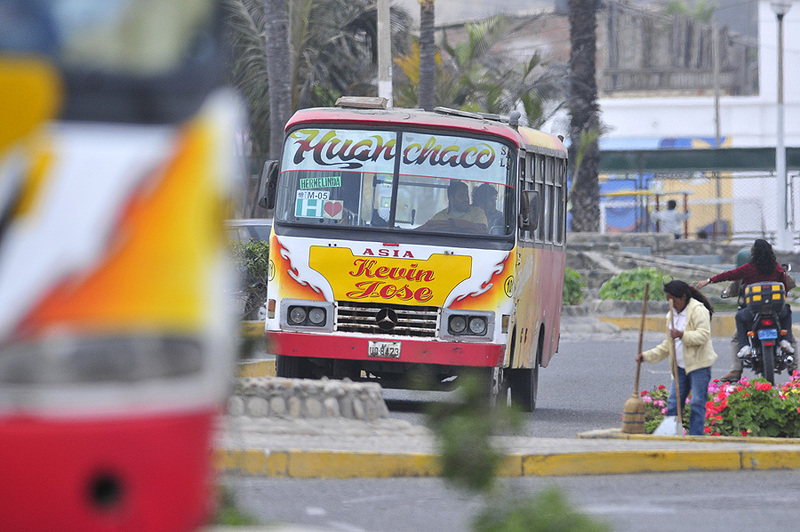 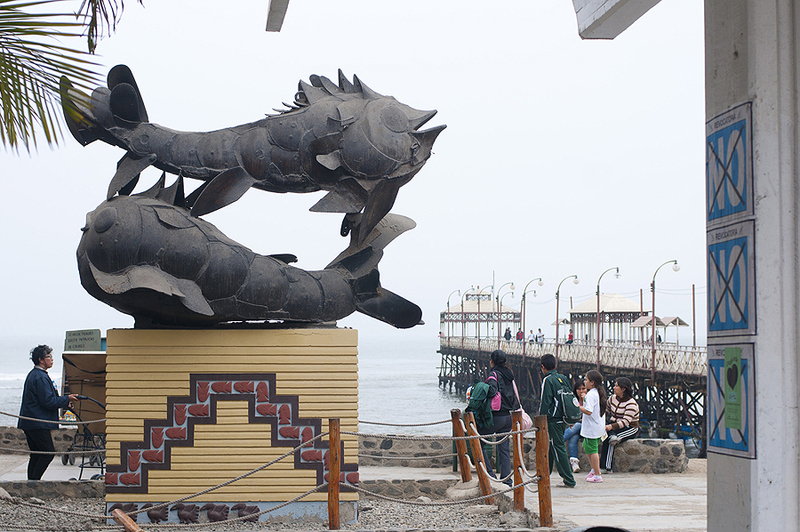 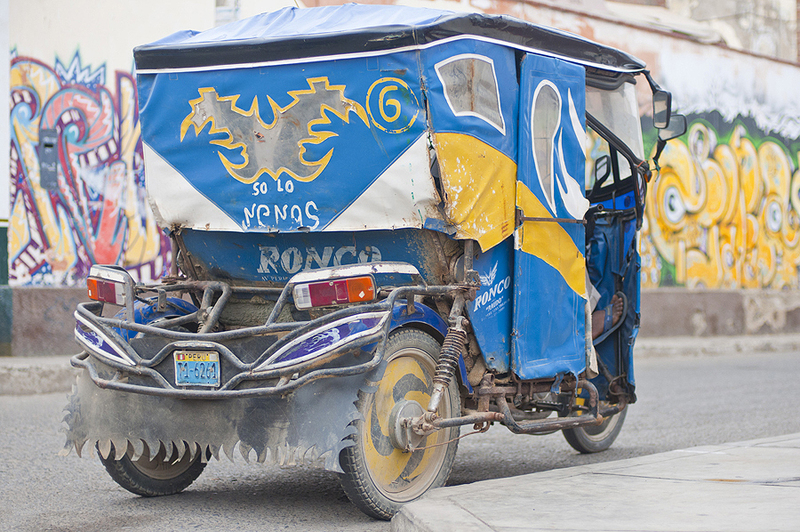 Huanchaco is located in the North of Peru, near the major city of Trujillo. It is known for its world-class, consistent waves and its long history of wave riding. 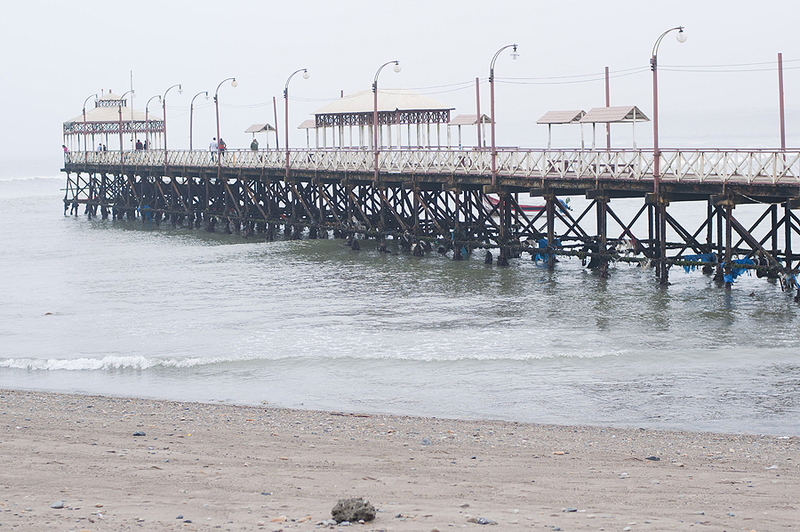 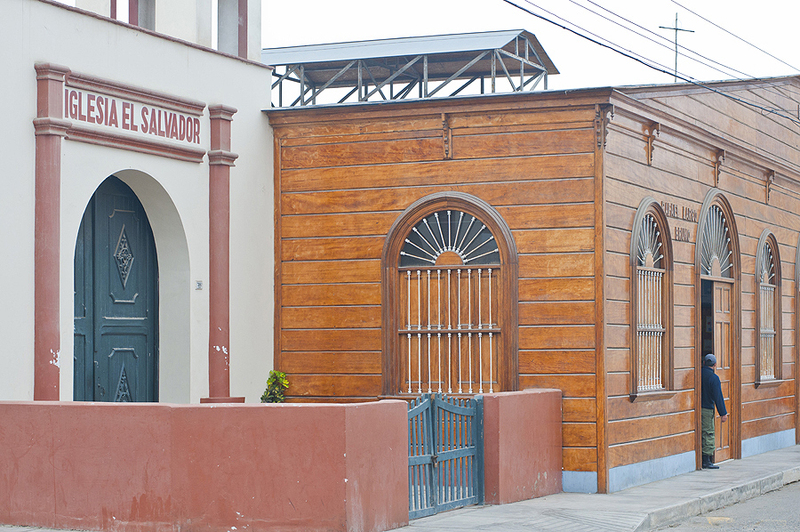 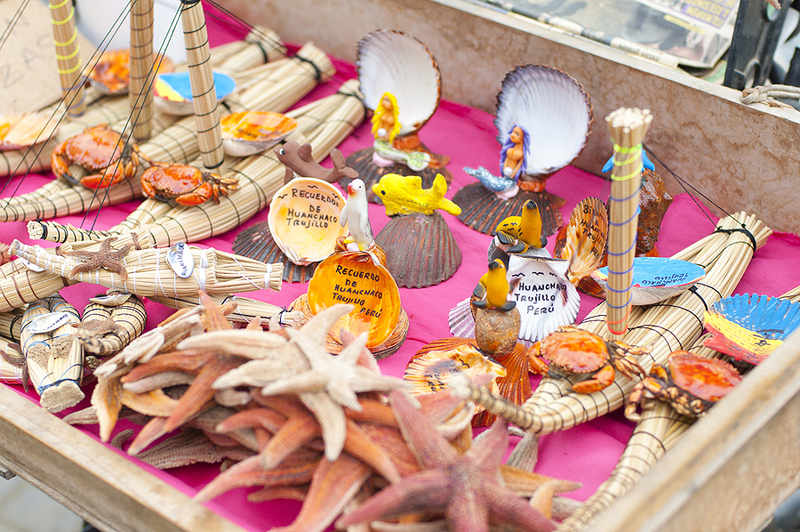 Huanchaco is also the birthplace of the popular “ceviche” dish. 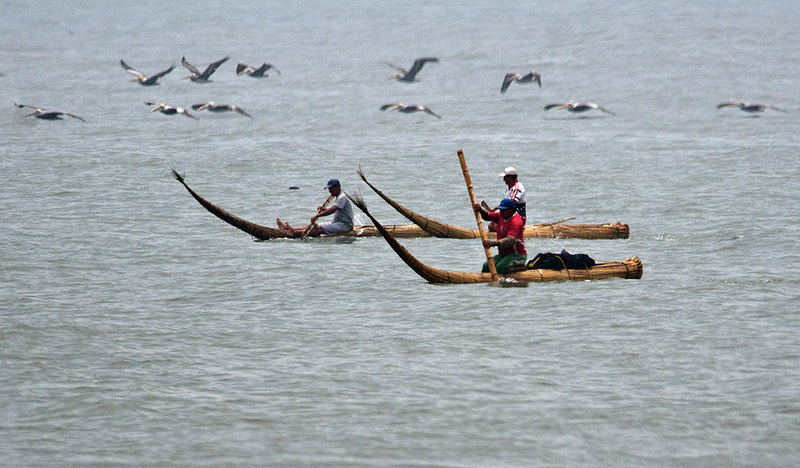 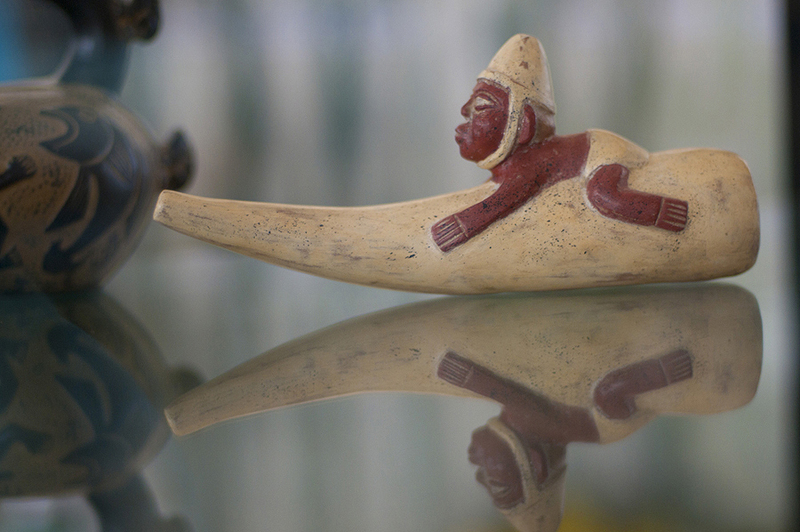 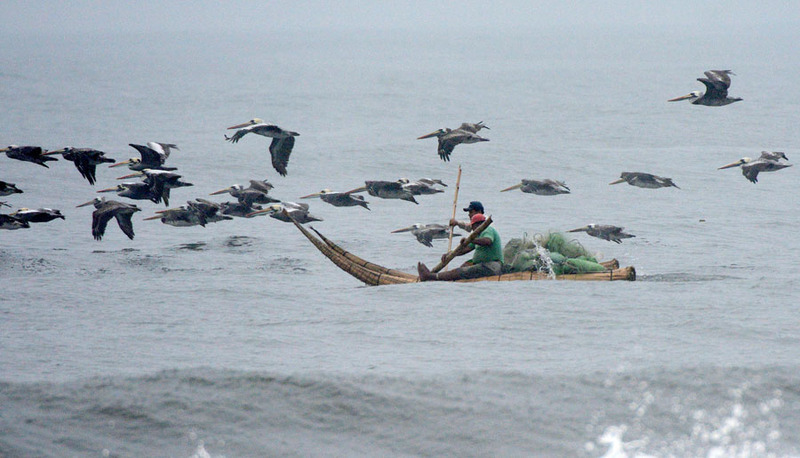 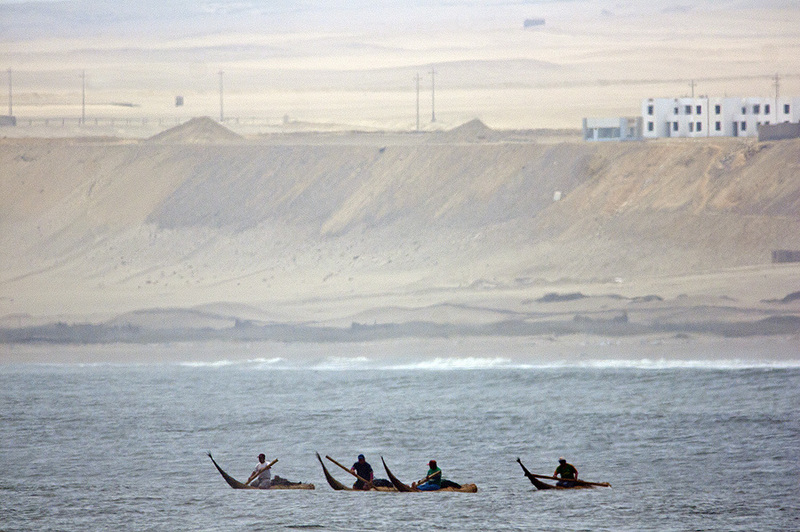 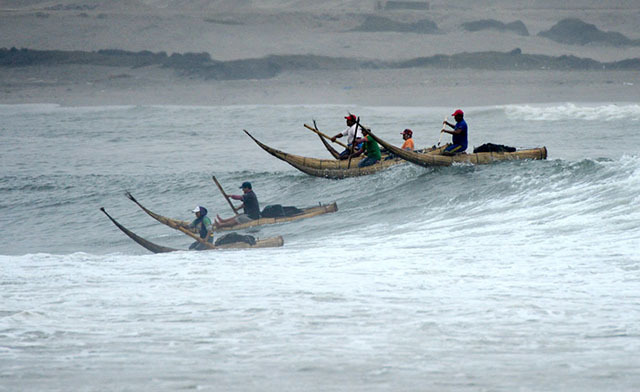 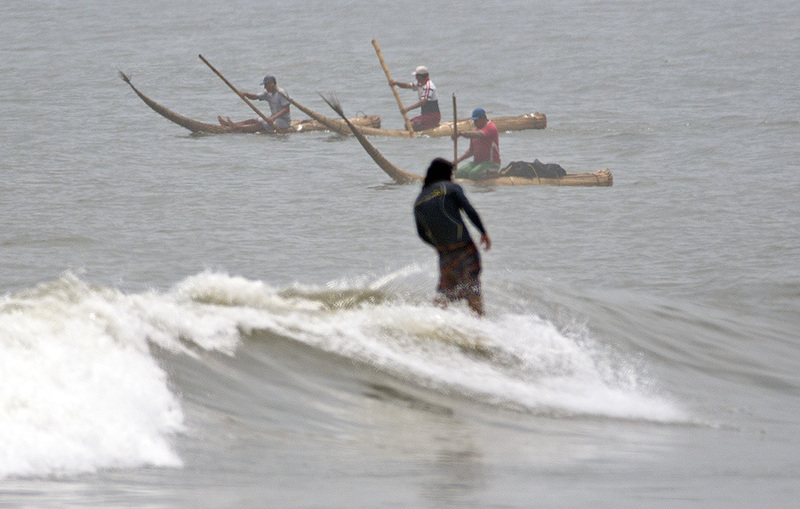 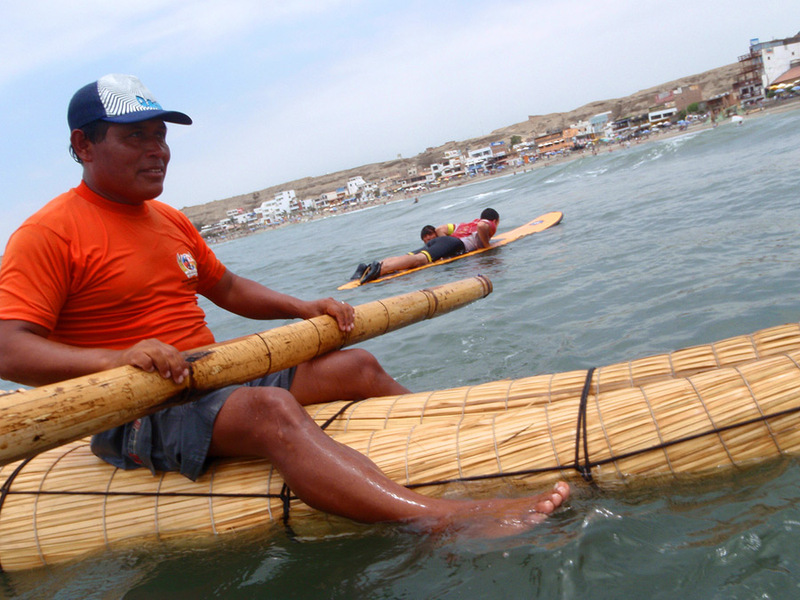 Before the Inca Era 3,000 years ago, Peruvians were documented riding waves on “caballitos de totora,” a small reed fishing boat and one of humanity’s earliest known surf crafts used for both work and pleasure. 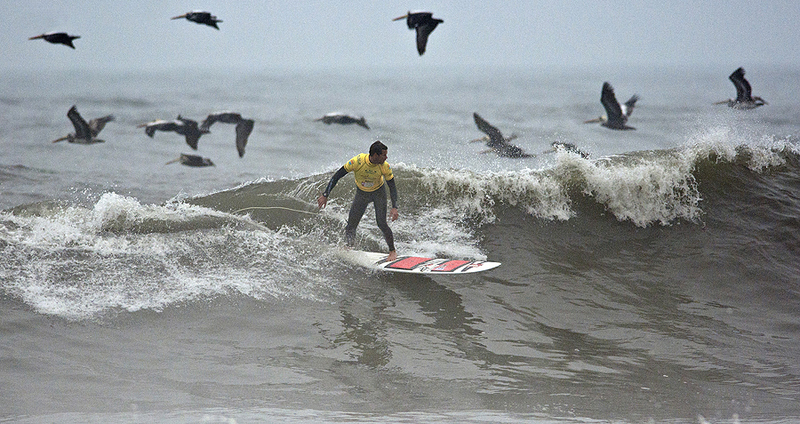 In October 2012, Huanchaco was declared a World Surfing Reserve by Save the Waves Coalition as the first in Latin America and fifth in the world. 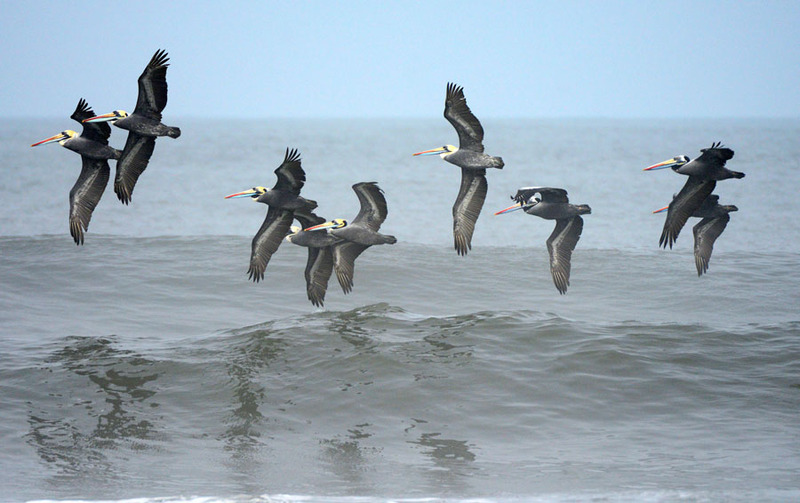 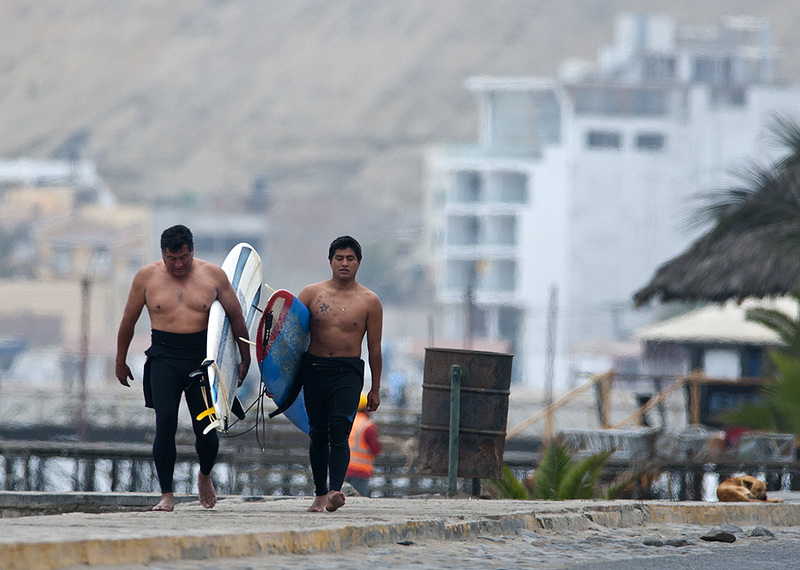 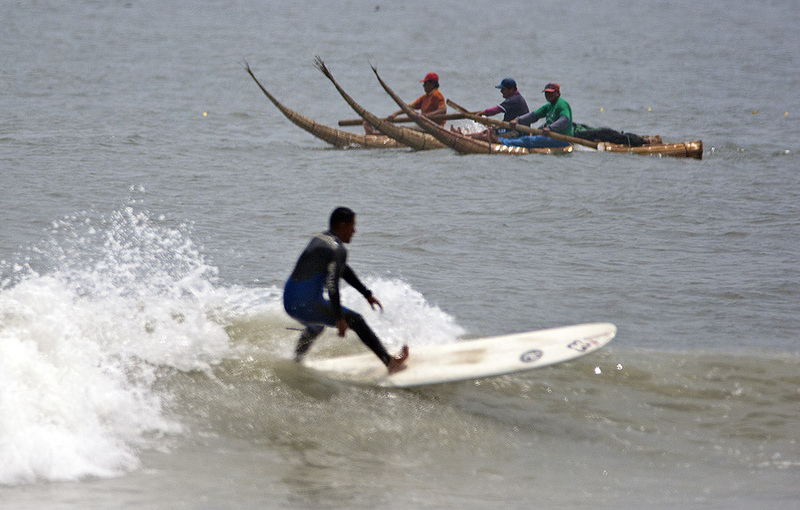 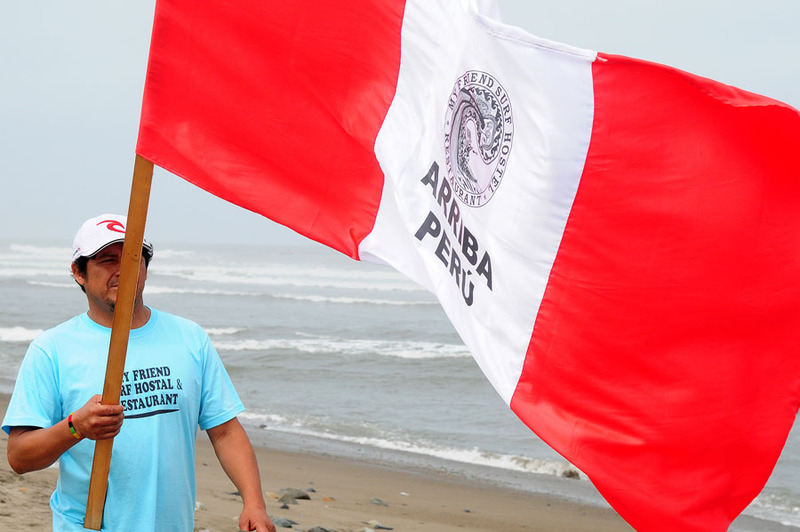 Read more about this historic surfing region and the importance of being a World Surfing Reserve here- http://www.savethewaves.org/news/world-surfing-reserve-in-peru. 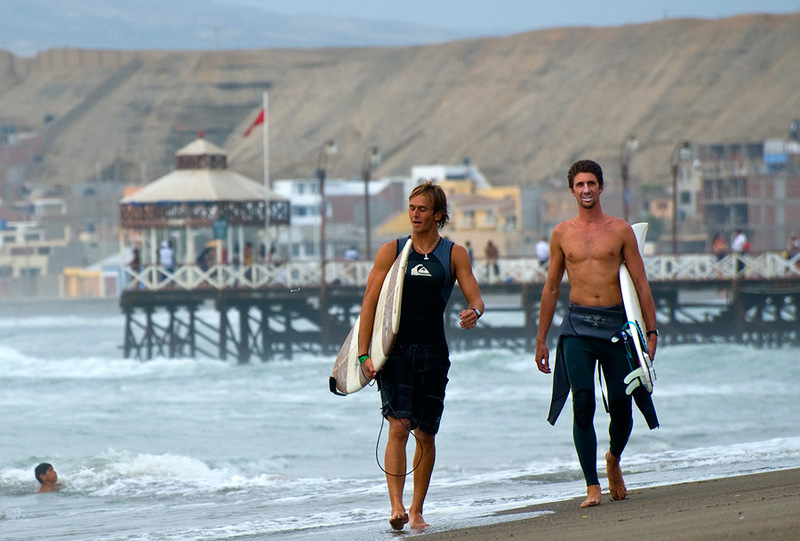 The 2013 WLC will be held during the winter, so the air temperature in Huanchaco should range between 58-64 degrees F (14.5-18 degrees C). 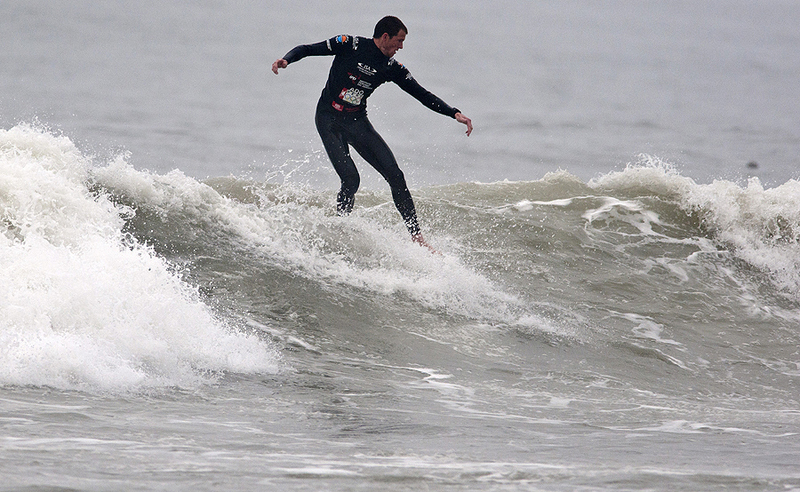 The water temperature should range between 62-72 degrees F (16.4-22.3 degrees C). 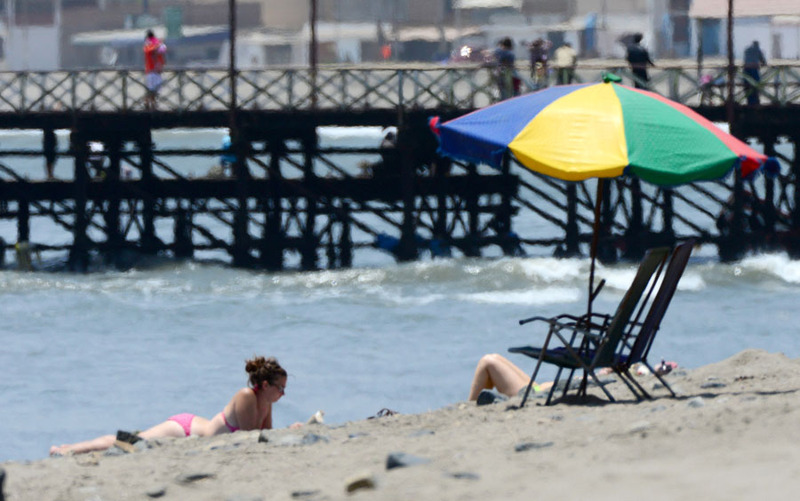 There will be 0% chance of rain since it is located in the desert. 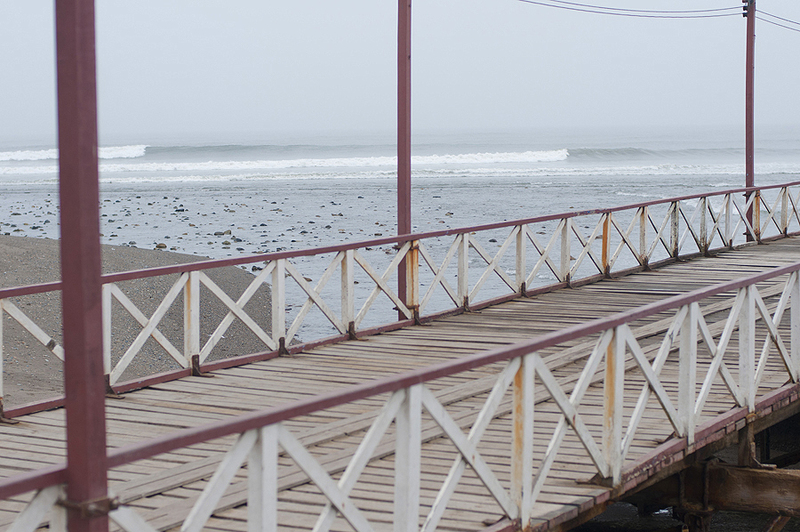 Huanchaco is a famous rock and sand bottom long left point-break, and similar to its close neighbor, Chicama, its long lines and sloping wave face make it perfect for longboarding. 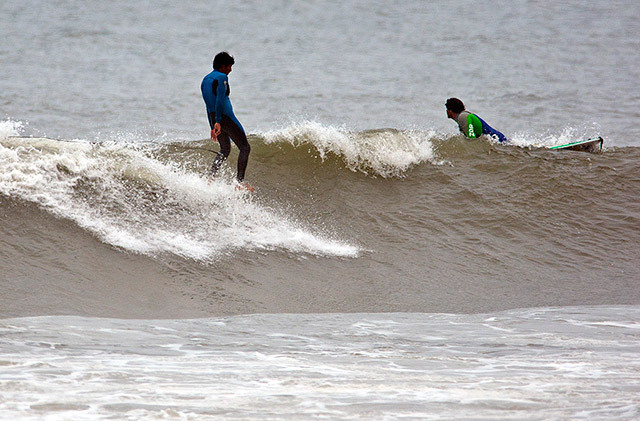 The wave can break in different sections, but on bigger days it can connect from behind the point all the way past the pier, resulting in 200-300m long rides. 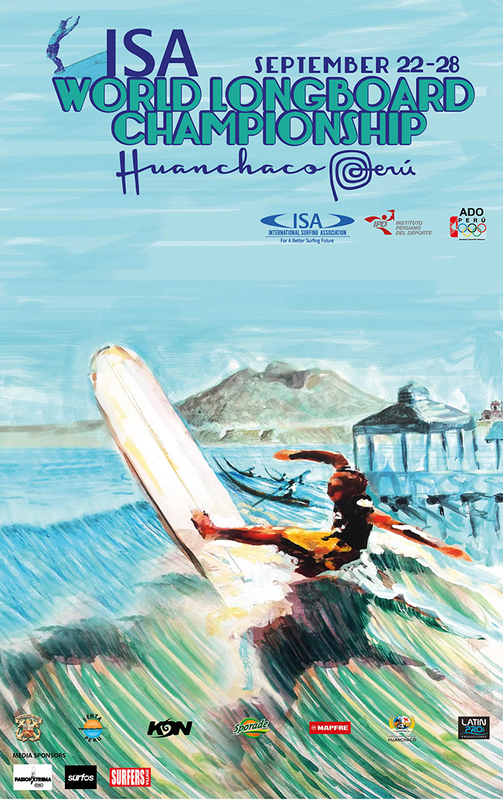 The first edition of the ISA World Longboard Championship will officially open on September 22 in Trujillo, Peru, with the traditional ISA Opening Ceremony held at the “Plaza de Mayor de Trujillo,” which will include the Parade of the Nations and Sands of the World Ceremony. 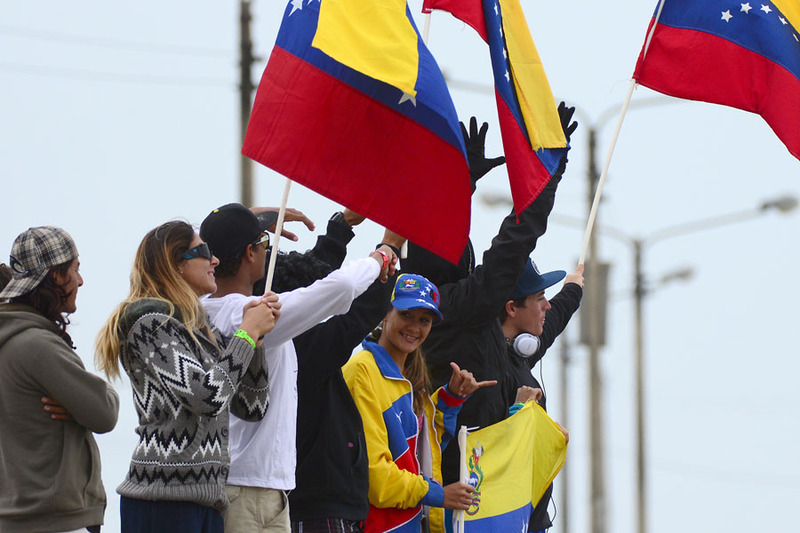 The Parade of the Nations is a colorful and energy-filled event, complete with teams chanting, waving flags and the cheering of the locals who come out to watch the spectacle. 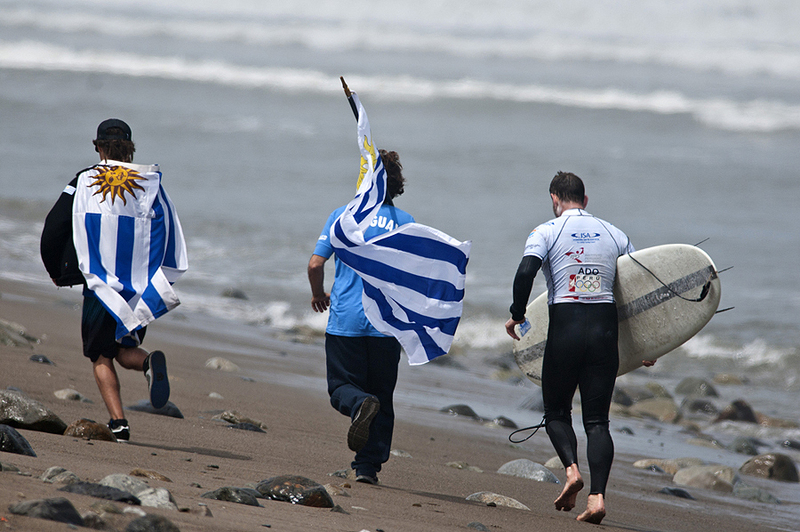 The Sands of the World Ceremony symbolizes the true fraternal spirit that bonds together all members of the global surfing tribe. 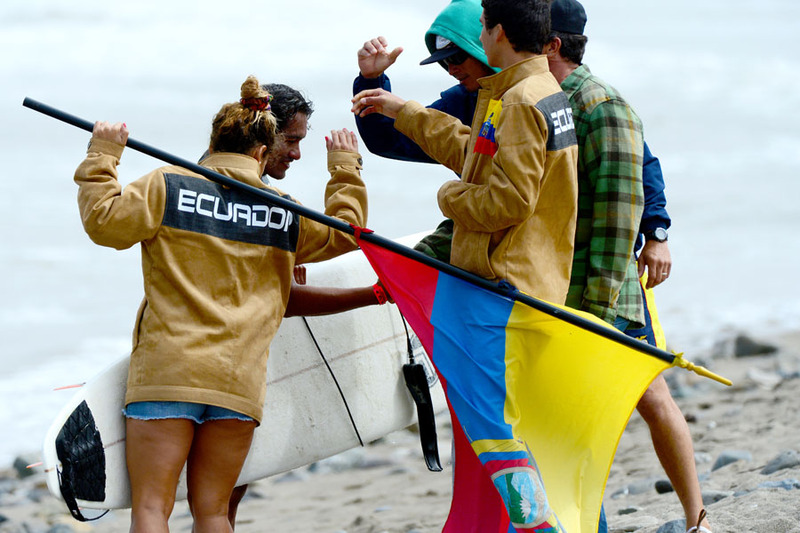 The union of the countries of the world in this emotional ceremony is symbolized through the mixing of the sands from the beaches of every participating country, showcasing the ISA’s desire for a better and peaceful world through surfing. 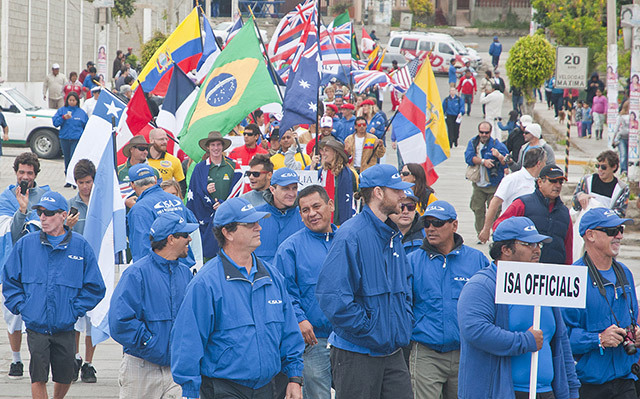 Sunday, September 22 – Opening Ceremony- Parade of the Nations and Sands of the World Ceremony. 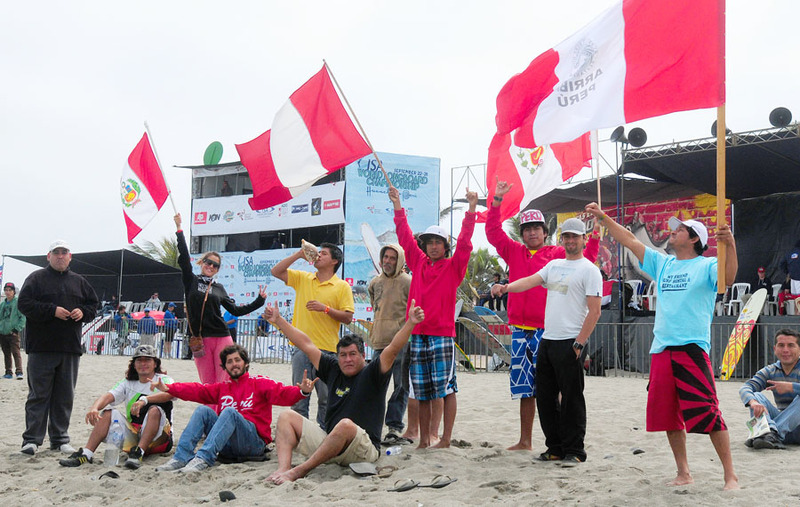 The ISA WLC will mark the sixth ISA World Championship that Peru has hosted since 2008, including two this year (the ISA World SUP and Paddleboard Championship was in February). 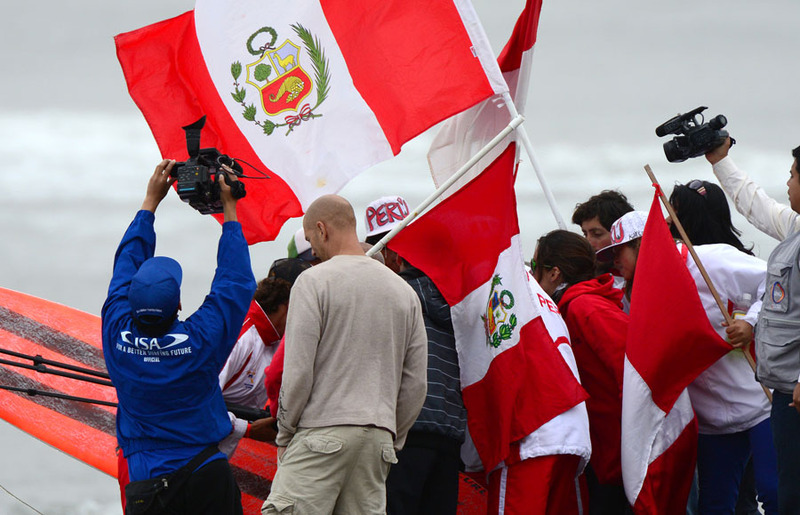 Not only does Peru offer incredible world-class waves throughout the country, but the nation has always welcomed the ISA and the hundreds of competitors from all around the globe with open arms and warm hearts. 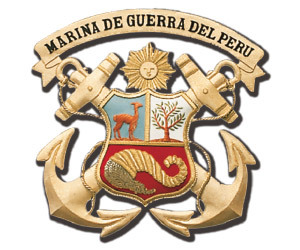 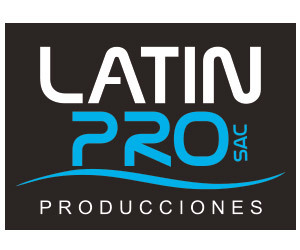 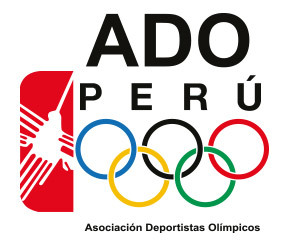 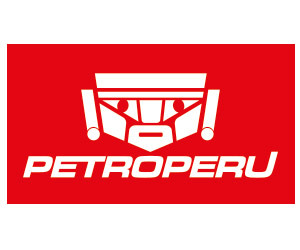 The ISA WLC has been made possible thanks to the continued support from IPD (Peruvian Institute of Sports), ADO (Peruvian Association of Olympic Athletes), COP (Peruvian Olympic Committee) and its President Jose Quiñones, and all the sponsors, and especially the event organizer, Karin Sierralta and his staff. 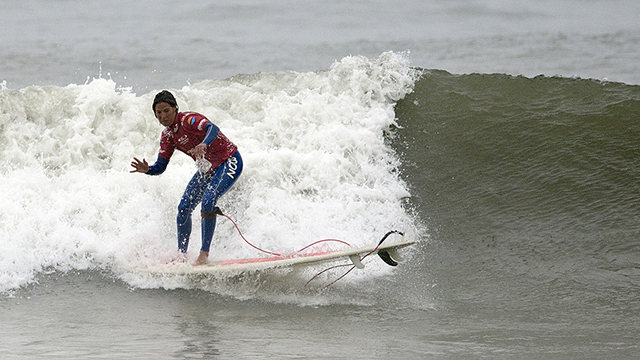 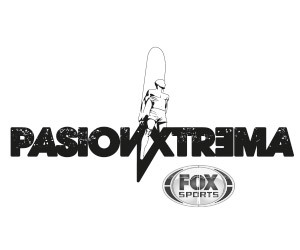 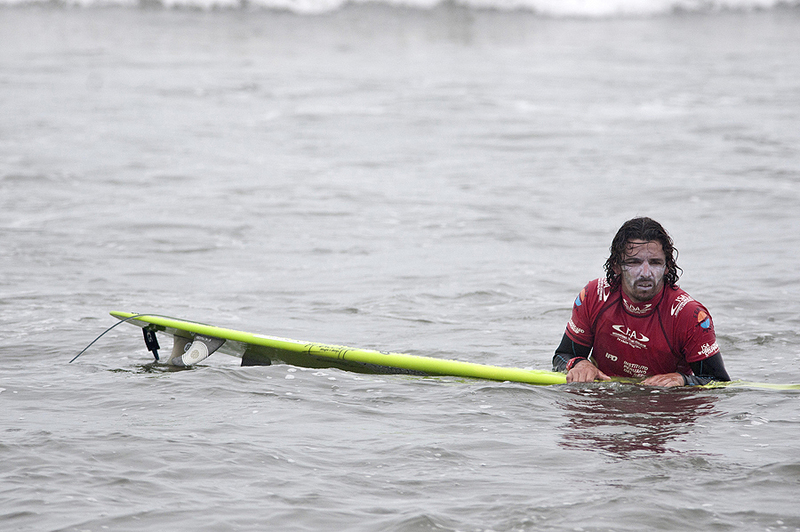 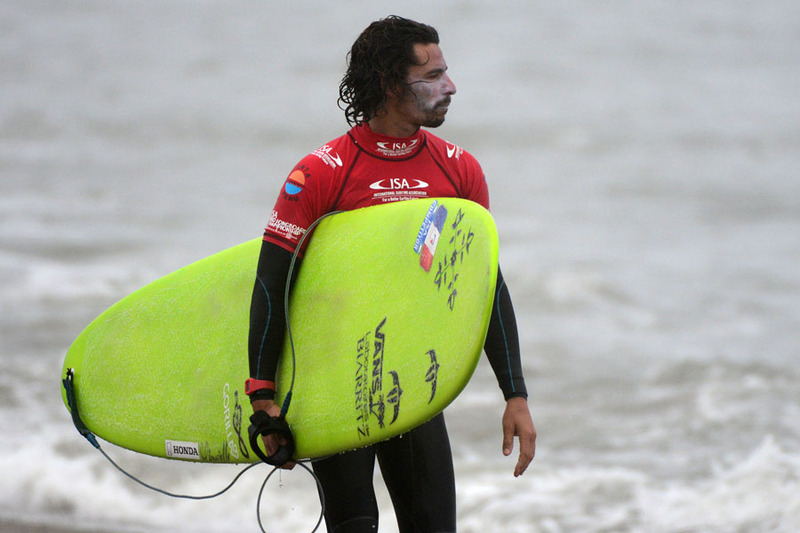 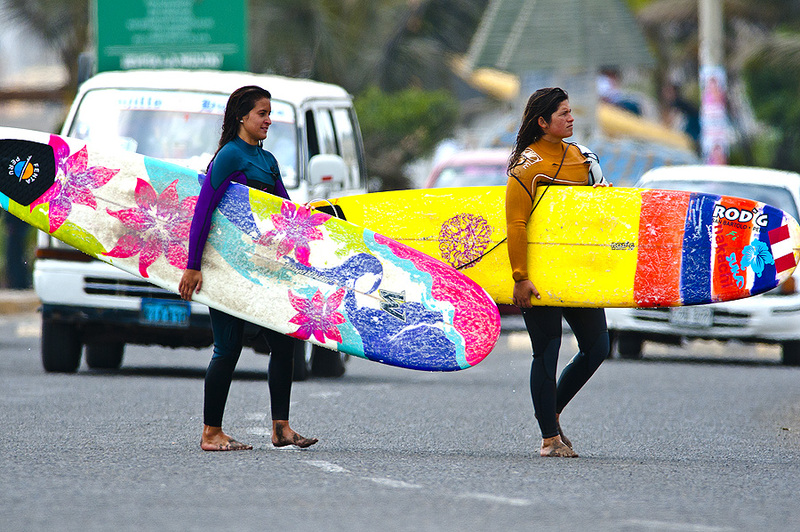 The ISA’s mission is to develop the sport of surfing in Peru and around the world. 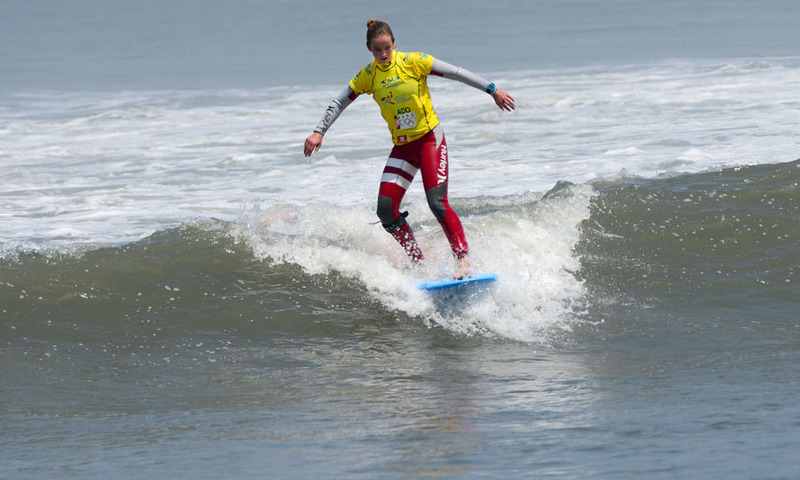 This is accomplished through annual World Championships, membership development, educational programs, scholarship distribution and working towards Olympic Surfing. 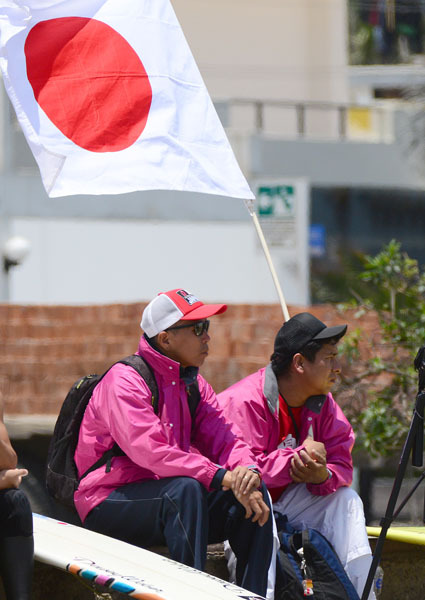 To watch the official event promo, visit the official event website www.isawlc.com where you will find photos, videos and the live webcast beginning on Sunday, September 22 with the Opening Ceremony. 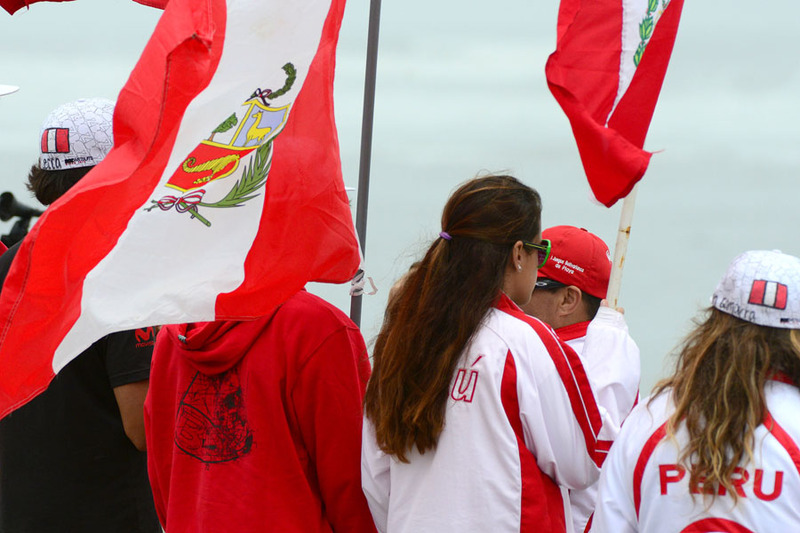 Competition begins on Monday, September 23, and the Finals and Closing Ceremony will be Saturday, September 28. 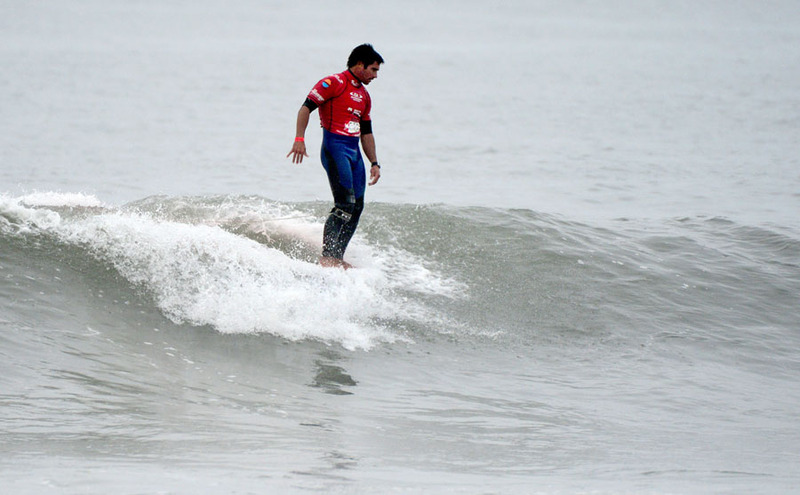 For the first time in ISA History, Longboarding Will have its Own World Championship to Take Place in Huanchaco, Trujillo, Peru, September 22nd to 28th. 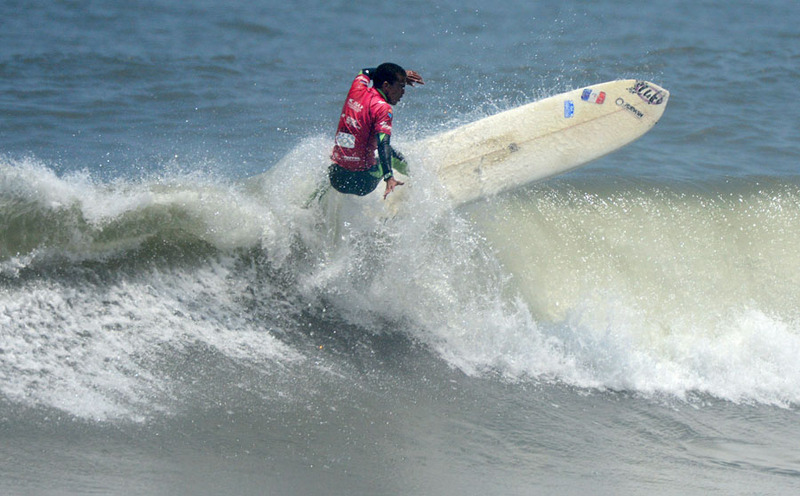 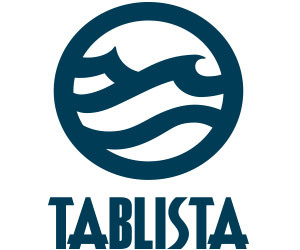 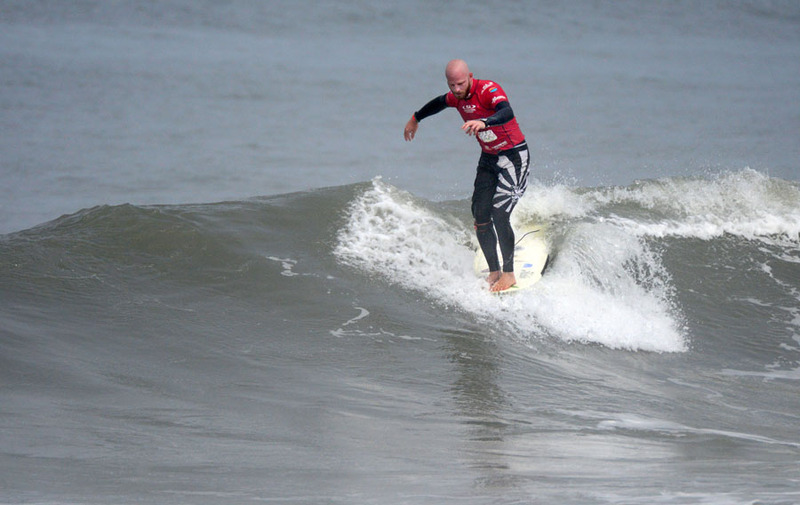 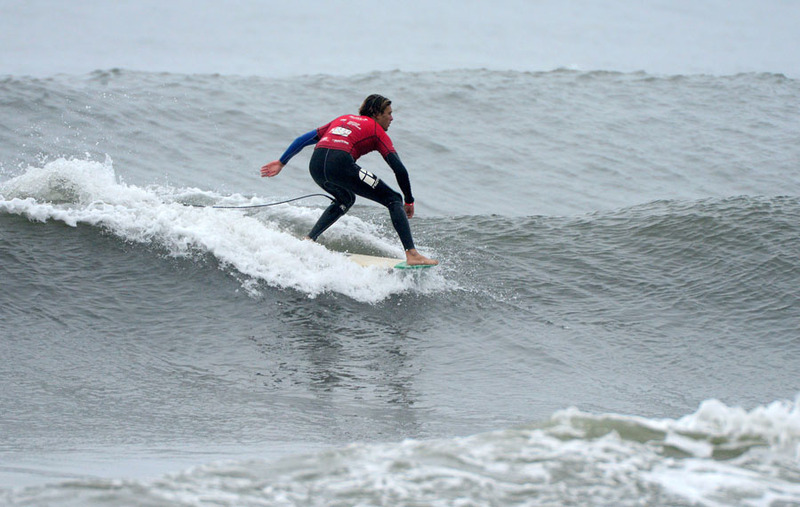 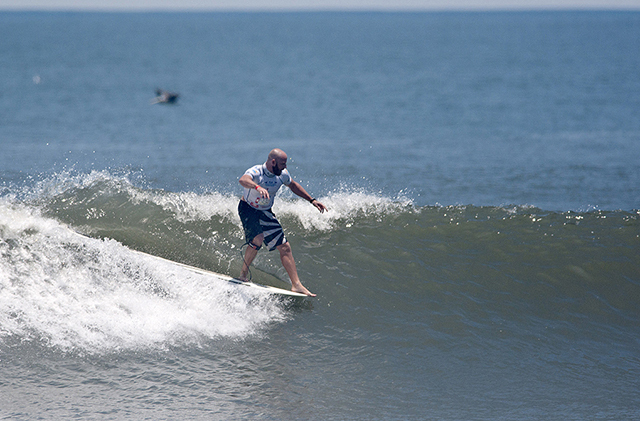 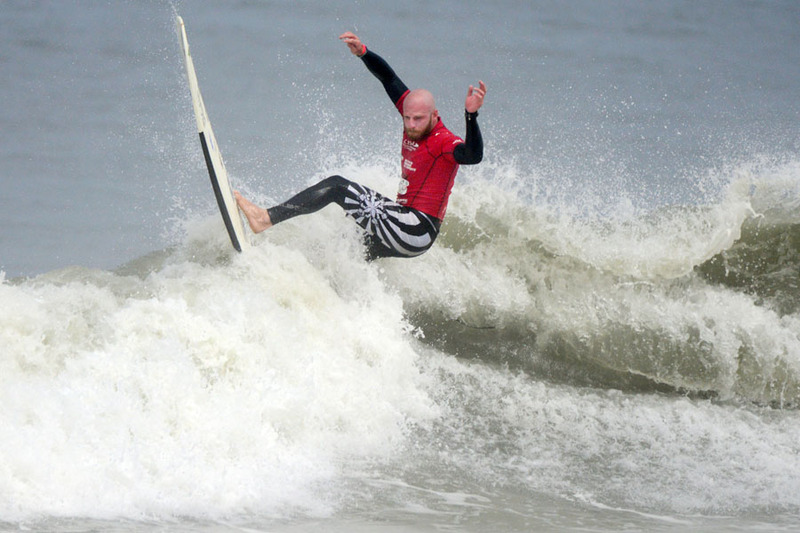 La Jolla, California, August 22, 2013- The International Surfing Association (ISA) is excited to announce the first stand-alone ISA World Longboard Championship this September at the legendary break of Huanchaco, Trujillo, Peru. 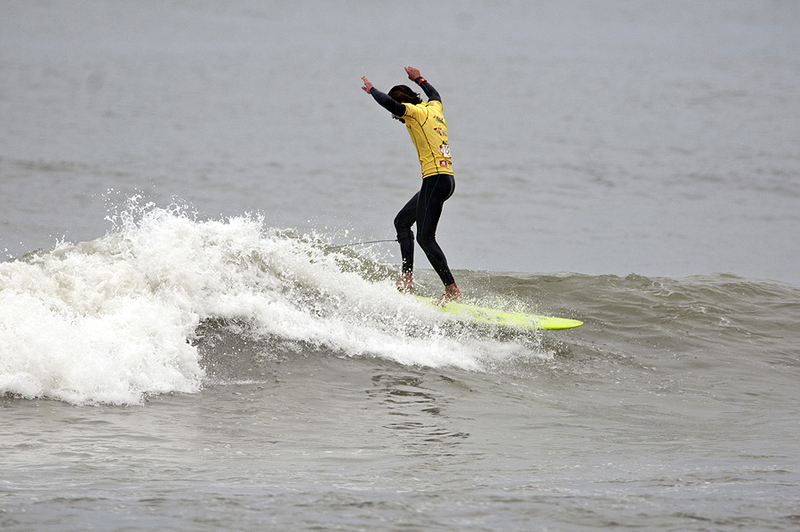 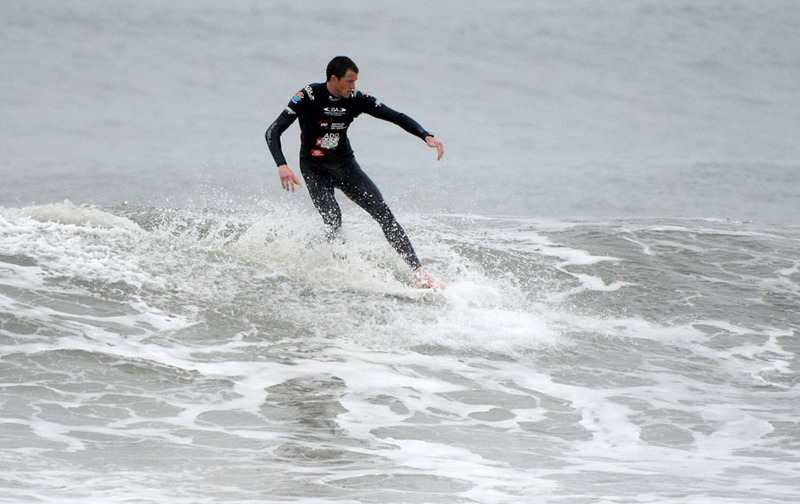 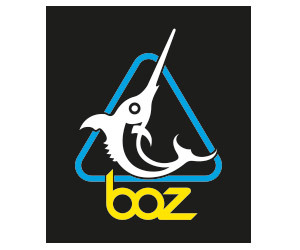 Longboarding has traditionally been a division of the ISA World Surfing Games since 1988. 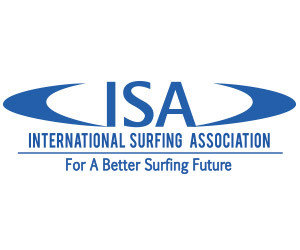 Due to the growing popularity of the Longboard division and the increase in participating athletes, the ISA has decided to organize its own World Championship with specialized longboarding judges at one of the best surfing destinations in the world. 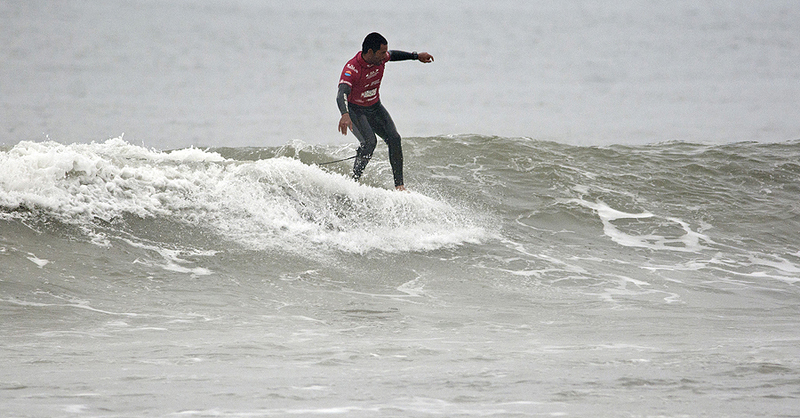 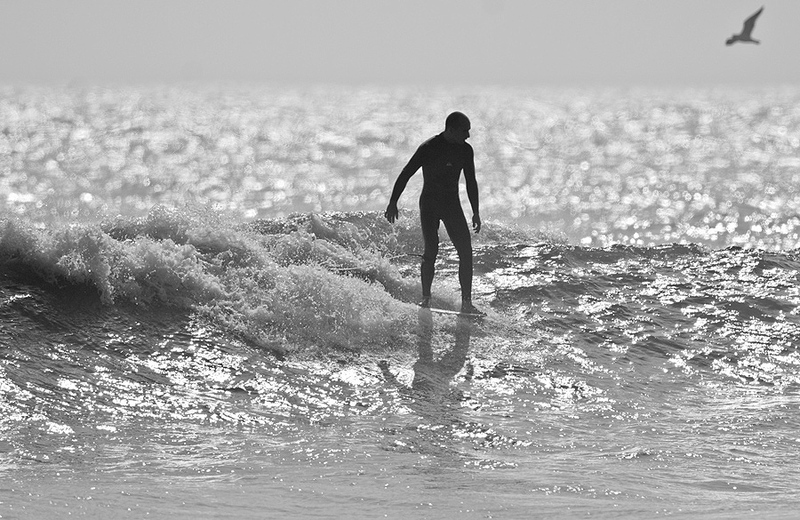 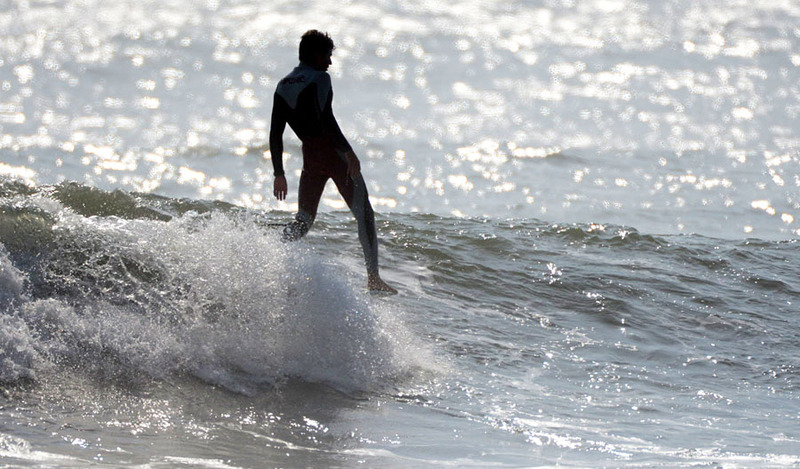 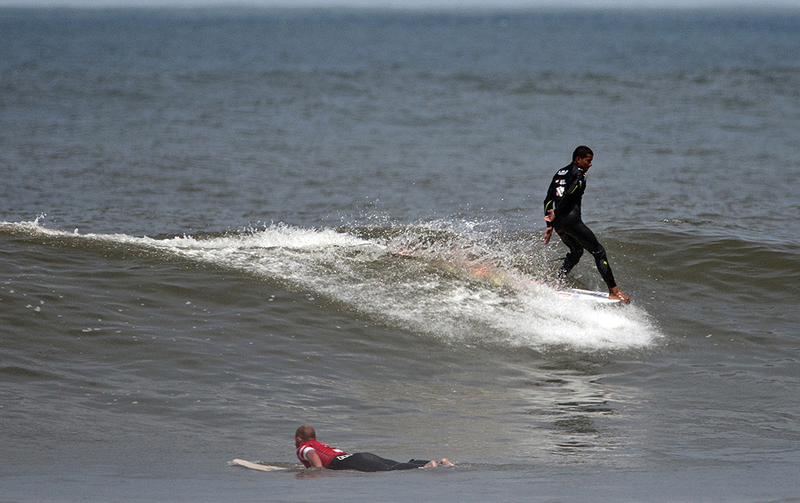 “Longboarding really brings the best of modern and historical surfing together,” said ISA President Fernando Aguerre. 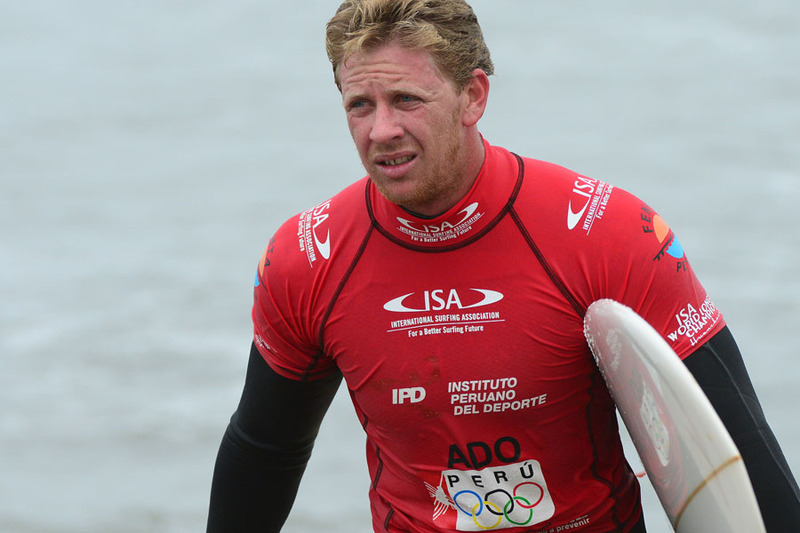 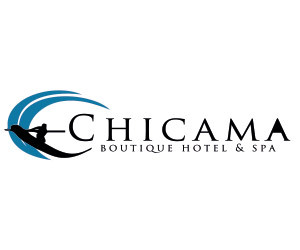 “We’re honored to host the first ISA World Championship in Huancacho, Peru, as this historical location is documented to be one of the original birth places for riding waves thousands of years ago, and is home to a passionate and growing population of surfers,” he added. 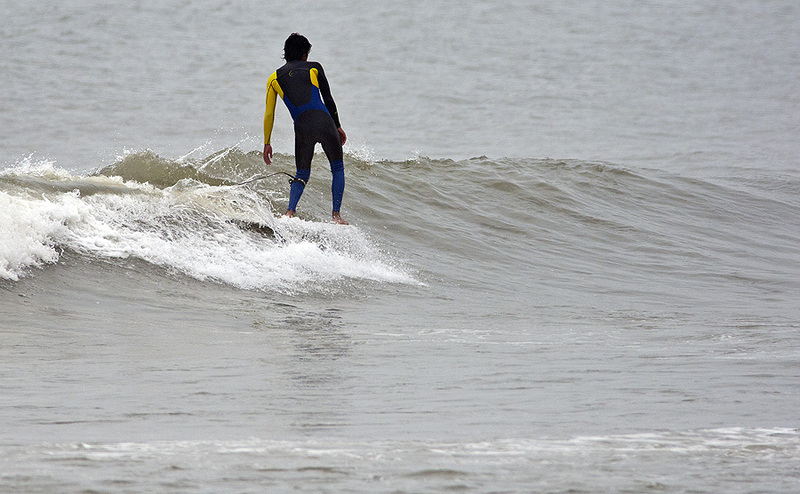 Longboards are the original equipment surfers rode before the shortboard revolution in the late 1960s. 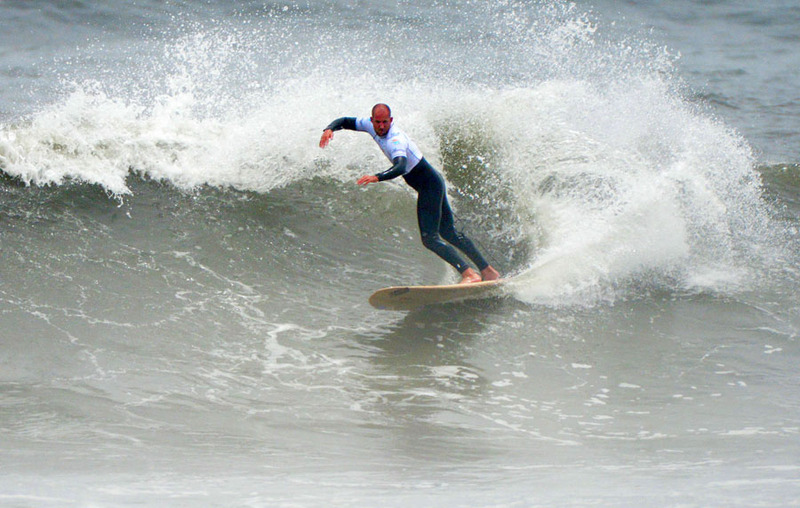 Longboards came back in popularity in the early 1990s, and made the learning curve much smoother for entry-level surfers. 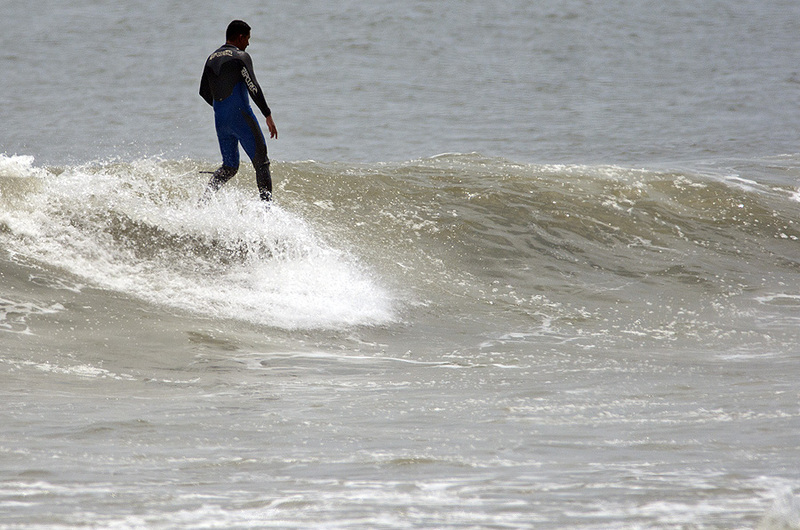 Today, contemporary longboarding includes traditional maneuvers (like Hang Five, Hang Ten, Drop Knee Turns), as well as all the gravity-defying aerial maneuvers of contemporary surfing. 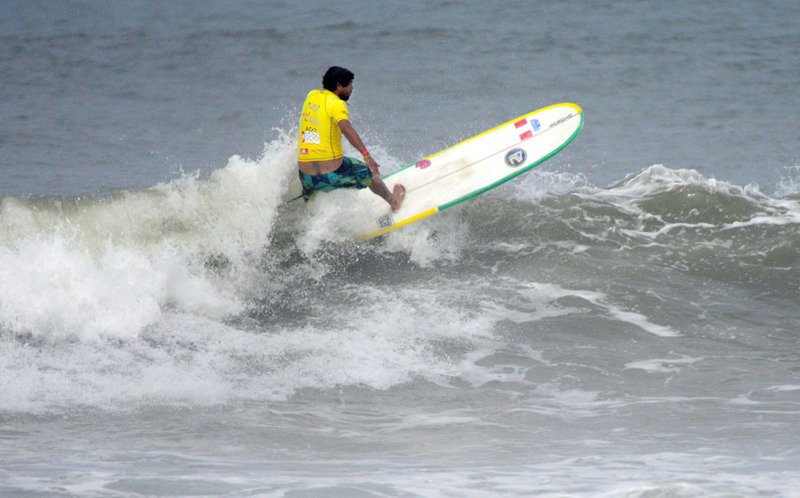 Surfing is also an incredibly popular activity in the country, which has produced a handful of world championship-level surfers. Peru hosted the 2013 and 2012 ISA World SUP and Paddleboard Championship in Miraflores, Lima; the 2011 World Junior Surfing Championship in Punta Hermosa; the 2010 World Surfing Games in Punta Hermosa; and the 2008 World Masters Surfing Championship in Punta Rocas. 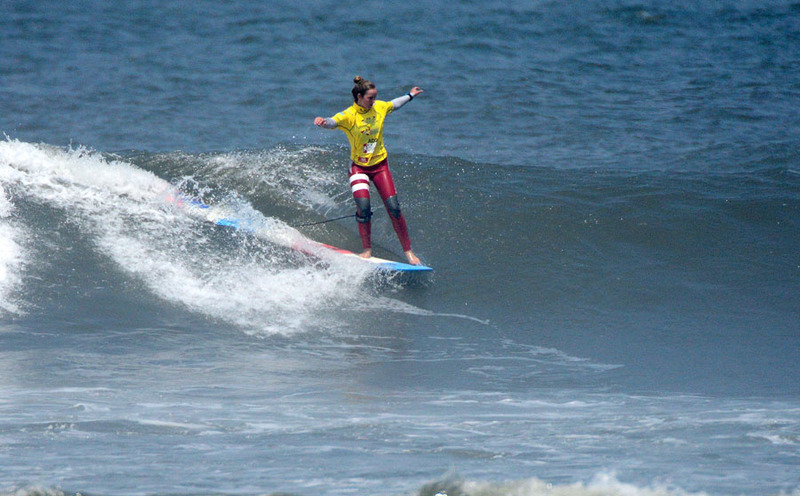 The ISA World Longboard Championship will include a women’s and junior’s division for the first time as well. 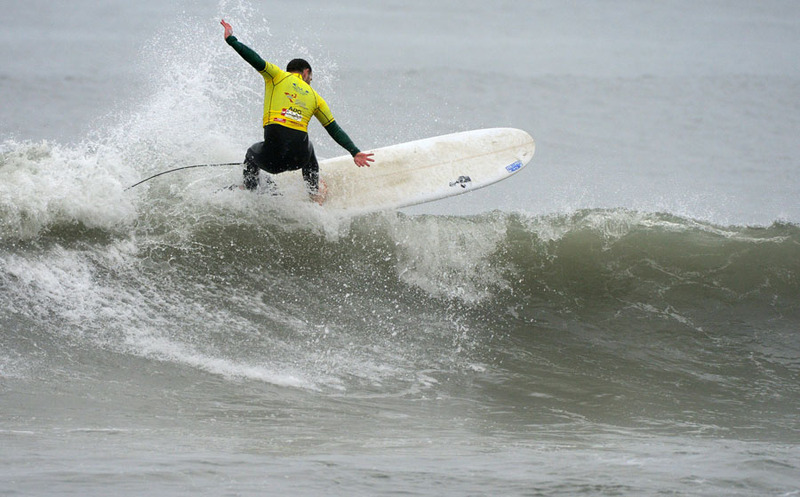 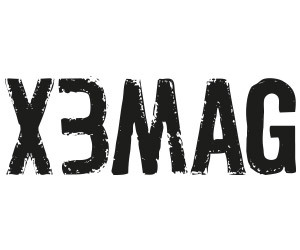 During the competition, teams of four will compete including two in the Open Men’s, one in the Open Women’s and one in the Open Junior’s (under-18 male or female) divisions. 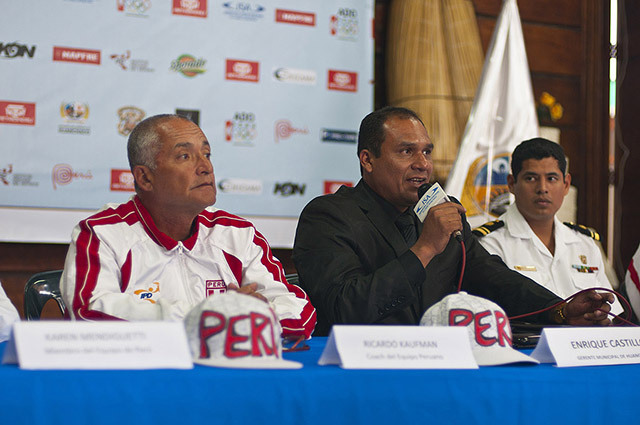 Individual Gold Medals will be awarded, as well as one overall Team Champion at the end of the contest. 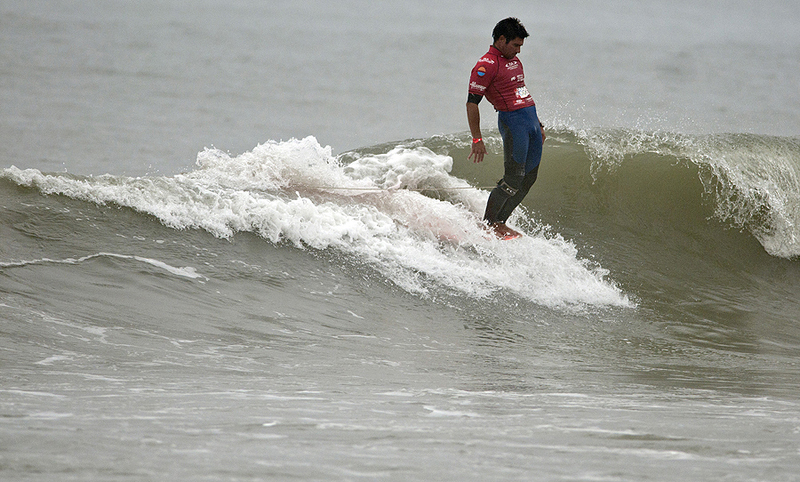 Defending Champions from the 2011 Longboarding Division of the World Surfing Games in Playa Venao, Panama, include: Toni Silvagni (USA) Gold Medal; Harley Ingelby (AUS) Silver Medal; Piccolo Clemente (PER) Bronze Medal; Antoine Delpero (FRA) Copper Medal; and Team Australia (Gold), Brazil (Silver), France (Bronze), Argentina (Copper). 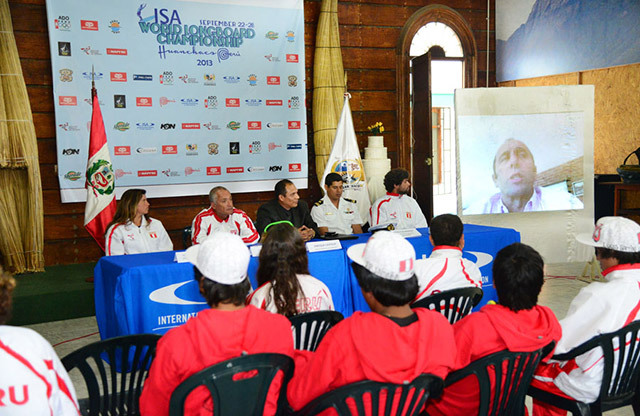 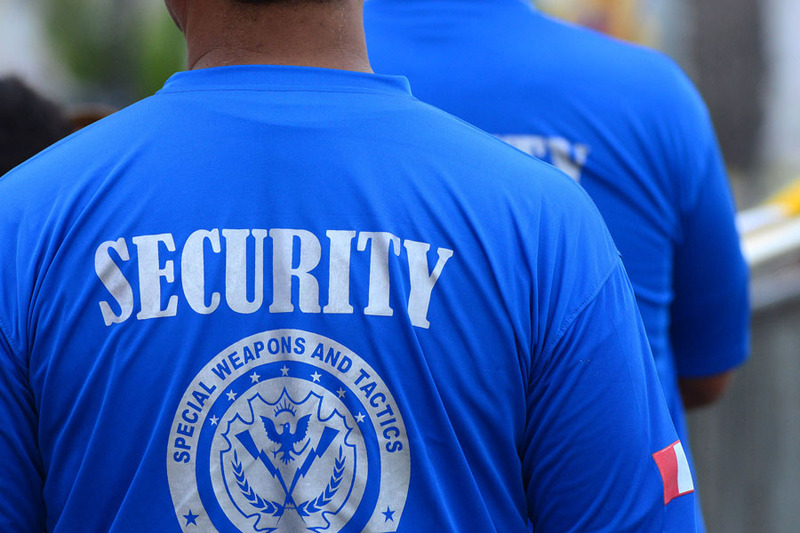 Catch the live webcast on www.isawlc.com beginning on September 22, with the Opening Ceremony. 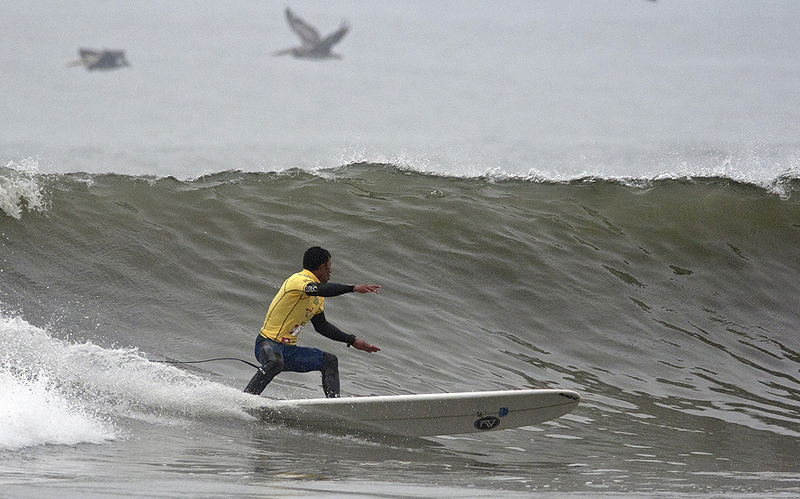 In October 2012, Huanchaco was declared a World Surfing Reserve by Save the Waves Coalition as the first in Latin America and fifth in the world.